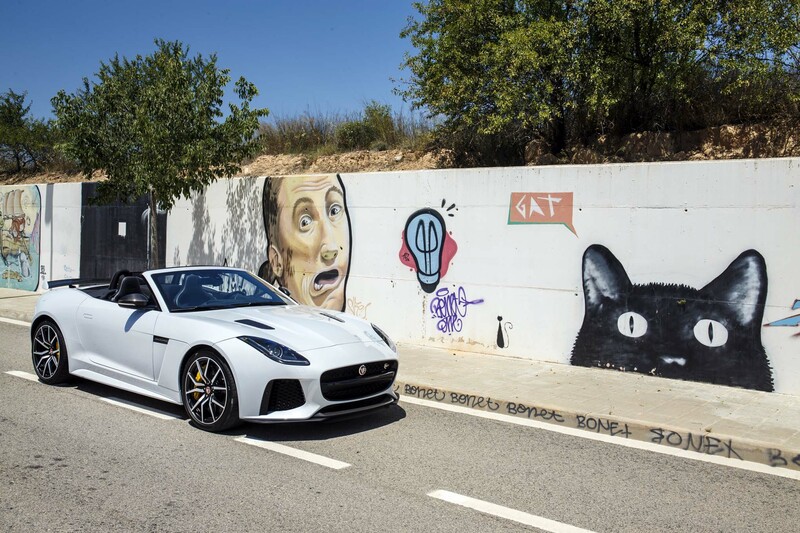 LLEIDA, Spain — I was in Los Angeles not long ago when I received a call from AUTOMOBILE’s executive editor, Mac Morrison, asking if I was available for lunch with him and editor-in-chief Mike Floyd. 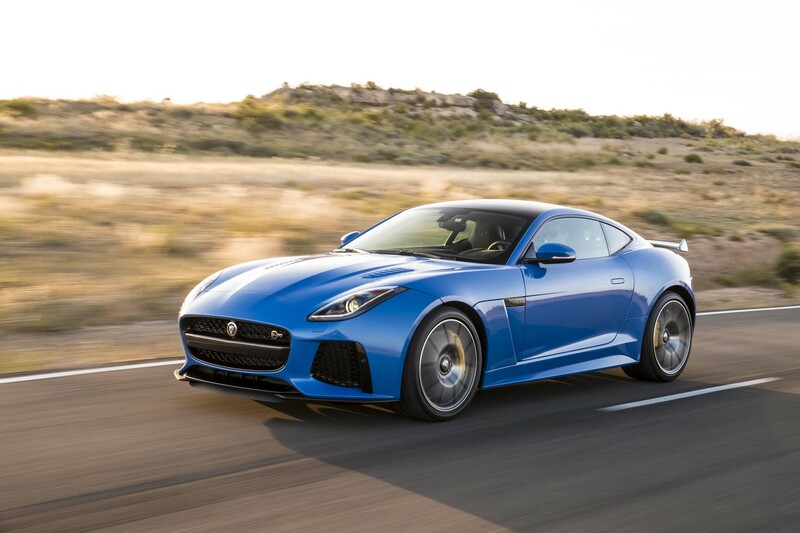 Less than 24 hours later, as I chewed my burger, they asked a question I did not expect: Would I like to do some road-test work for AUTOMOBILE? 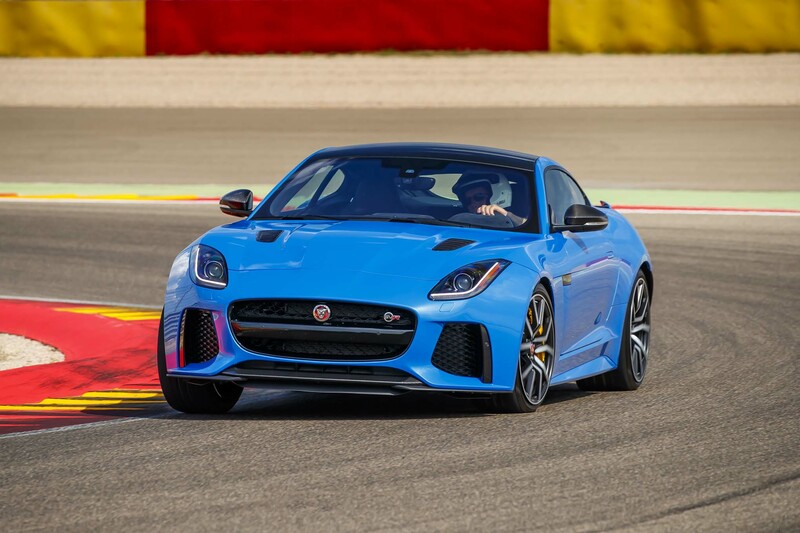 Of course, I had already done some track driving and added some “color commentary” for the 2016 All-Stars issue, so I nodded enthusiastically. 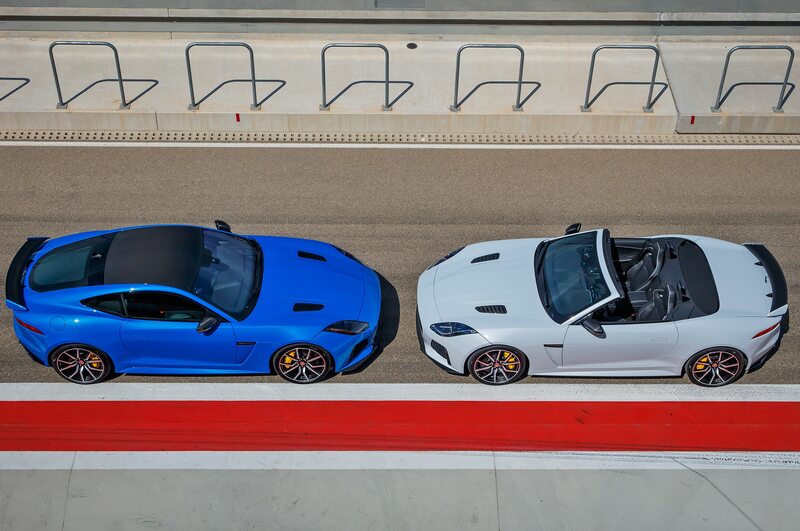 And wordlessly at first, as I quickly realized spraying them both with food might change their minds. 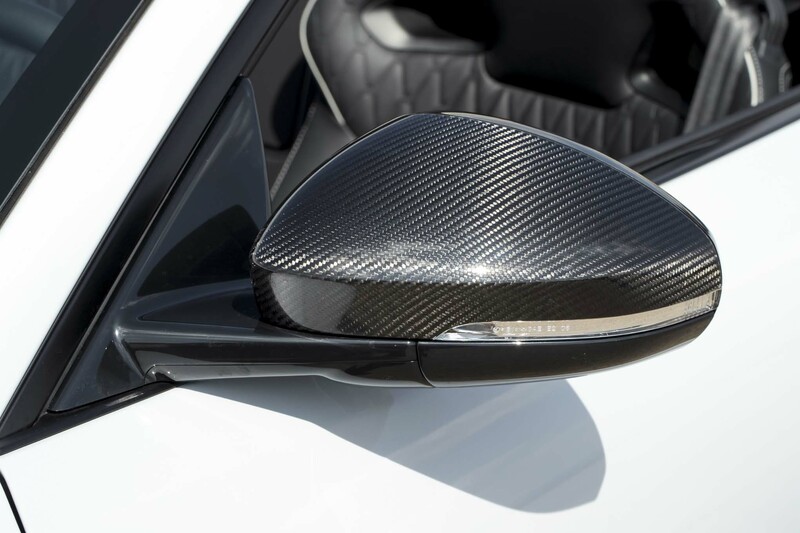 Thankfully, my 2016 driver contract with Black Swan Racing in the IMSA WeatherTech SportCar Championship does not preclude me from taking advantage of such a great opportunity. 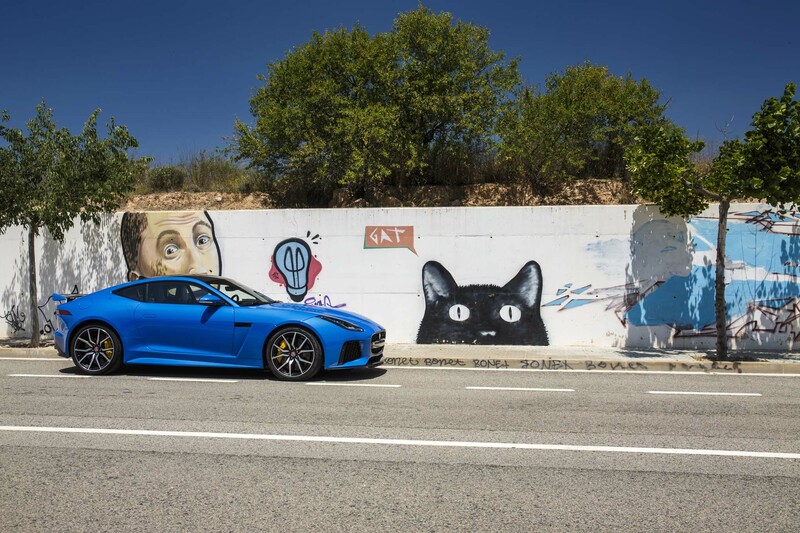 So here I am a few weeks later, sitting in a Jaguar XE sedan, headed to the Spanish town of Lleida. 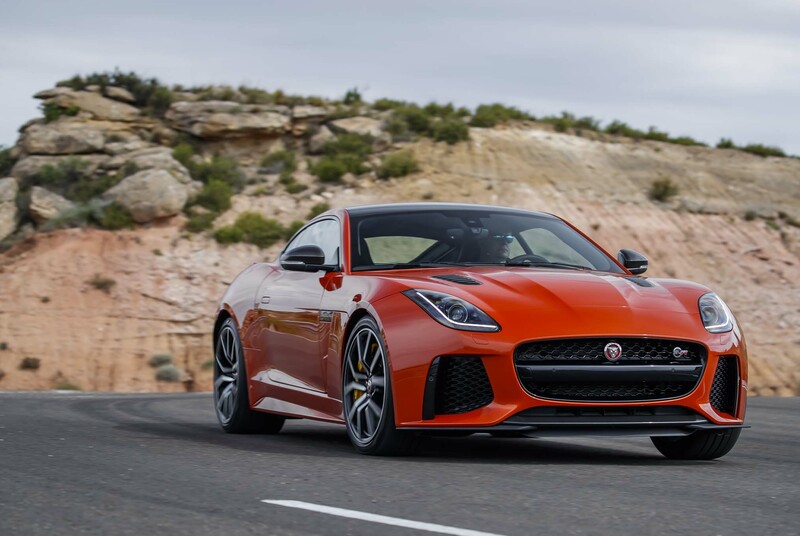 The scenery around the city is arid and rugged with its own distinct beauty; think southern New Mexico and Arizona, with the dry temperature hovering at about 90 degrees. 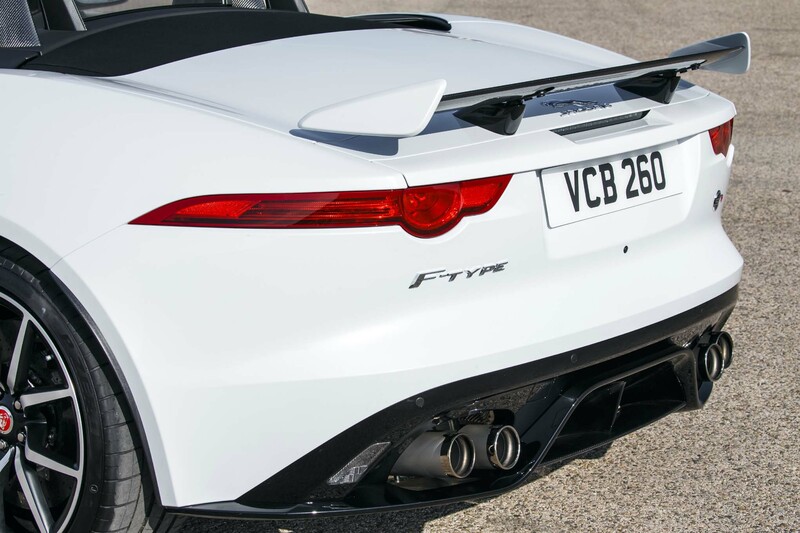 I’m here to get a first impression of the new Jaguar F-Type SVR. 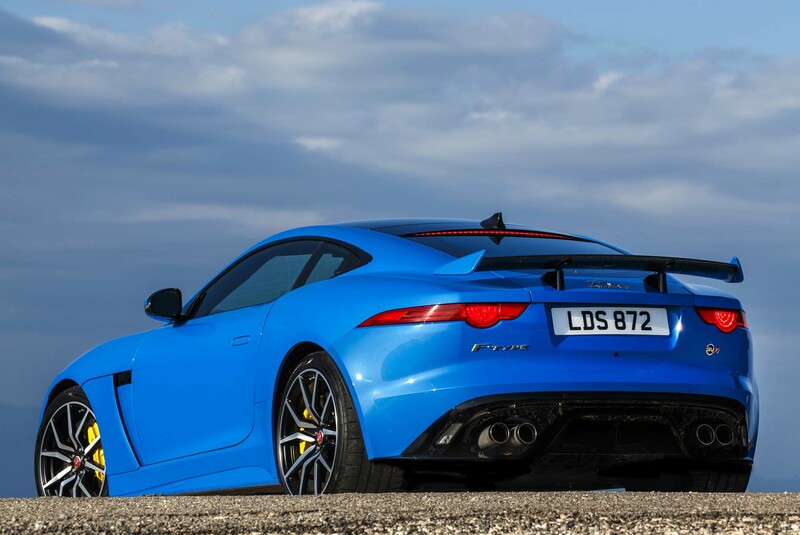 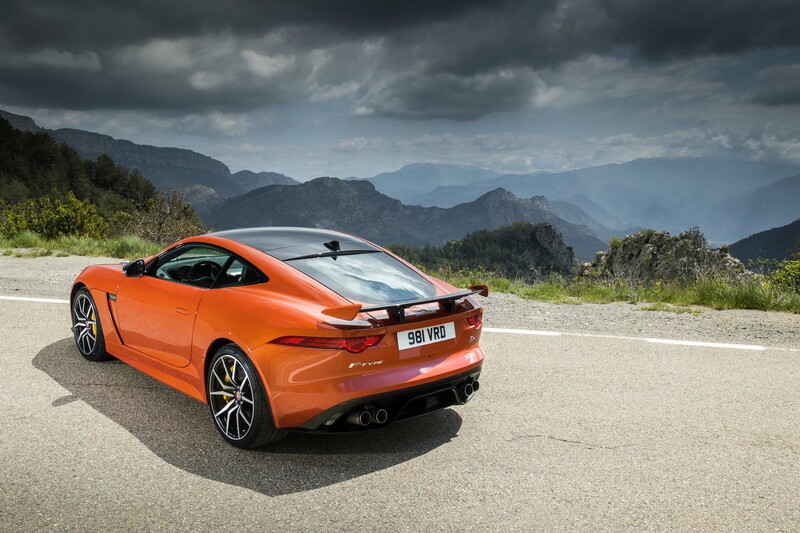 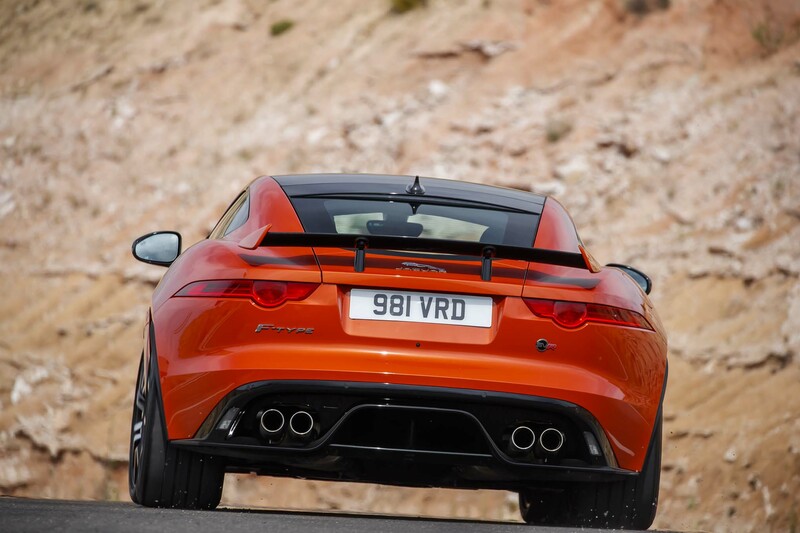 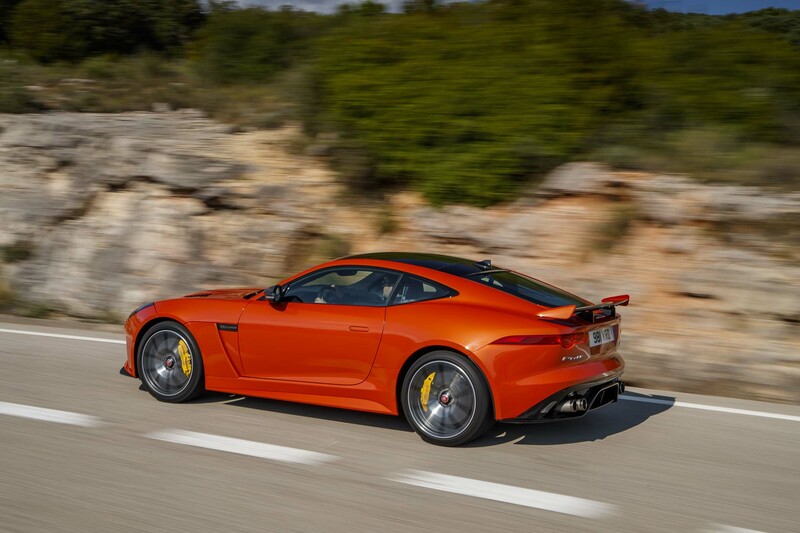 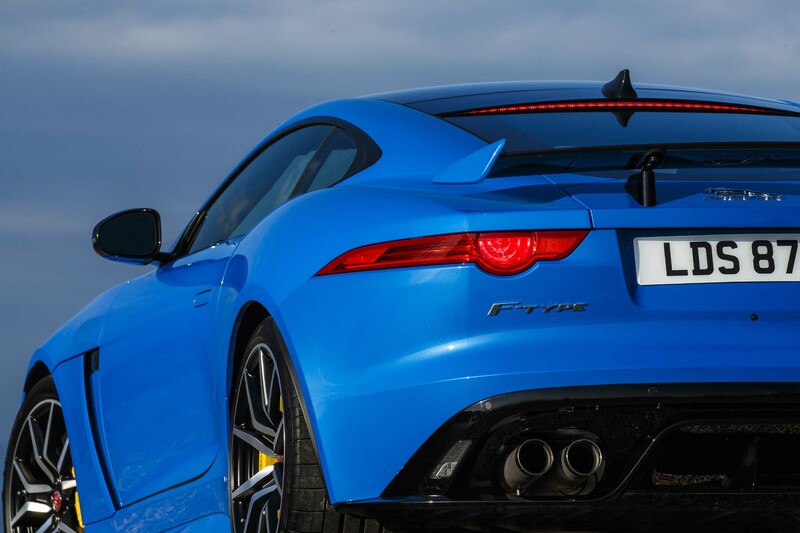 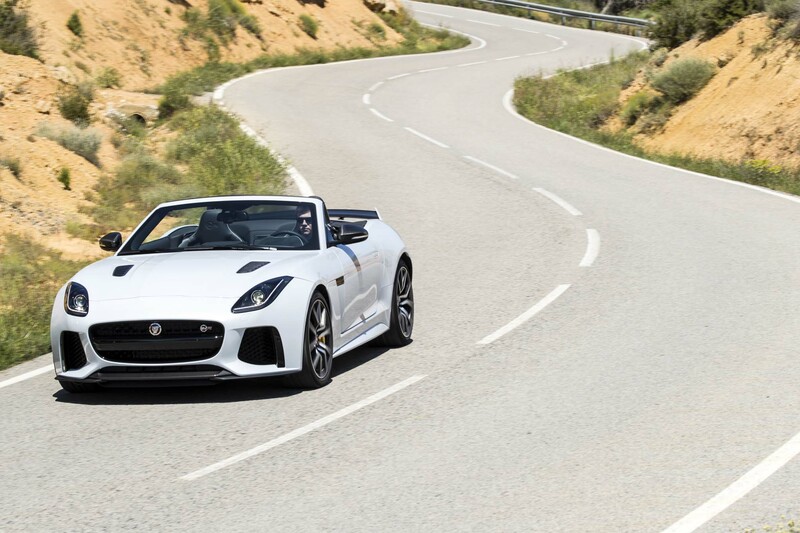 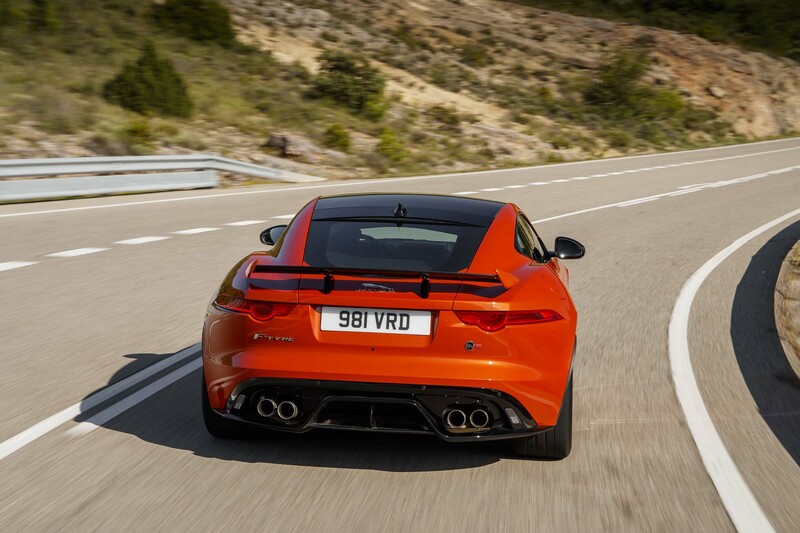 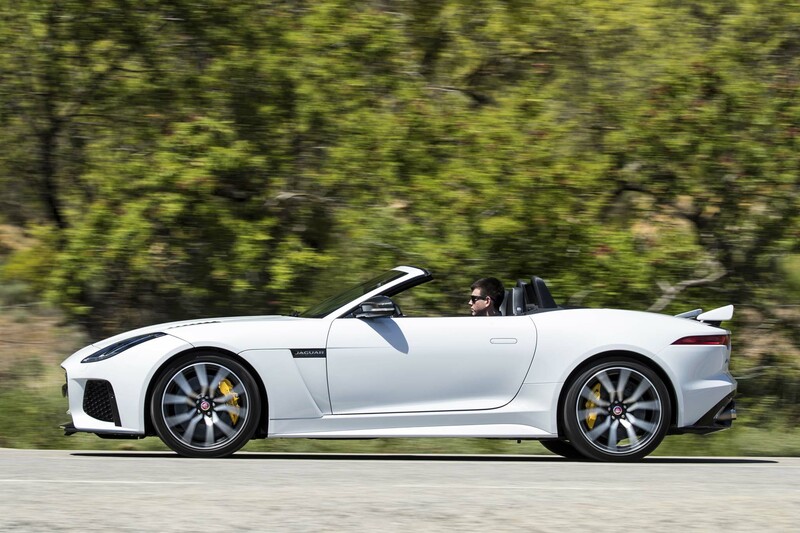 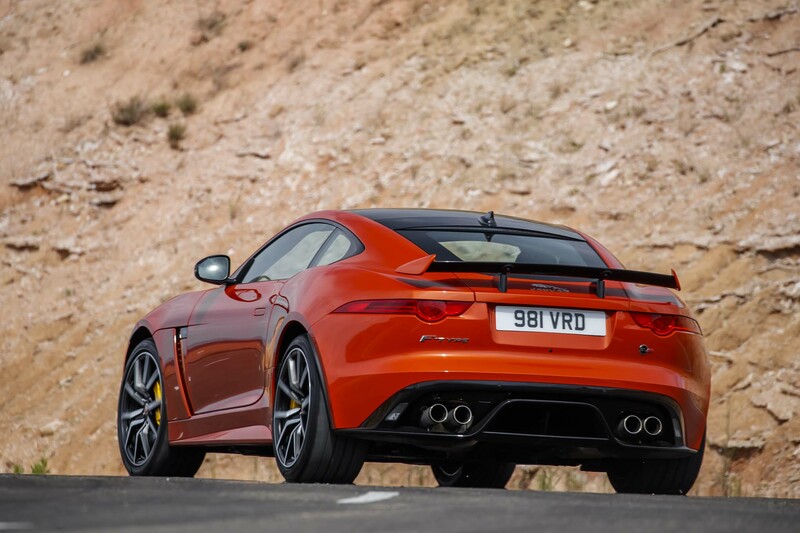 I recently drove the F-Type R AWD for a day and have looked forward to trying the new SVR. 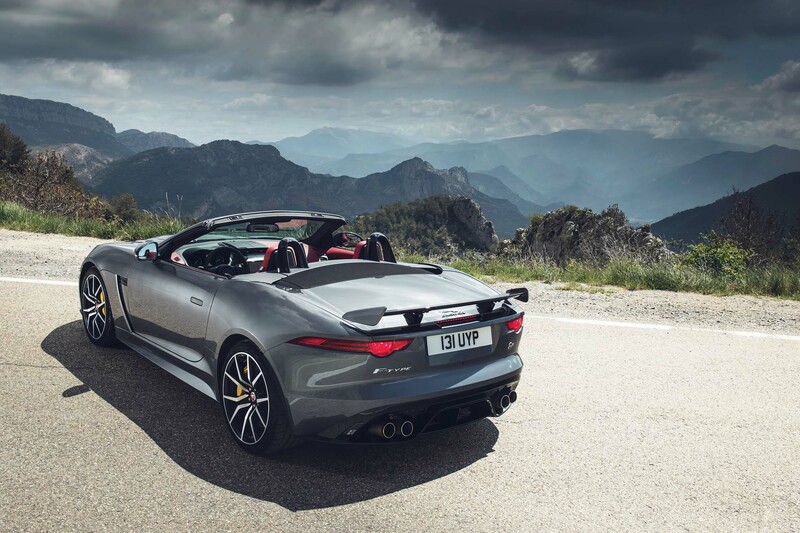 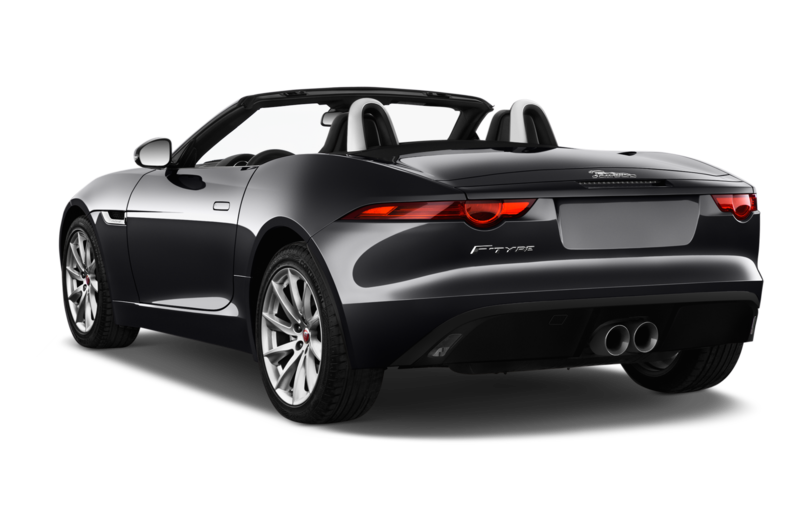 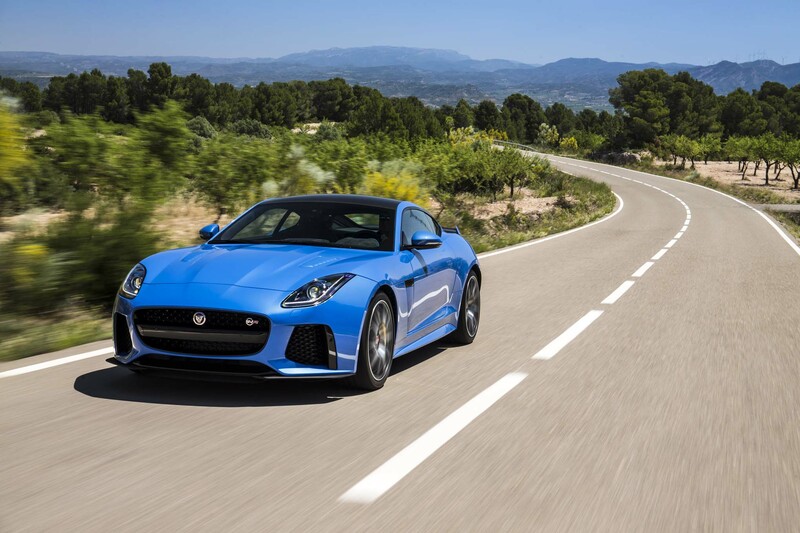 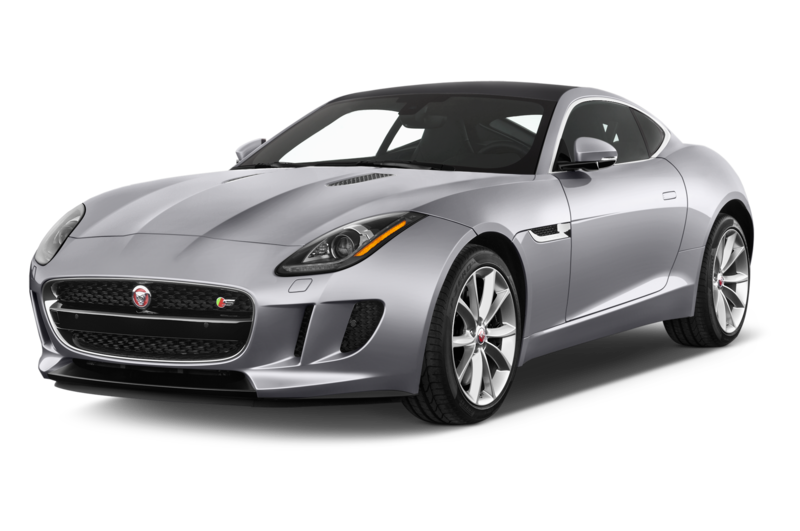 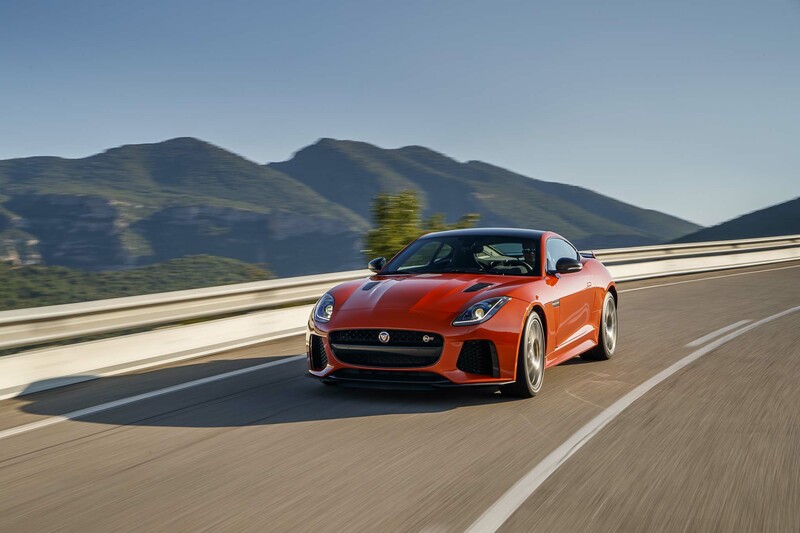 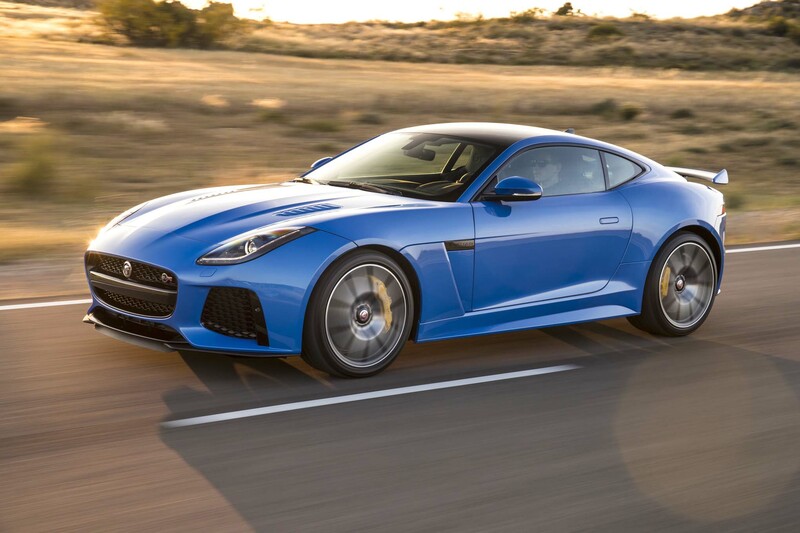 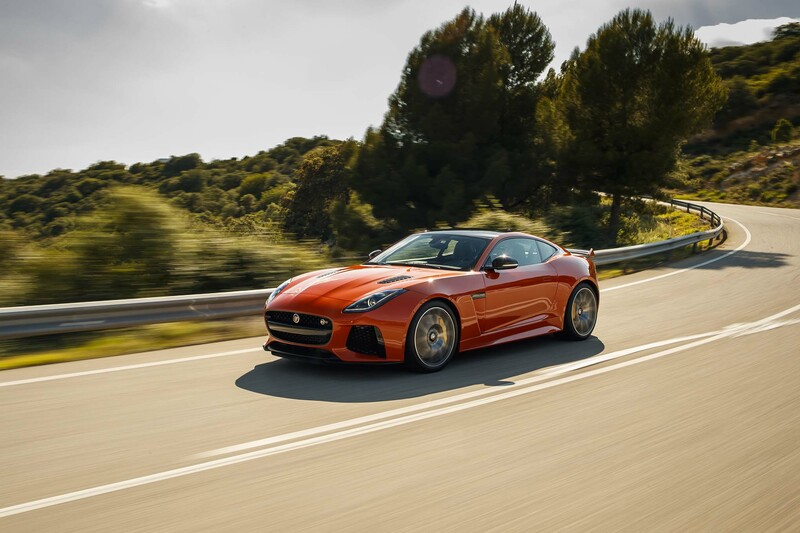 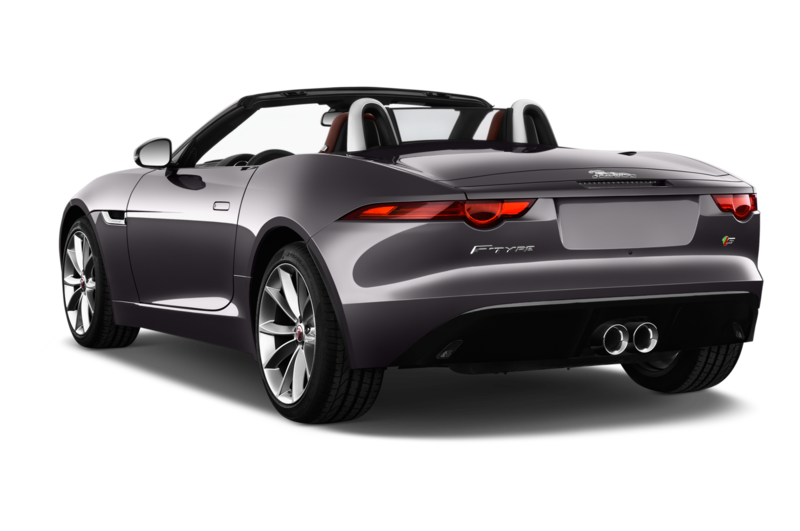 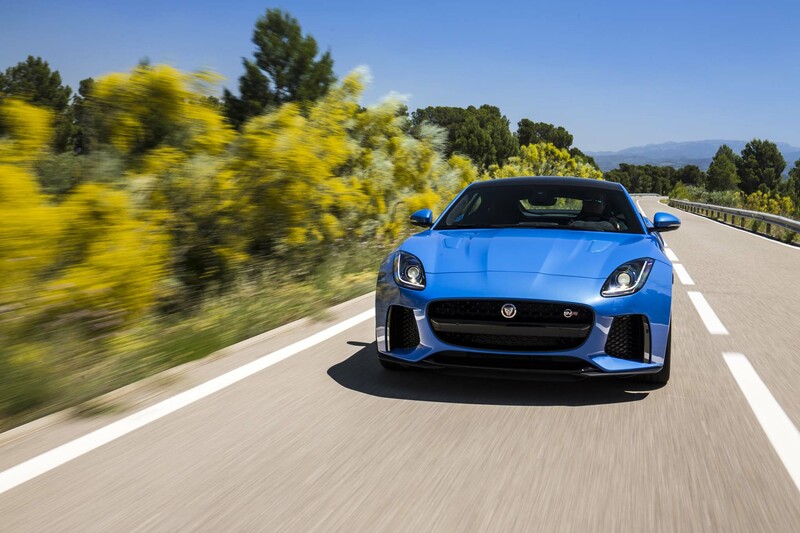 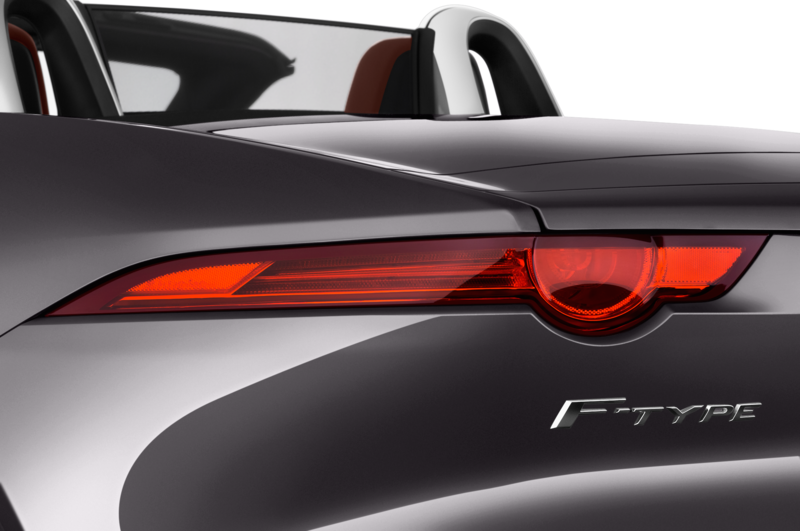 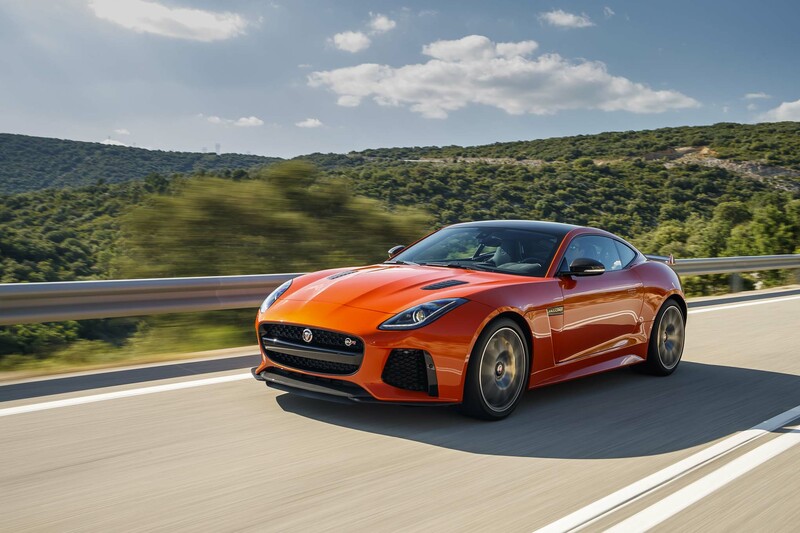 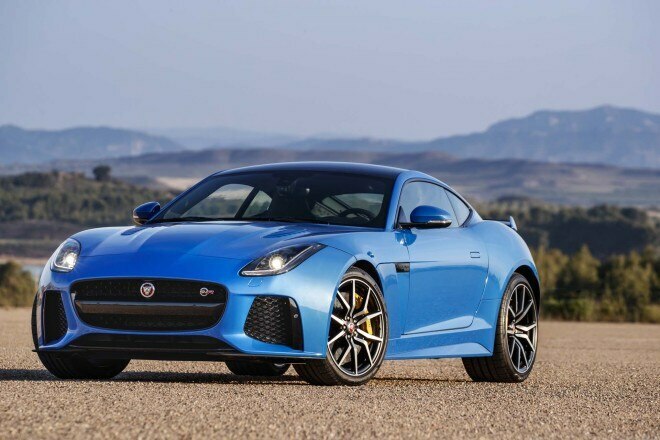 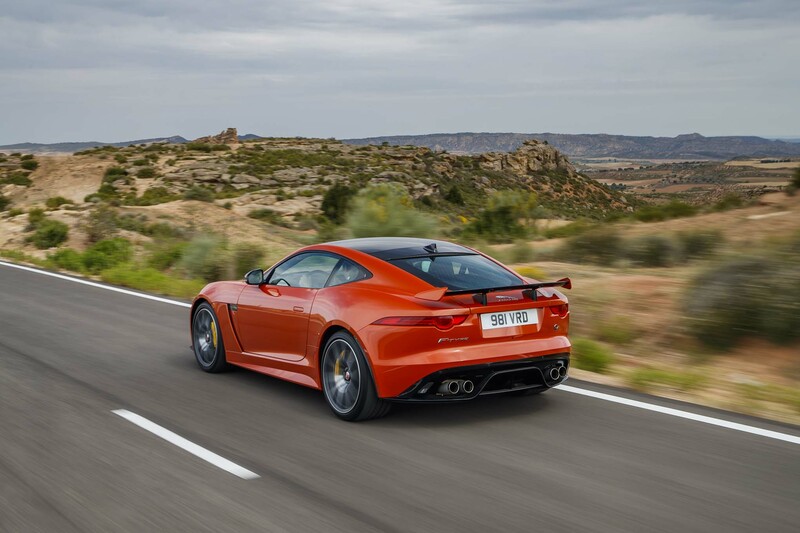 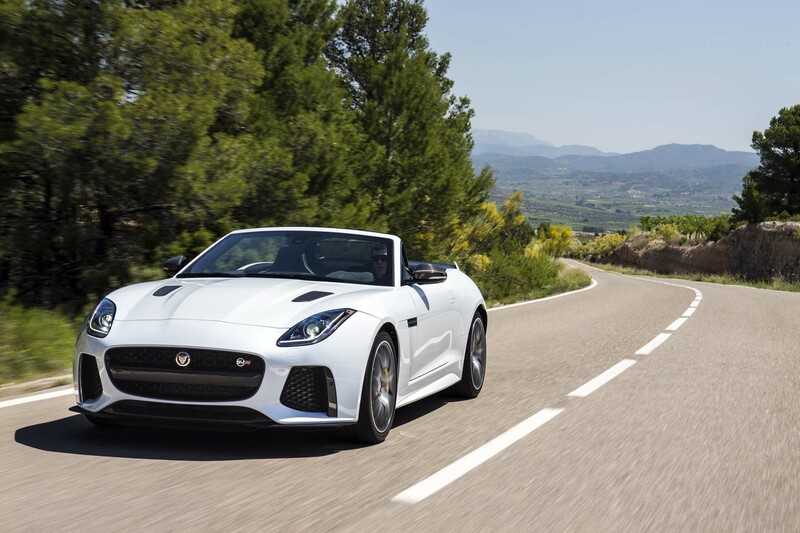 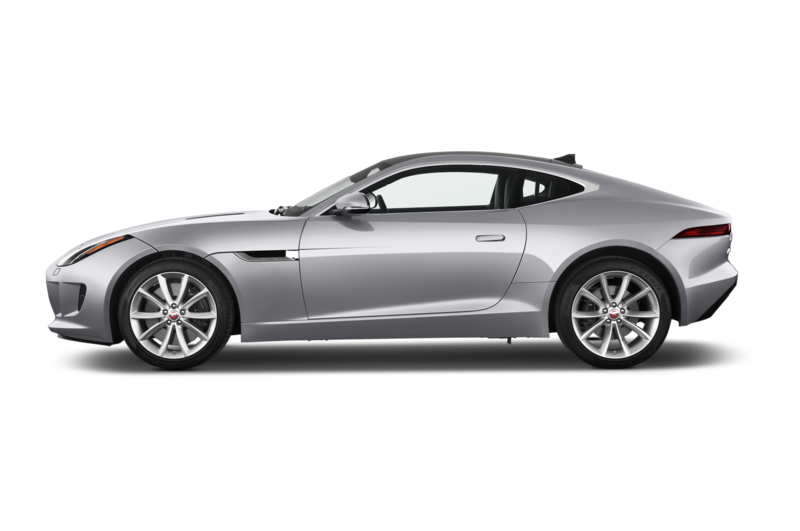 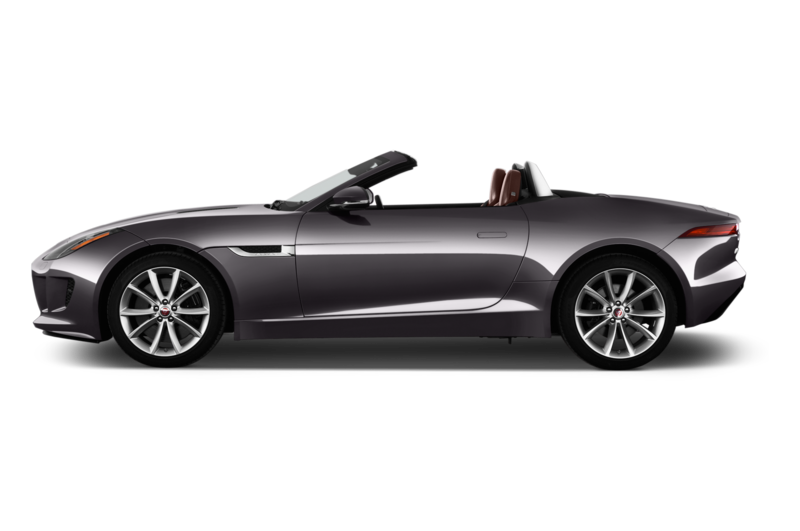 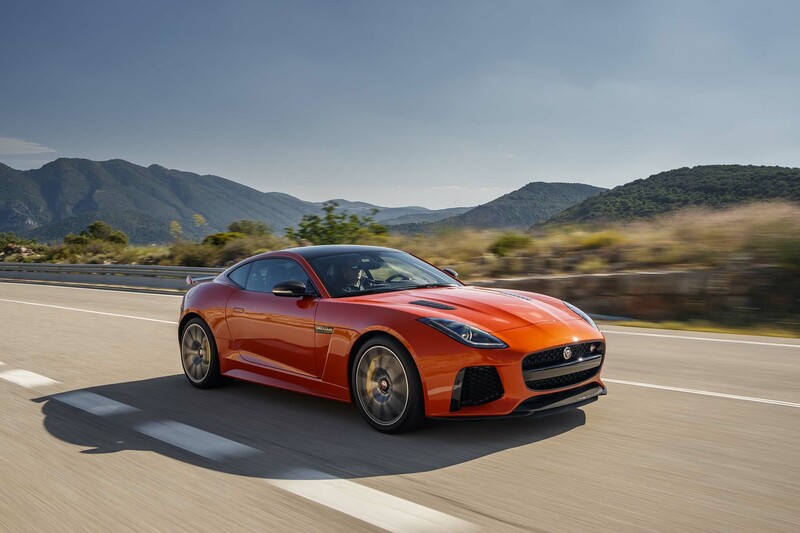 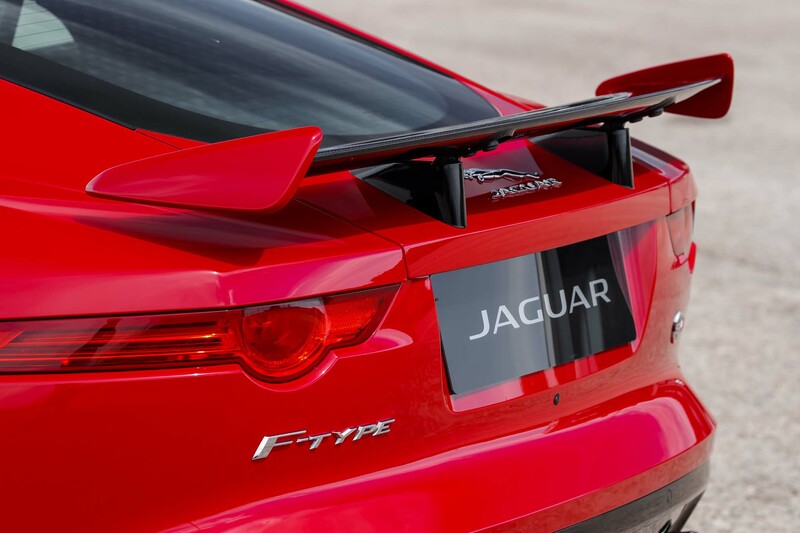 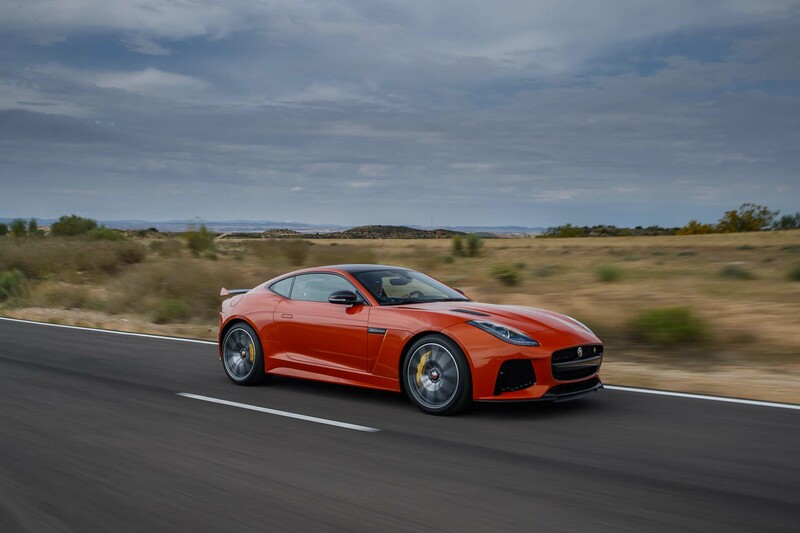 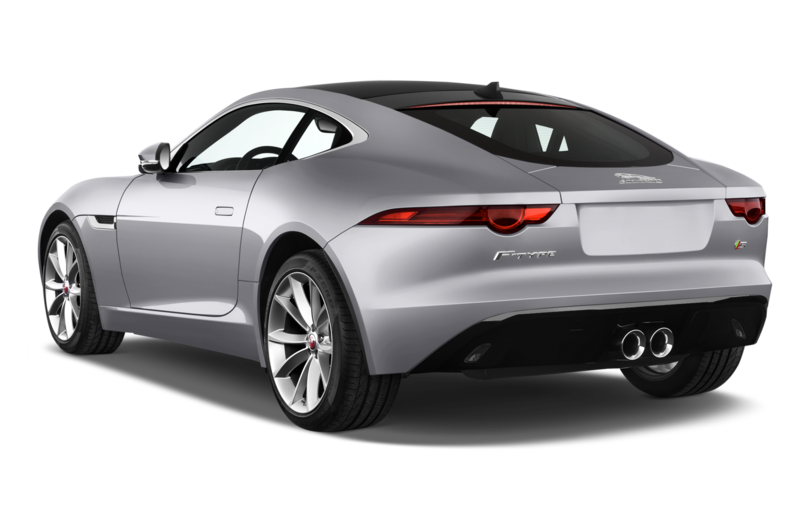 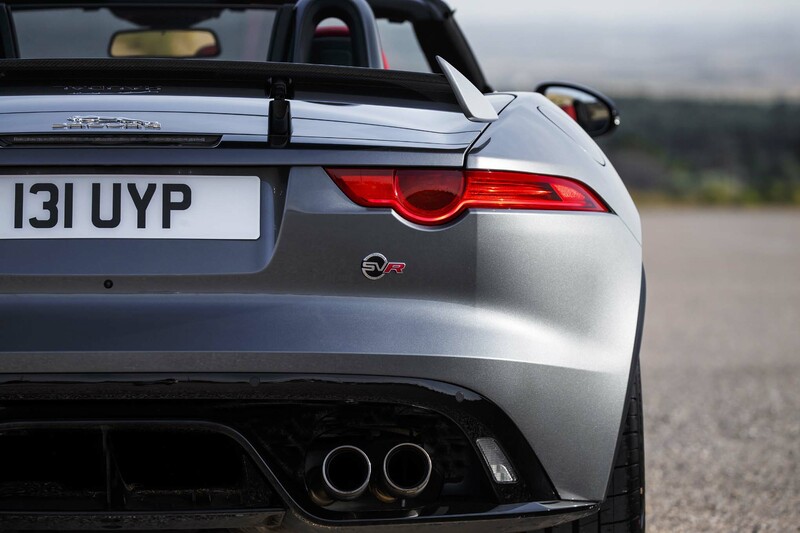 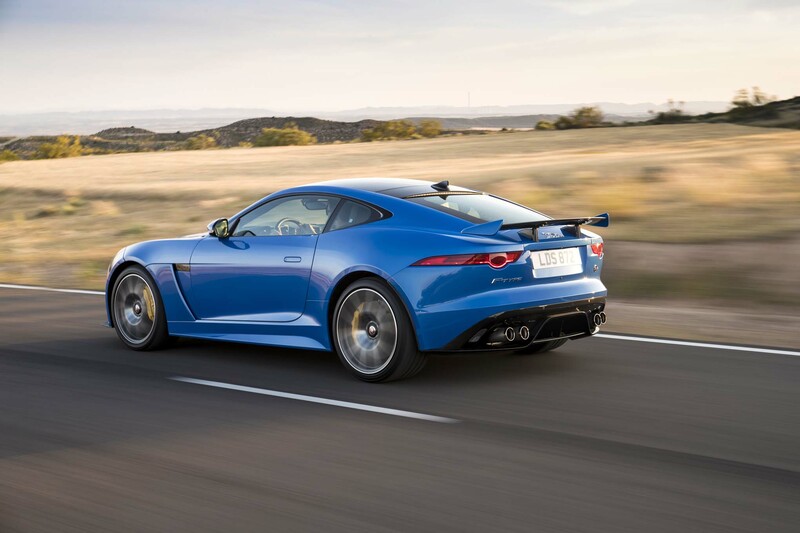 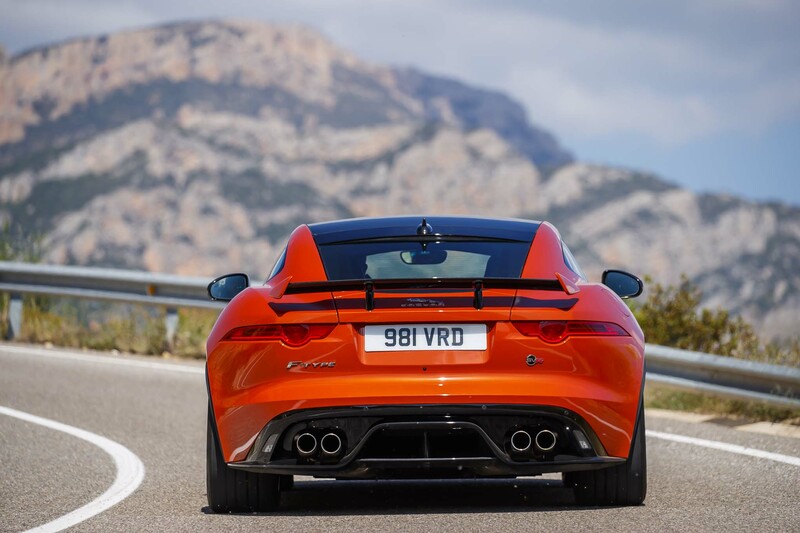 I’ve been a fan of the Jaguar F-Type, in terms of its looks, since its inception in 2013, and I’m especially a fan of the coupe that came along a bit later. 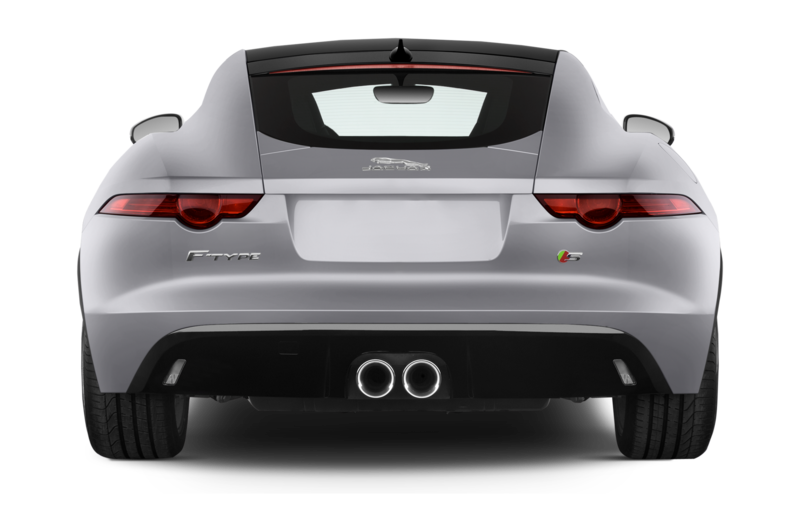 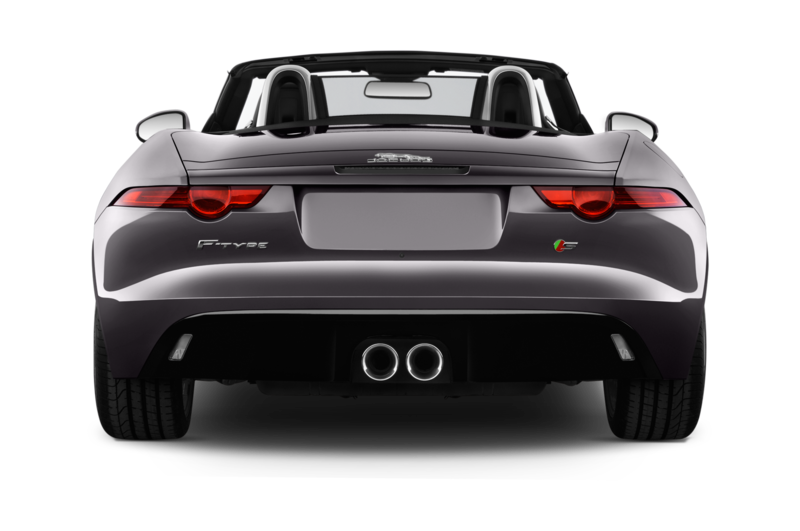 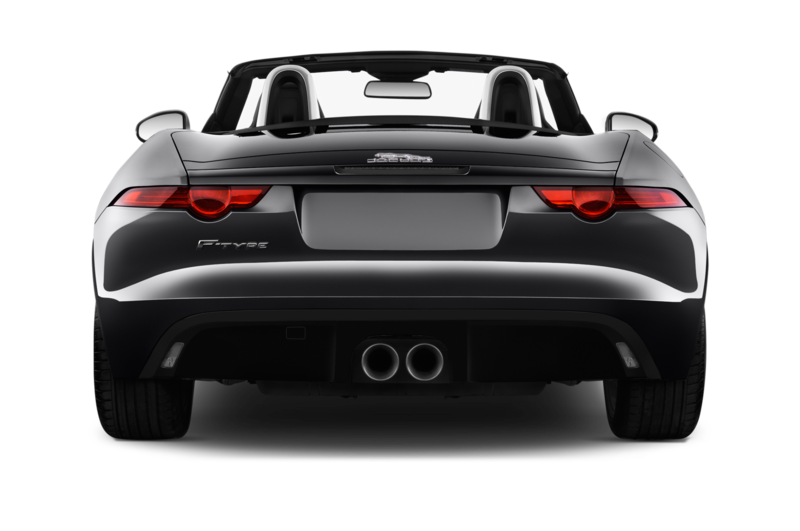 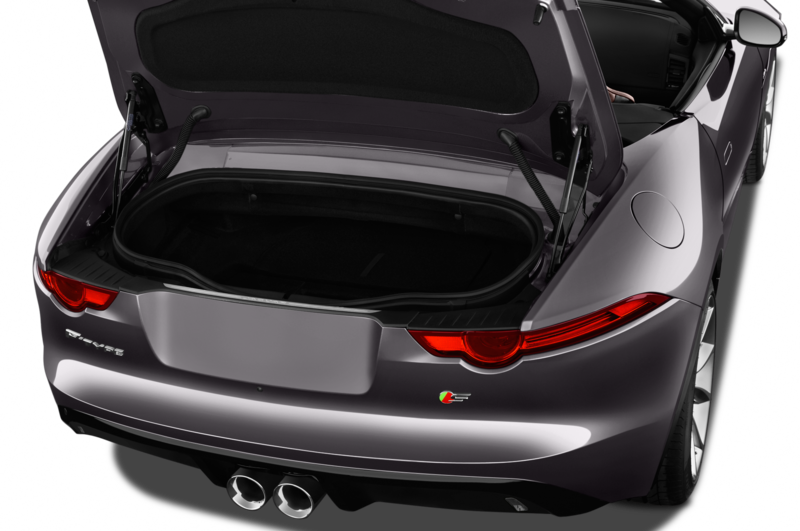 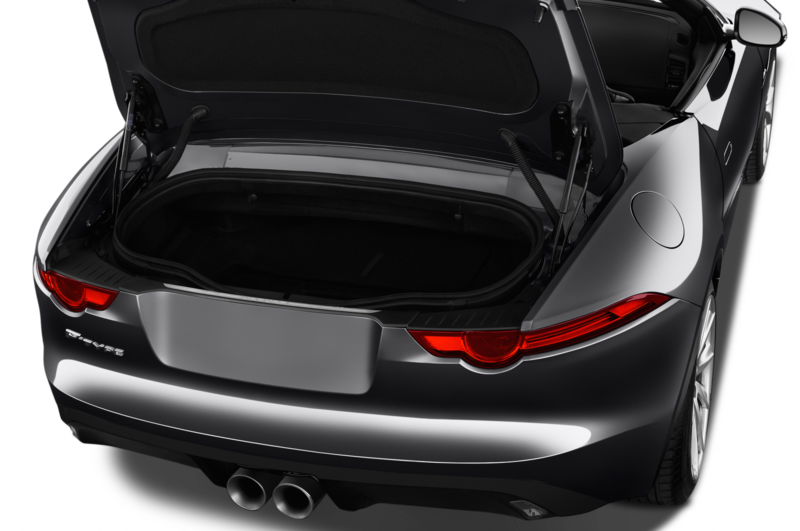 Jaguar did a particularly good job with the car’s rear end, which is notable because it seems to me that many cars these days look good from any angle apart from the rear. 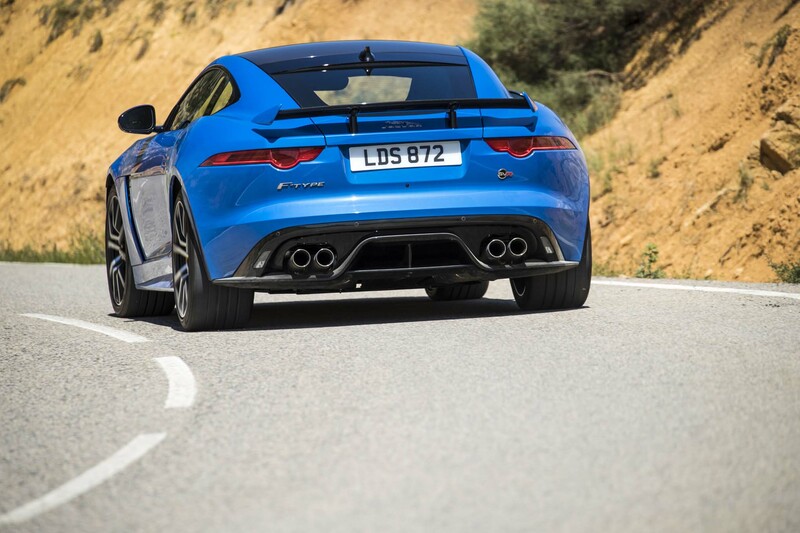 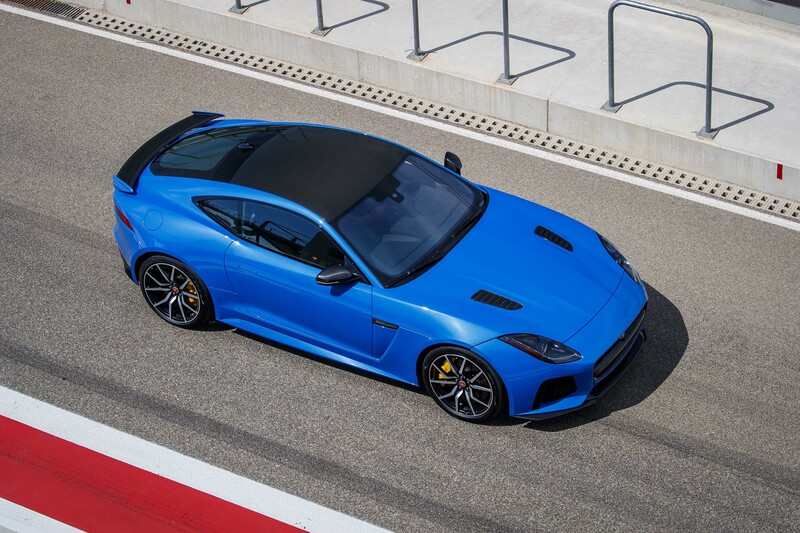 The SVR’s exterior changes are subtle but functional. 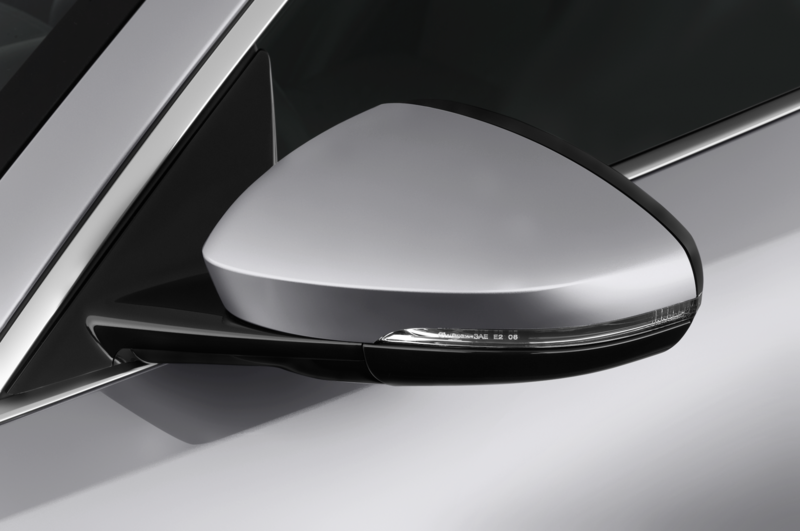 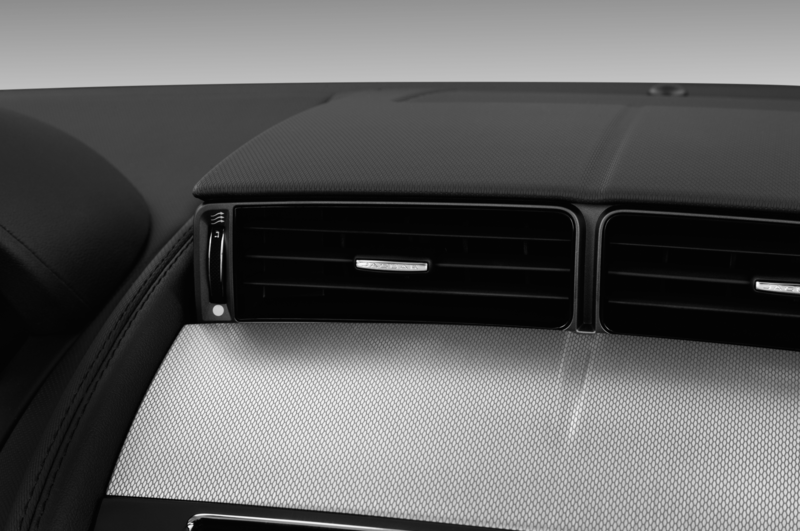 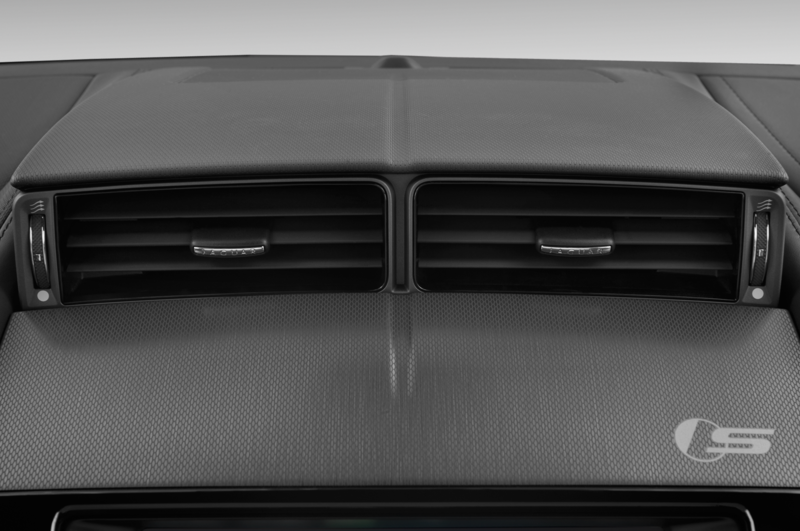 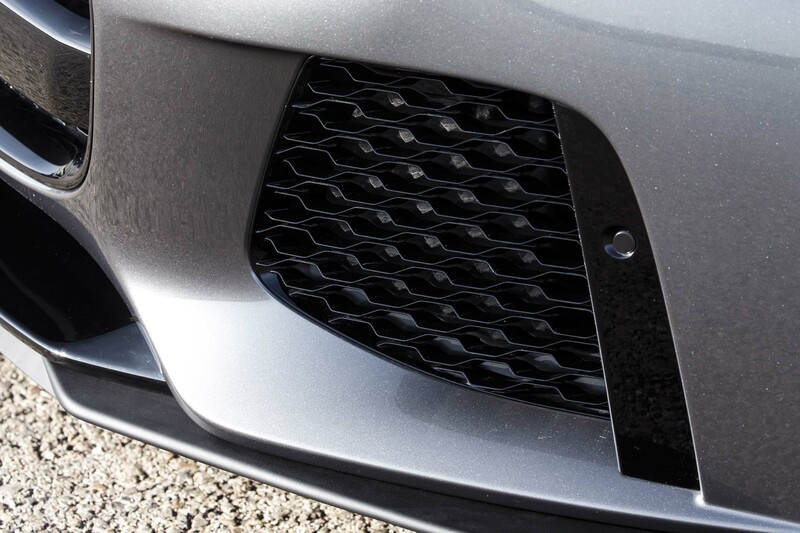 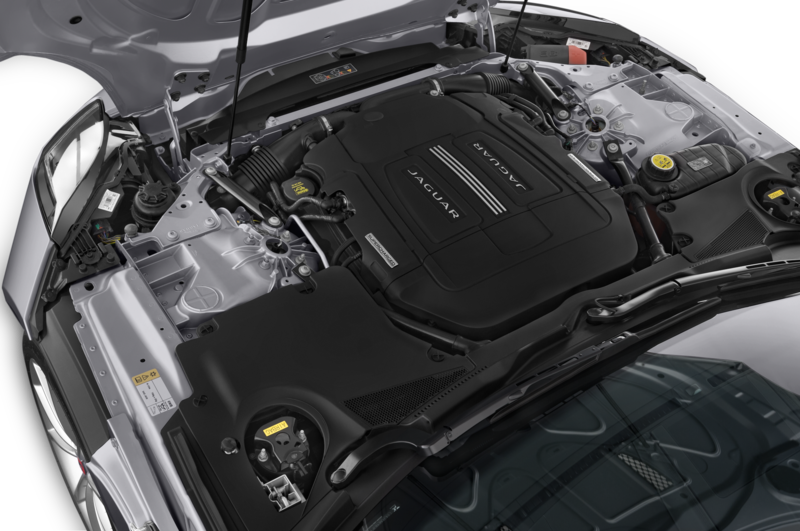 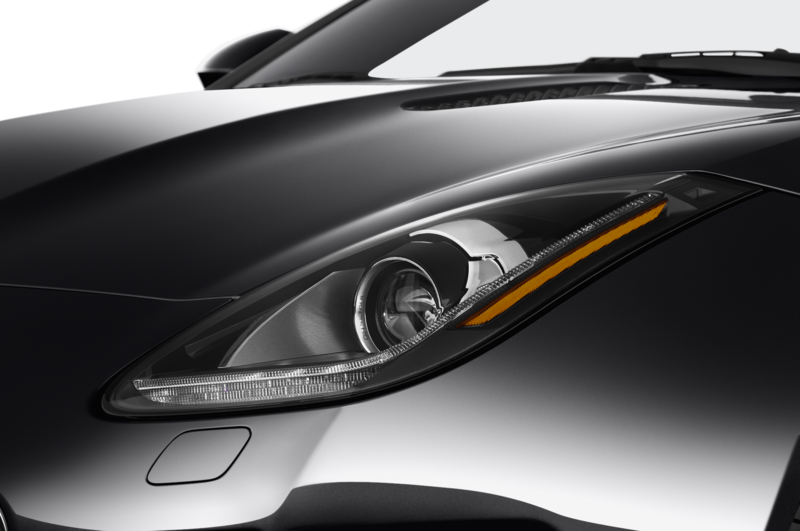 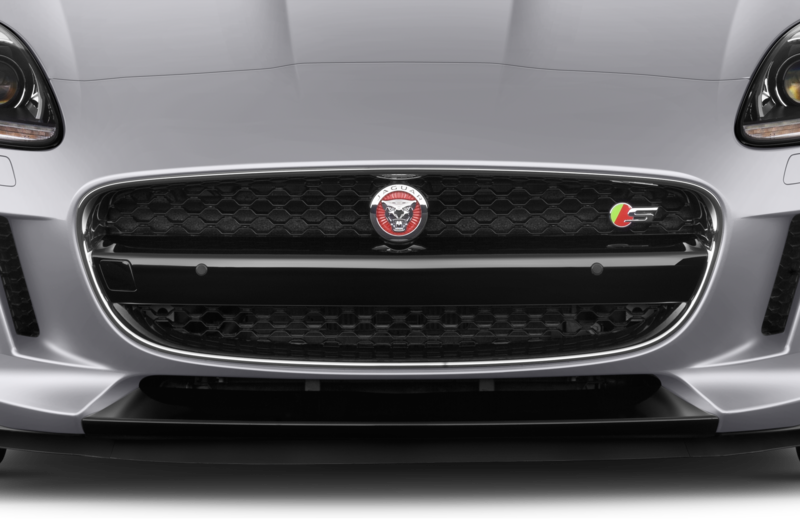 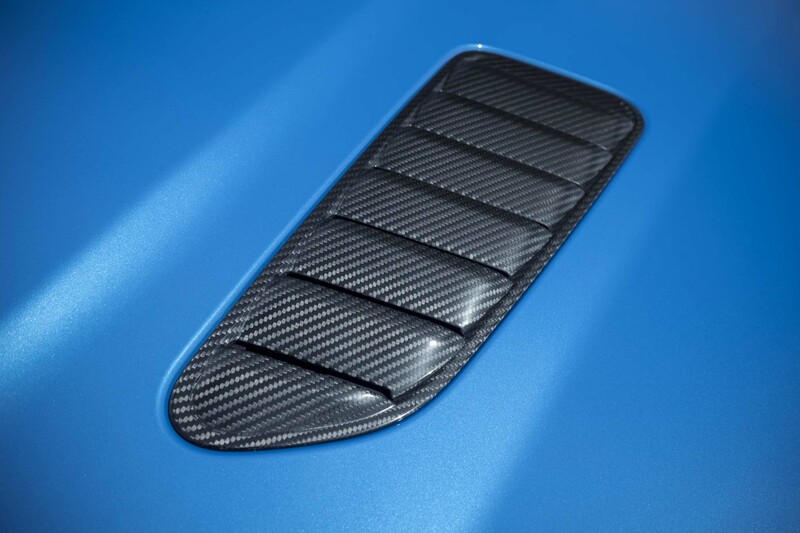 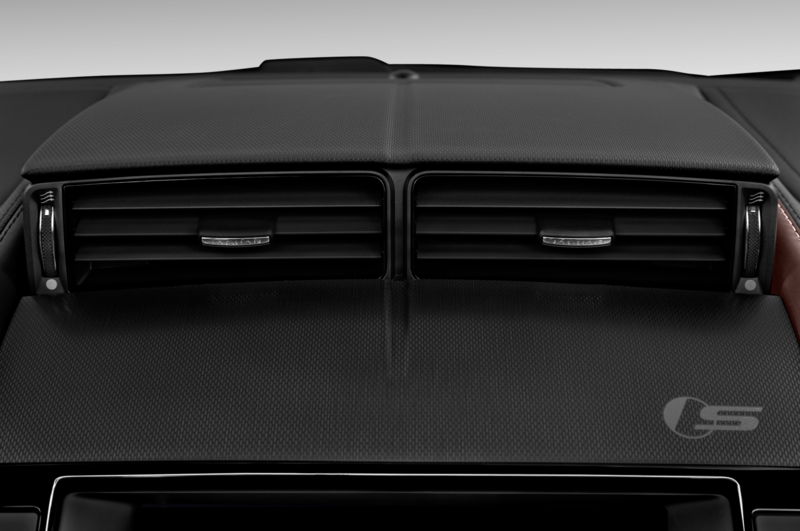 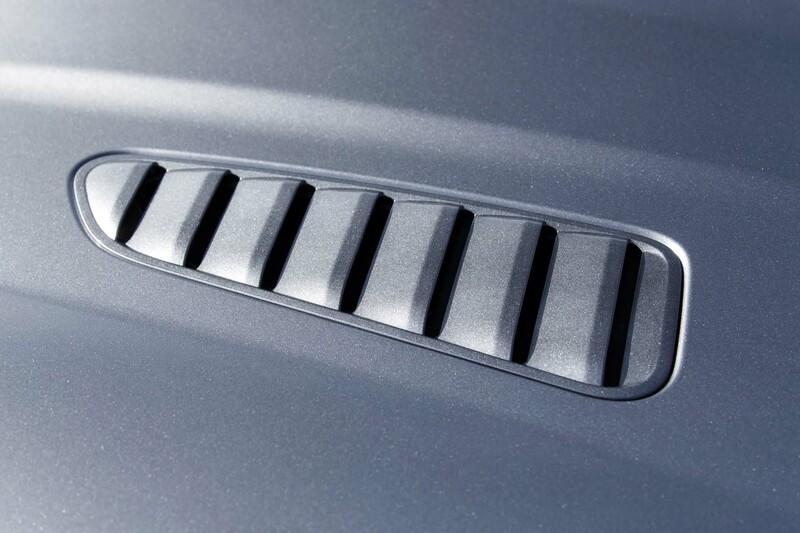 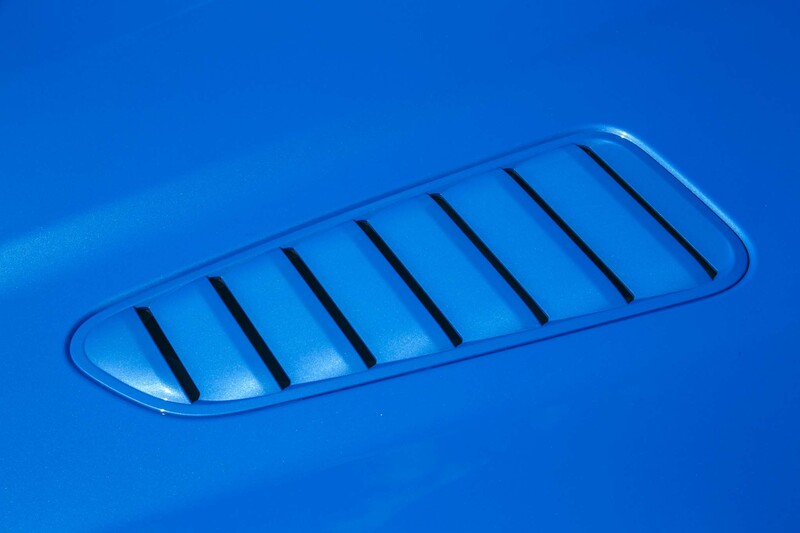 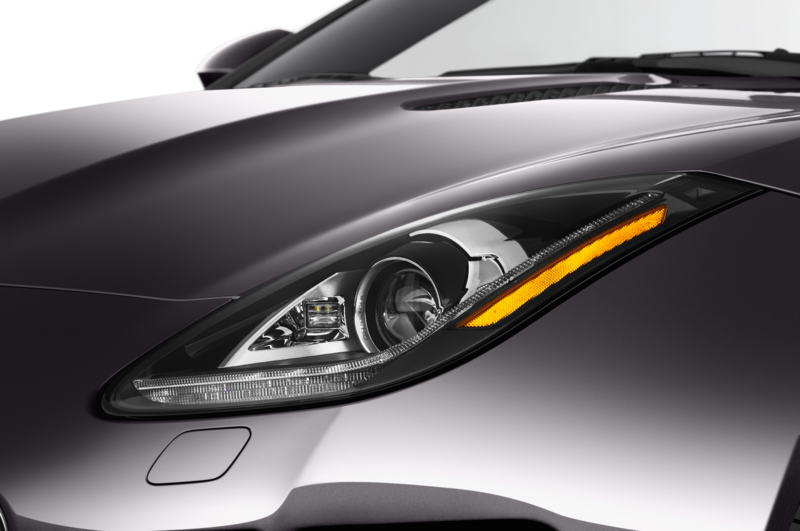 New hood vents and modifications to the front undertray and front valance provide better engine cooling. 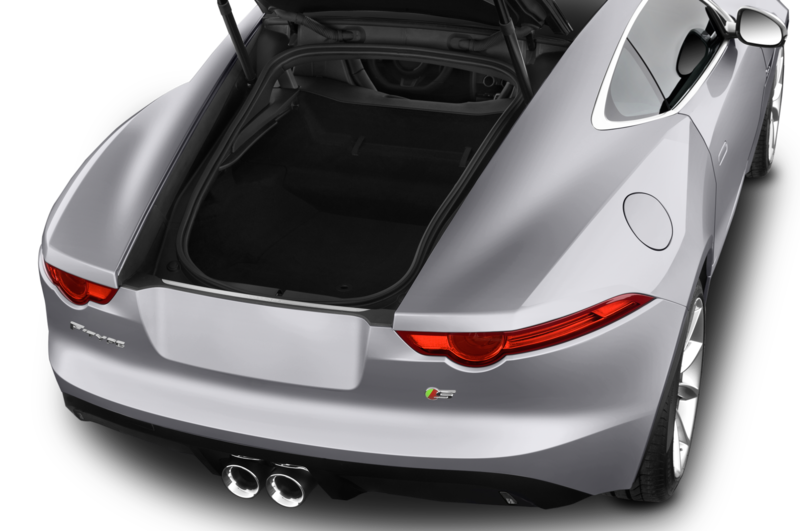 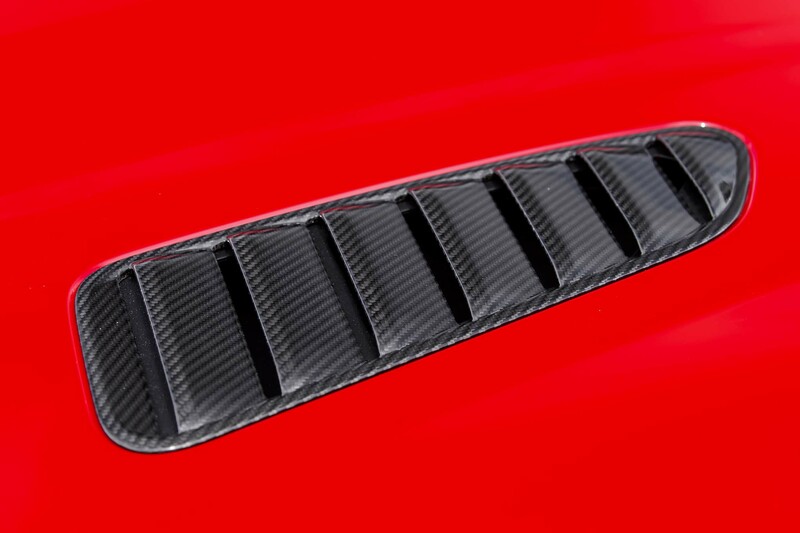 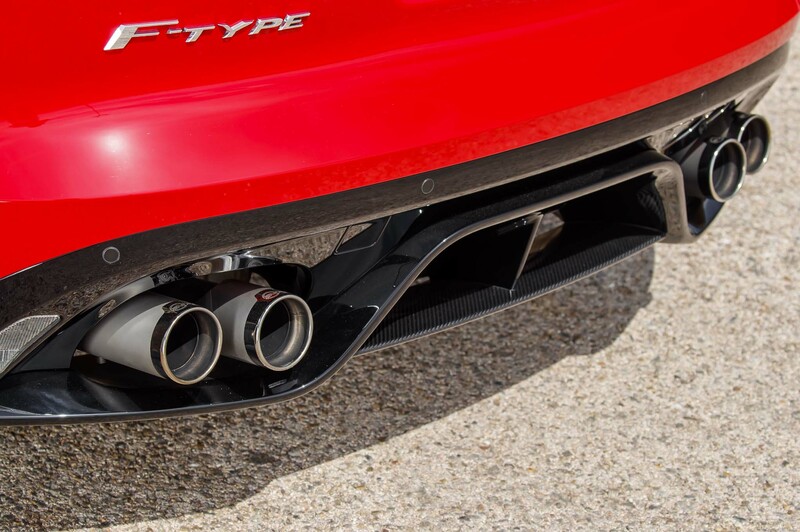 Wider front wheel-arch bodywork with new air-exit vents, a new rear venturi/diffuser, and split exhaust silencers all help to provide better airflow and reduce lift. 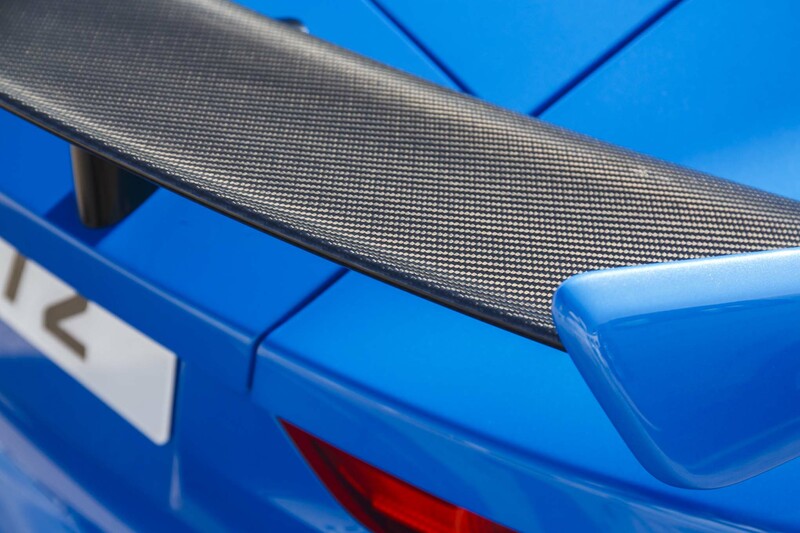 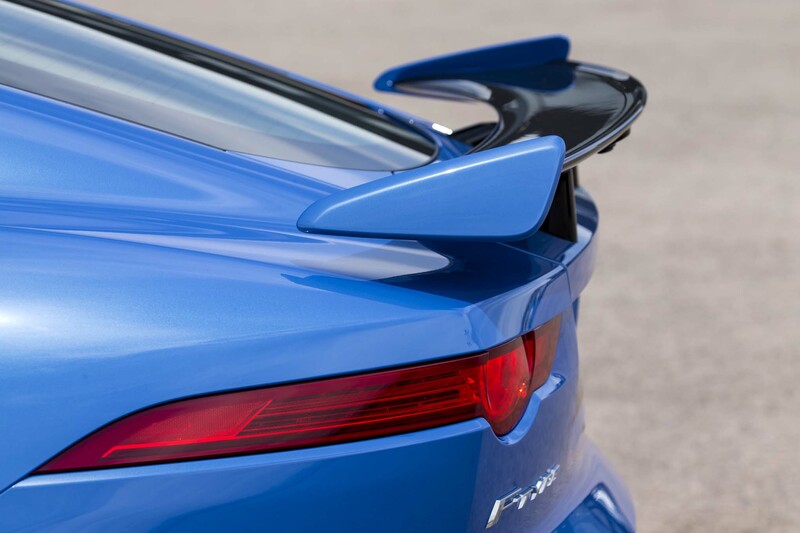 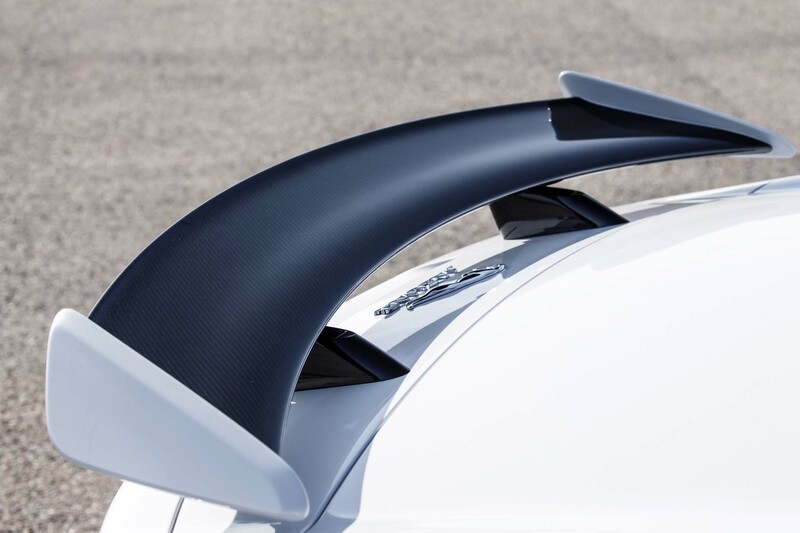 The new-for-SVR rear wing activates automatically at 70 mph on the coupe (60 mph for convertible) and reduces lift. 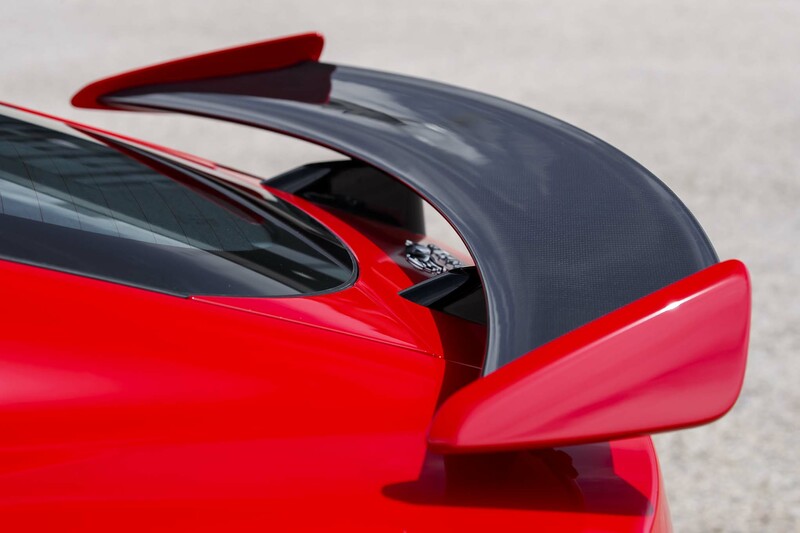 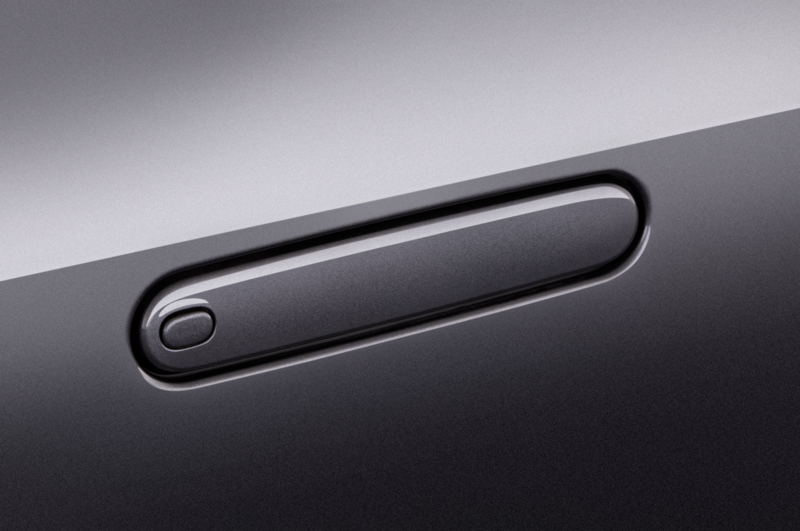 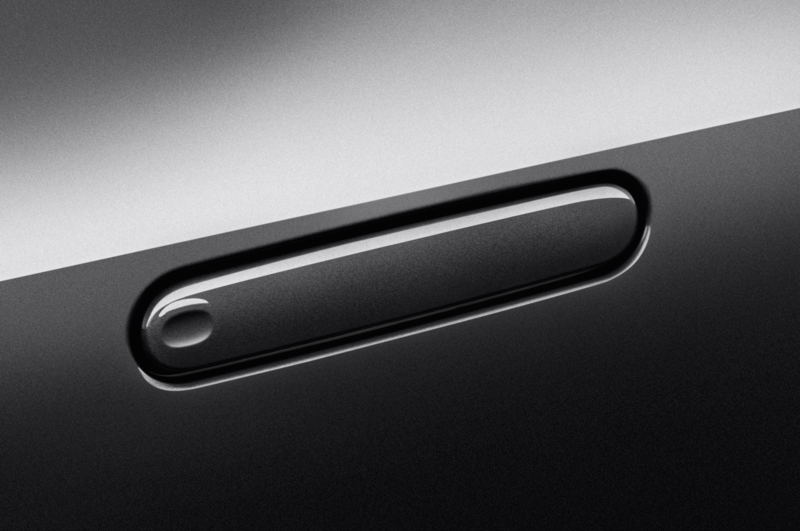 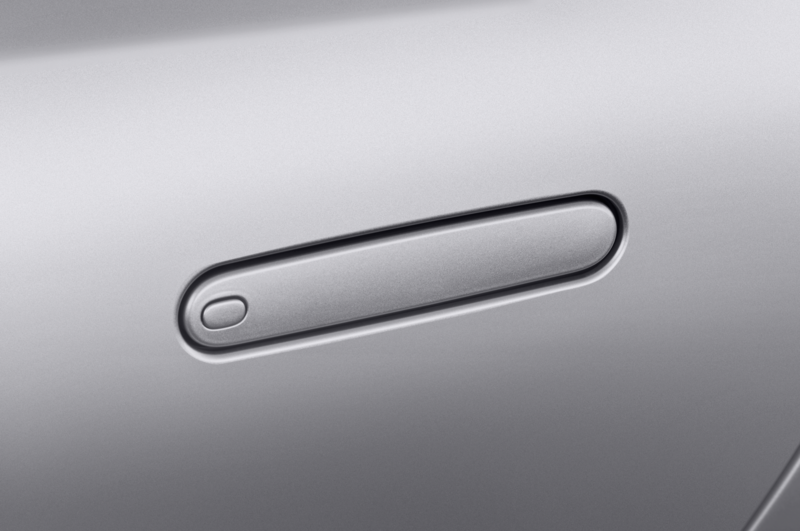 In Dynamic (sport) mode, the wing is always deployed. 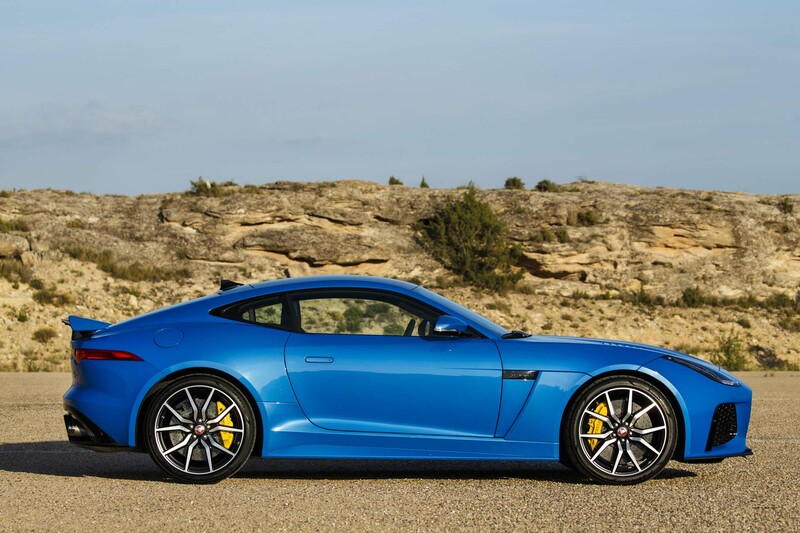 As far as weight reductions, new twin silencers on the SVR save 36 pounds, while wider, 20-inch forged aluminum wheels cut another 29 pounds. 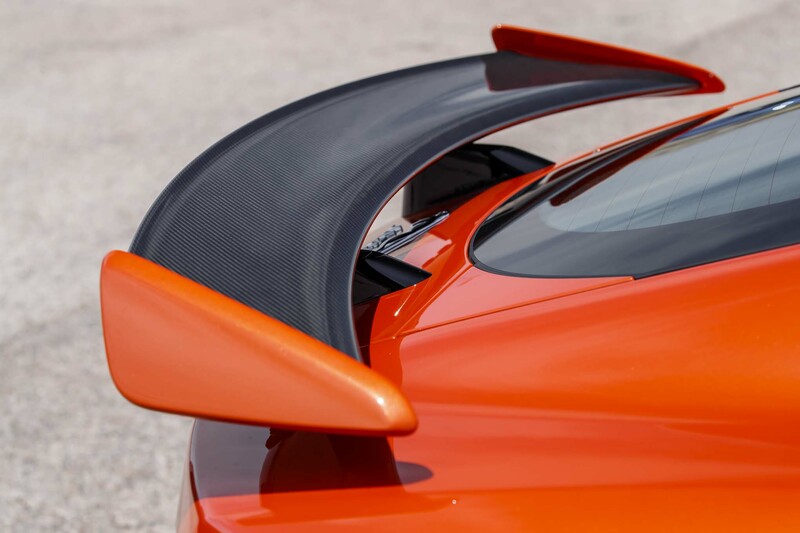 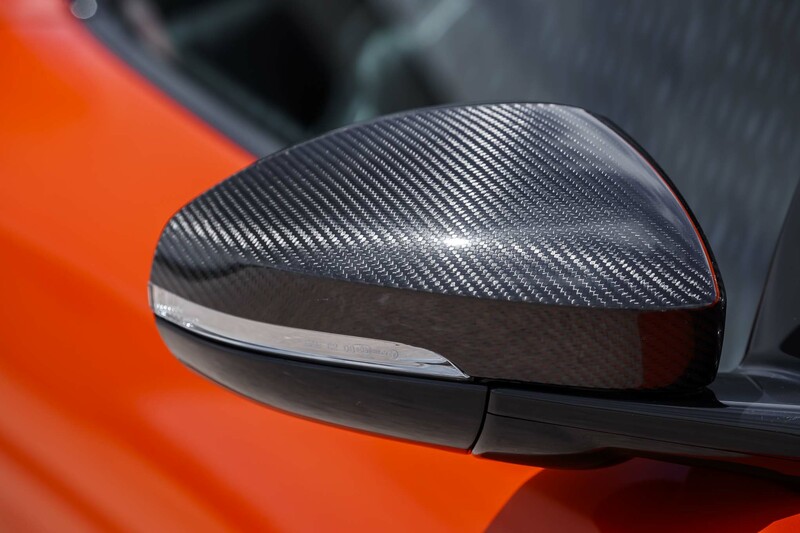 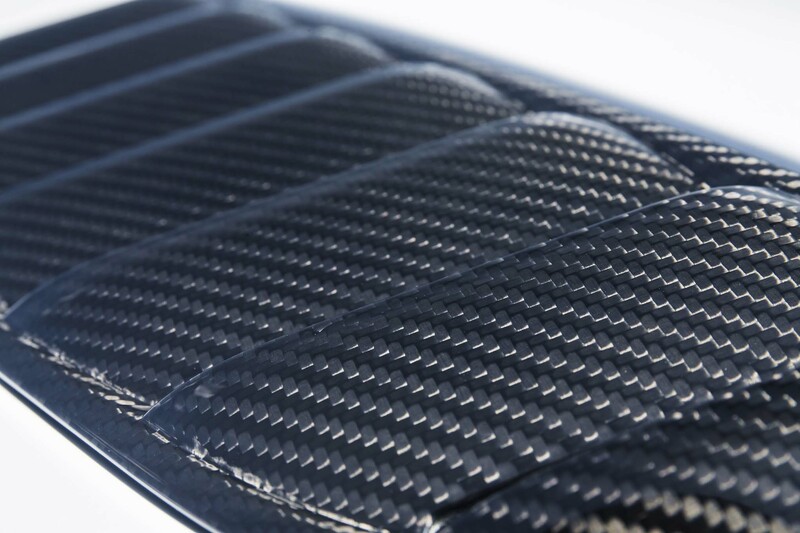 The carbon-package option, which includes brakes and a carbon roof, takes off 55 pounds. 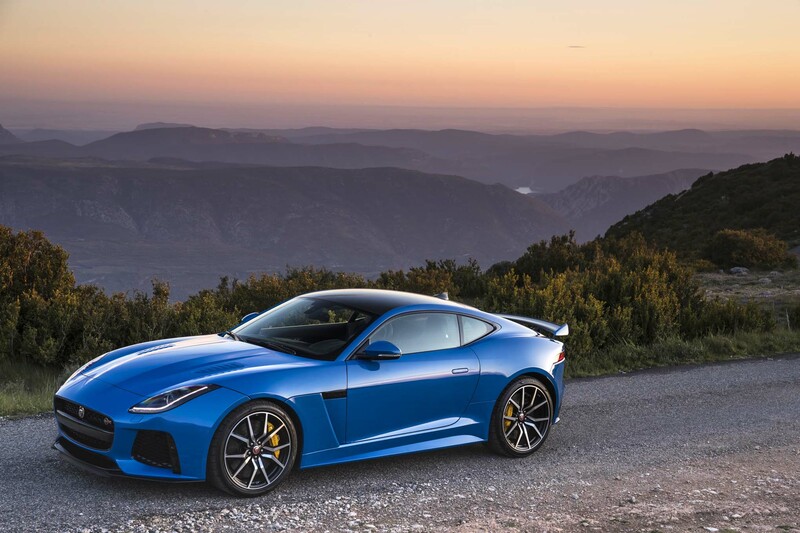 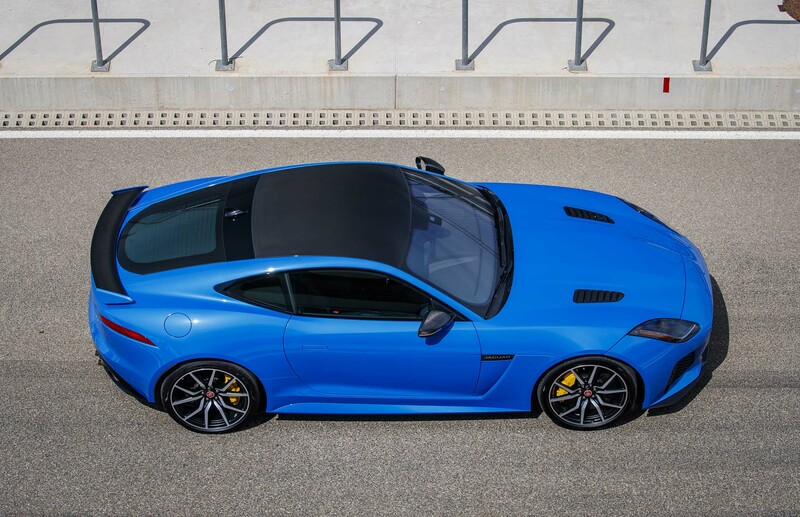 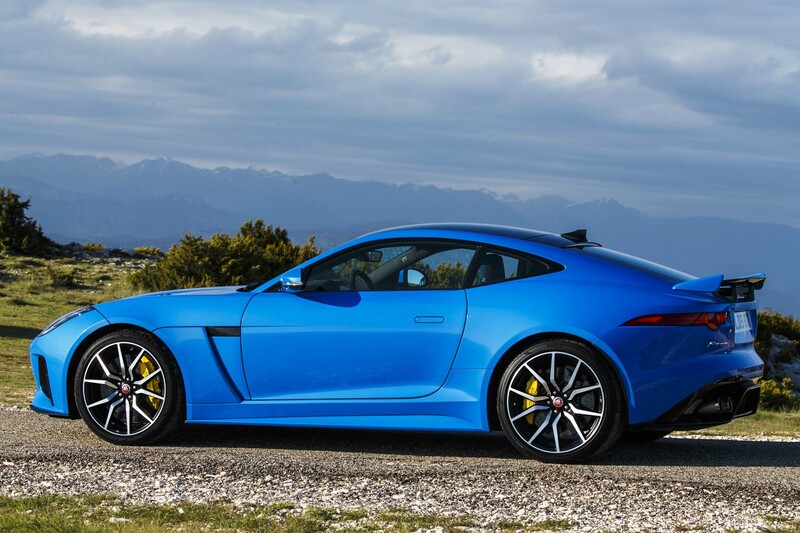 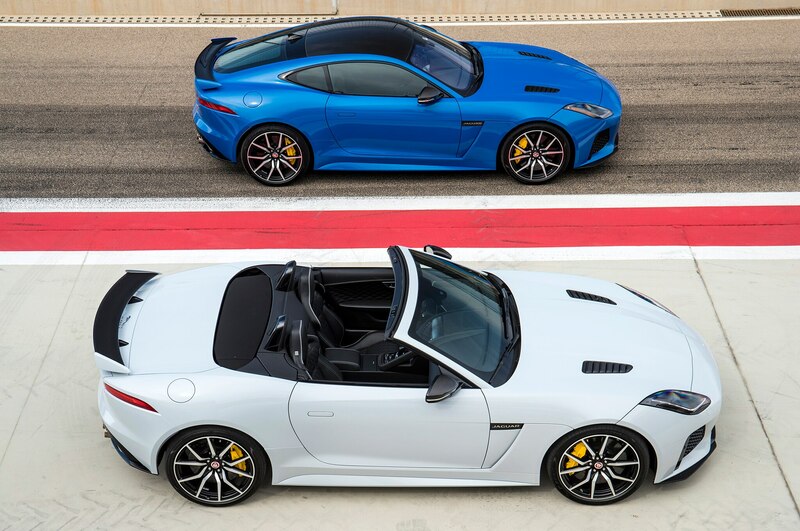 In total, an SVR coupe with all of the lighter options fitted comes in at 3,750 pounds (3,784 for the convertible), 120 pounds lighter than the F-Type R AWD. 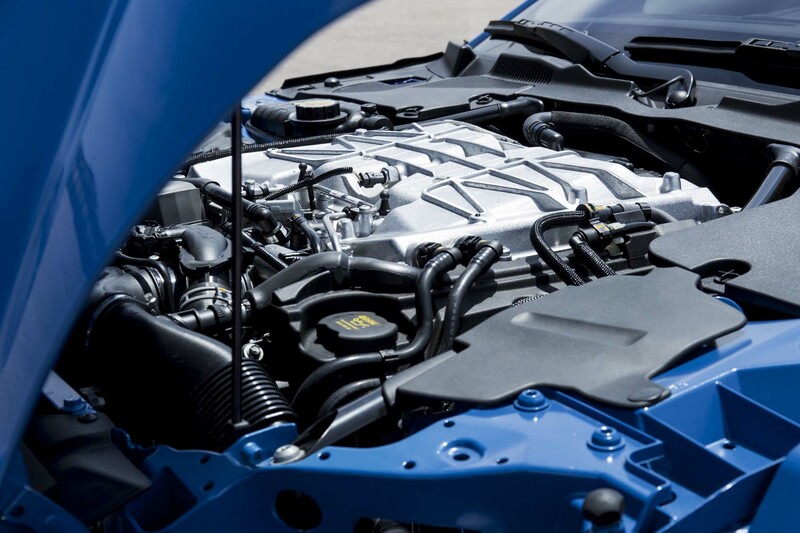 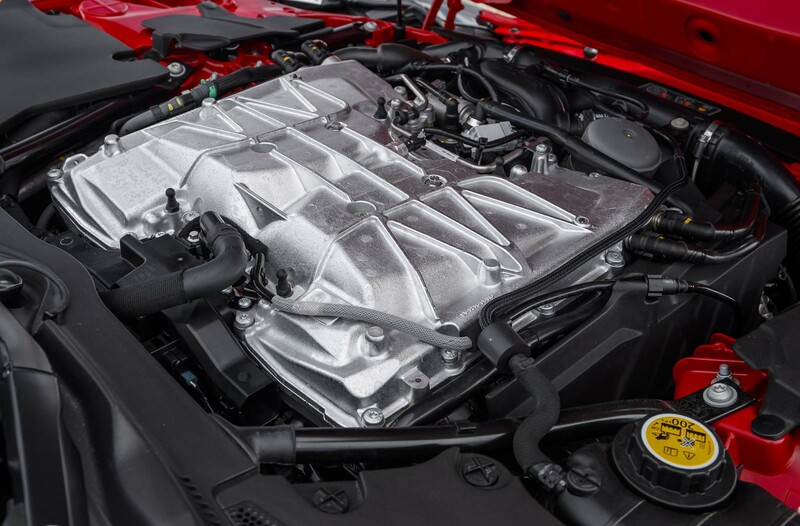 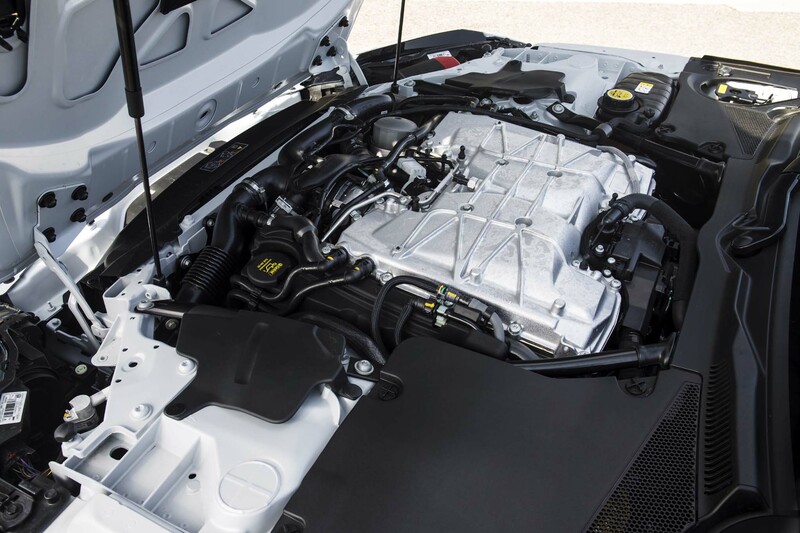 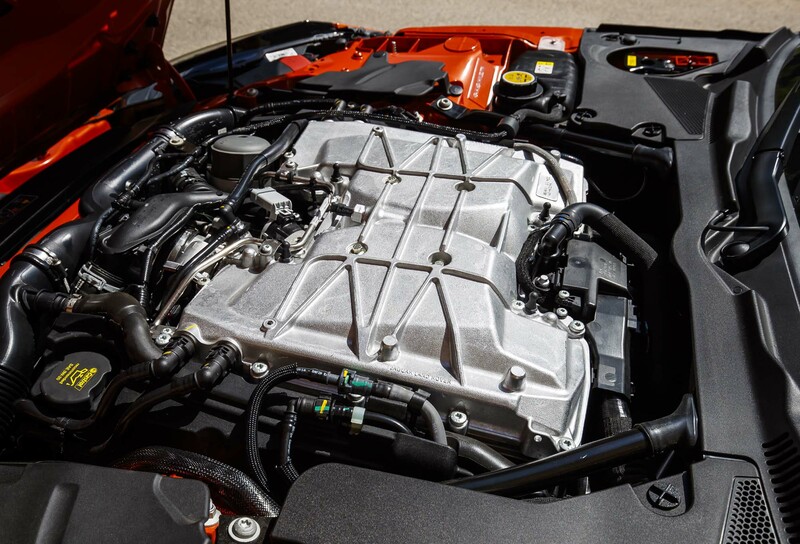 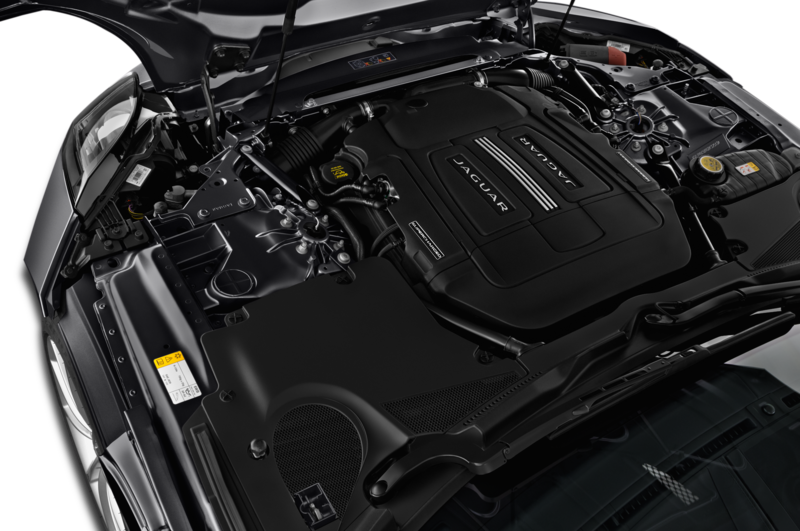 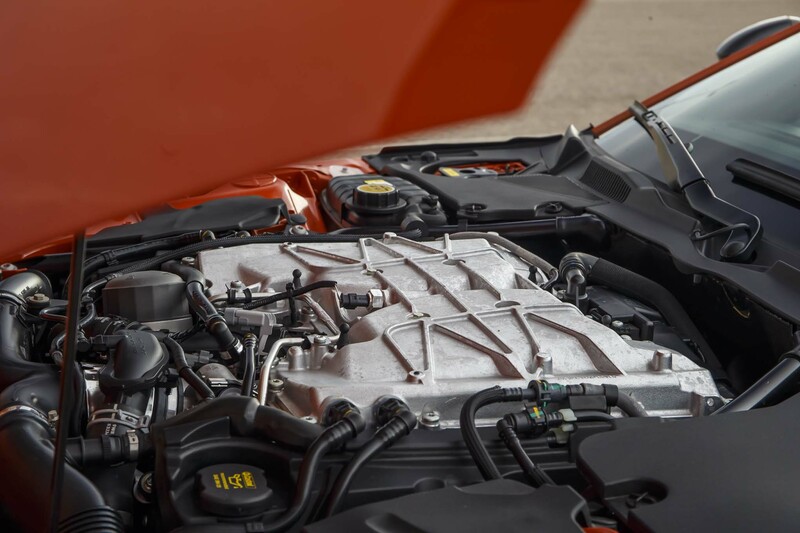 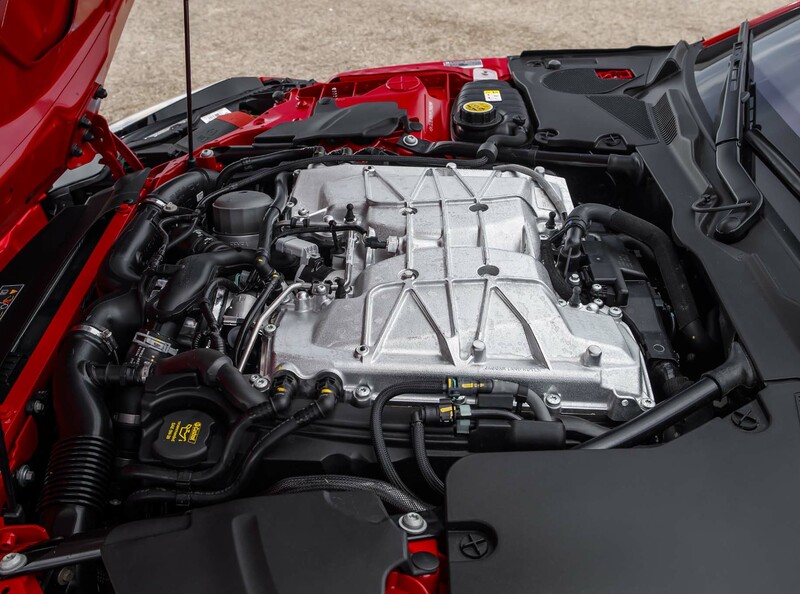 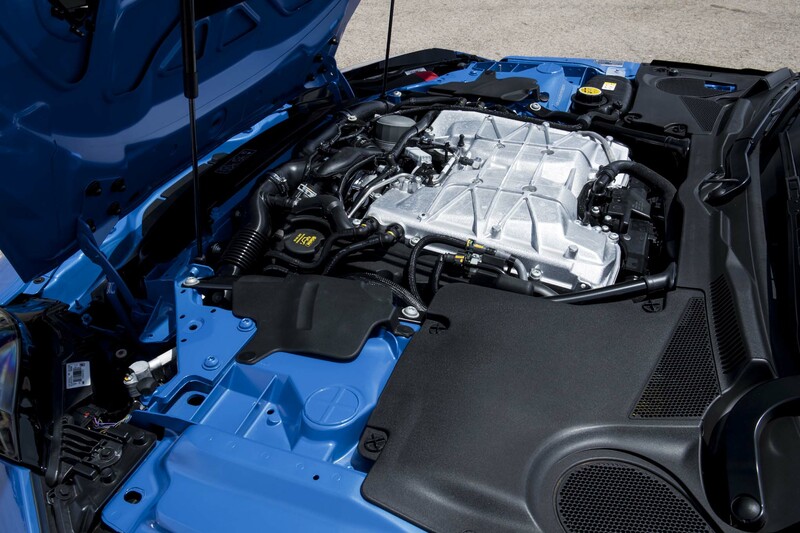 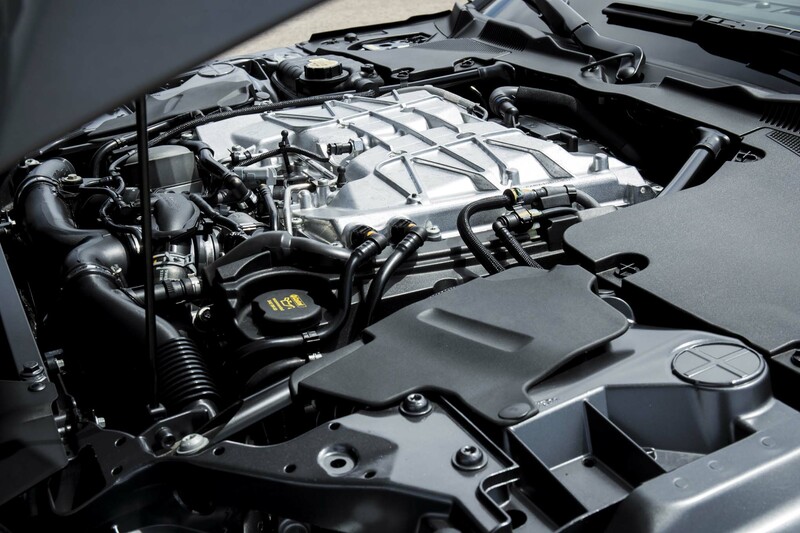 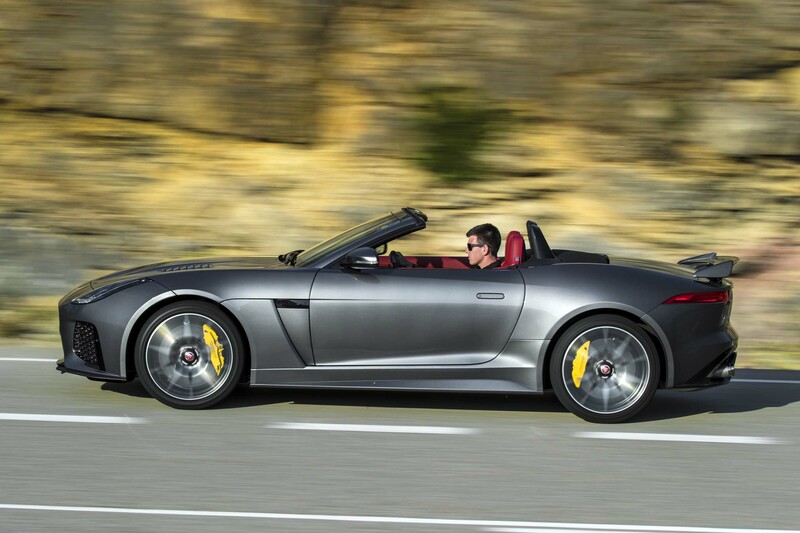 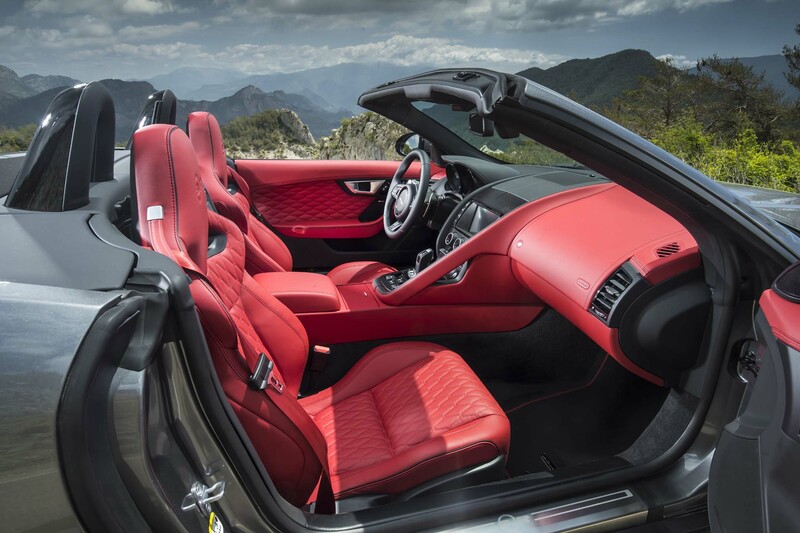 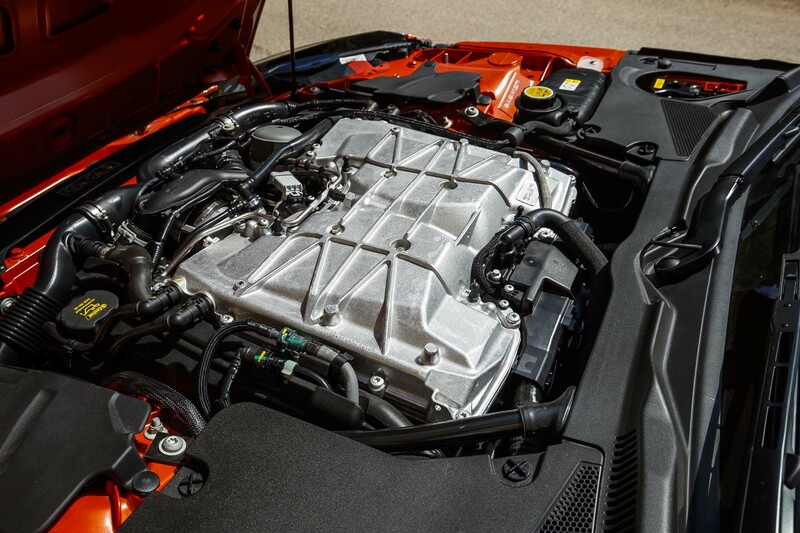 Power is up from 550 hp to 575, with 516 lb-ft of torque in both coupe and convertible. 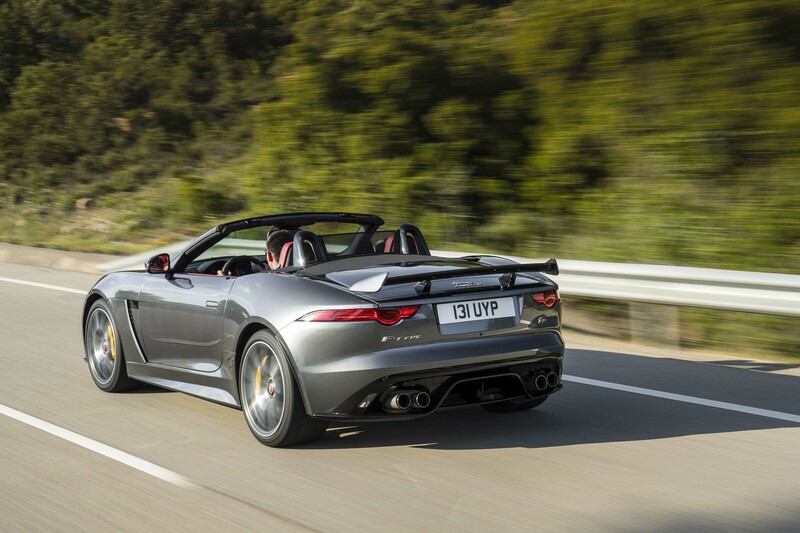 This is a very quick car, with a 200-mph top speed for the coupe (195 mph for the convertible). 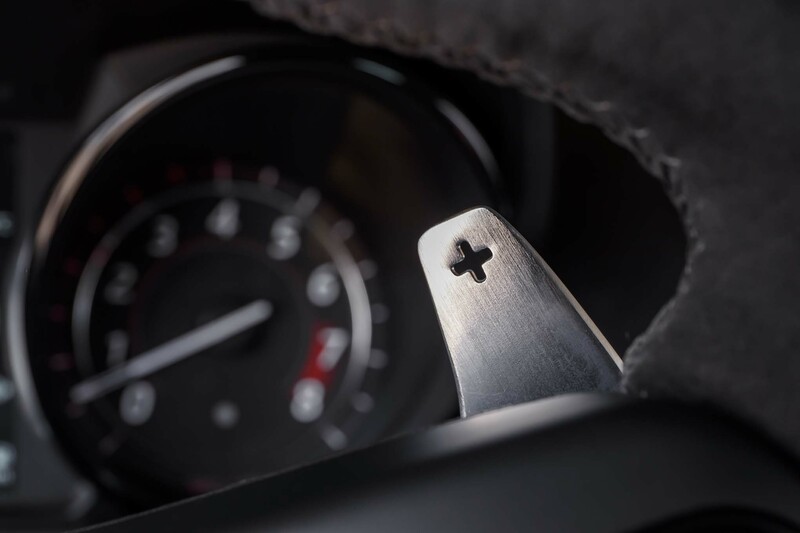 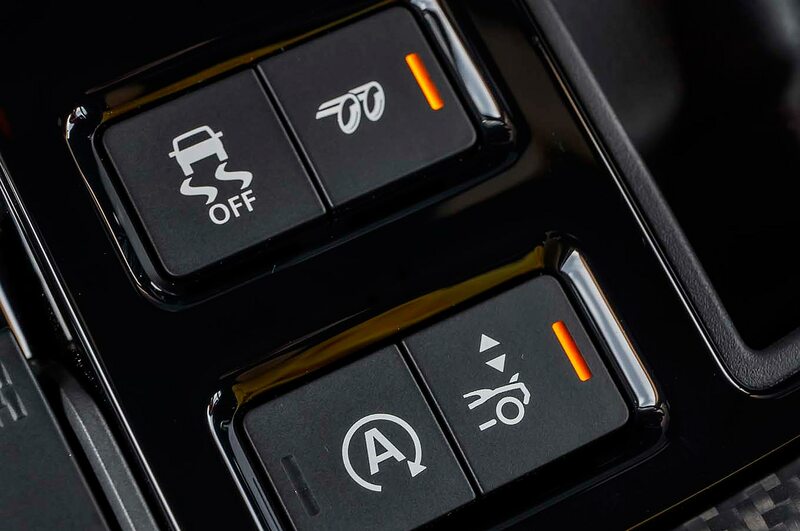 All-wheel drive allows easier—read: safer for most drivers—access to all the power. 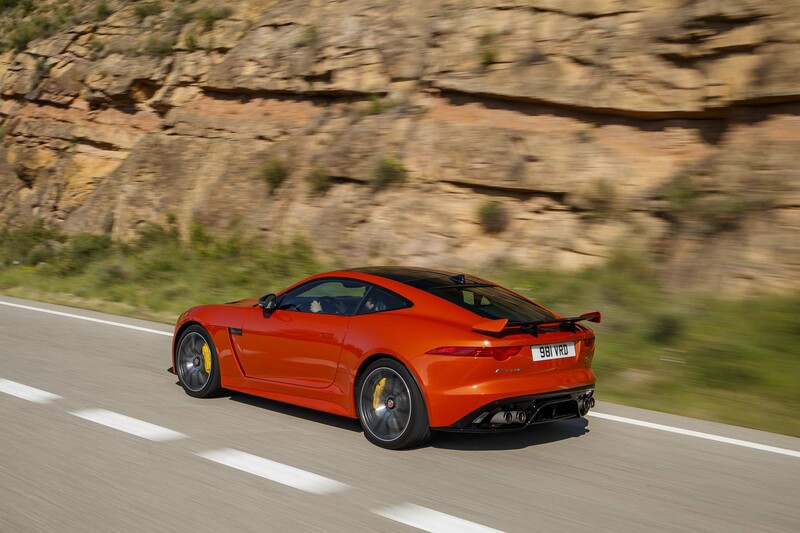 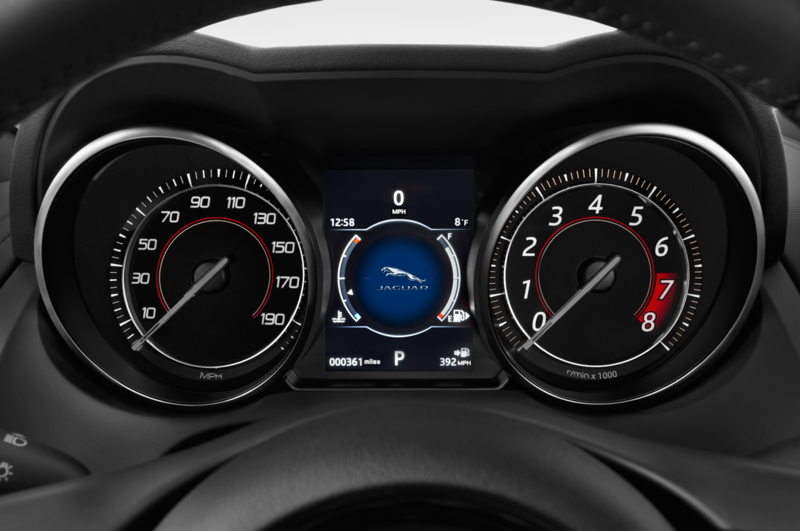 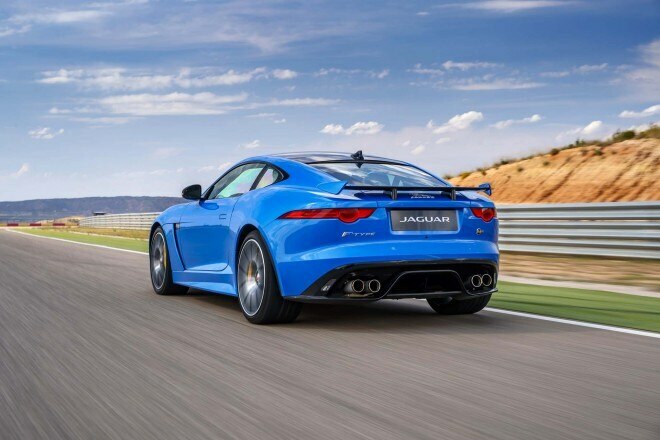 Jaguar quotes a 0 to 60 mph time of 3.5 seconds, which might be a tad conservative. 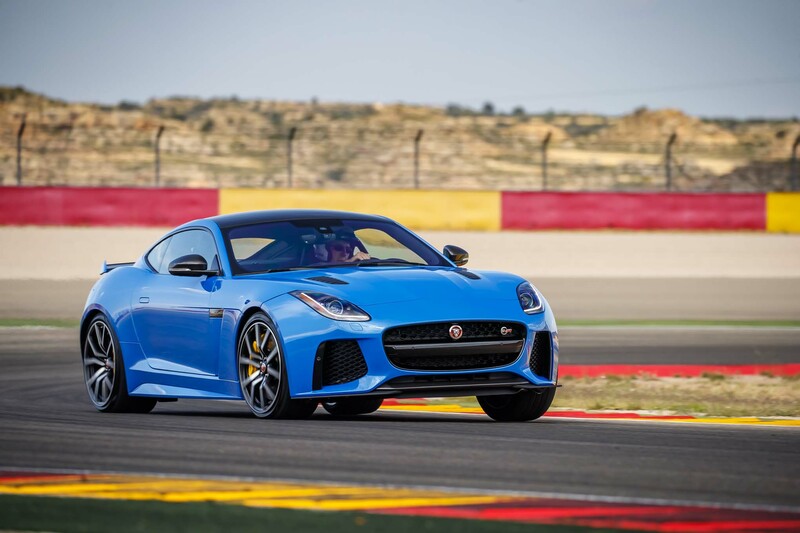 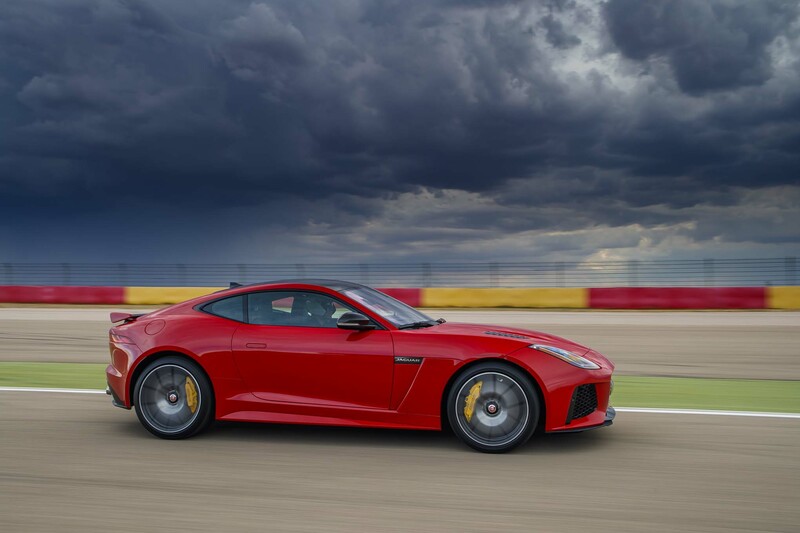 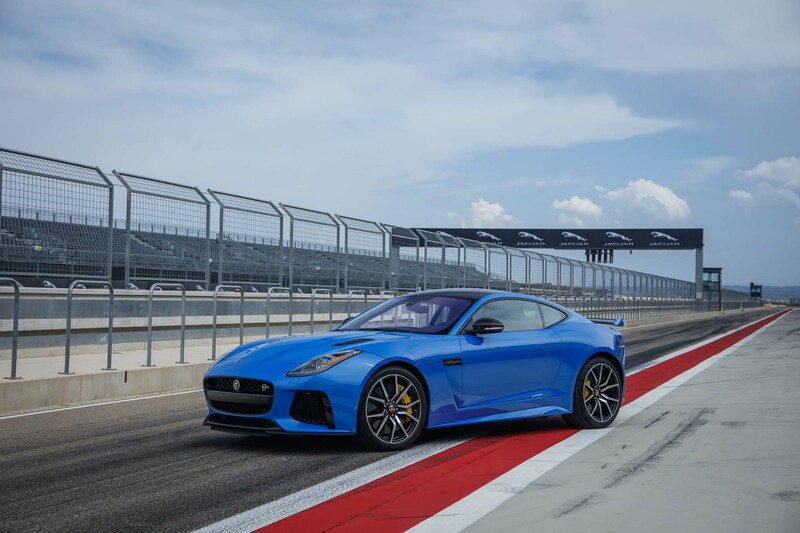 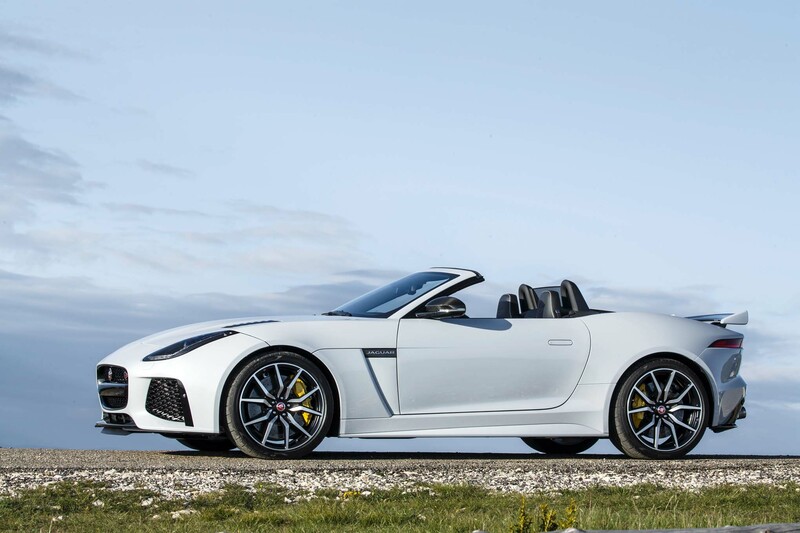 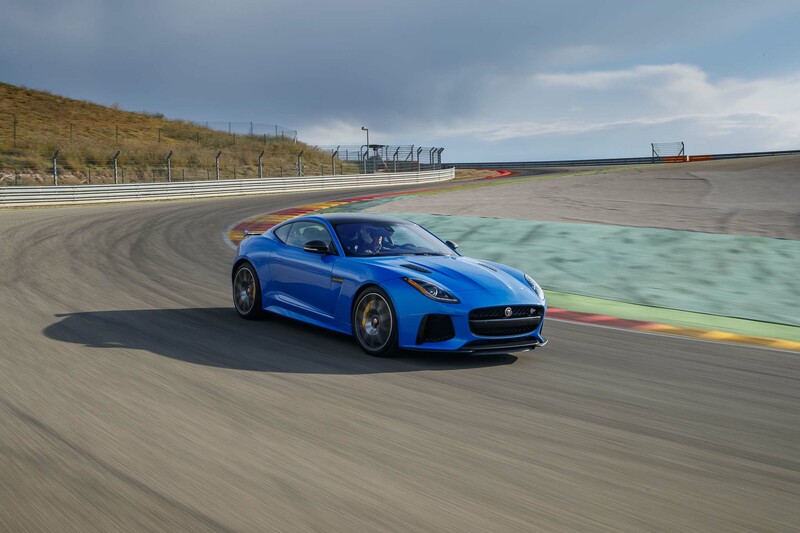 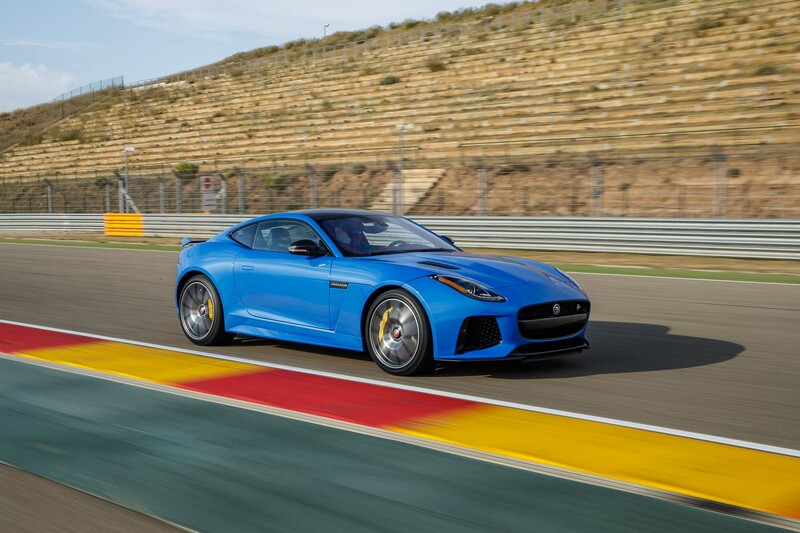 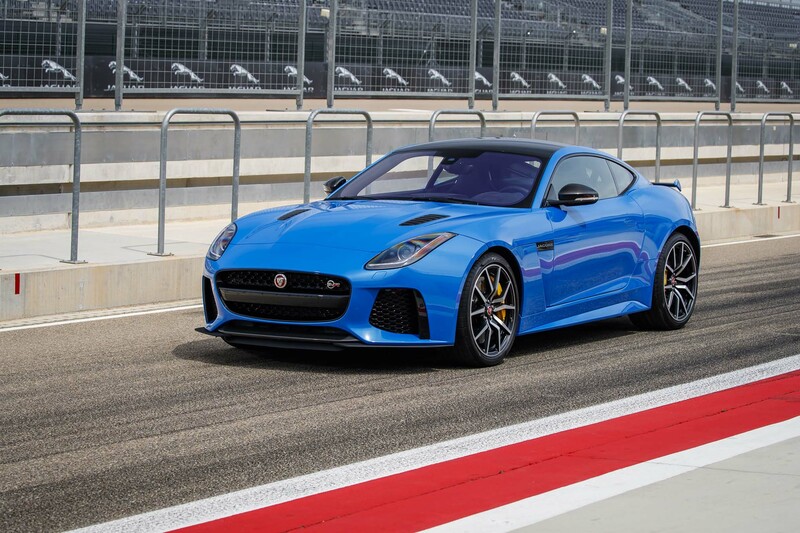 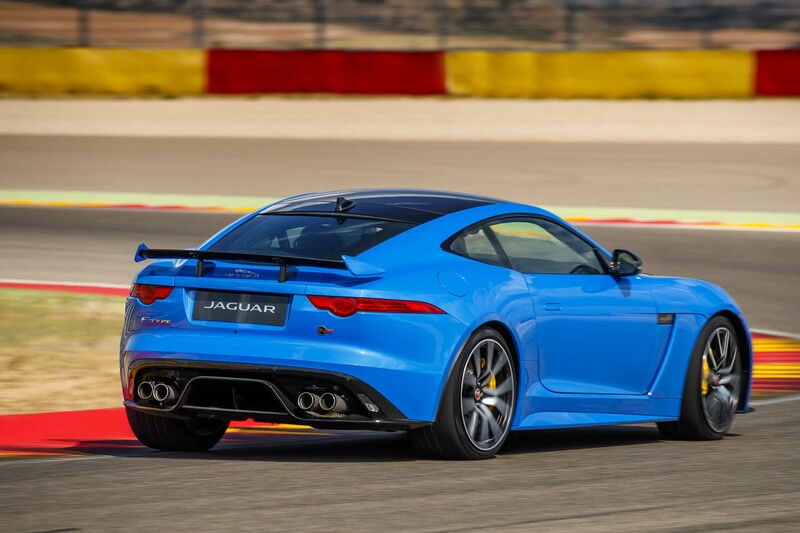 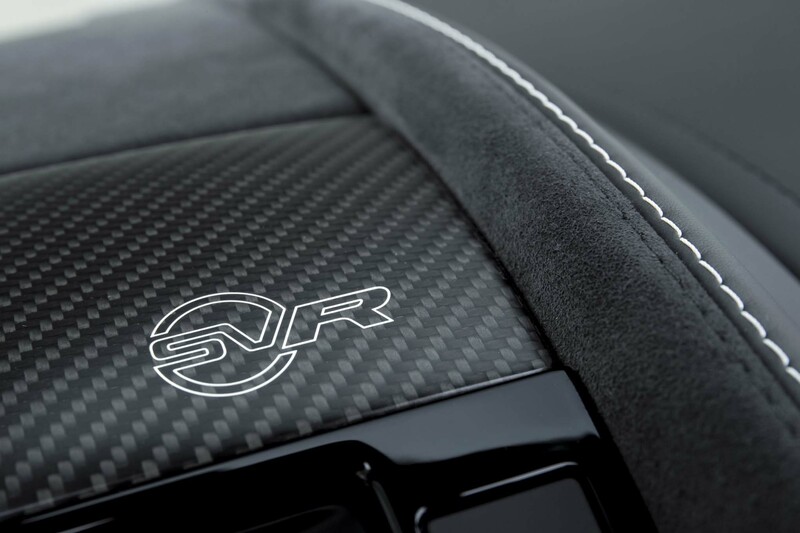 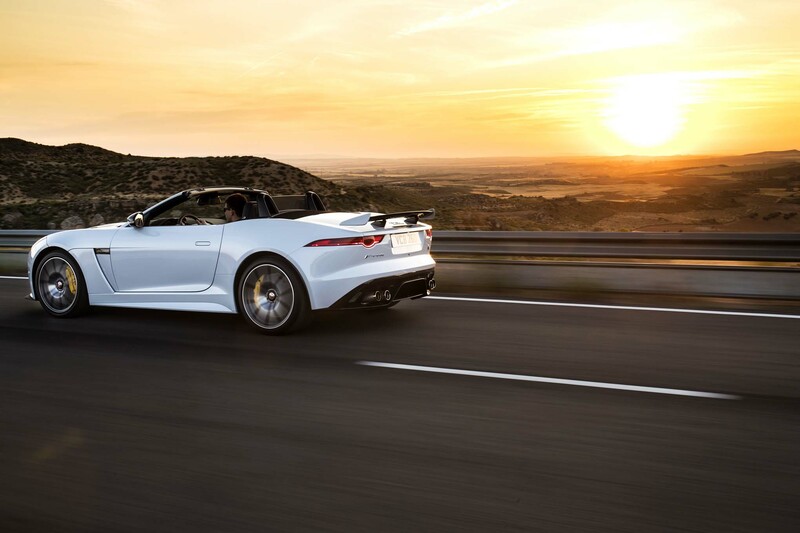 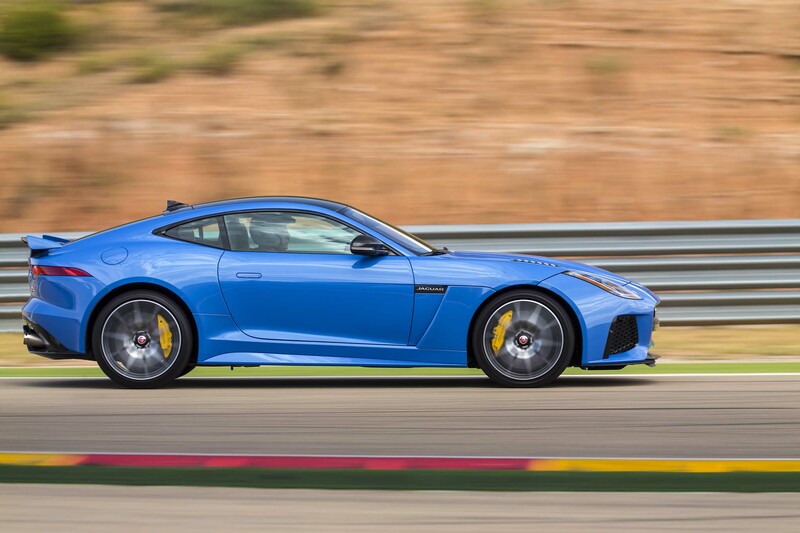 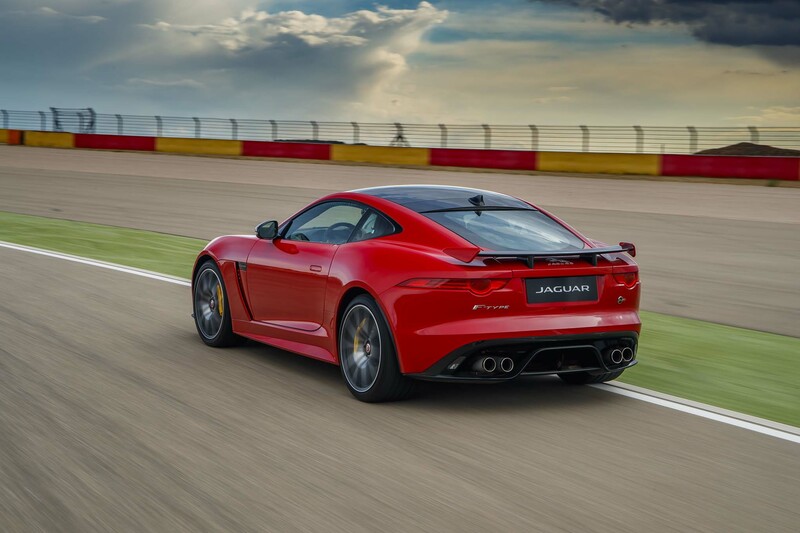 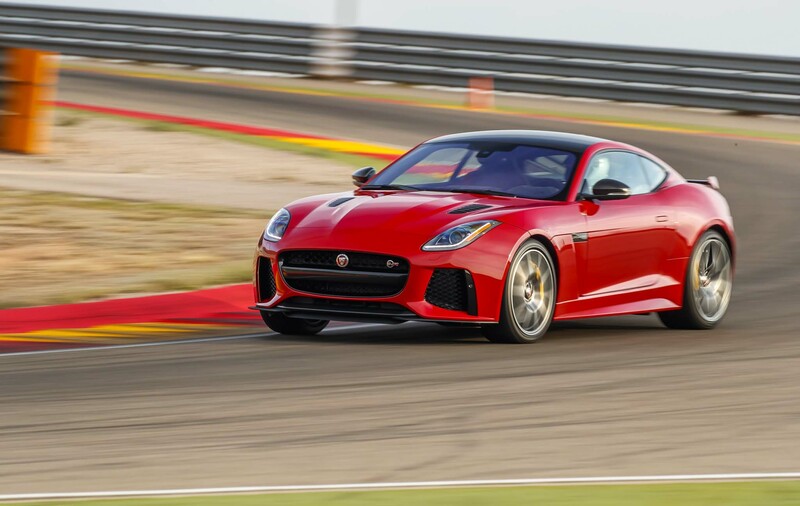 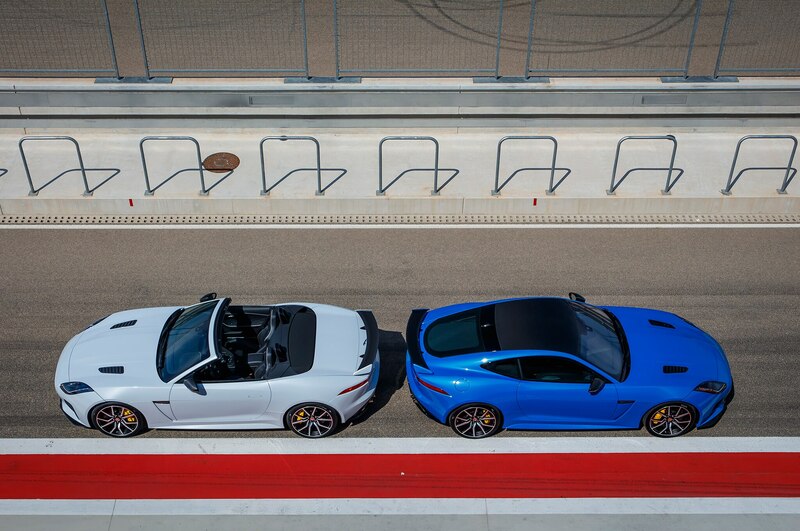 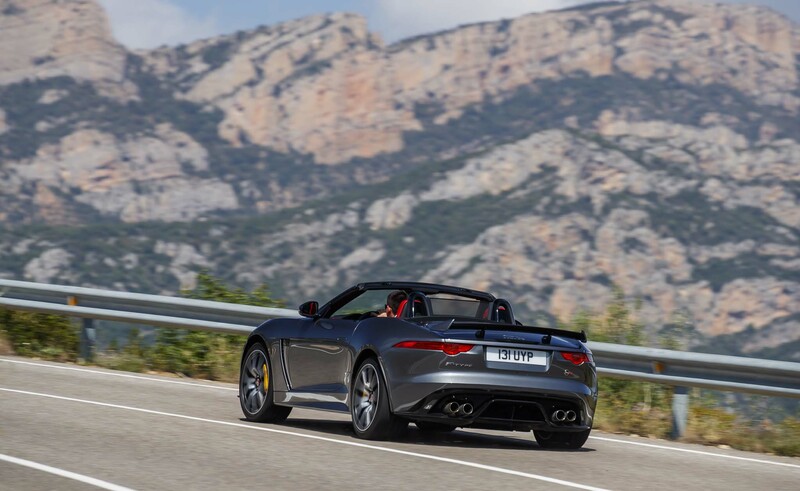 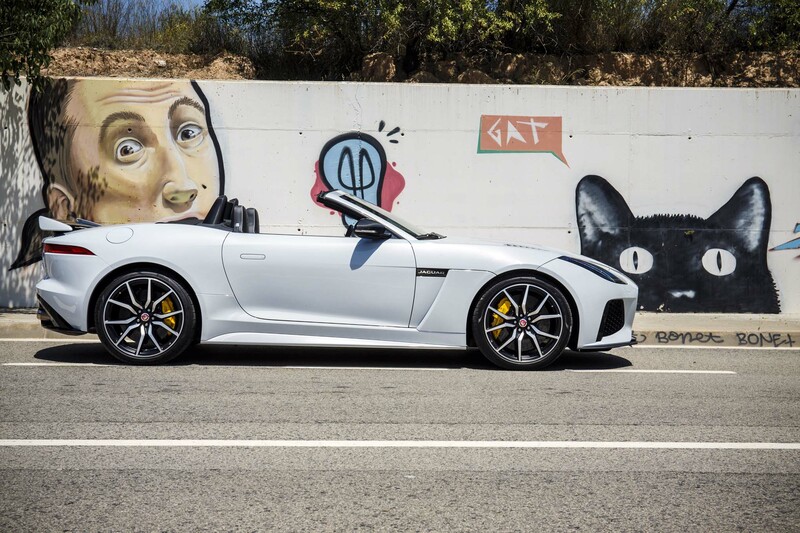 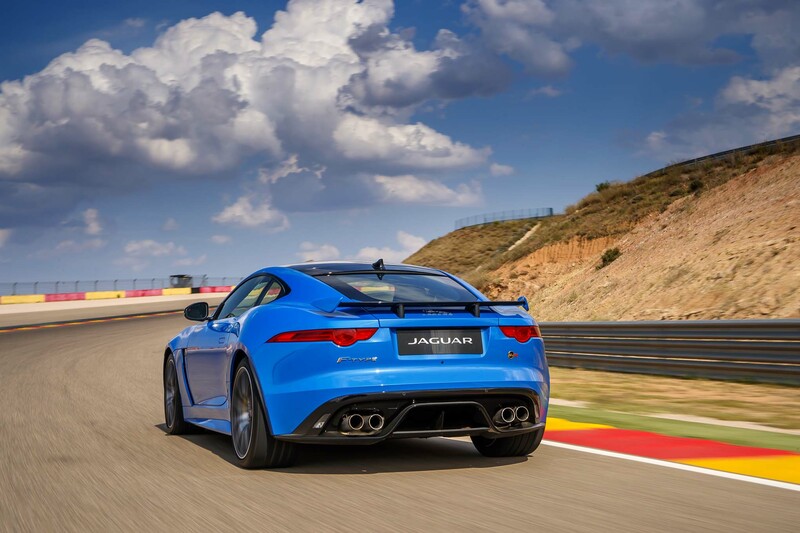 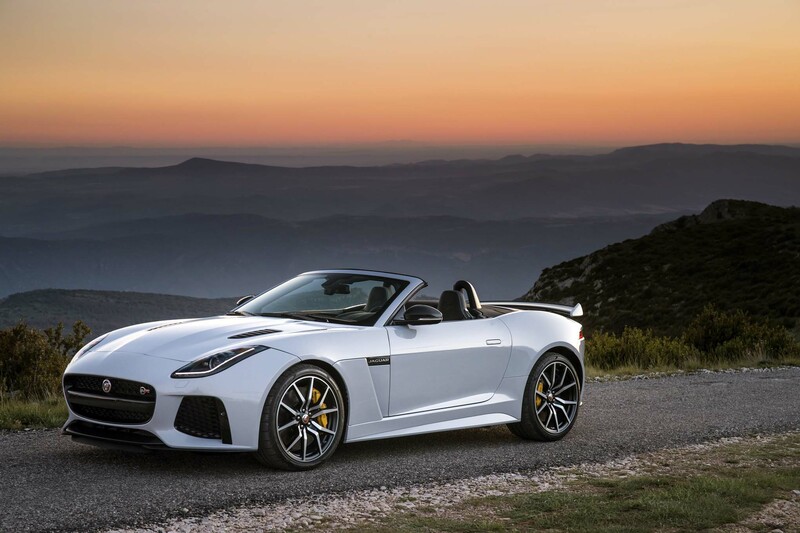 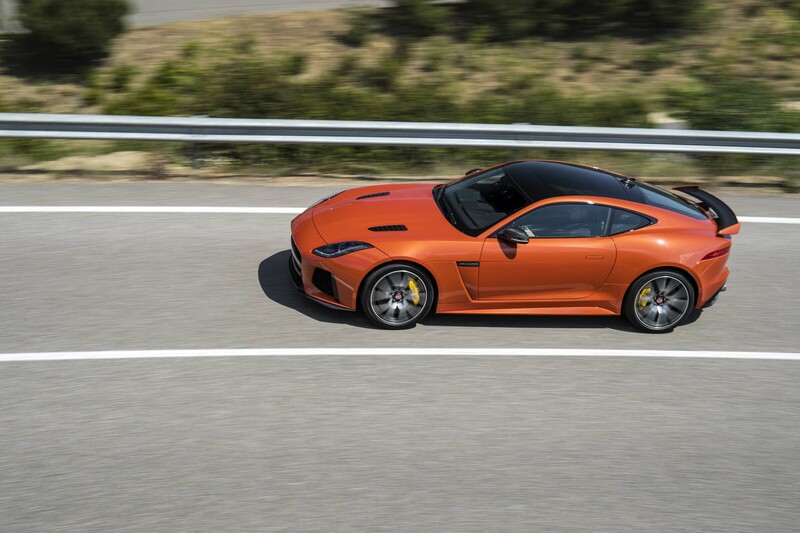 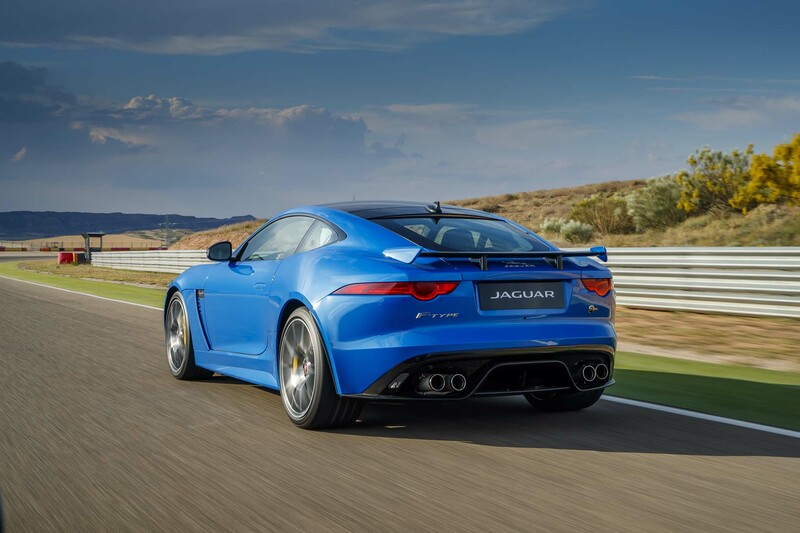 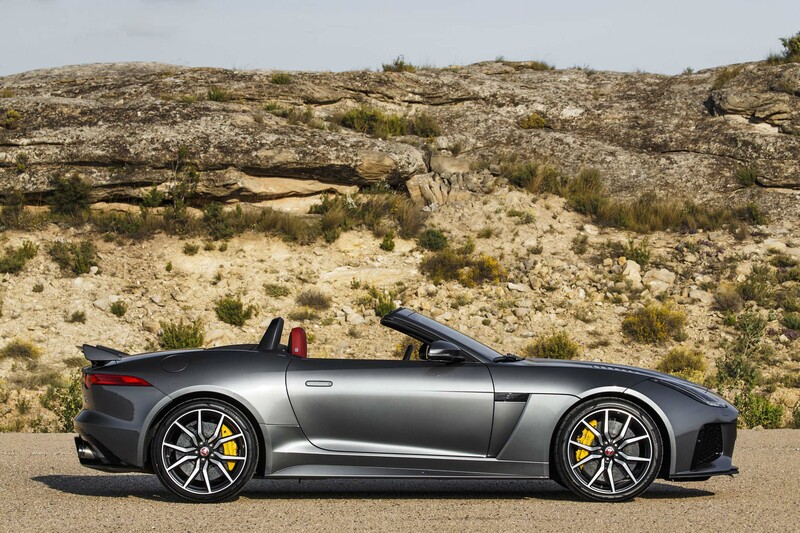 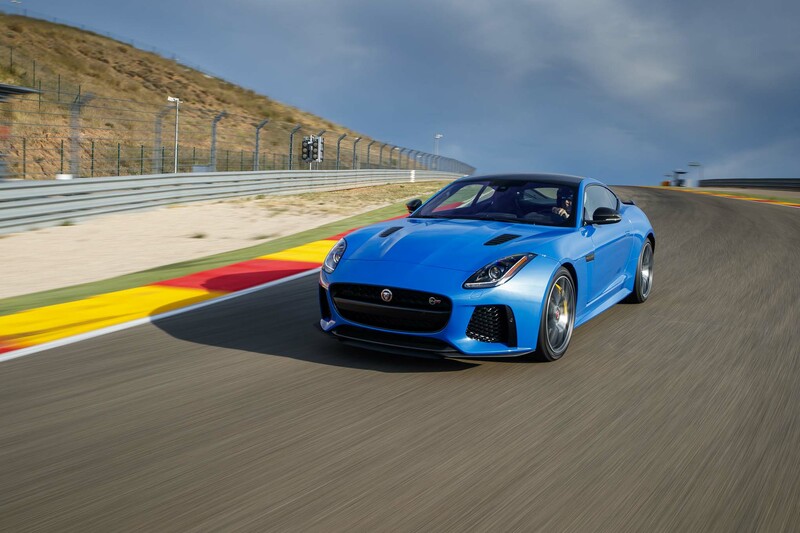 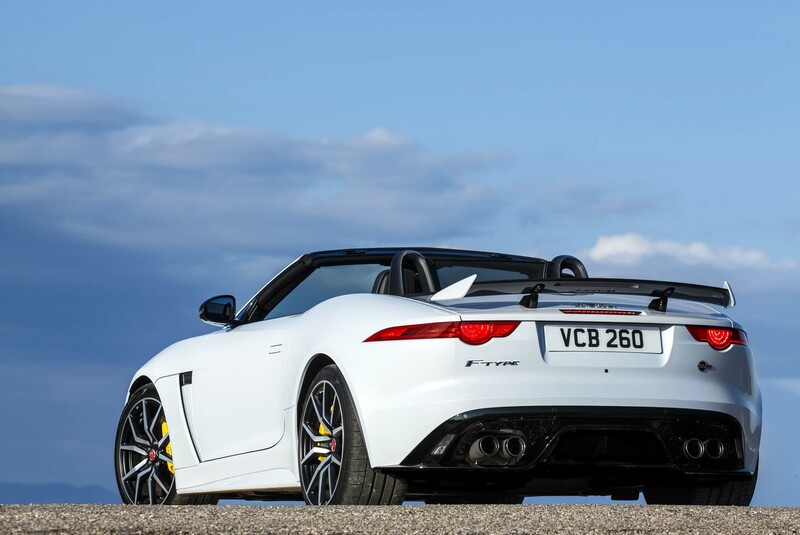 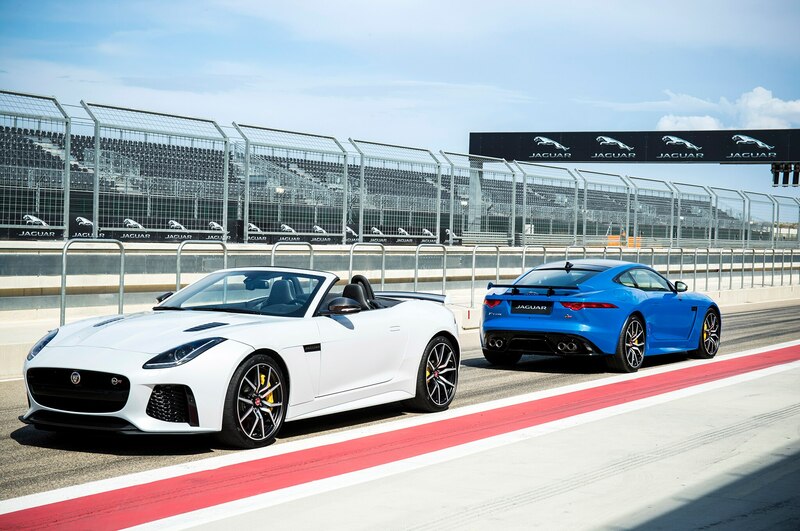 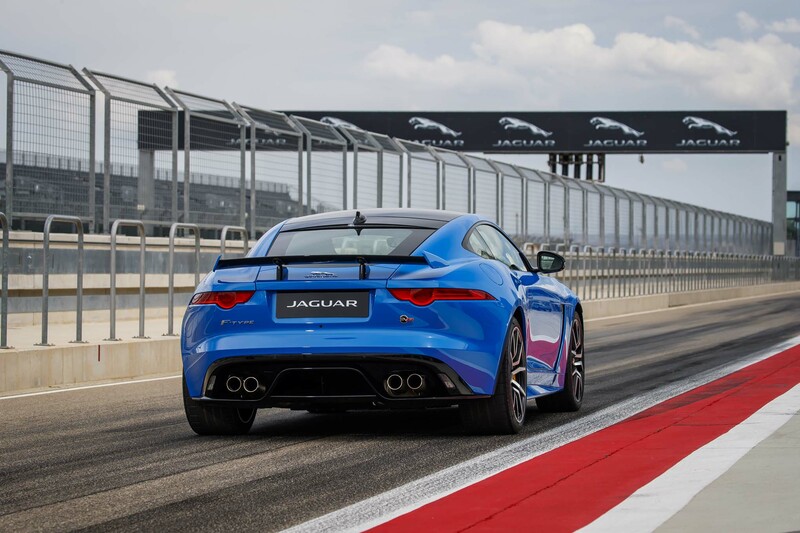 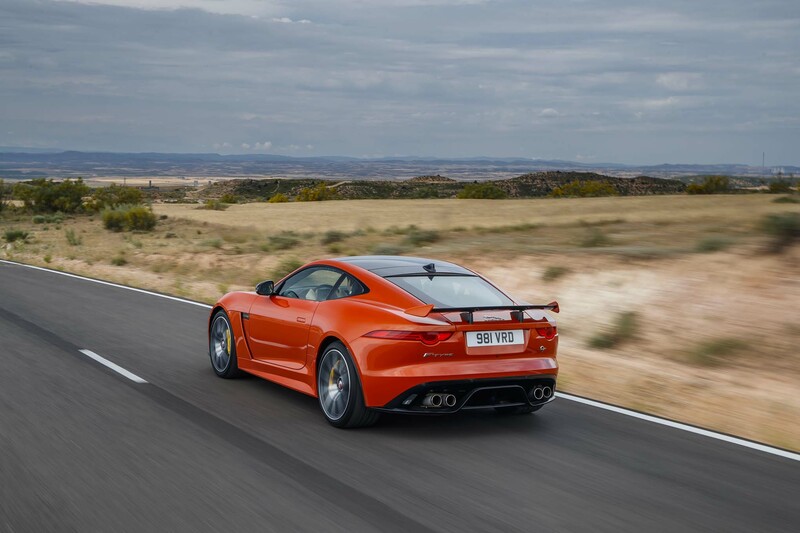 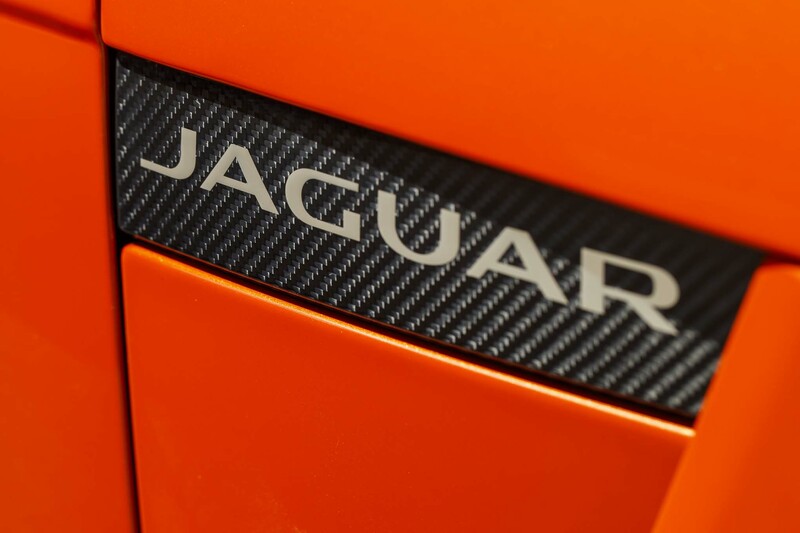 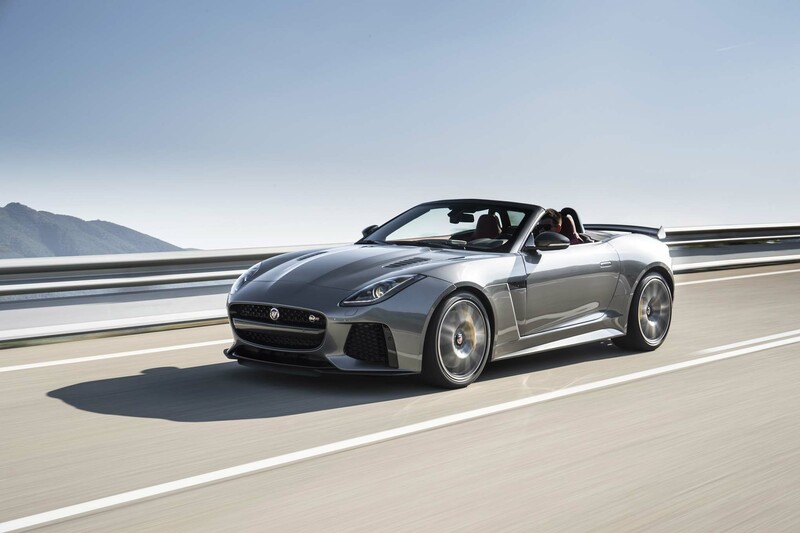 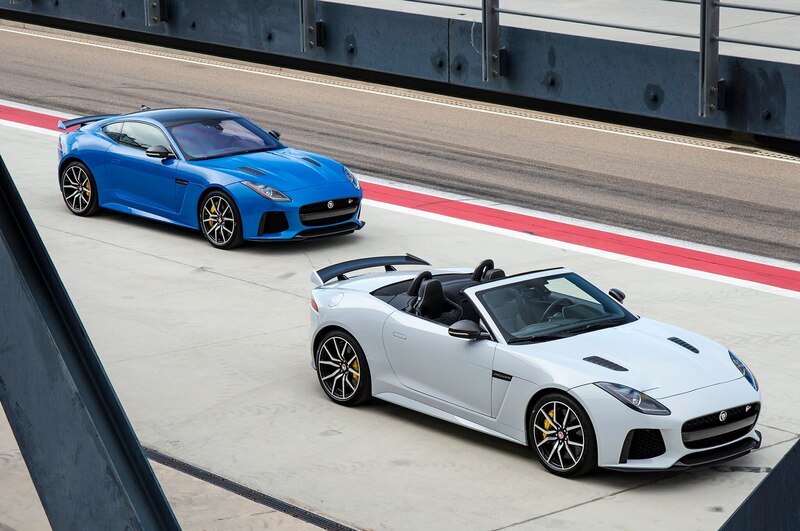 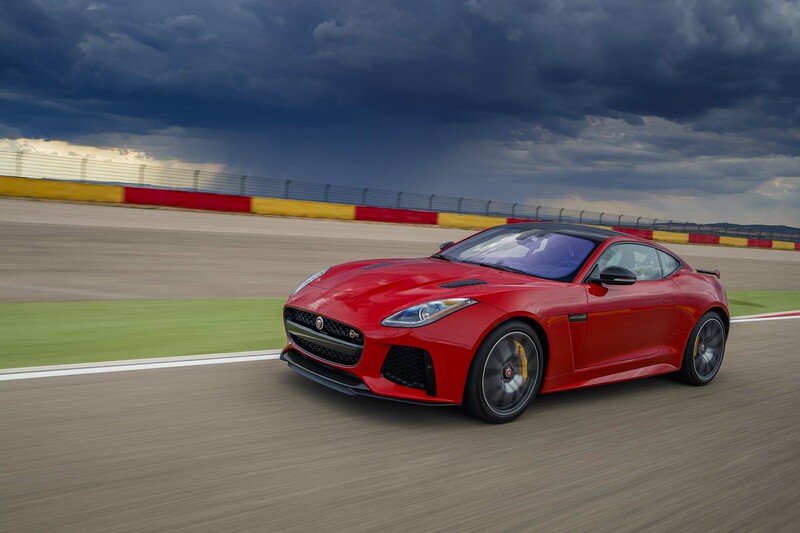 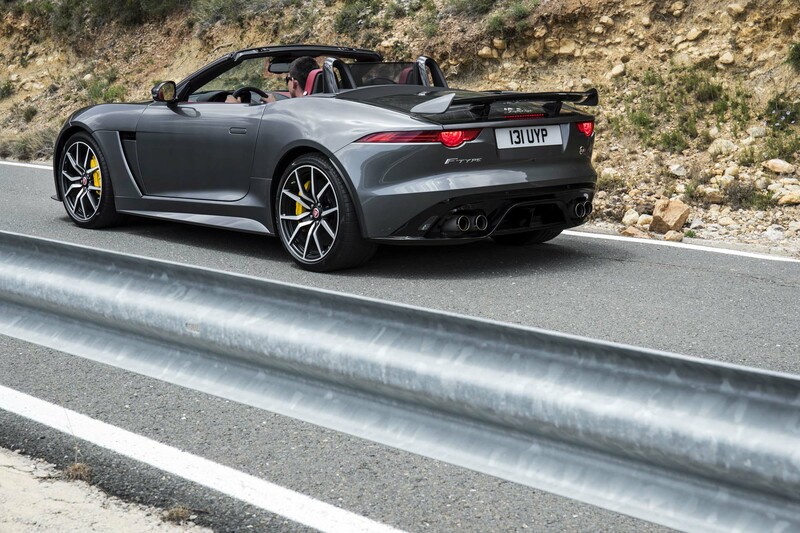 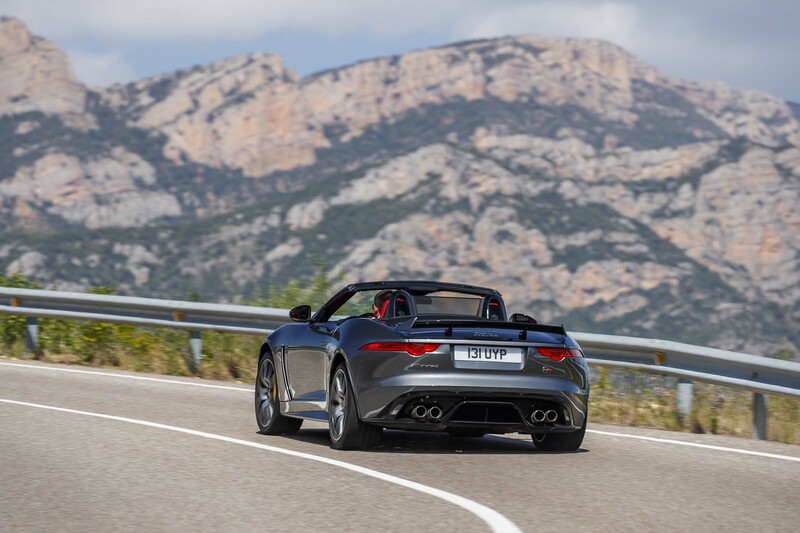 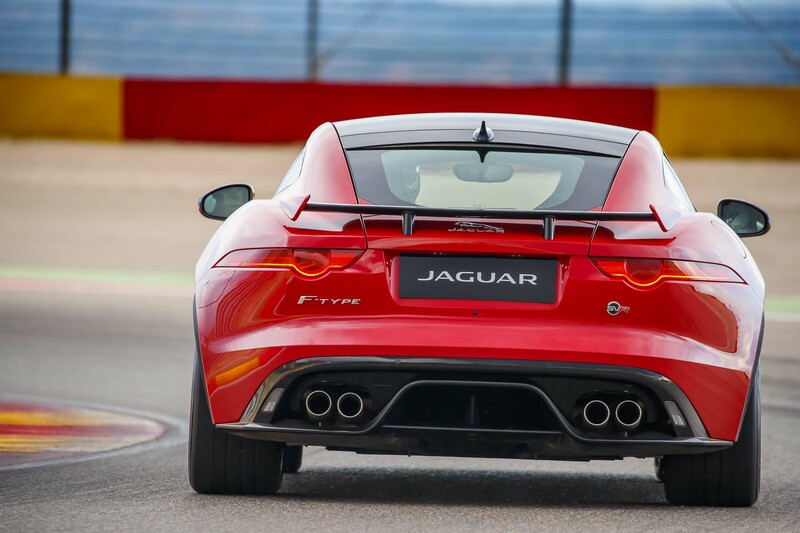 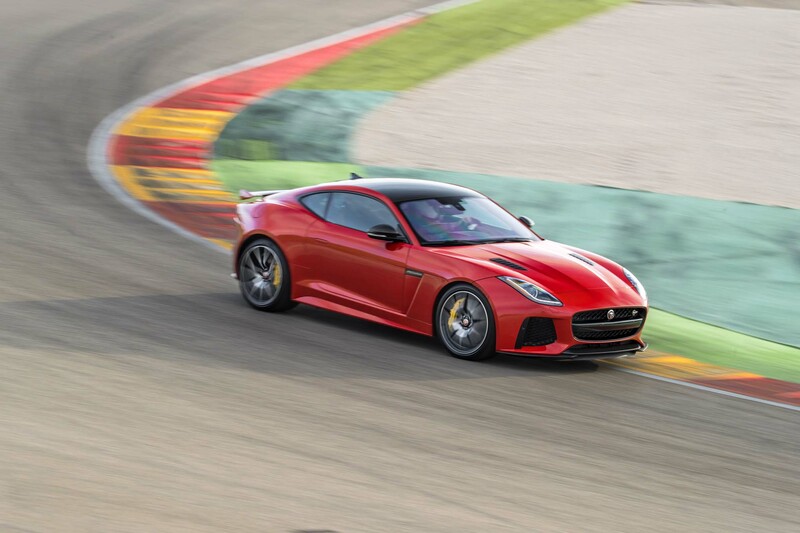 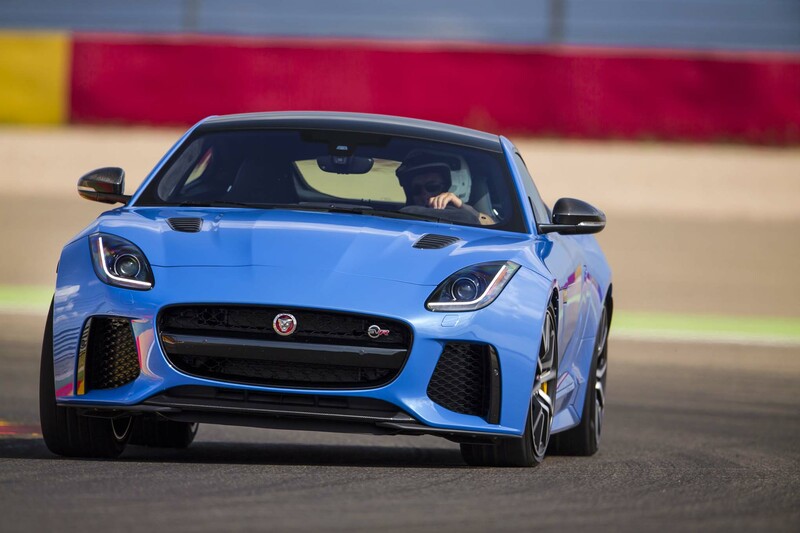 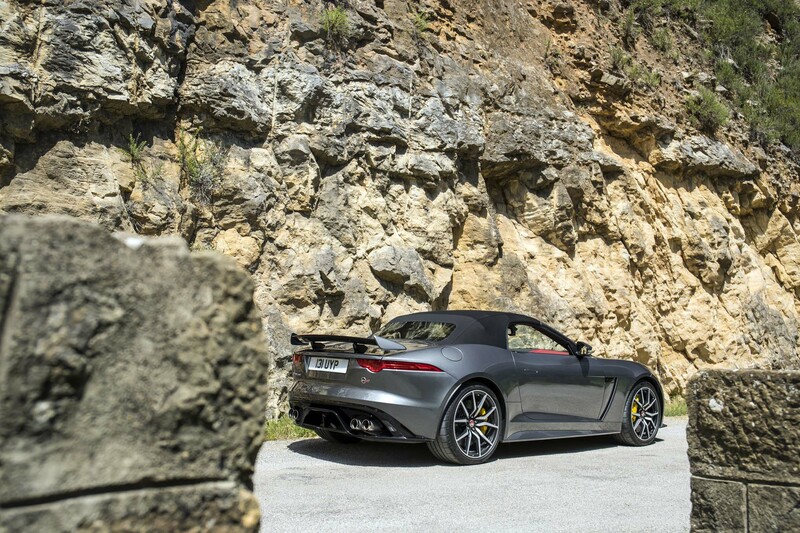 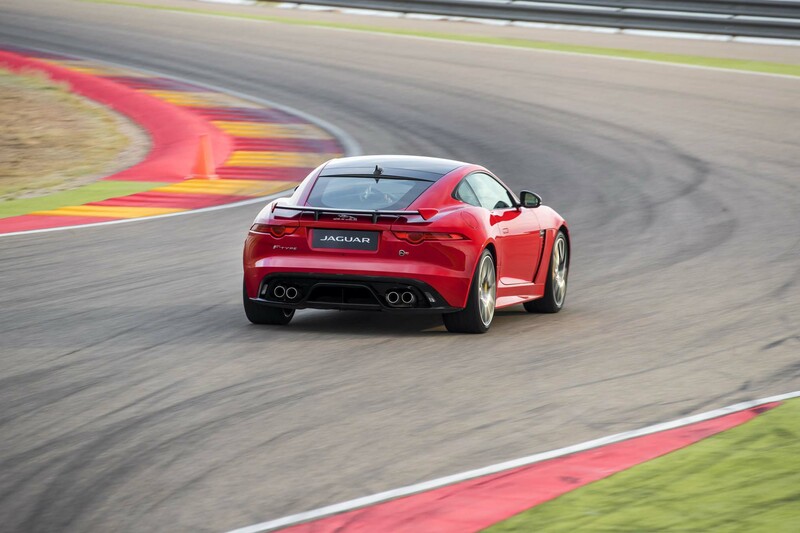 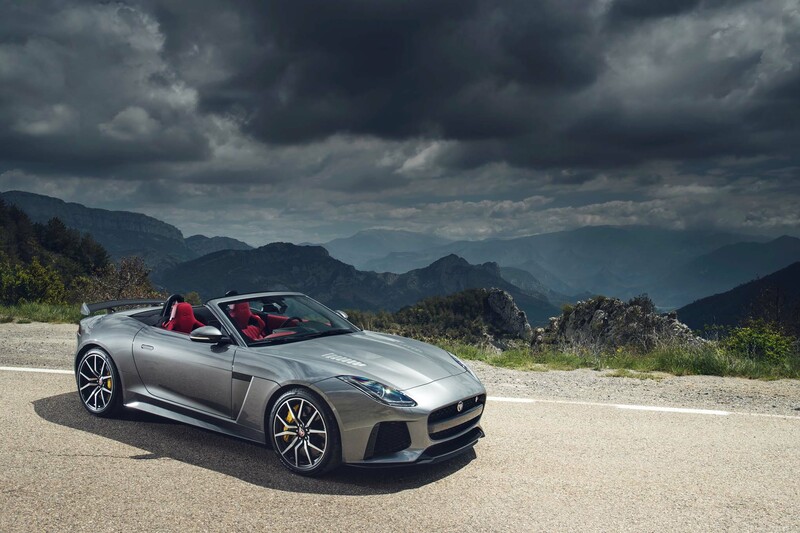 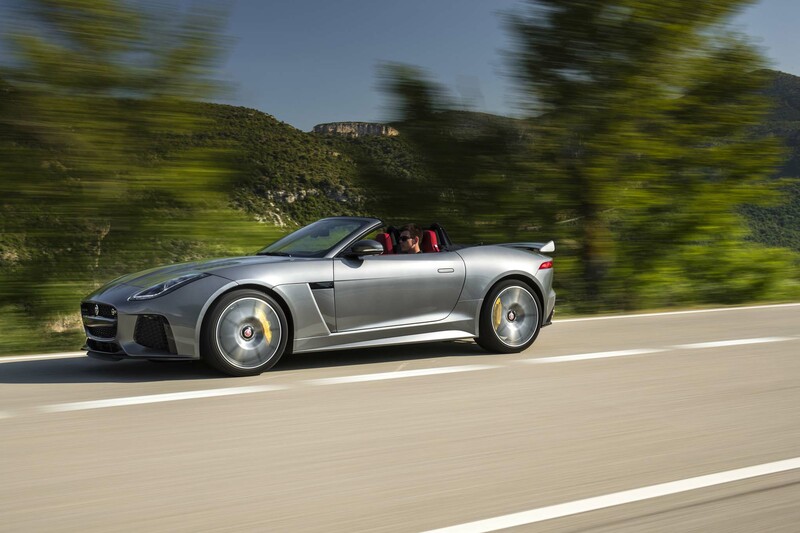 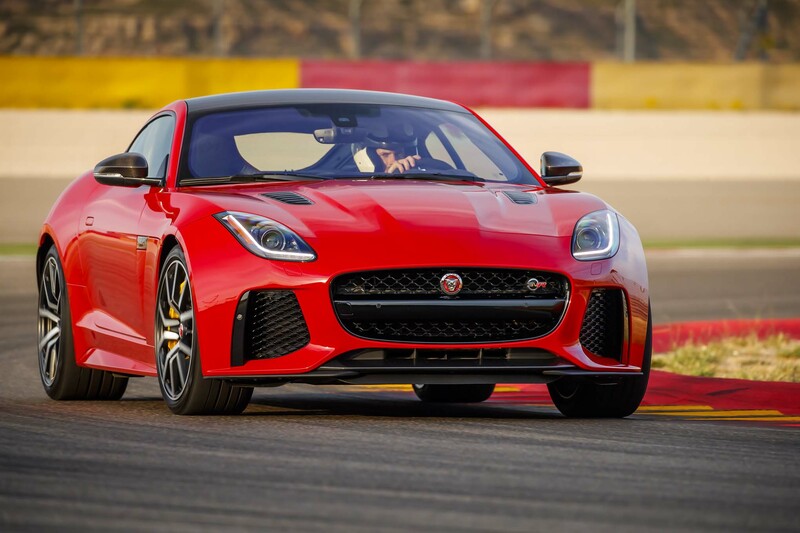 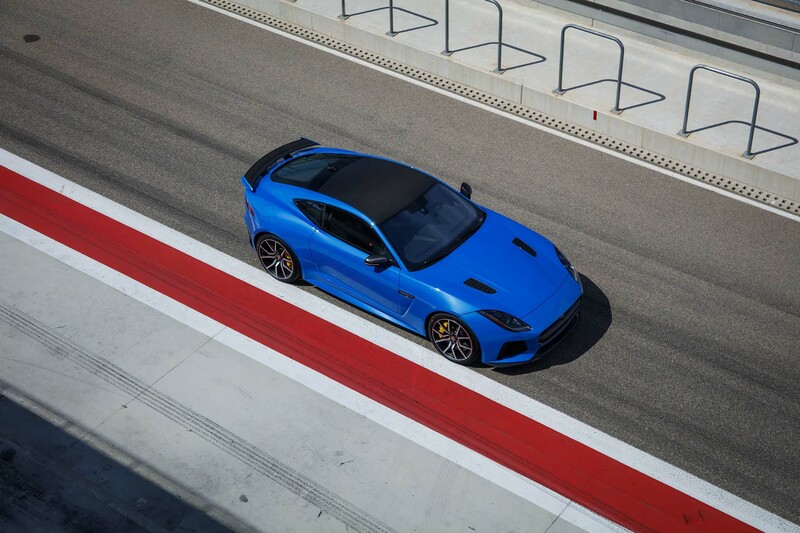 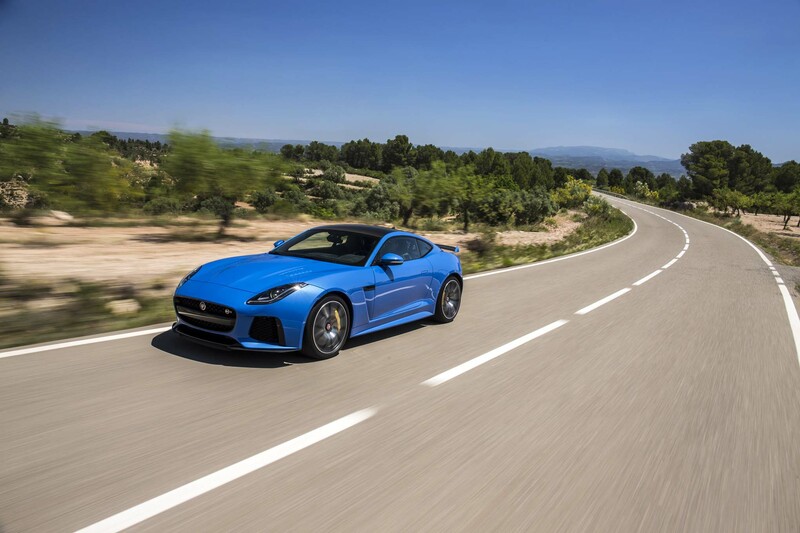 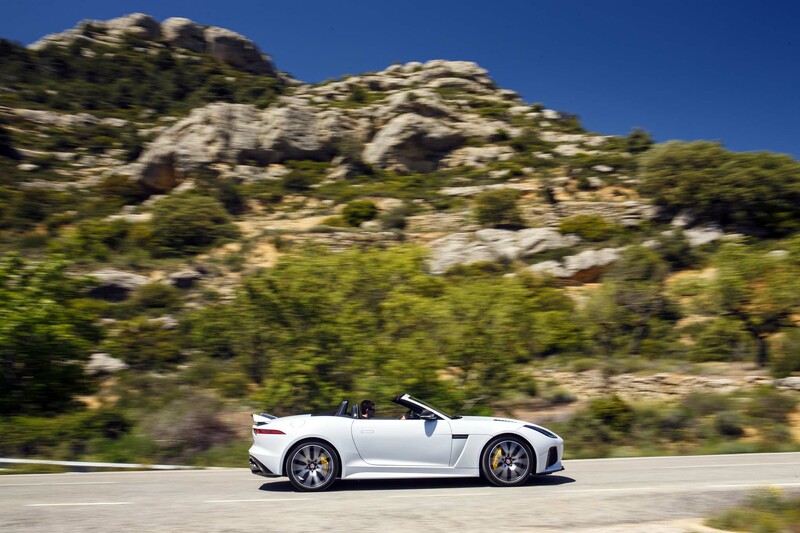 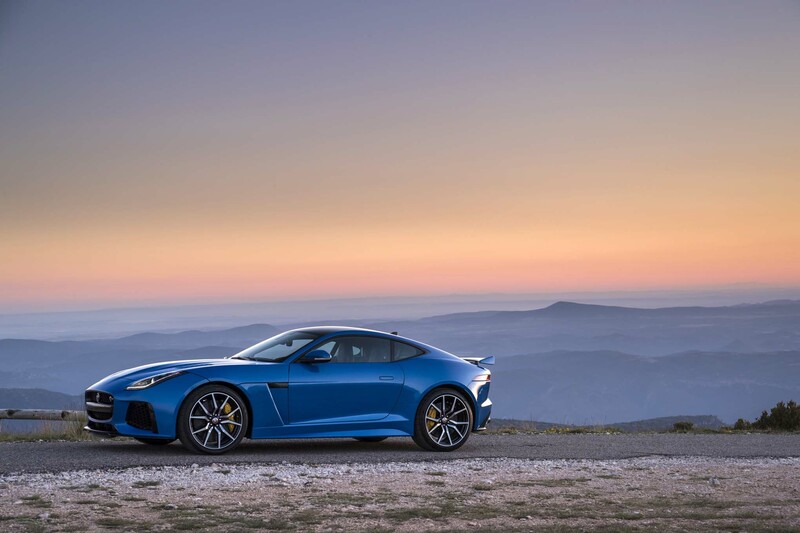 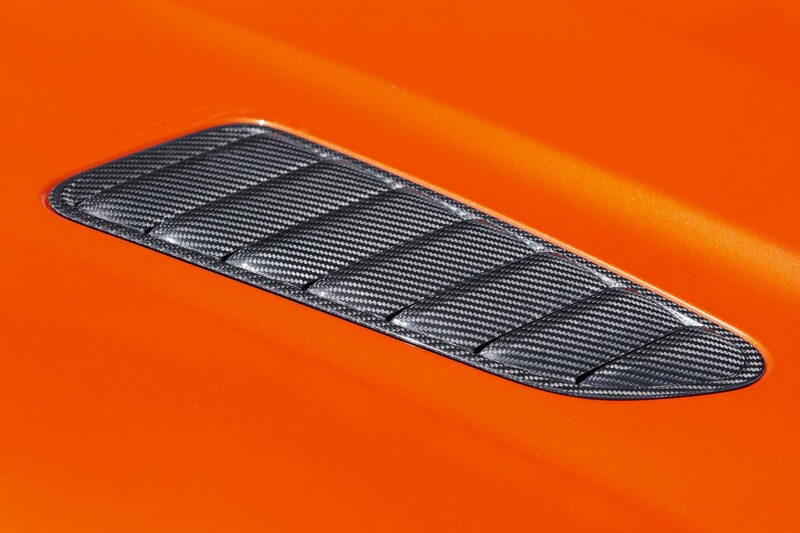 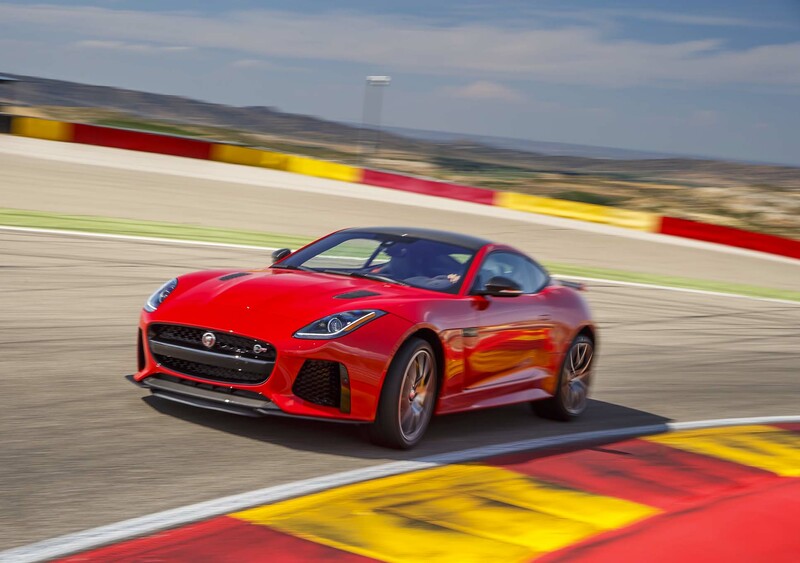 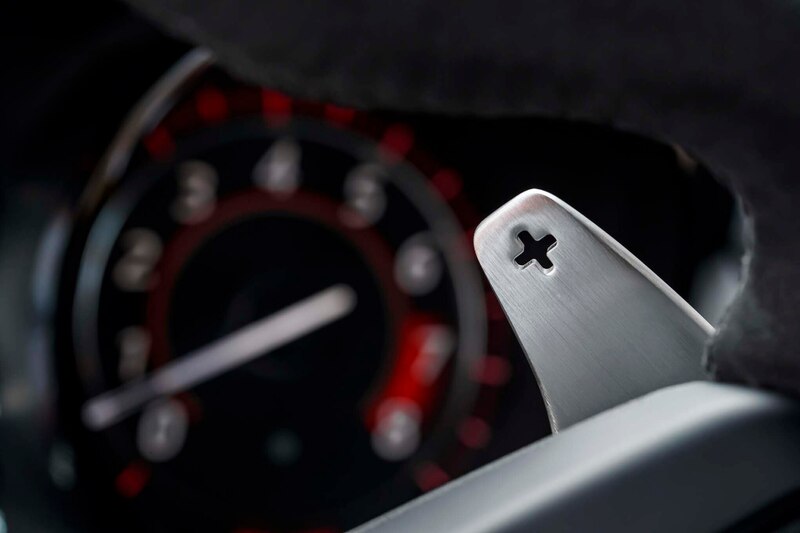 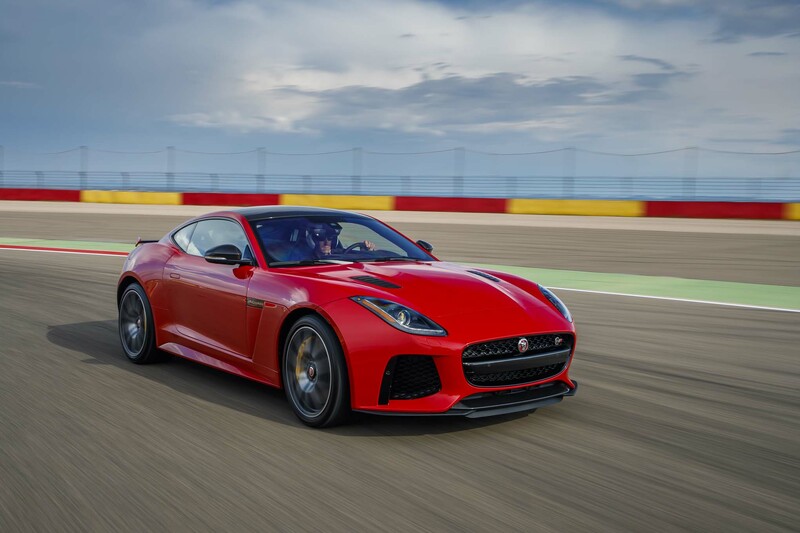 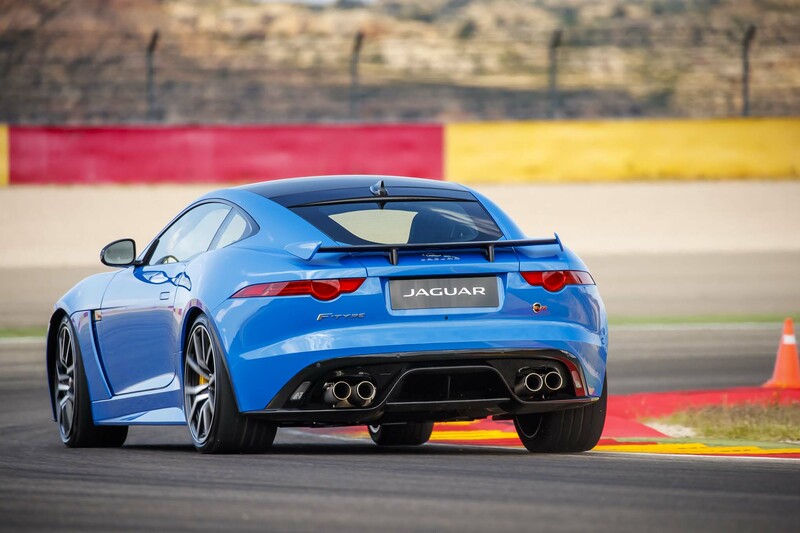 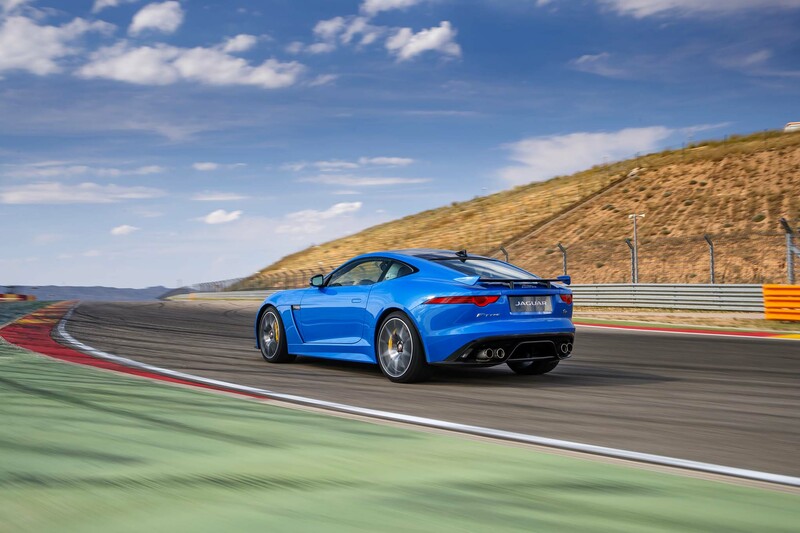 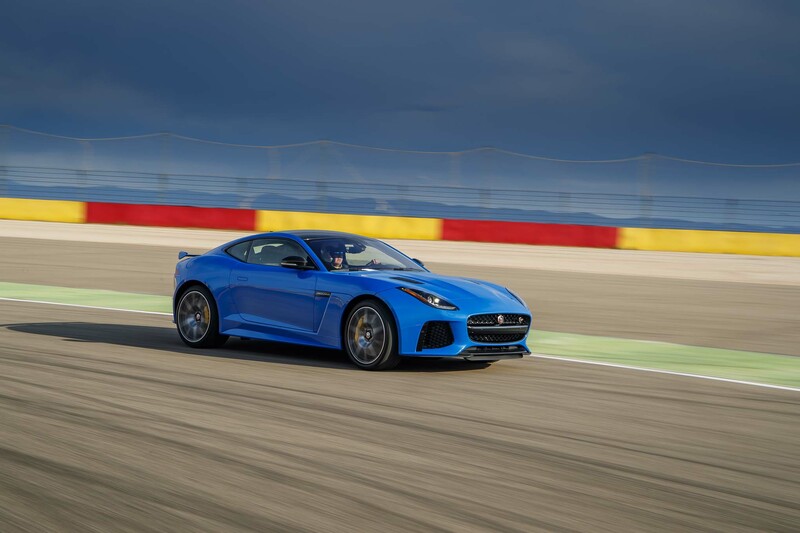 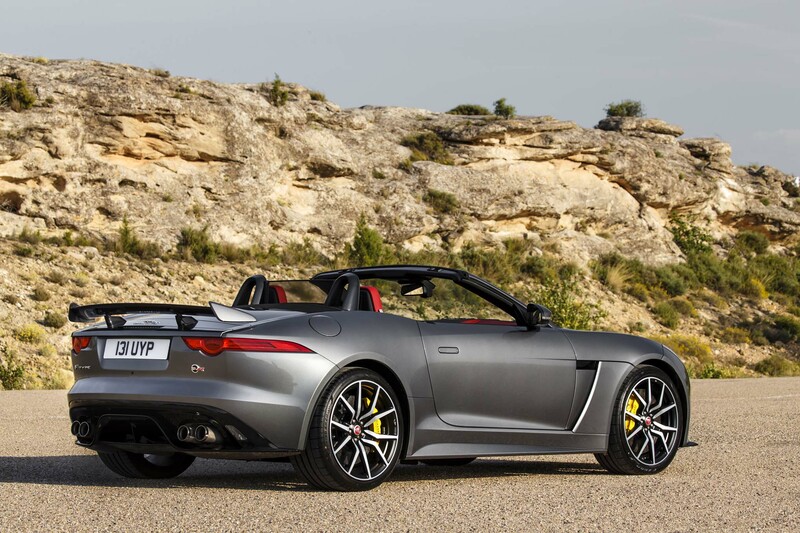 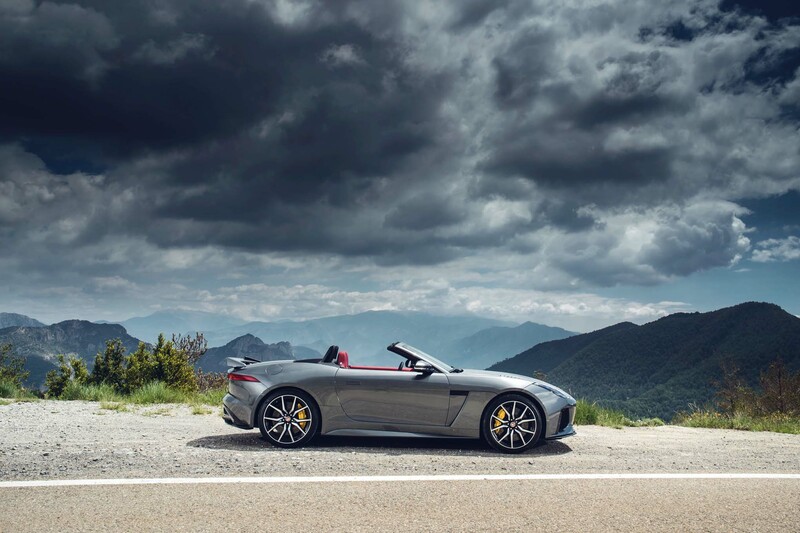 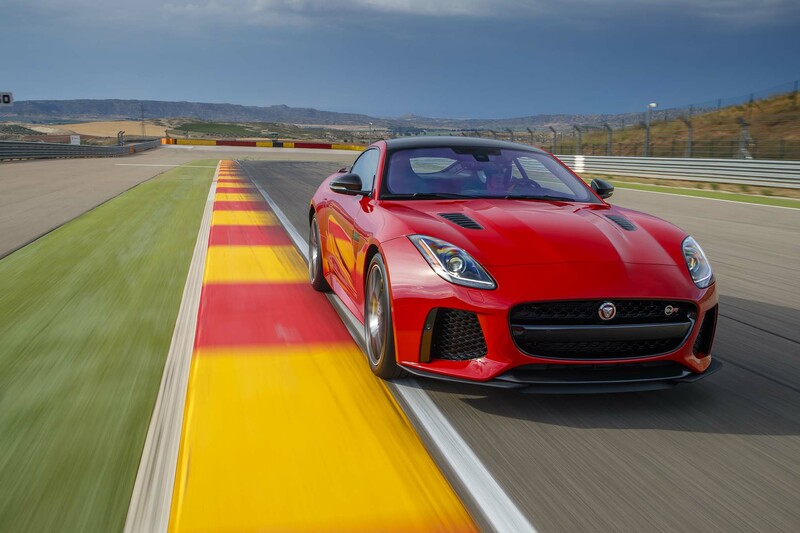 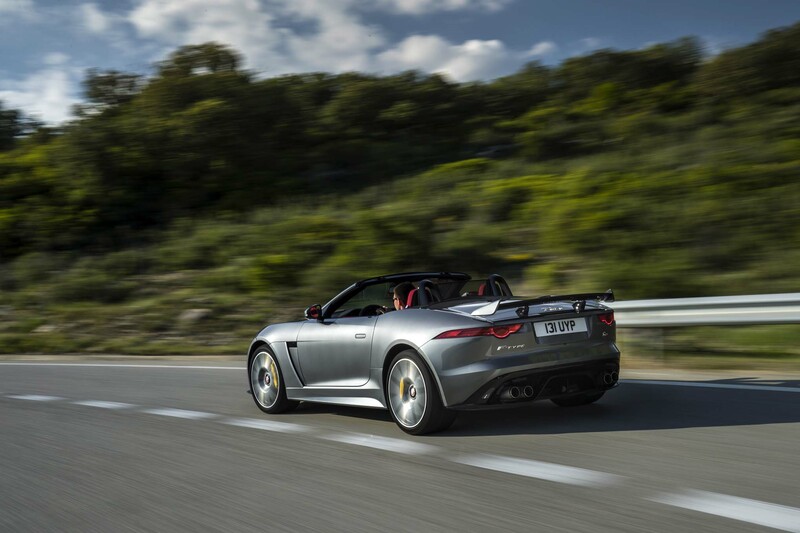 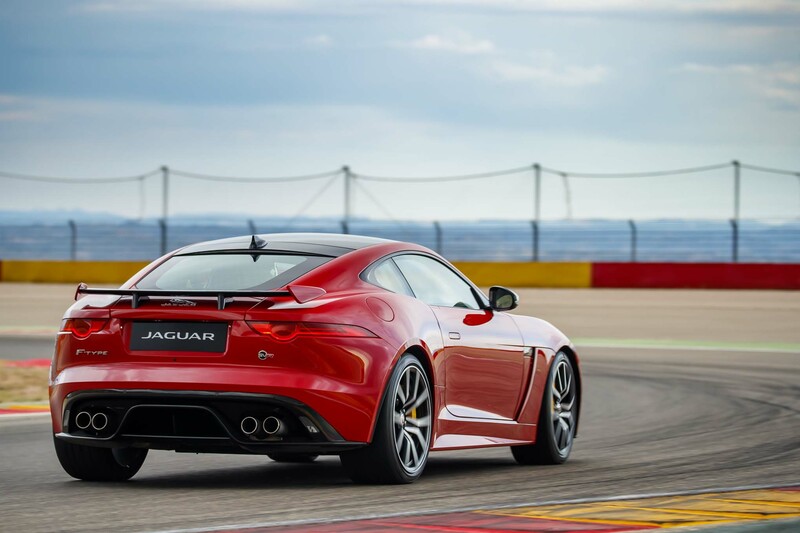 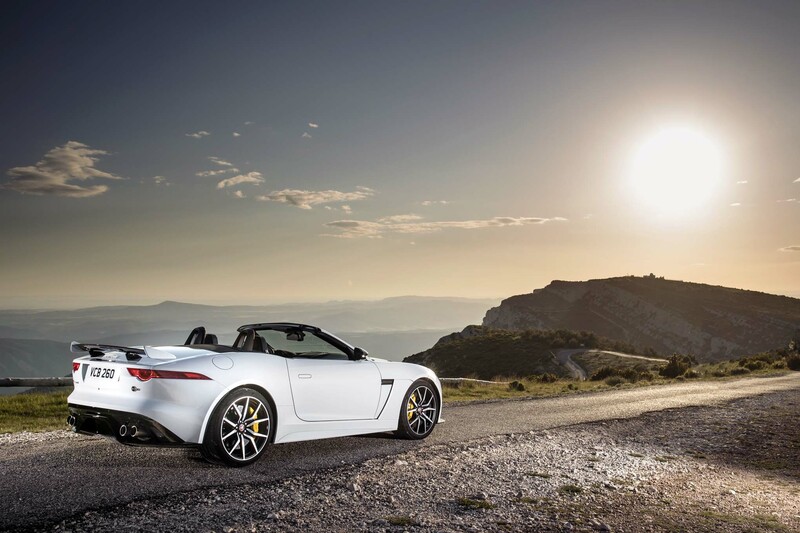 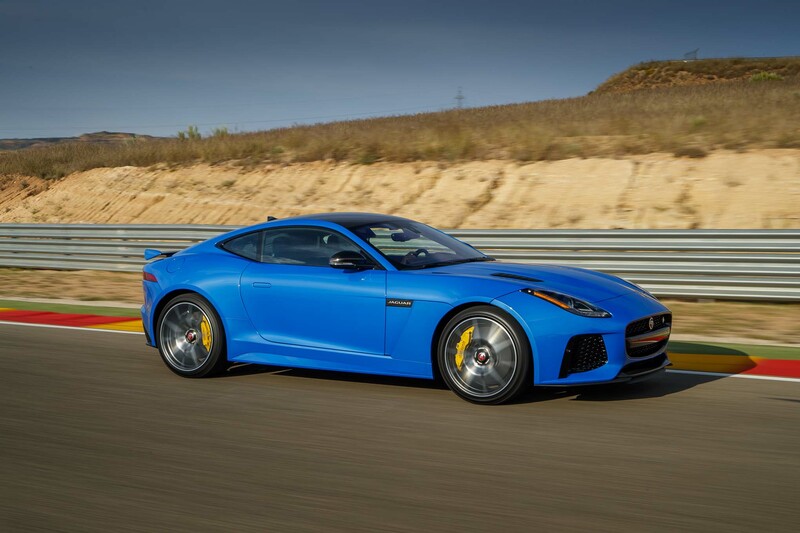 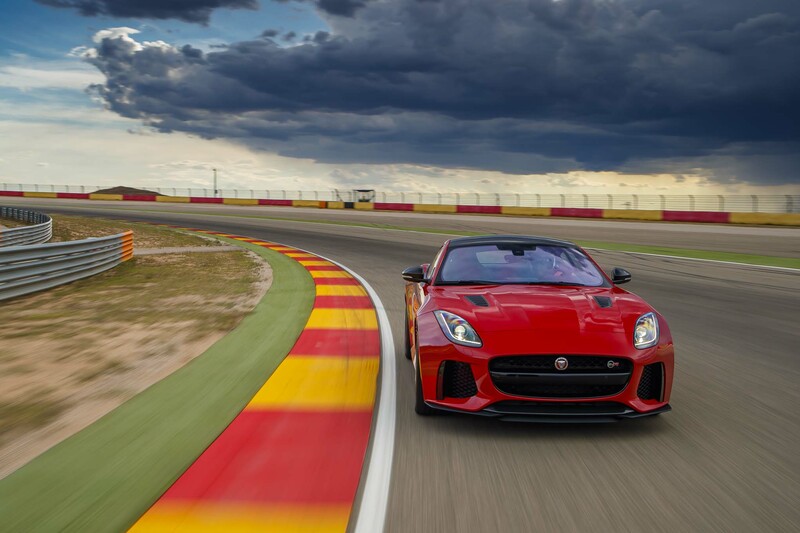 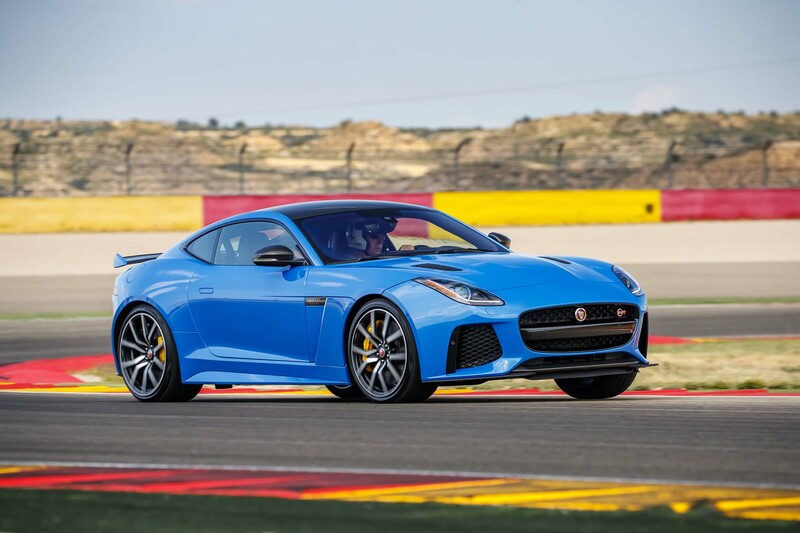 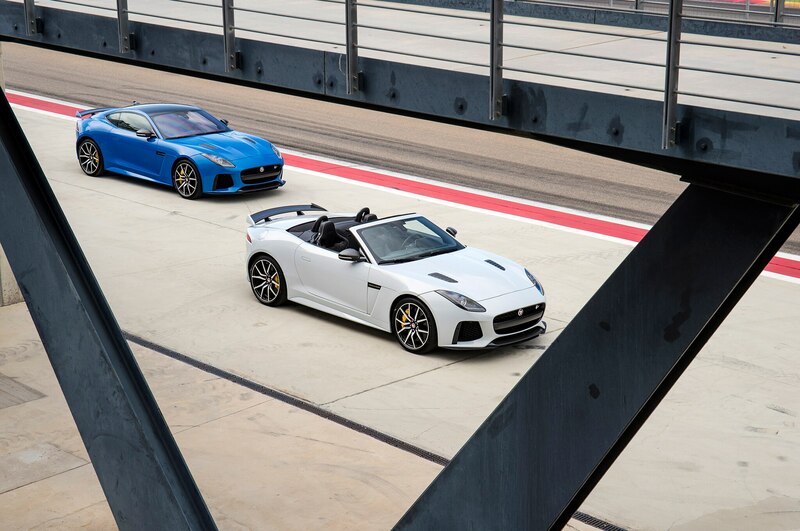 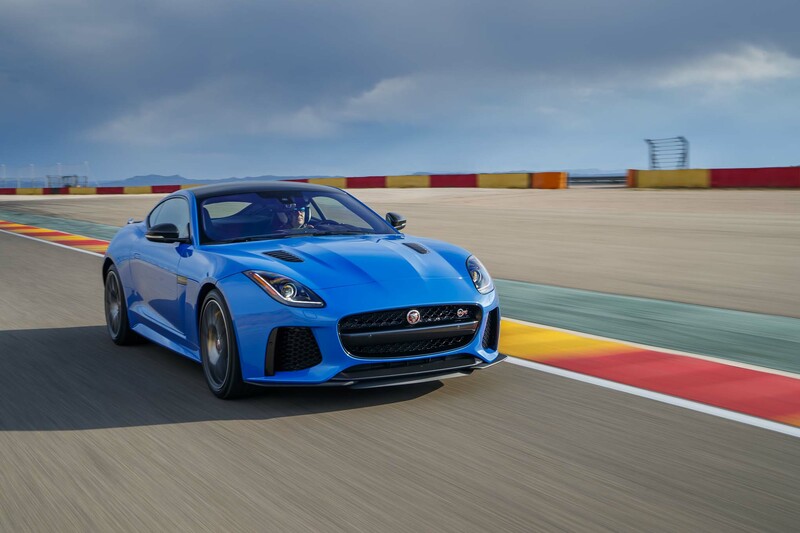 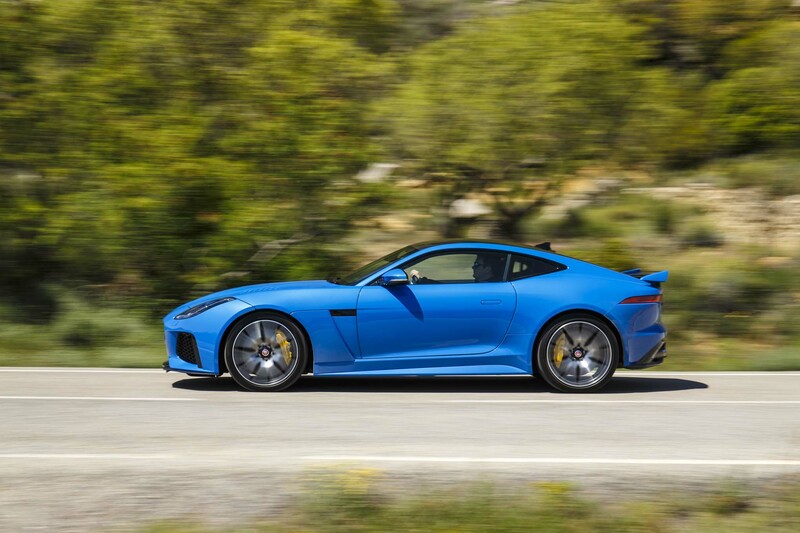 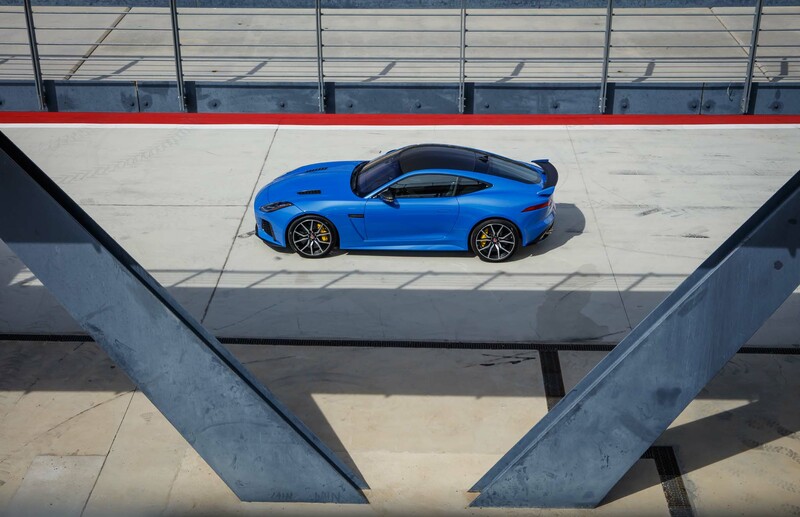 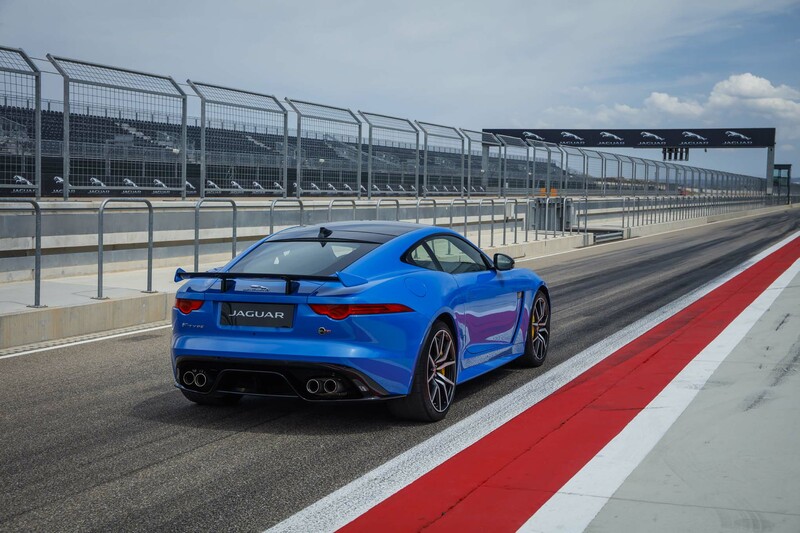 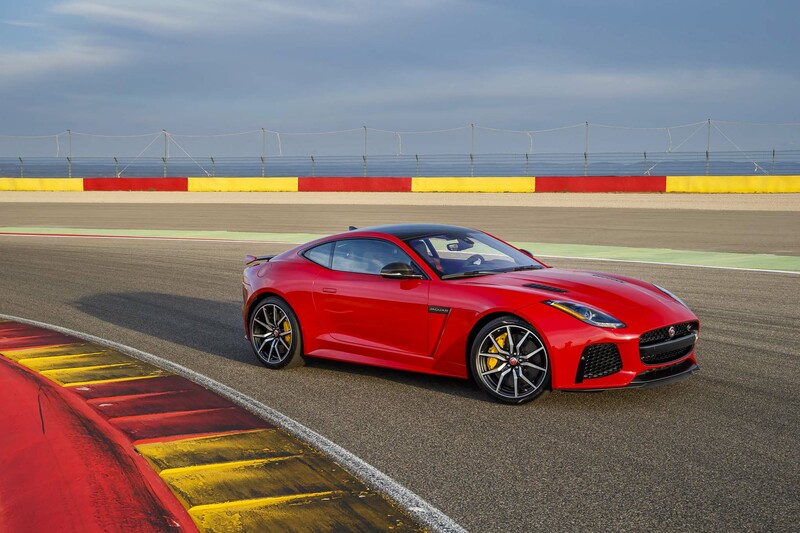 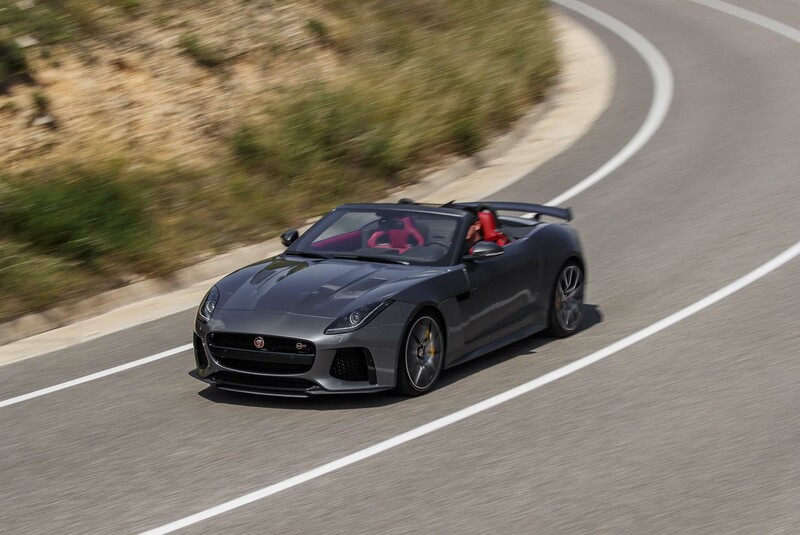 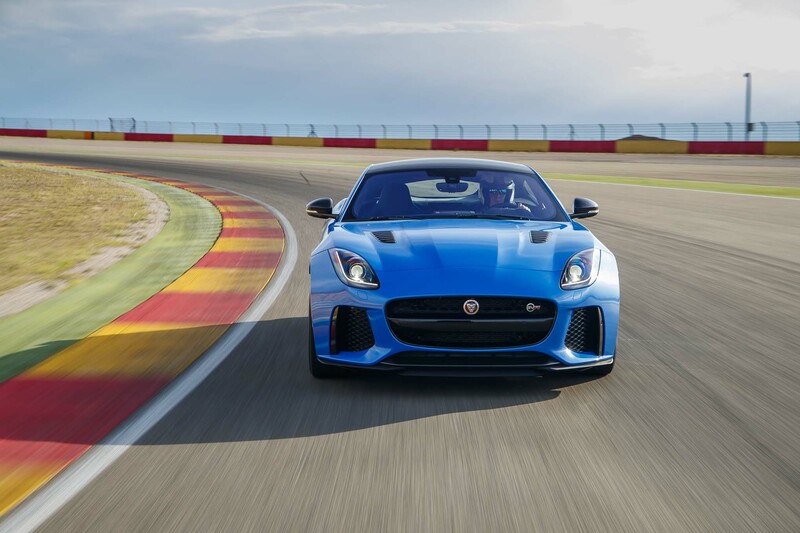 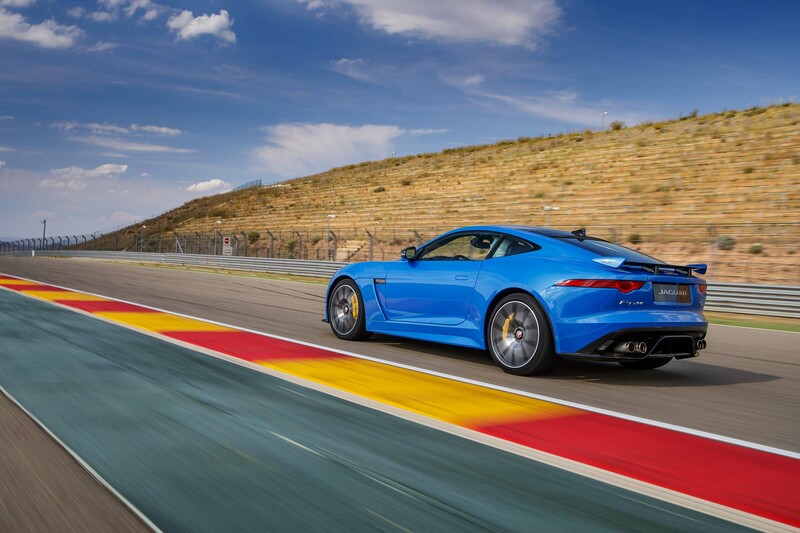 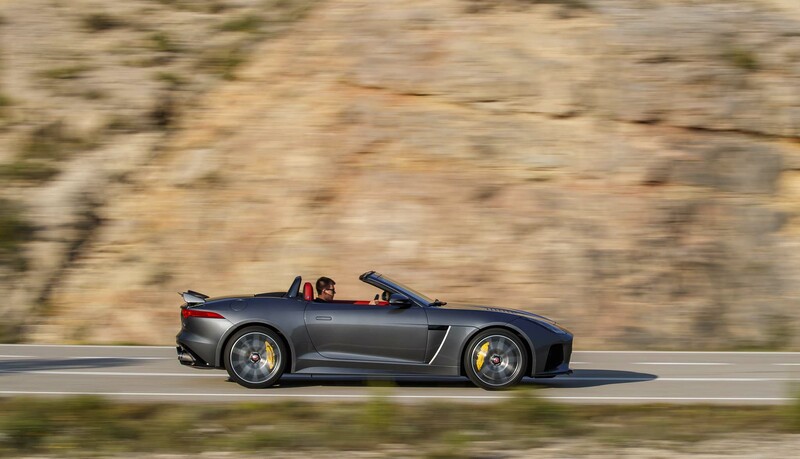 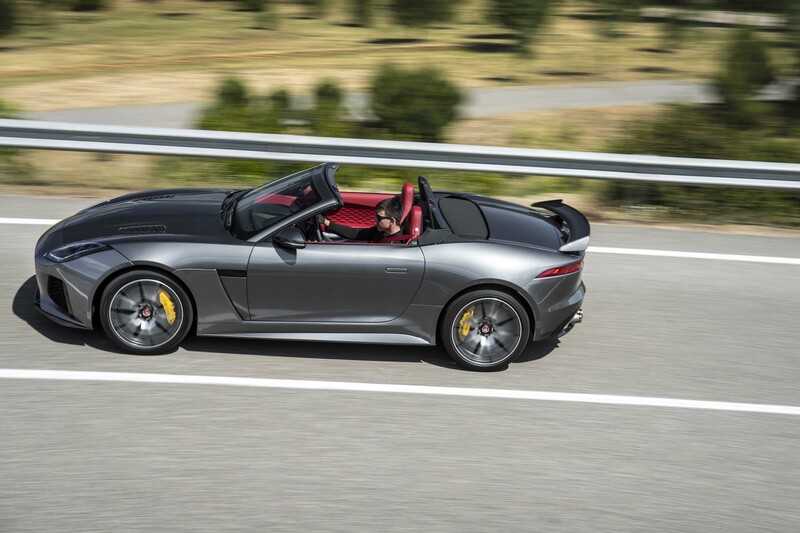 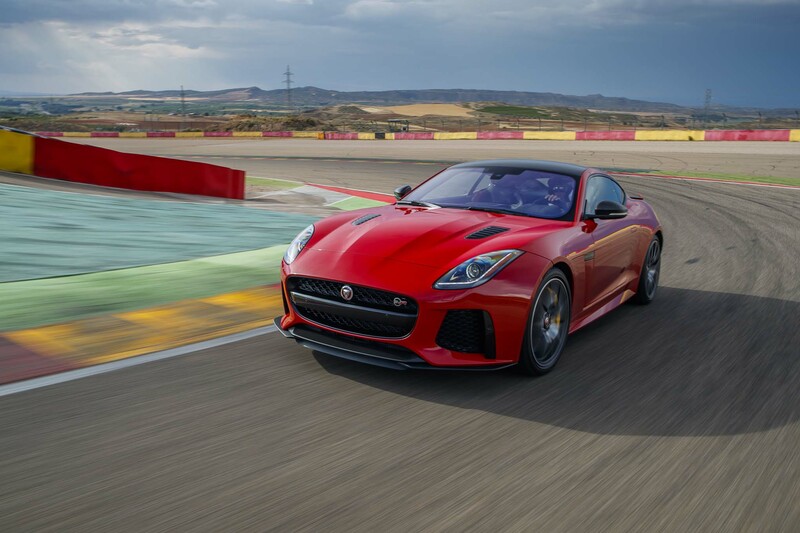 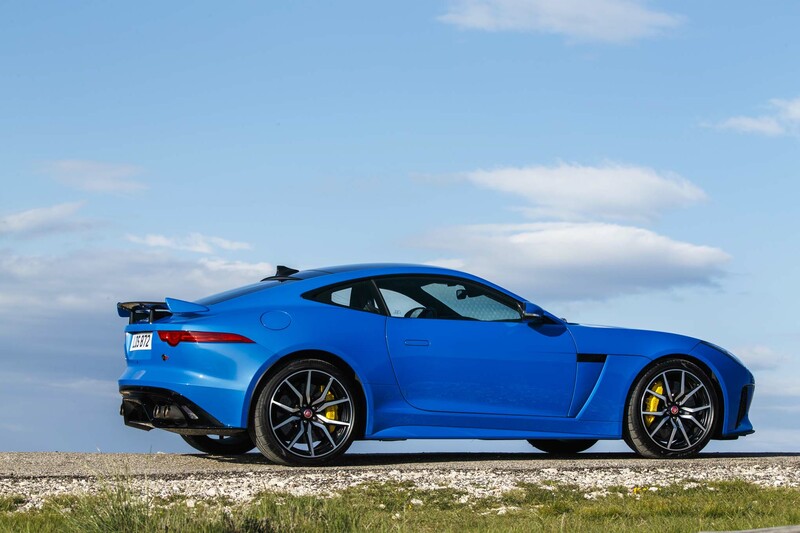 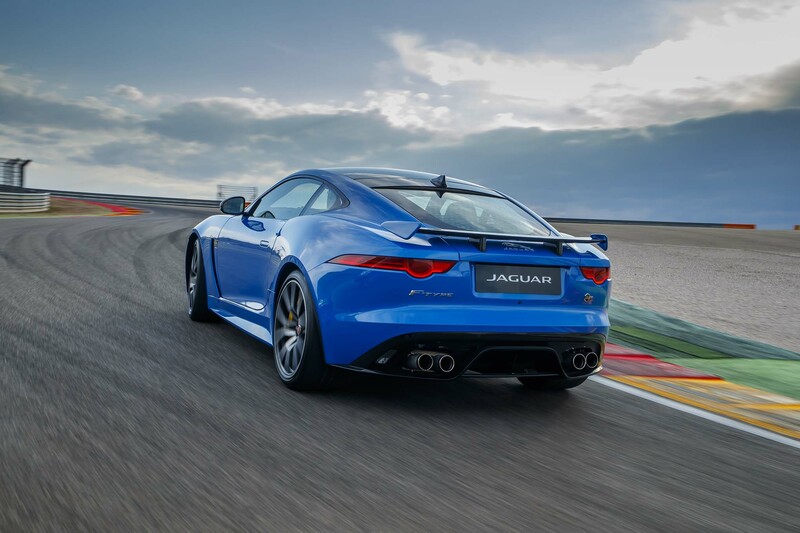 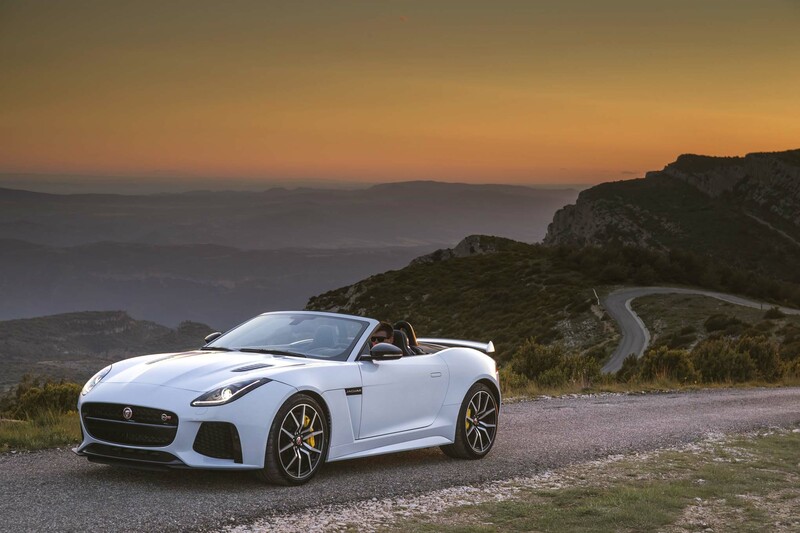 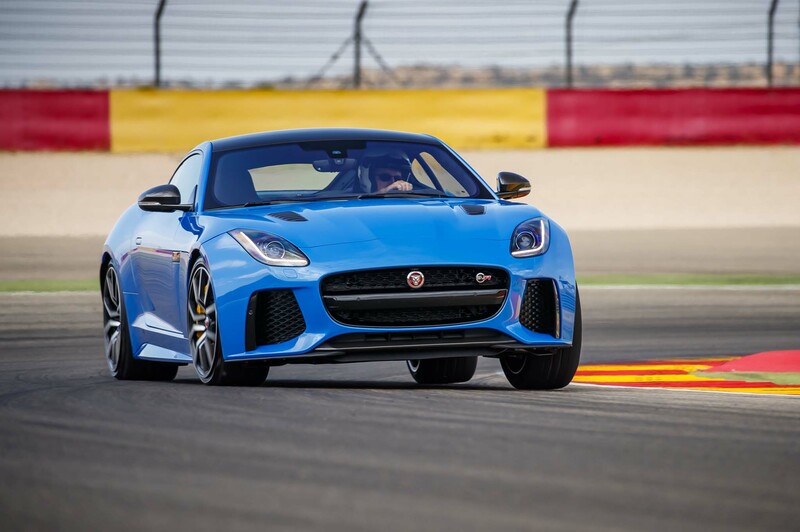 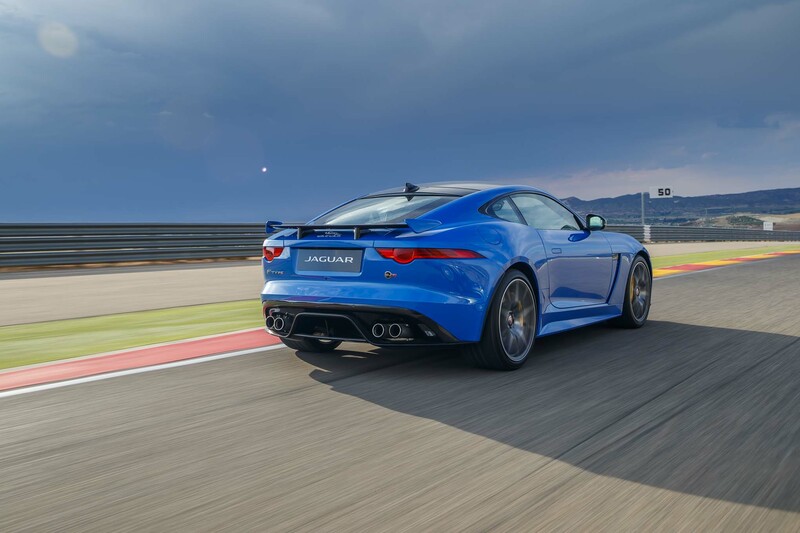 The official number is a substantial 0.4-second improvement over the R.
Our first taste of the SVR began at 8 a.m. with a 110-mile drive in the convertible to end at the MotorLand Aragon racetrack facility. 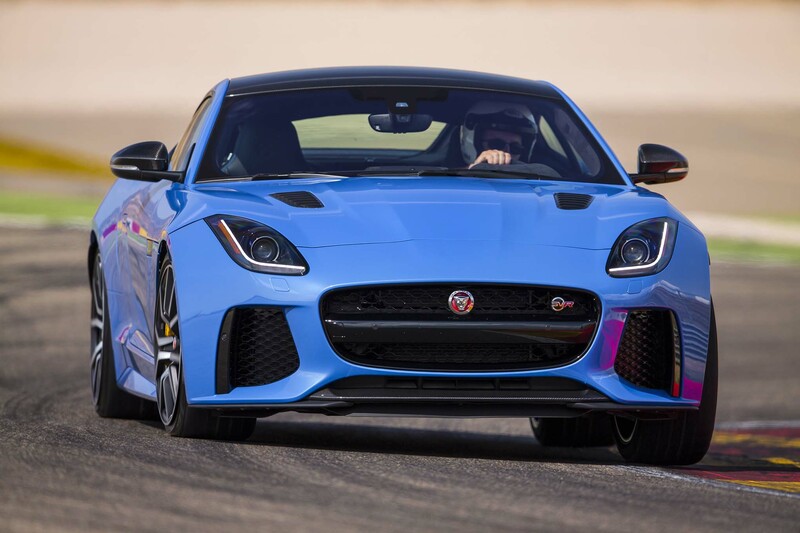 I have many years doing chassis/suspension-, tire-, and shock-development work on both production and race cars for many manufacturers. 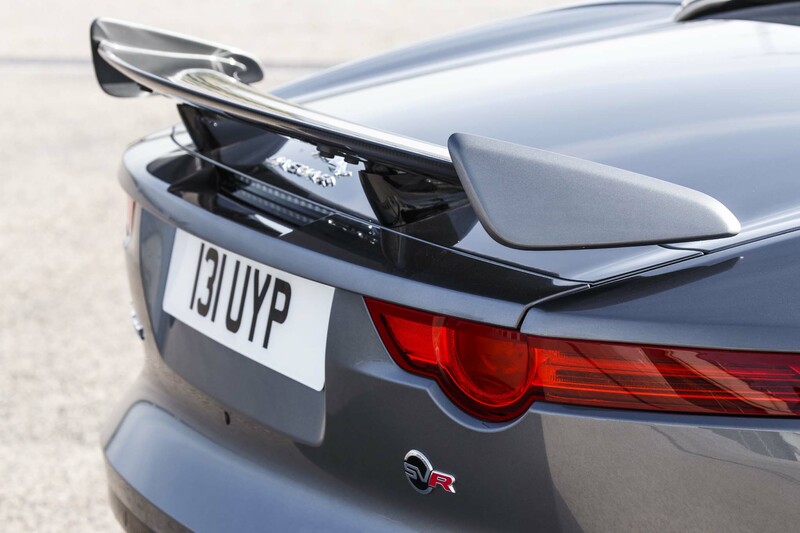 The upshot is, this has given me a keen interest and understanding of vehicle dynamics, both aerodynamic and mechanical. 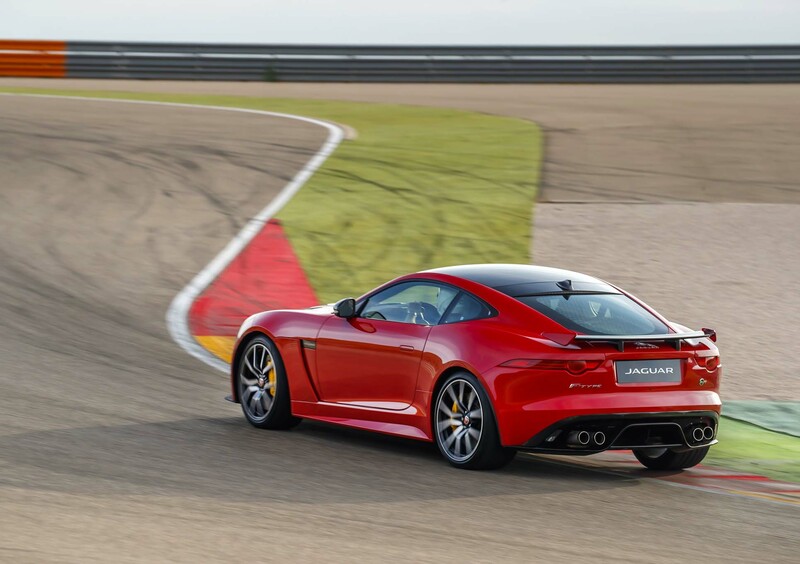 In that context, one point stayed with me from my recent drive in an F-Type R AWD: It was quite reactive and jarring when encountering pavement changes and expansion joints in regular street driving. 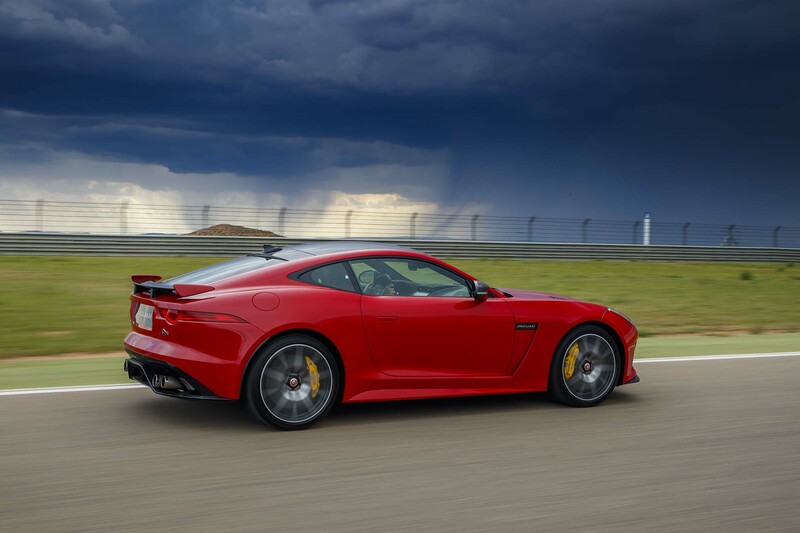 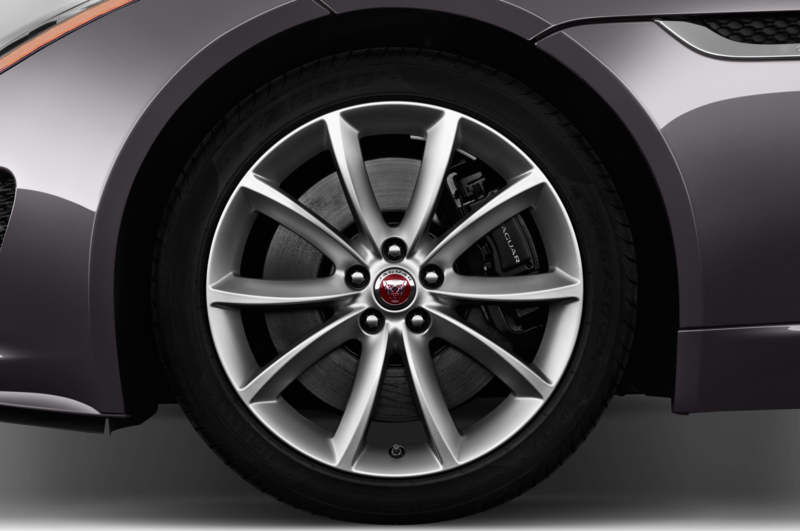 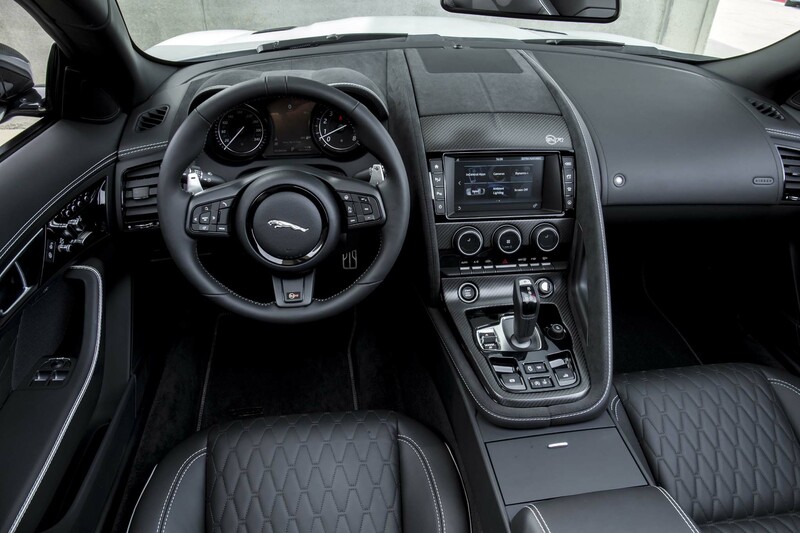 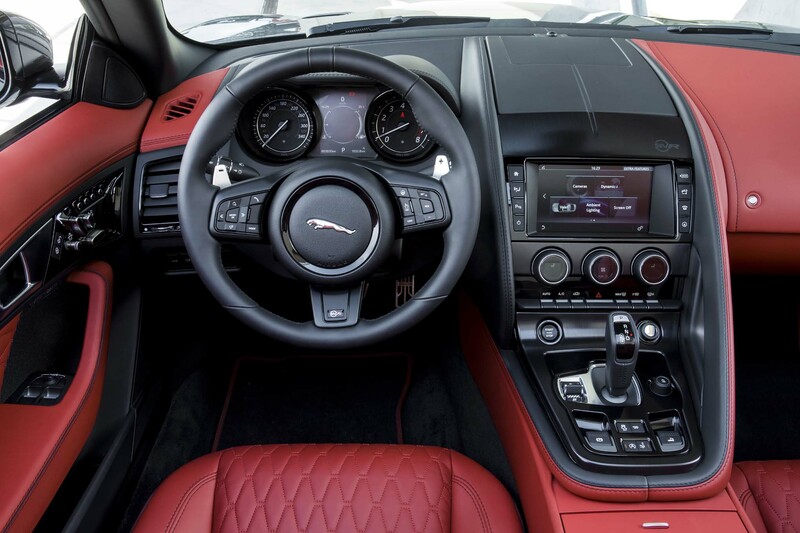 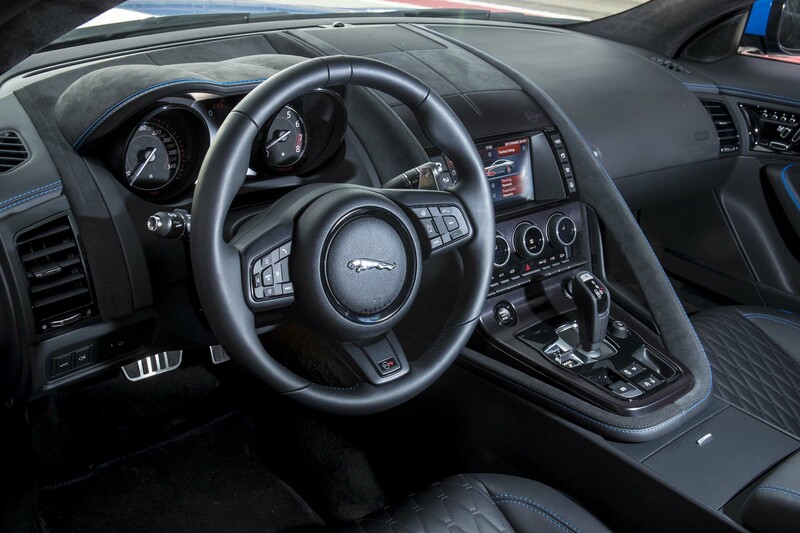 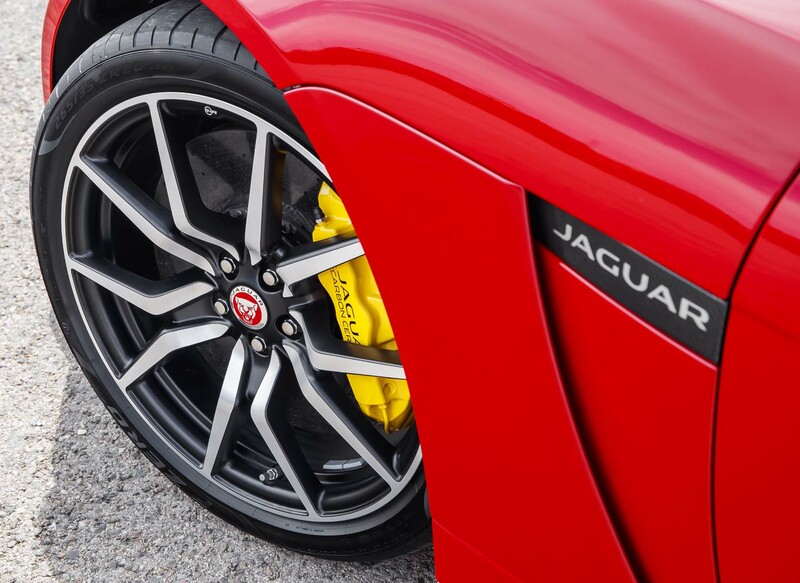 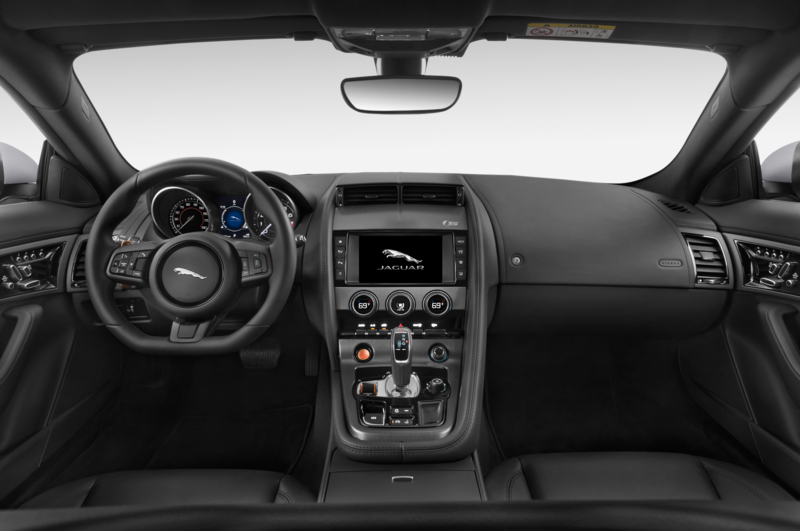 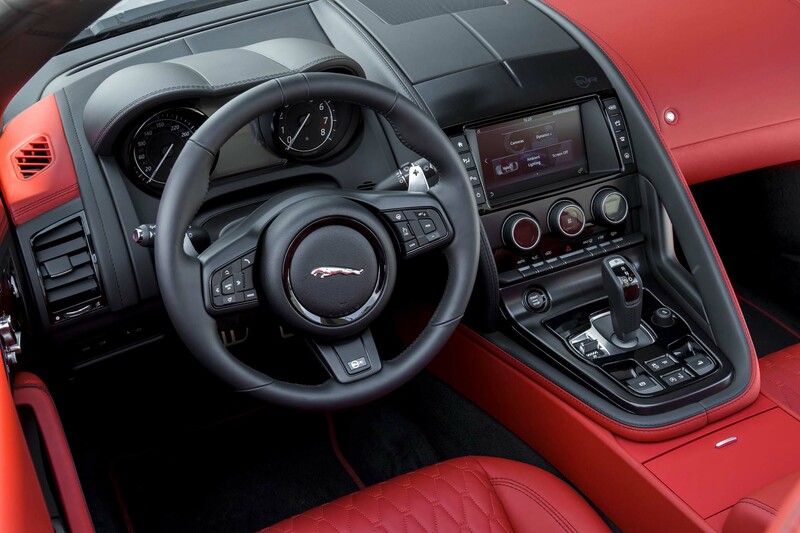 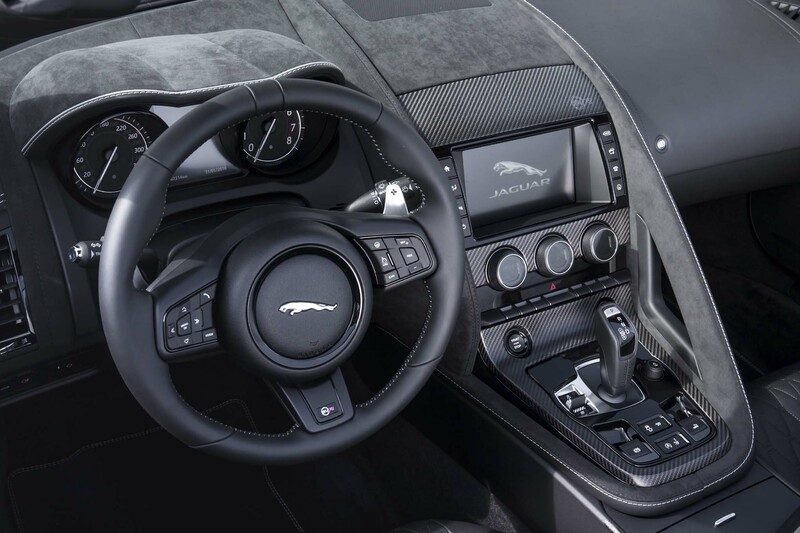 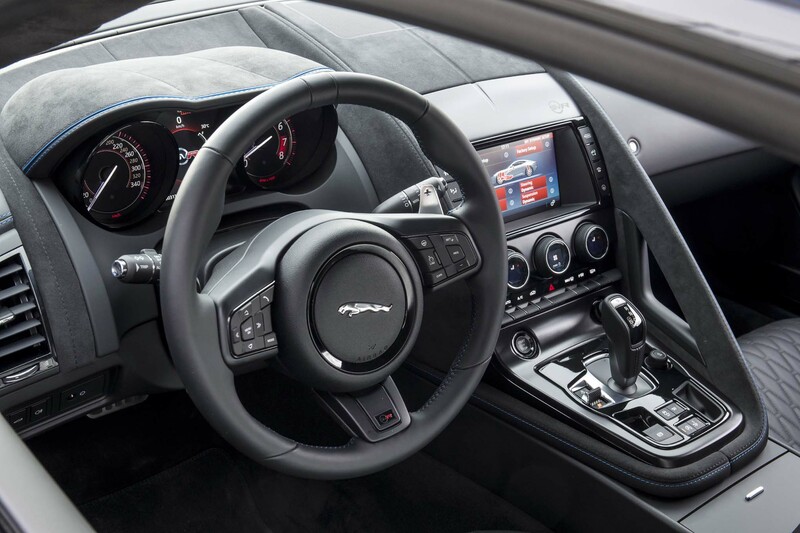 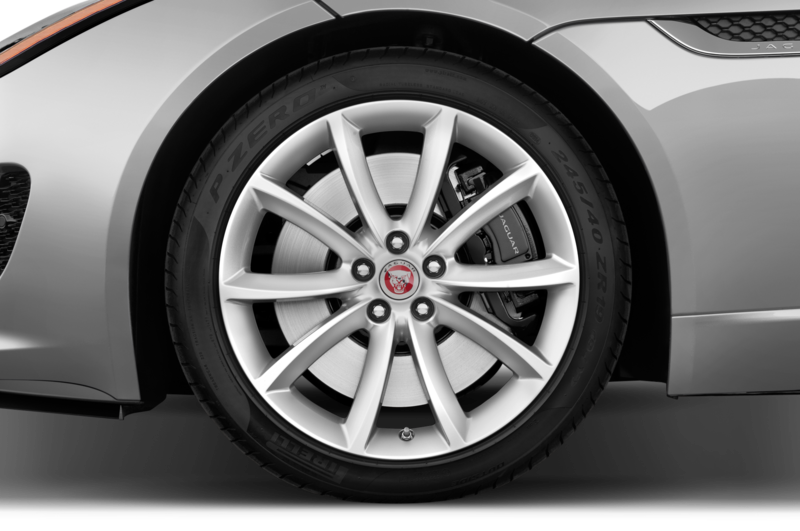 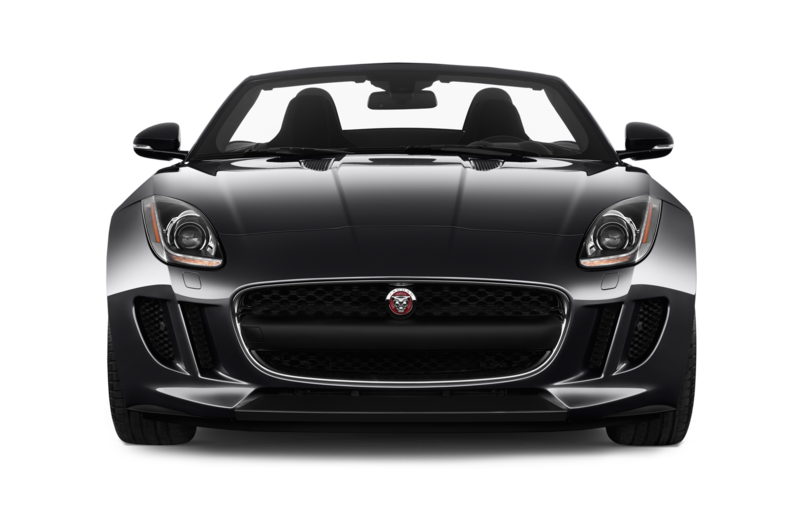 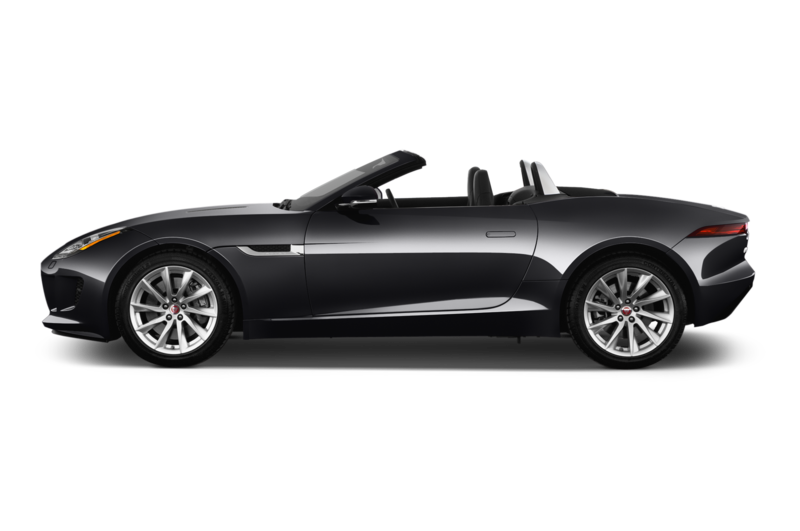 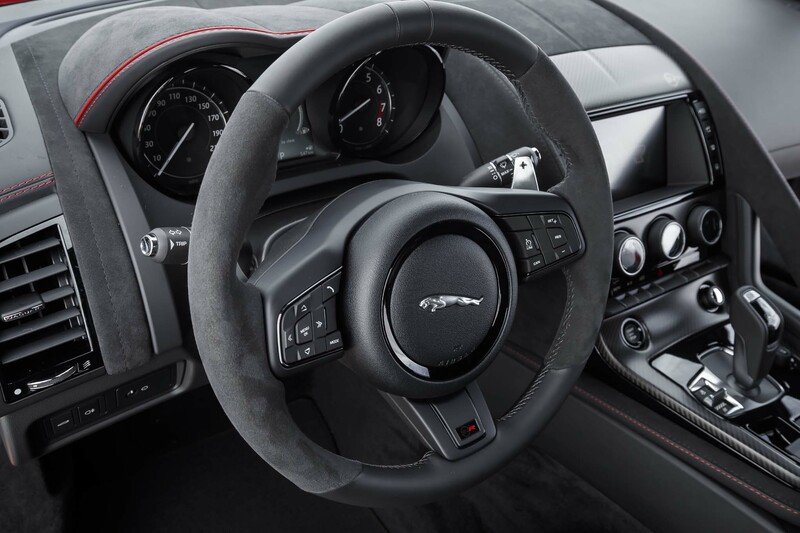 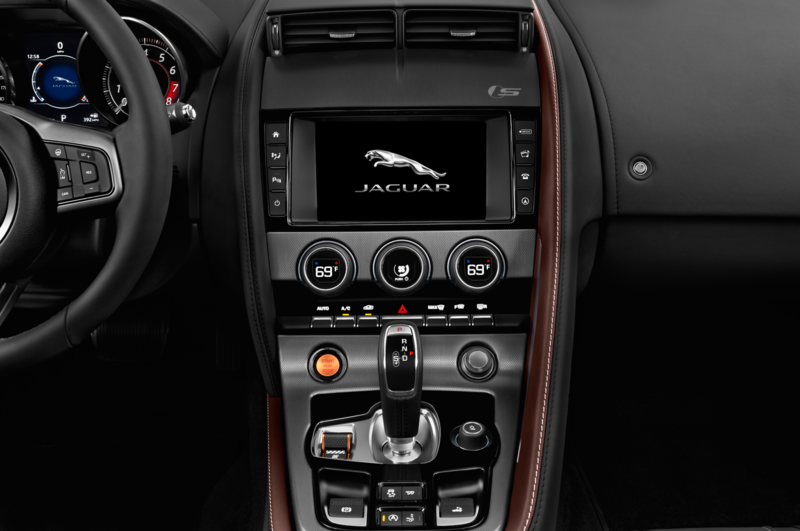 It felt to me like this might be caused by the car’s high-speed shock travel not quite matching the wheel rate rather than anything else, but either way, the jarring was too abrupt for my tastes—especially in a Jaguar. I am happy to note the SVR has new shock valving; the car’s handling now feels predictable, at least on all the road surfaces I encountered, and noticeably less harsh. 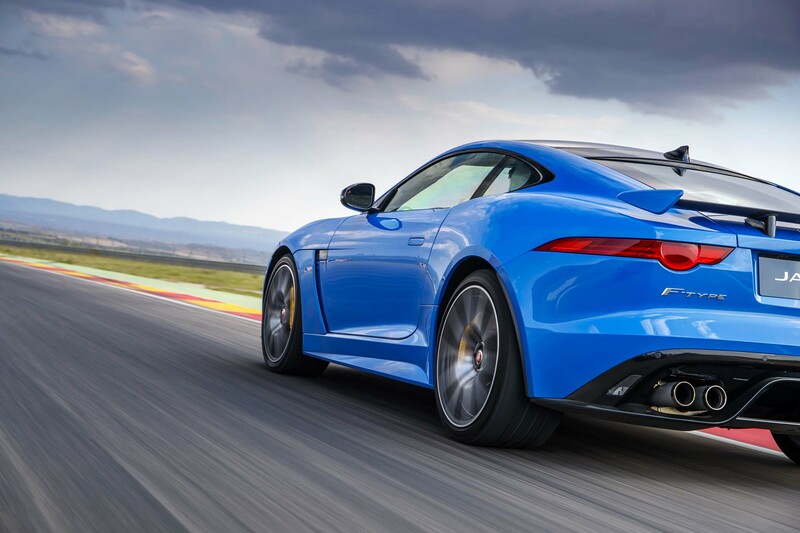 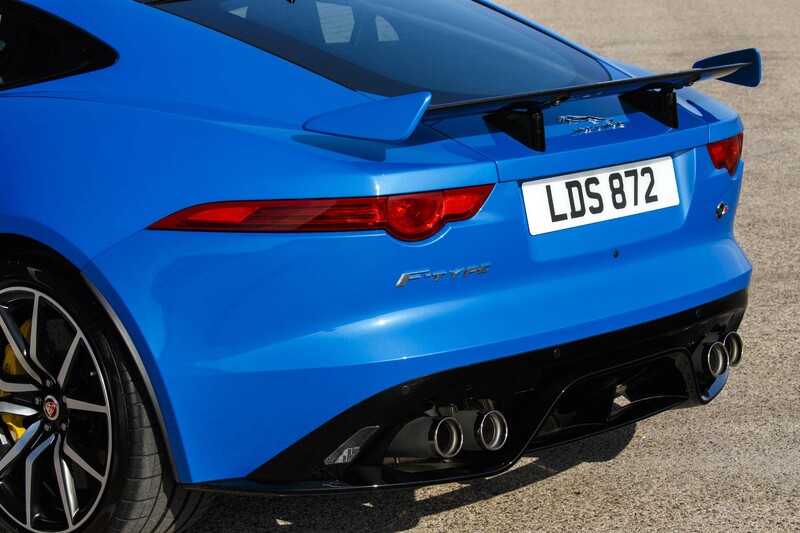 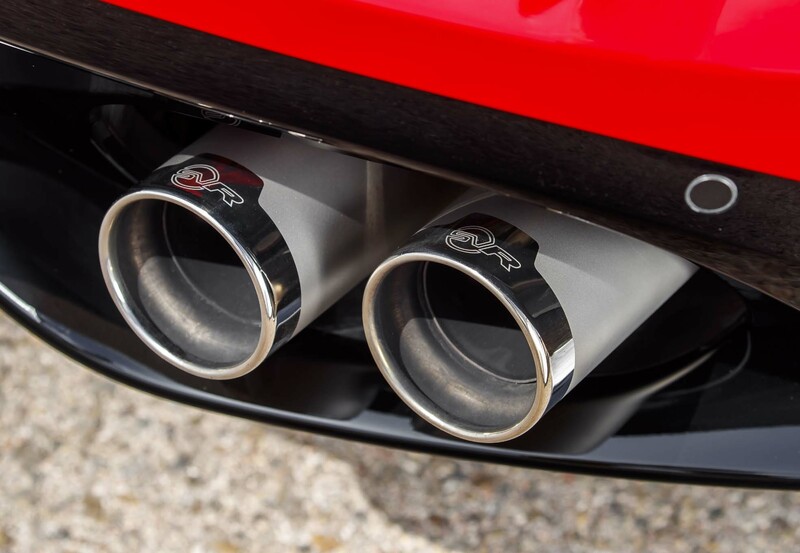 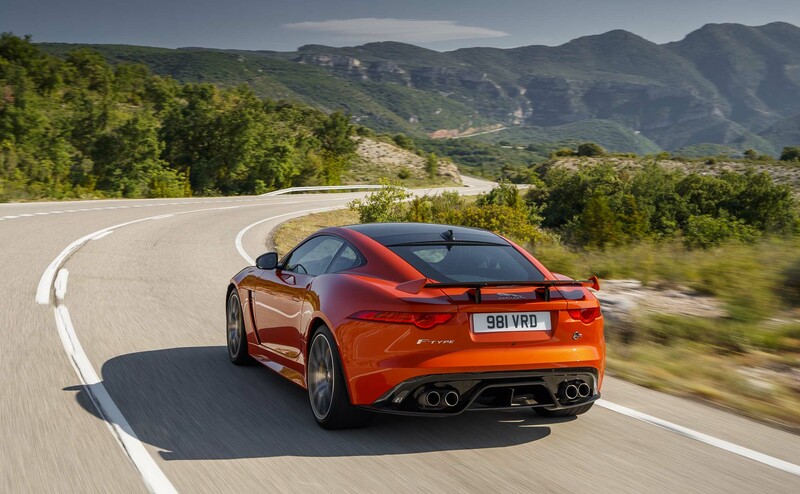 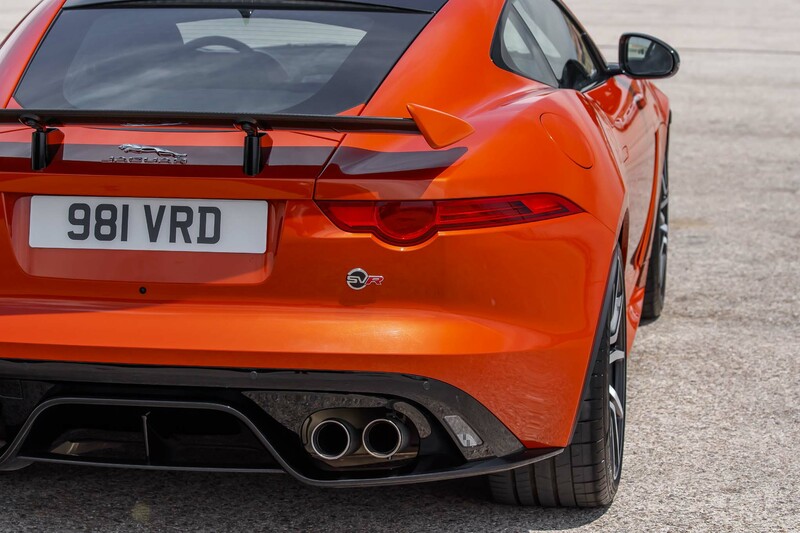 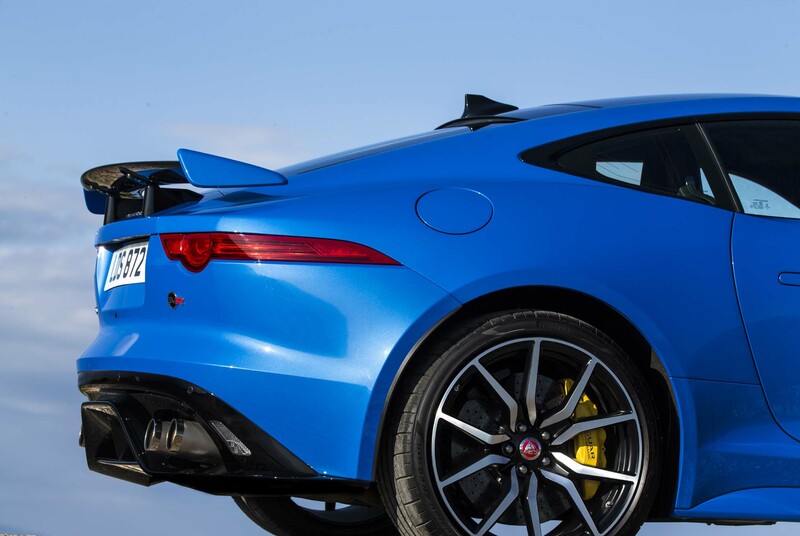 Just like the F-Type R, the SVR’s exhaust gets plenty loud if you hit the sound-enhance button, with a maniacal bellowing to go along with the pops and crackles on the overrun. 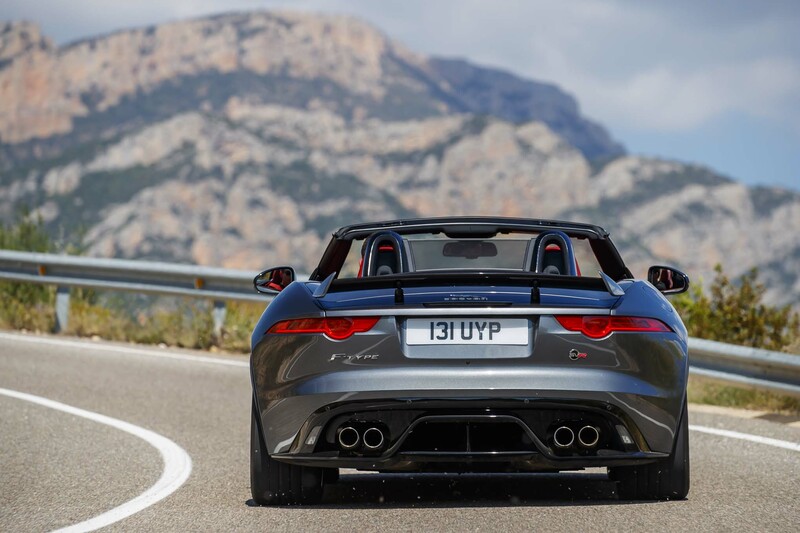 This is all familiar to anyone who has driven or ridden in an F-Type R, or even heard one pass by, but it certainly makes me smile again. 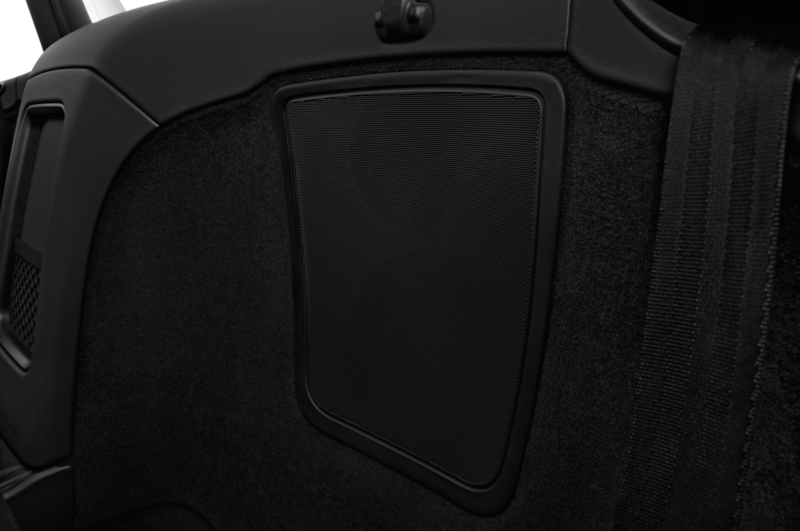 I suspect some of the innocent woodland creatures we pass are probably left somewhat deaf. 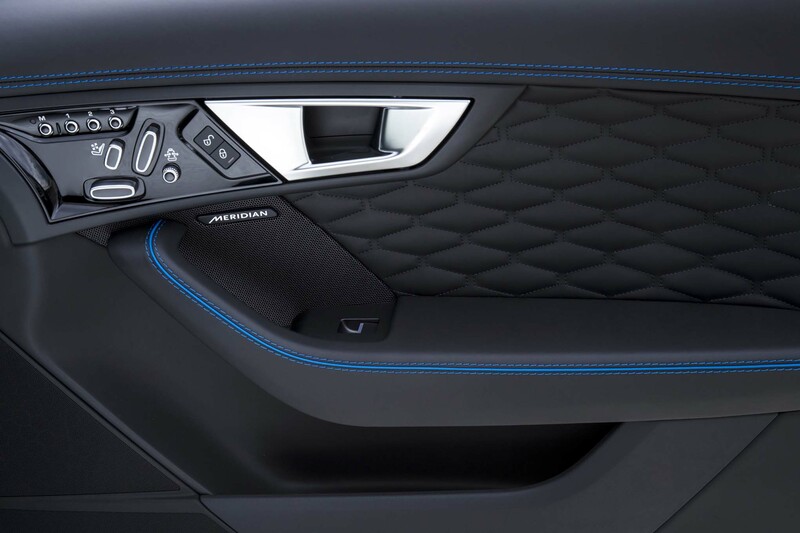 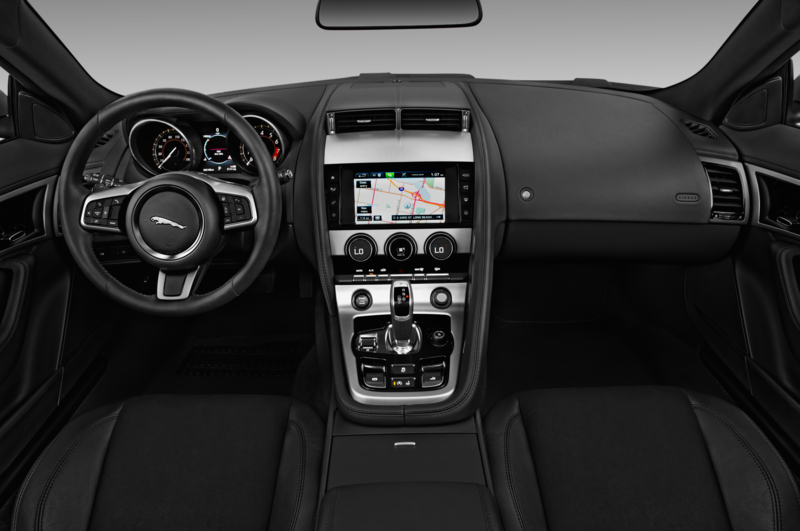 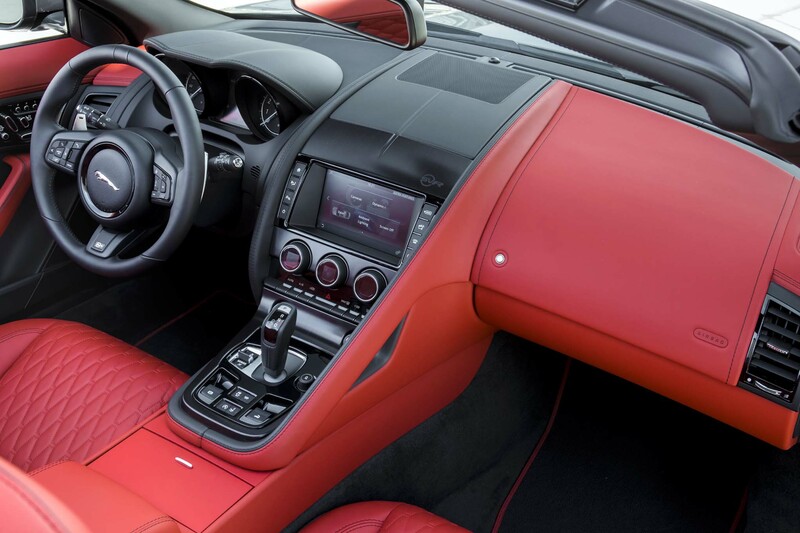 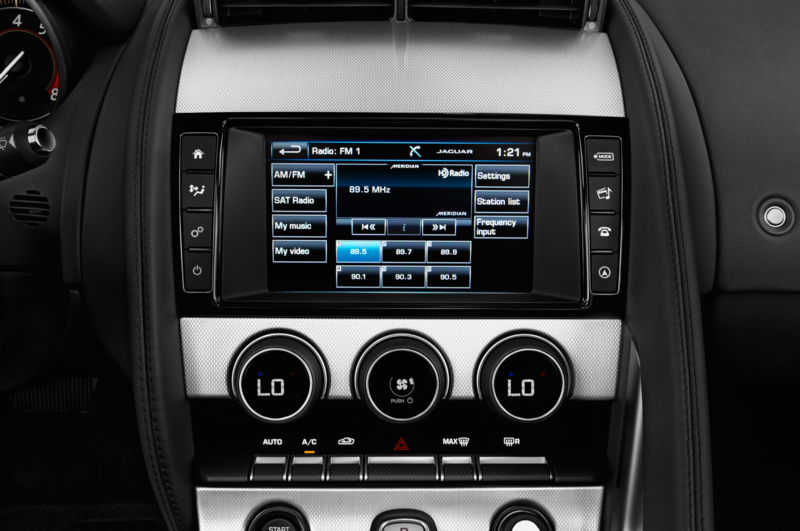 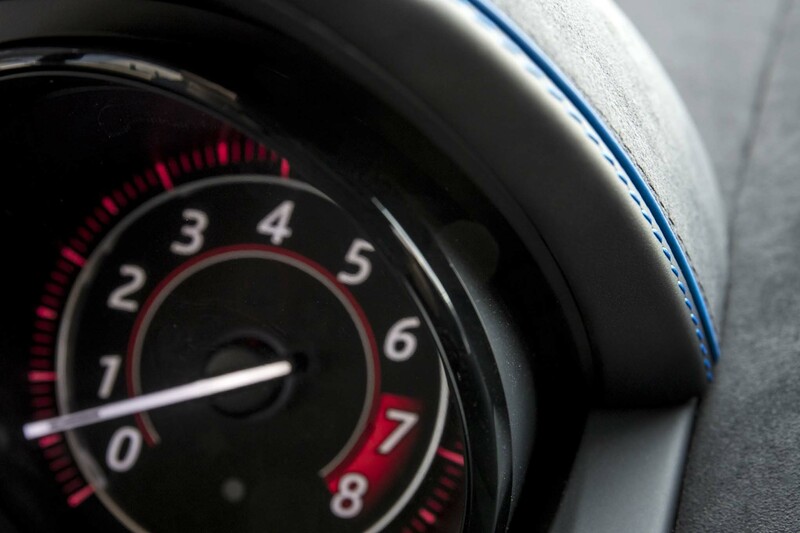 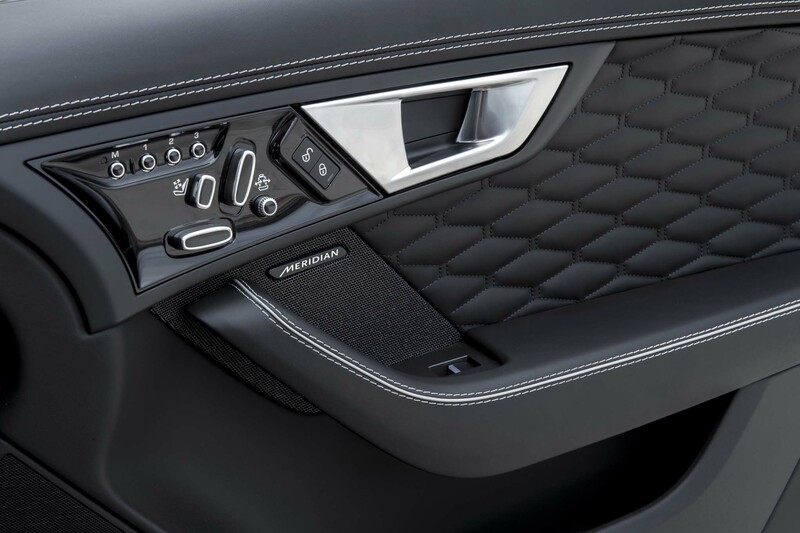 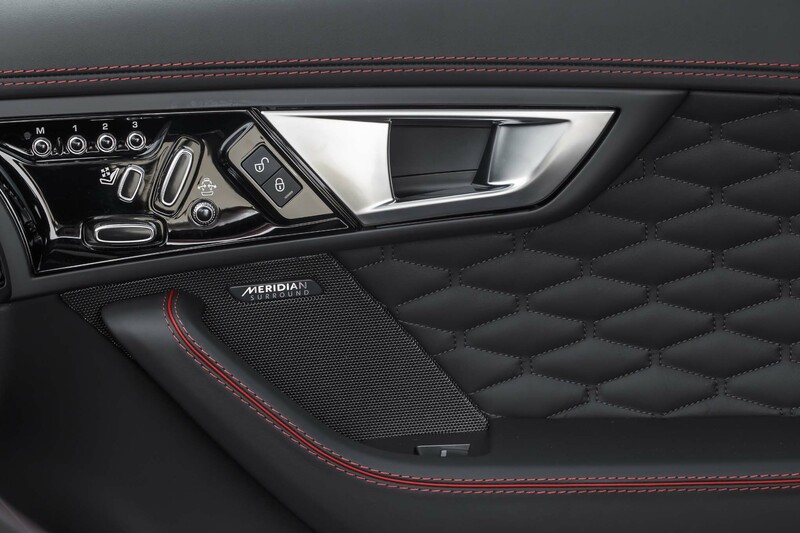 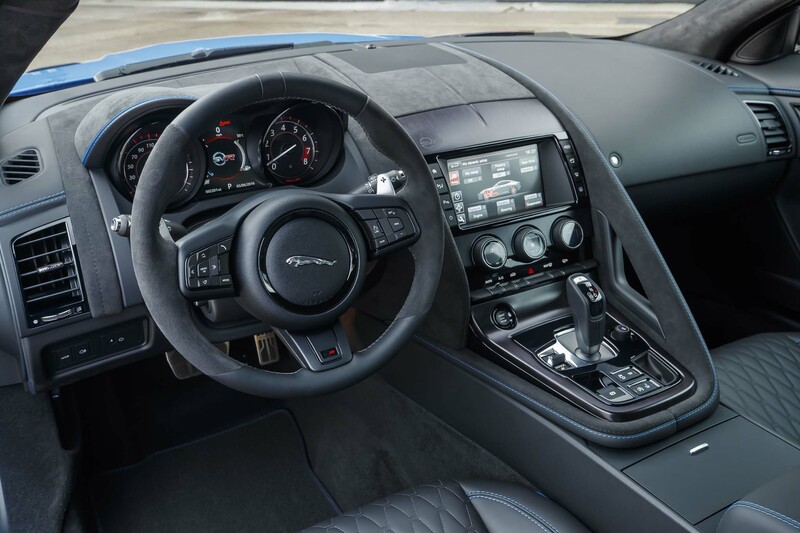 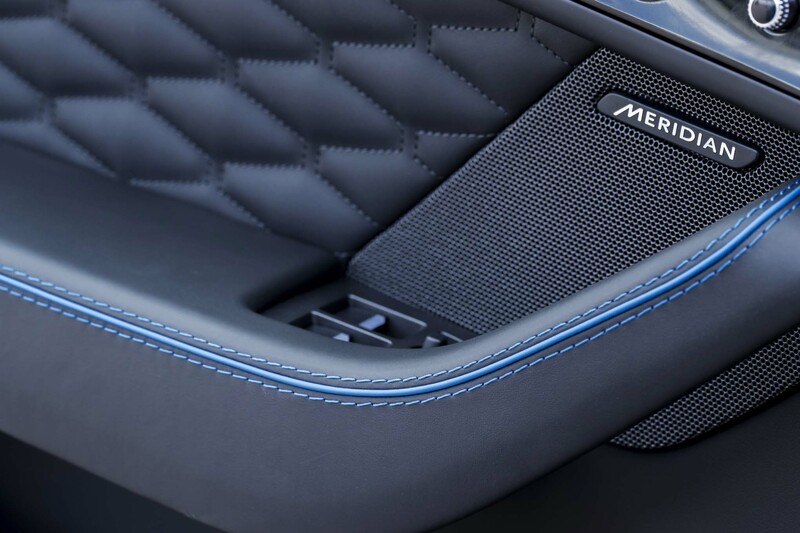 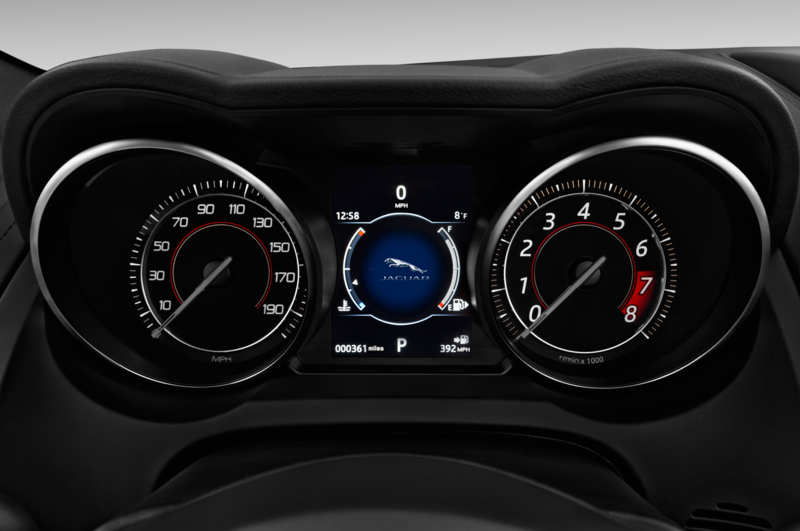 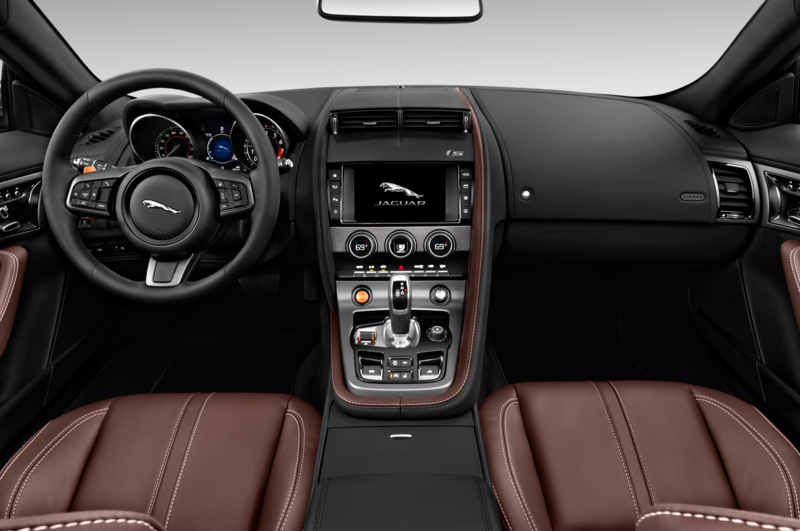 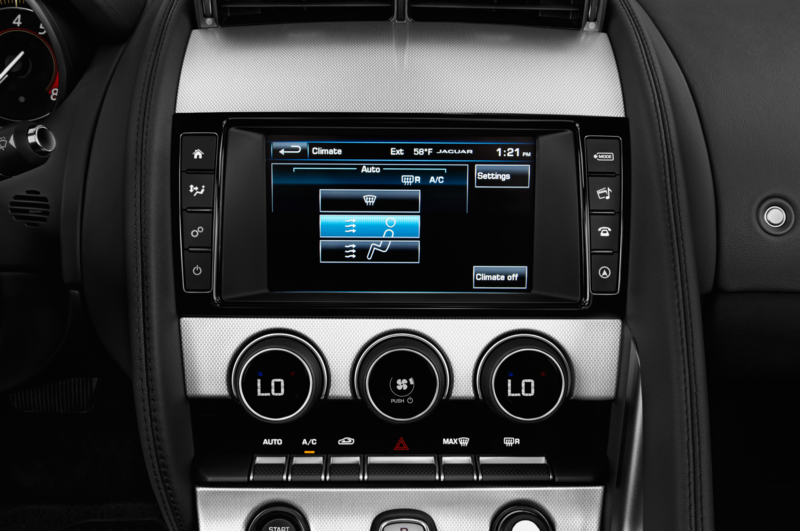 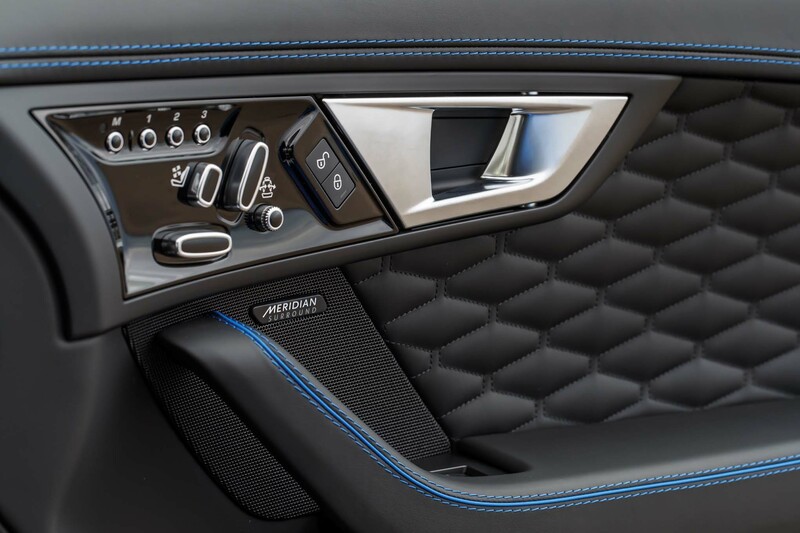 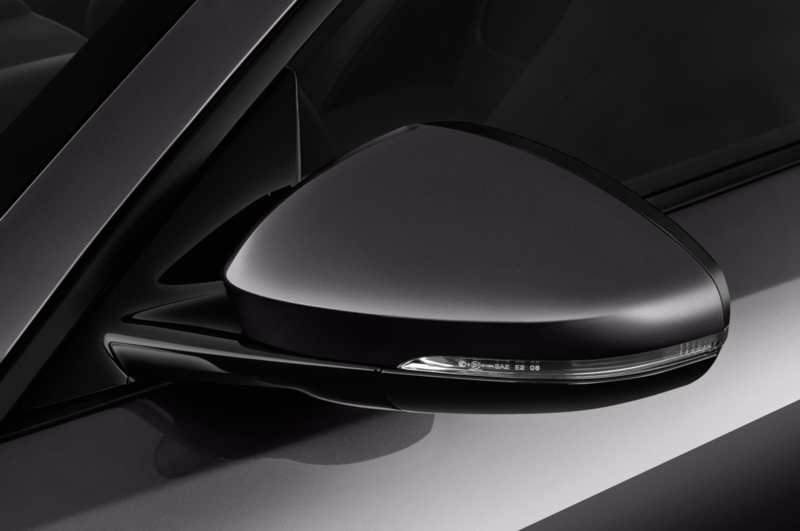 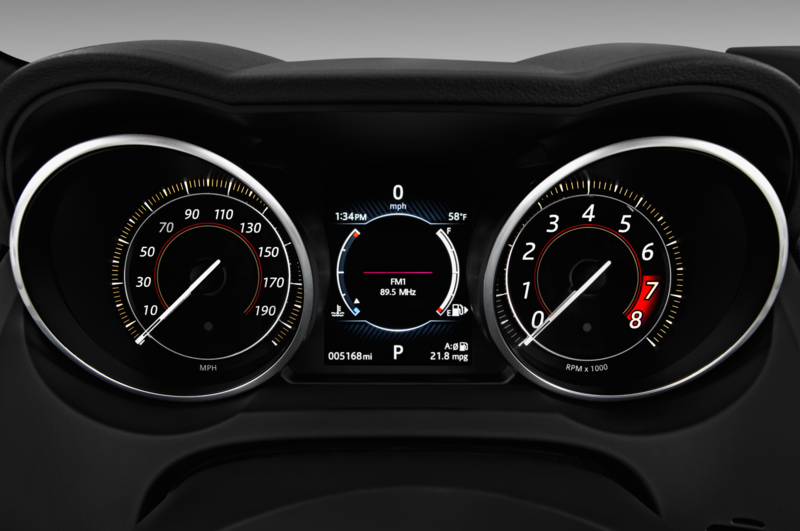 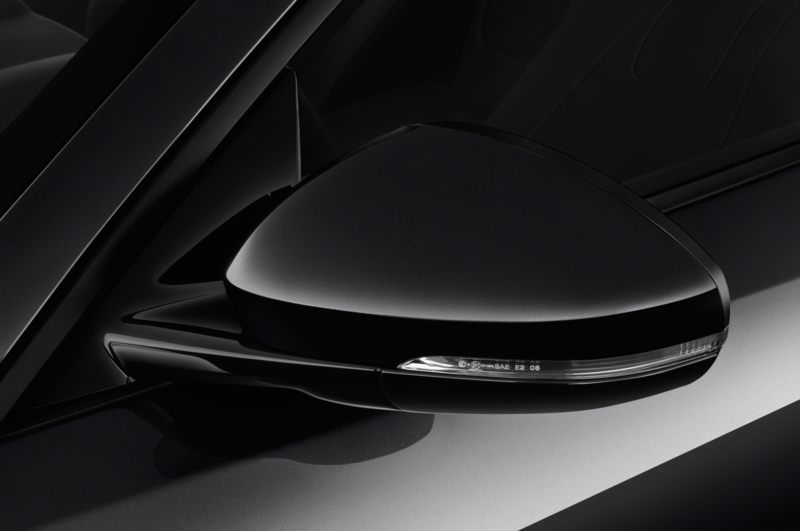 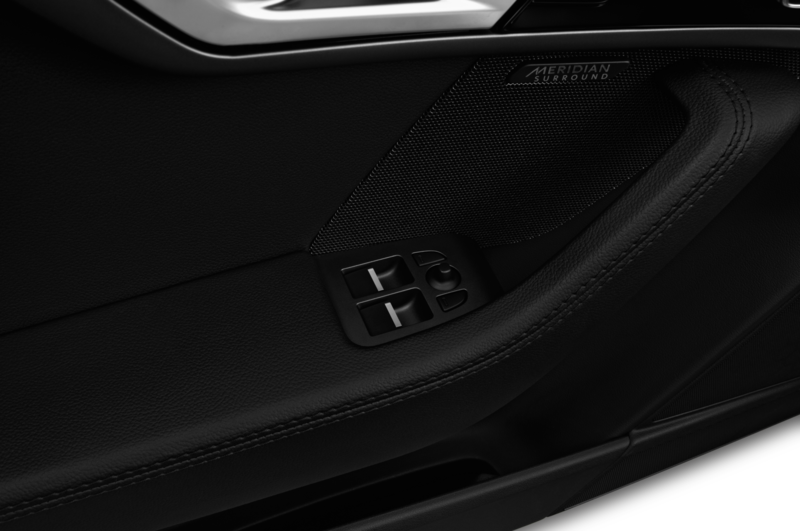 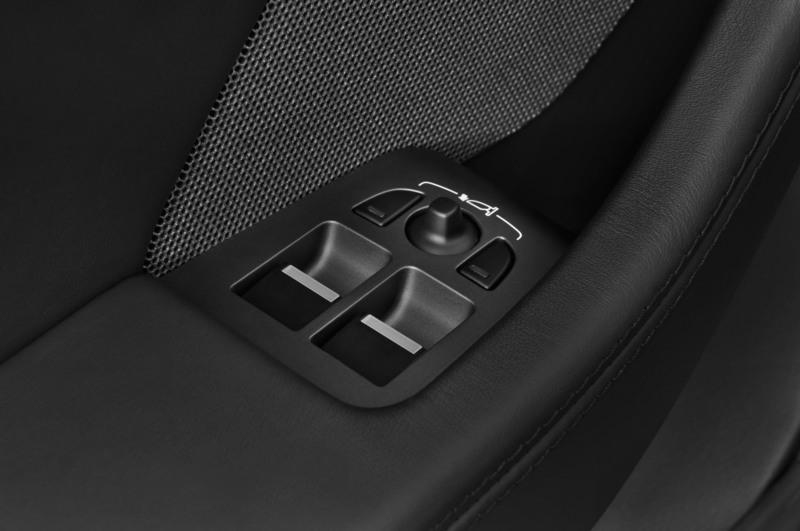 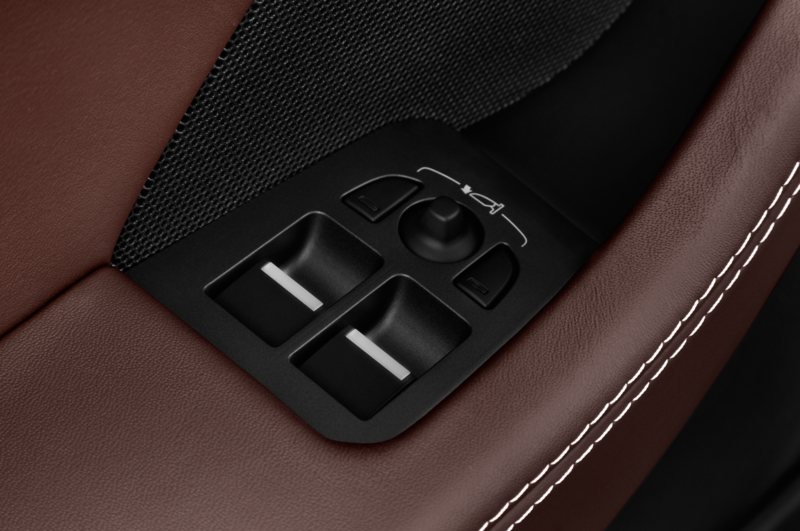 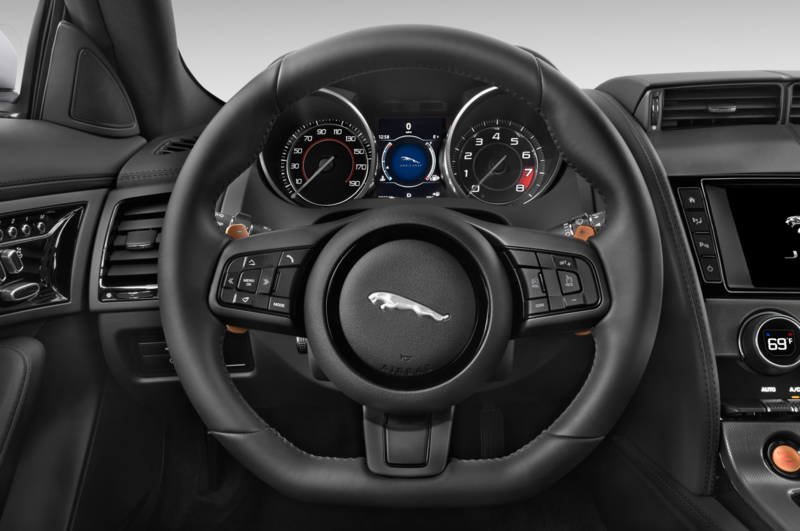 New options for a suede-cloth-covered center console and instrument cluster look and feel good. 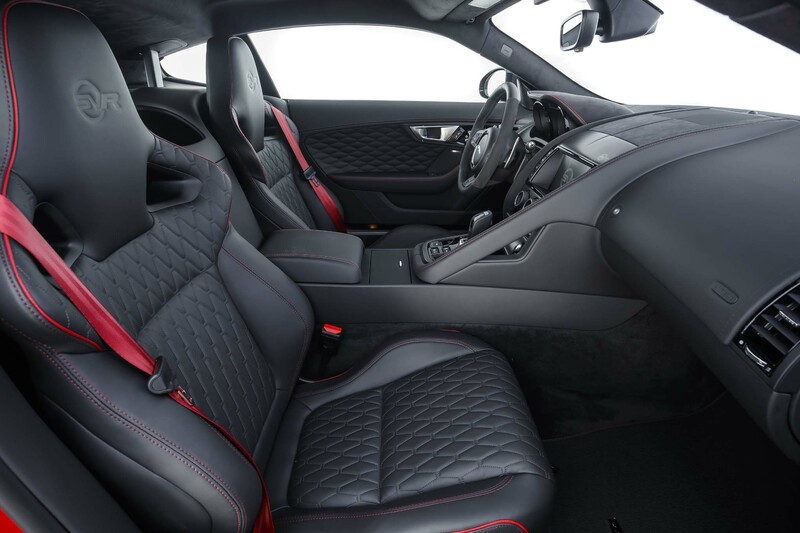 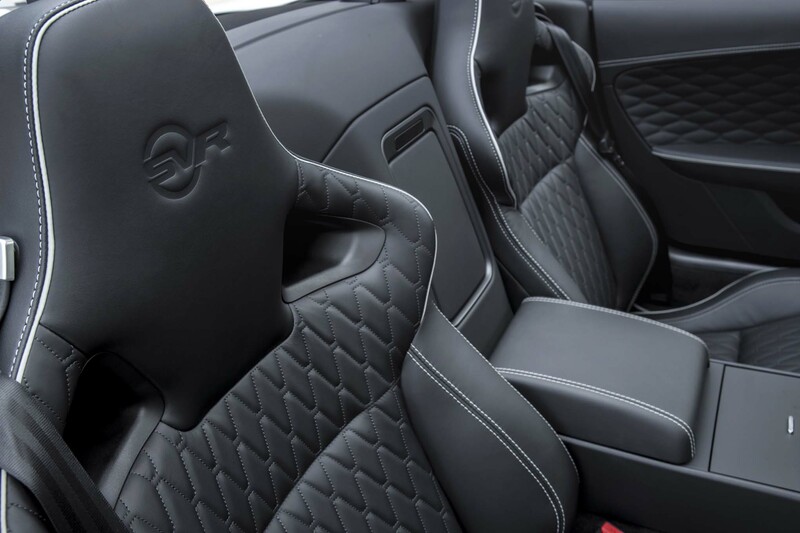 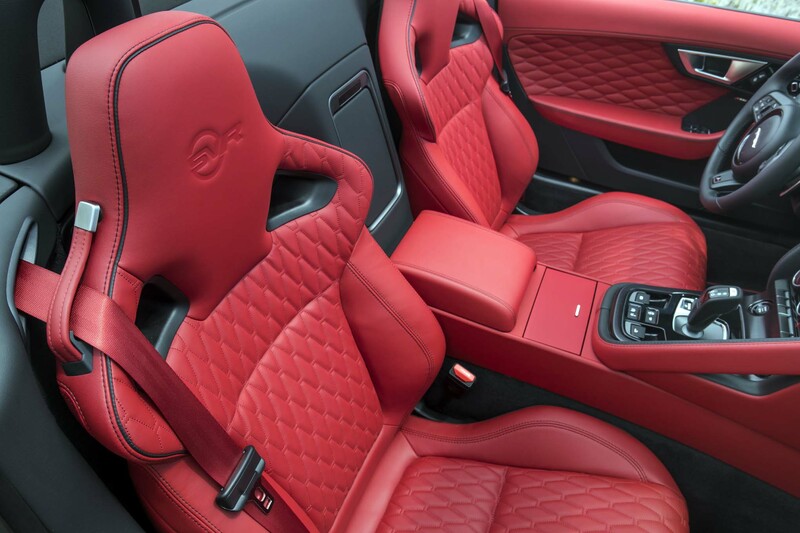 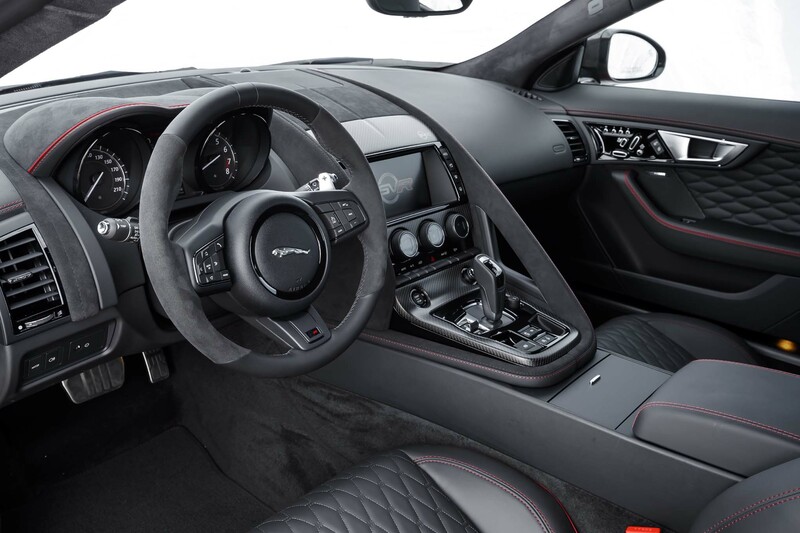 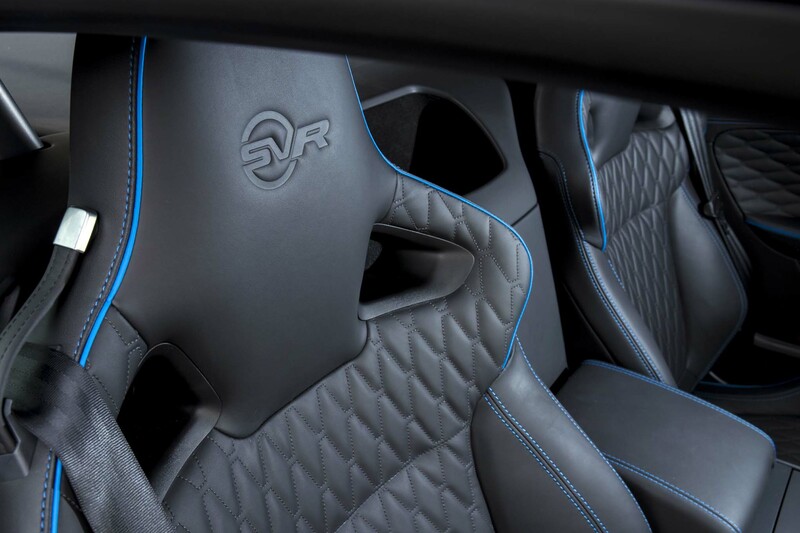 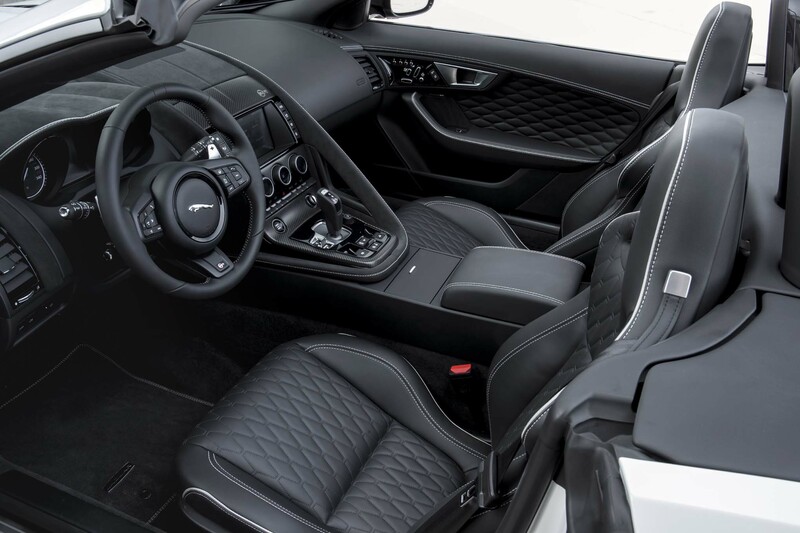 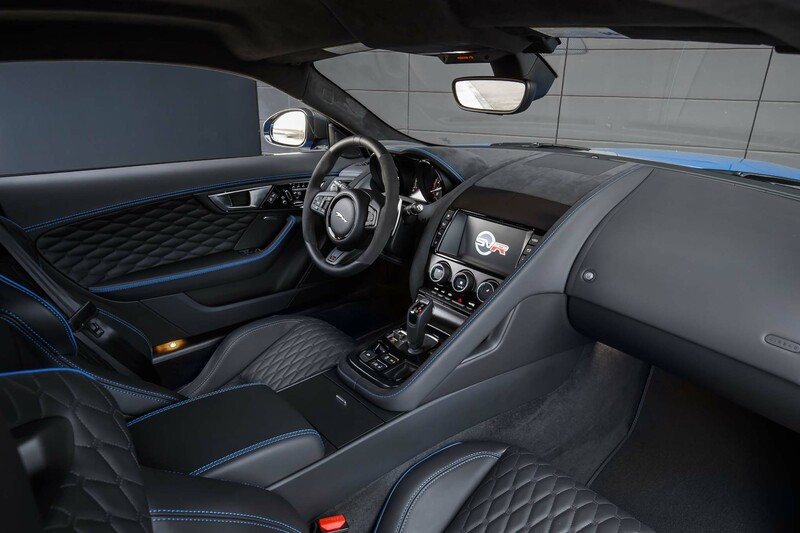 I’m not sure if it’s the suede cloth or not, but the SVR smells great inside. 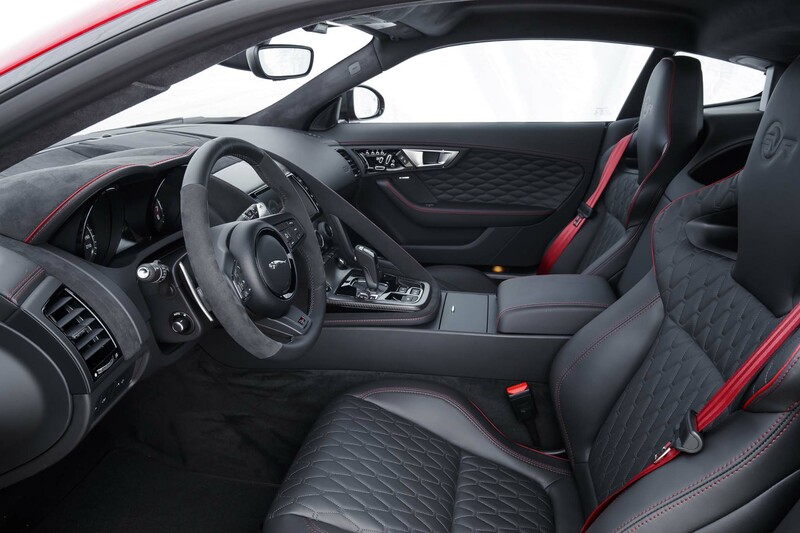 The steering wheel is unique to this model, and the new Lozenge Quilt pattern, 14-way adjustable seats were comfortable on the two-hour run to the track. 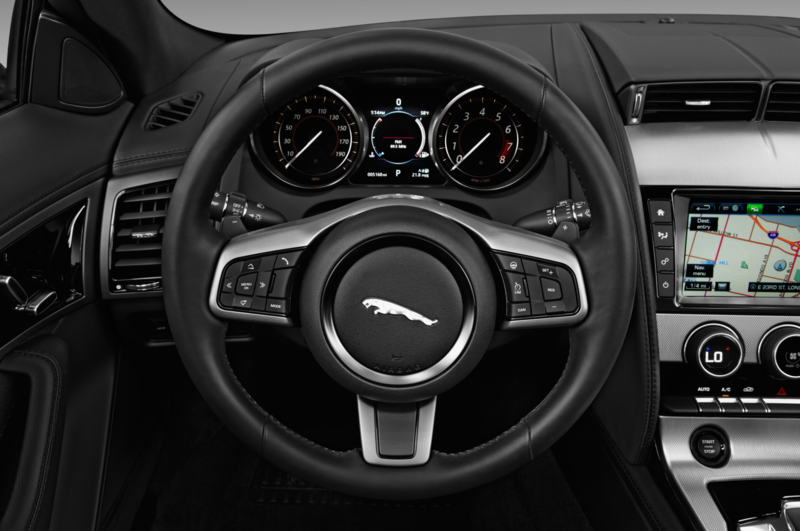 One negative is that they do not hold me in as much as I need when driving hard. I’m a Sagittarius, 5-foot-10, 156 pounds, and kind to animals, in case you wonder. 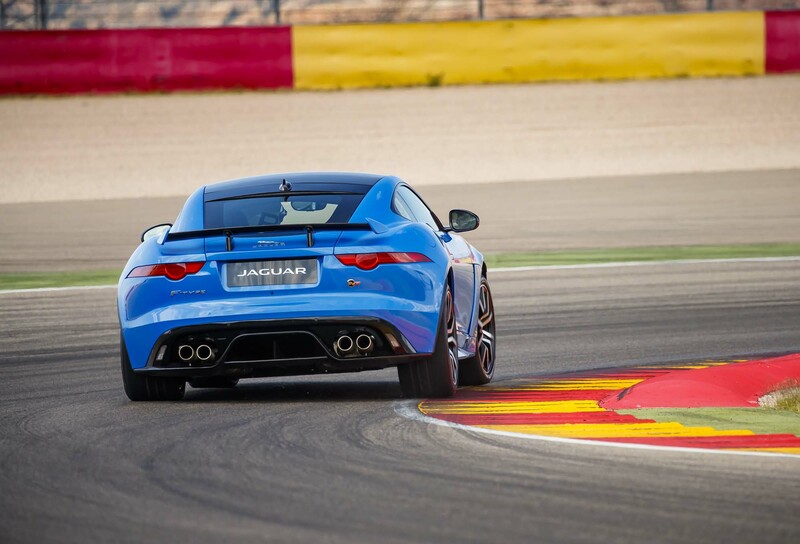 The MotorLand track is a modern, first-class race facility. 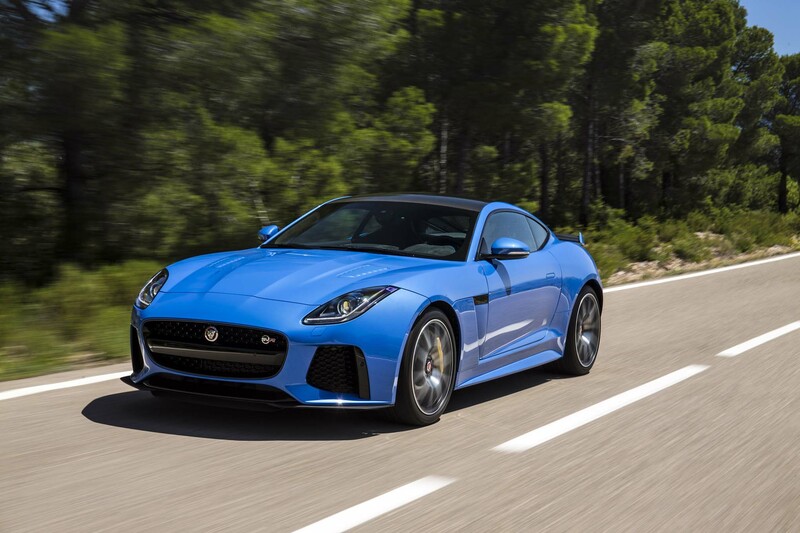 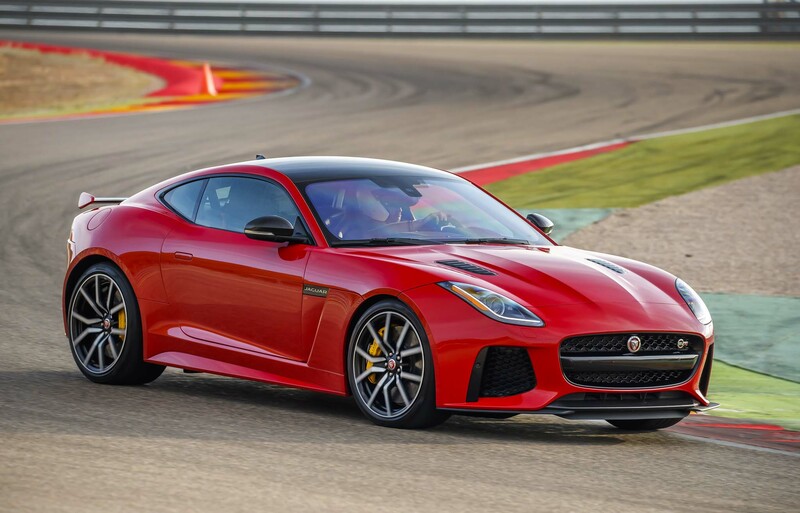 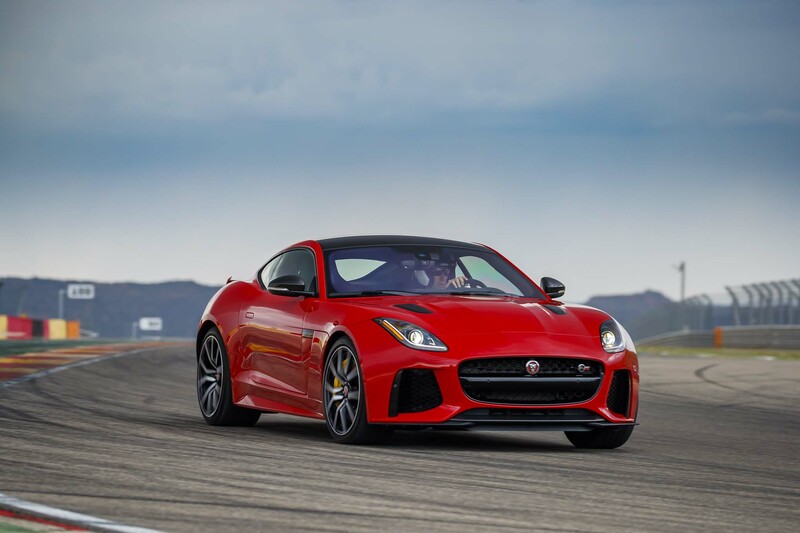 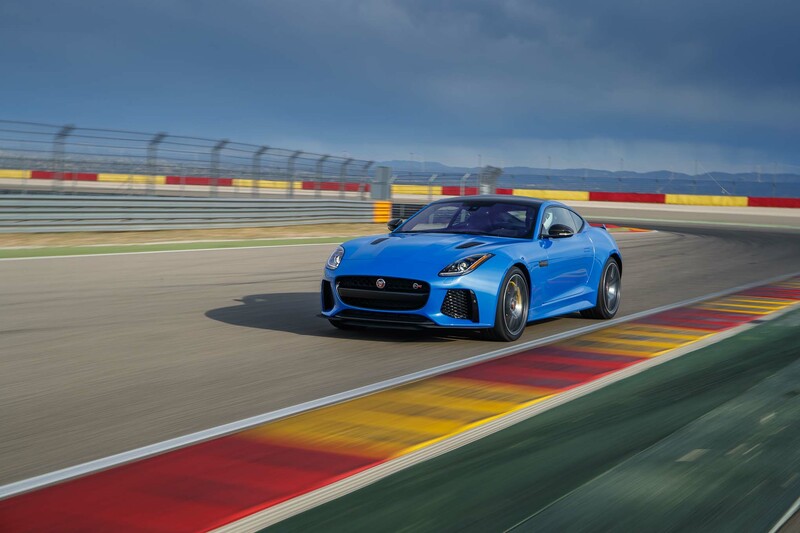 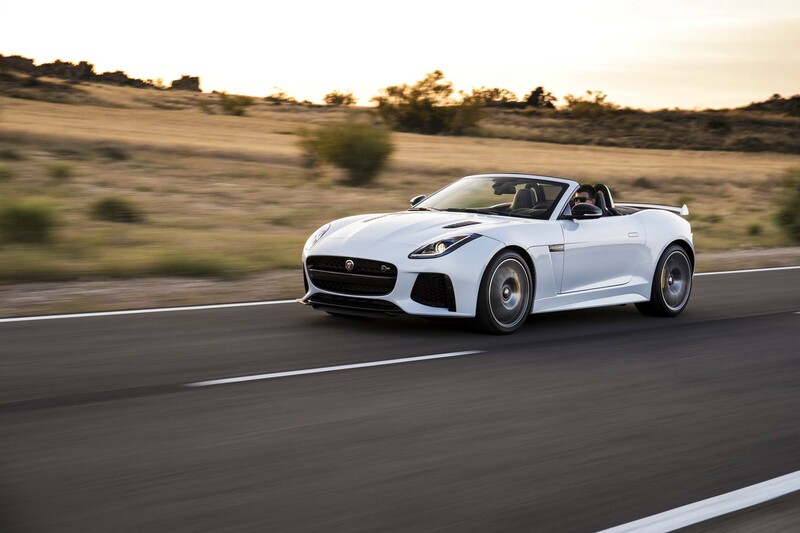 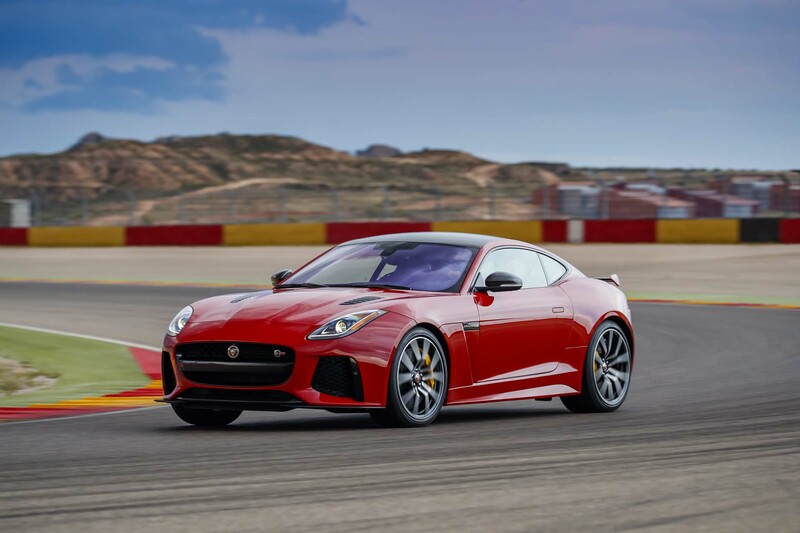 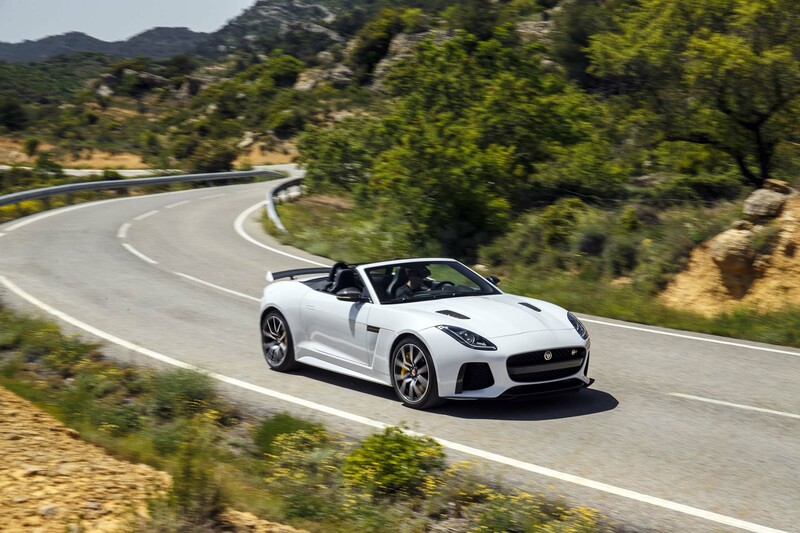 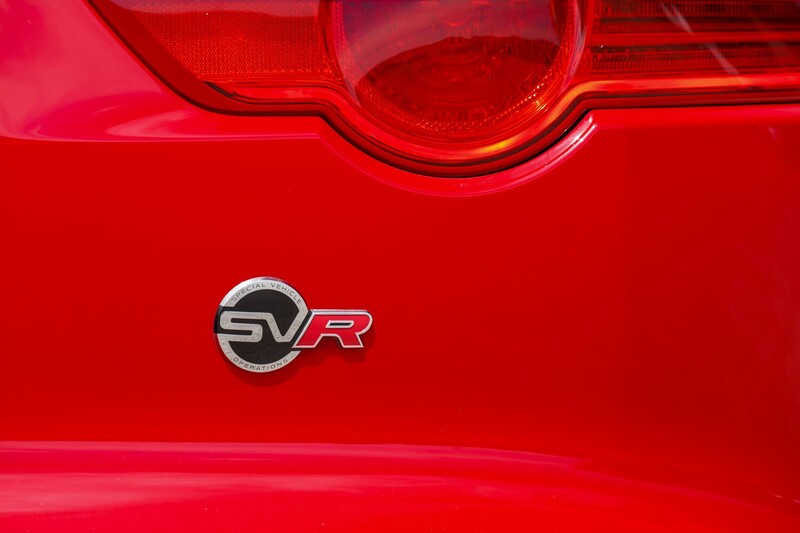 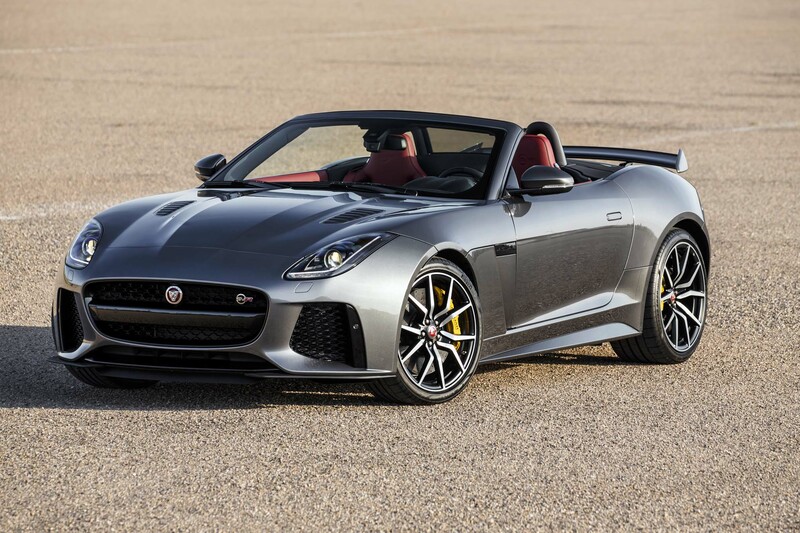 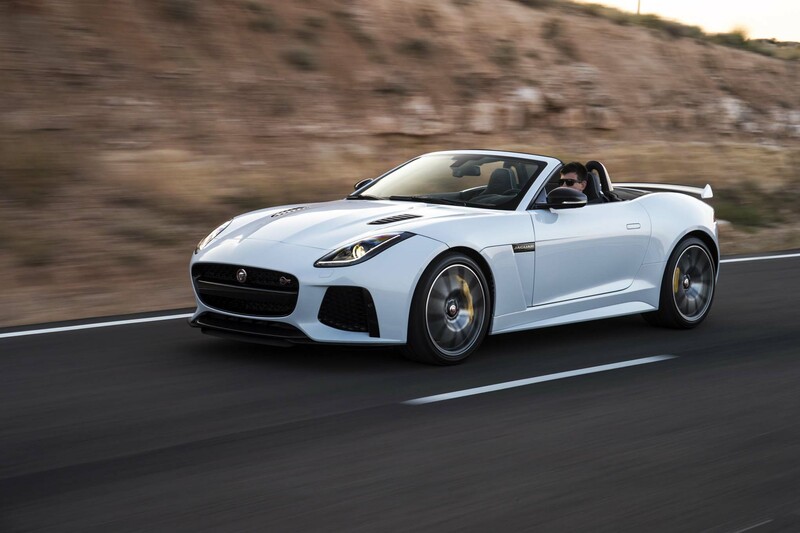 It’s always fun to drive just about anything on a closed circuit, but it is worth noting that Jaguar says maybe only 5 to 10 percent of SVRs will ever see a racetrack. 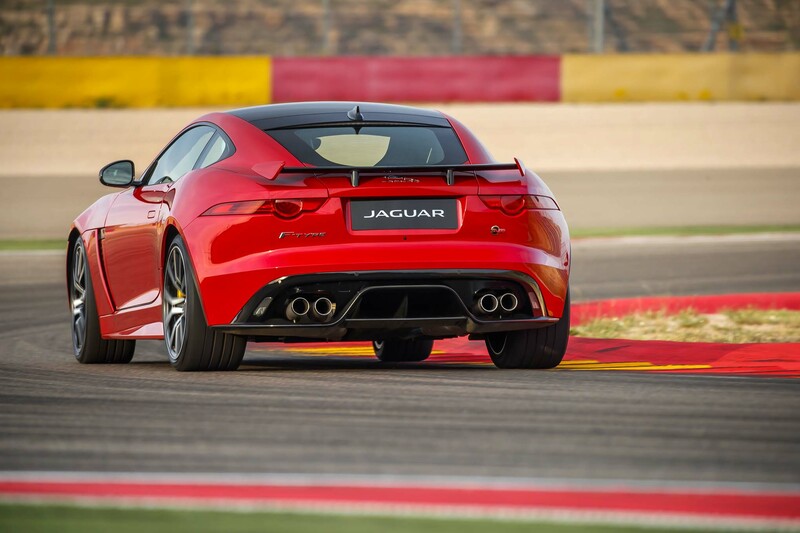 I rip around for two sessions of three hot laps each. 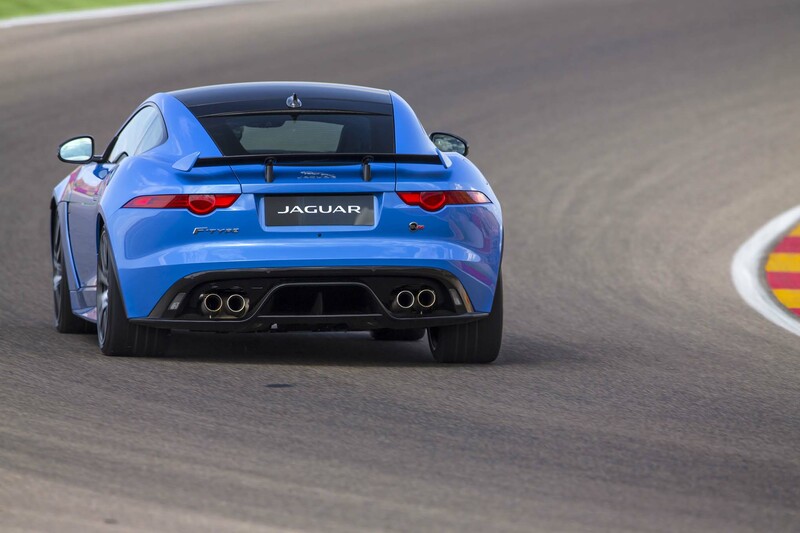 Top speeds exceed 170 mph on the really long back straight that ends in a 45-mph corner. 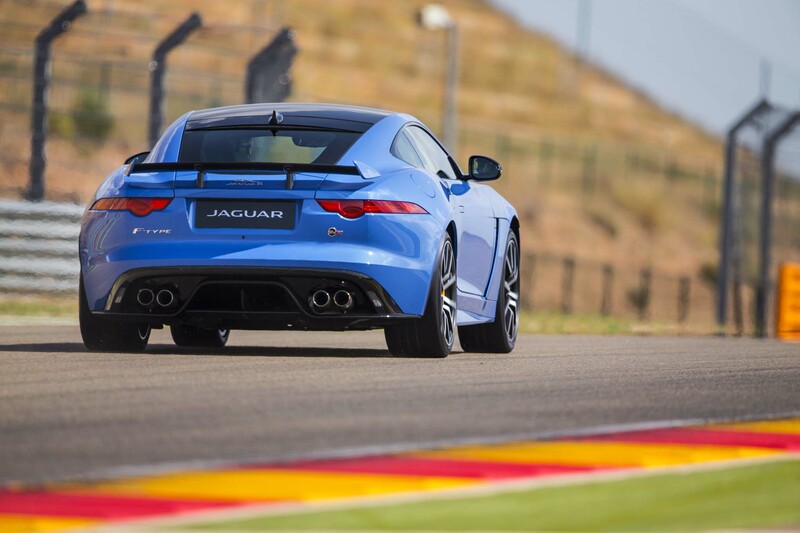 There is some brake fade by the third lap, but I counter it easily with a little more pedal pressure. 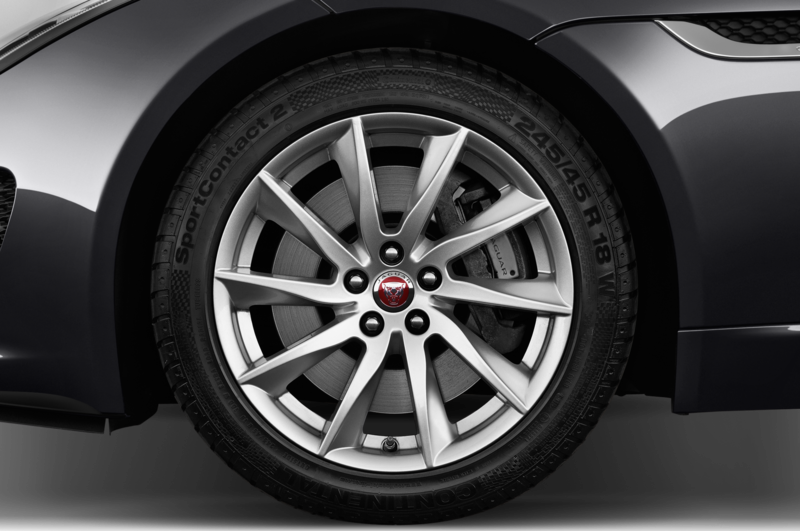 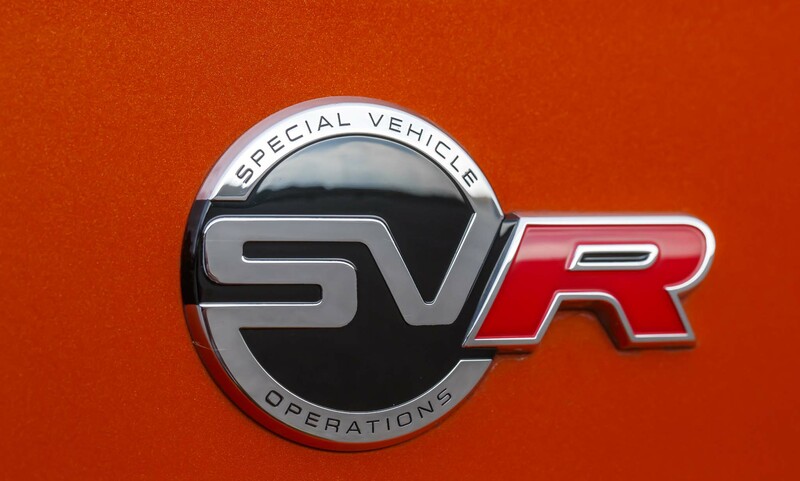 The SVRs I’m driving all have the optional 15.6-inch front and 14.9-inch rear carbon brakes. 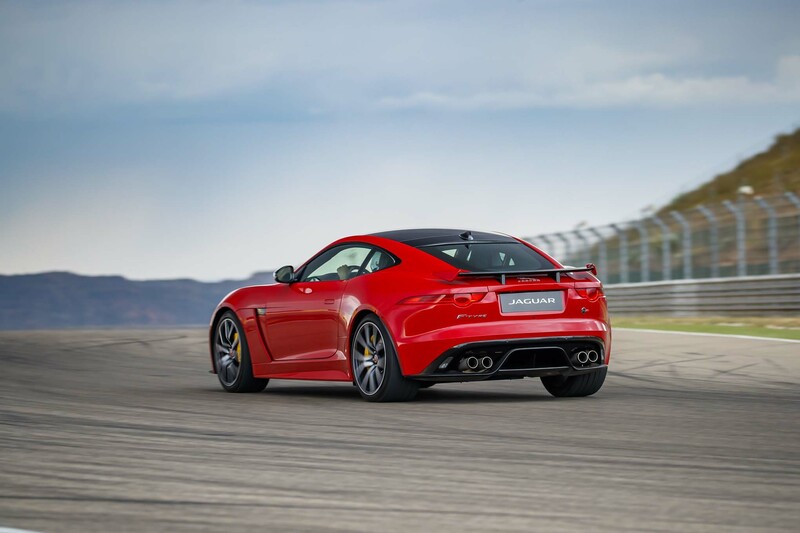 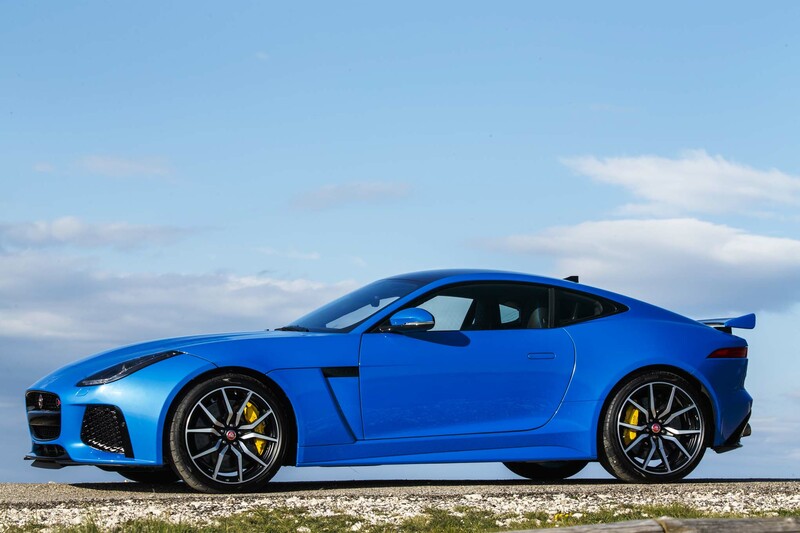 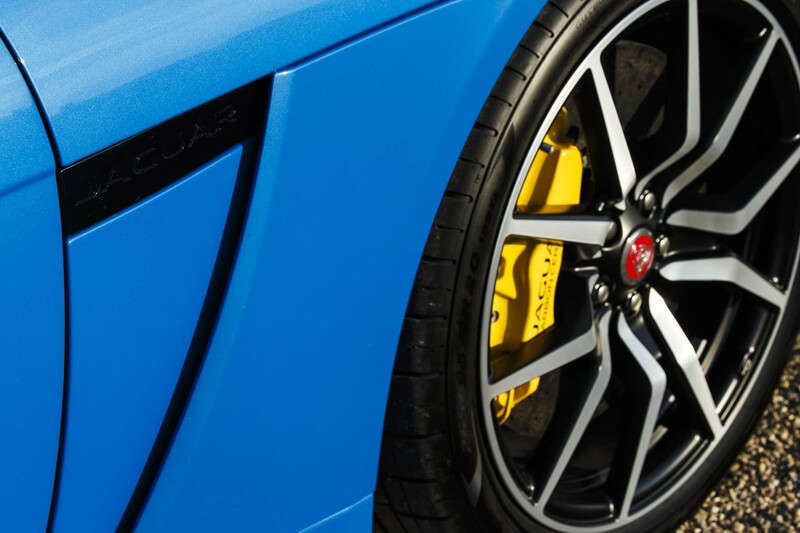 The SVR has a good amount of grip, but as with most street cars and especially ones with all-wheel drive, it does understeer at its limit, in all driving modes. 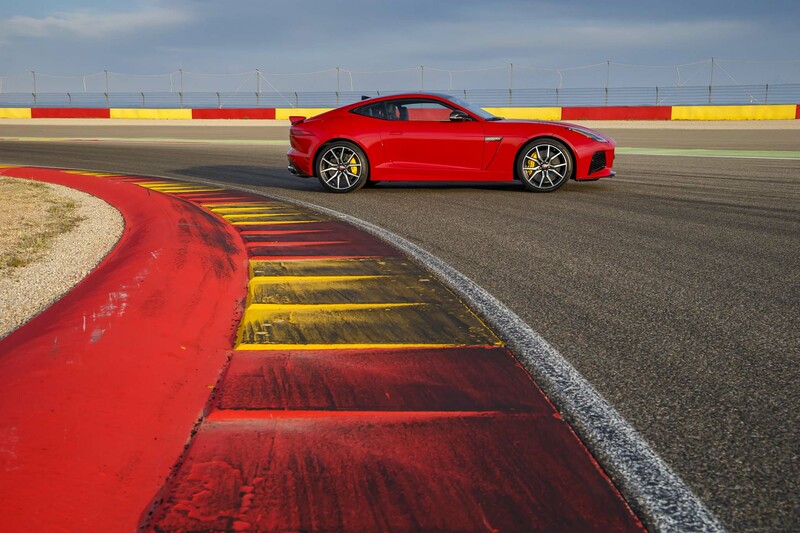 I initially drive a fast, smooth line around the track, kind of like a normal, sane person might. 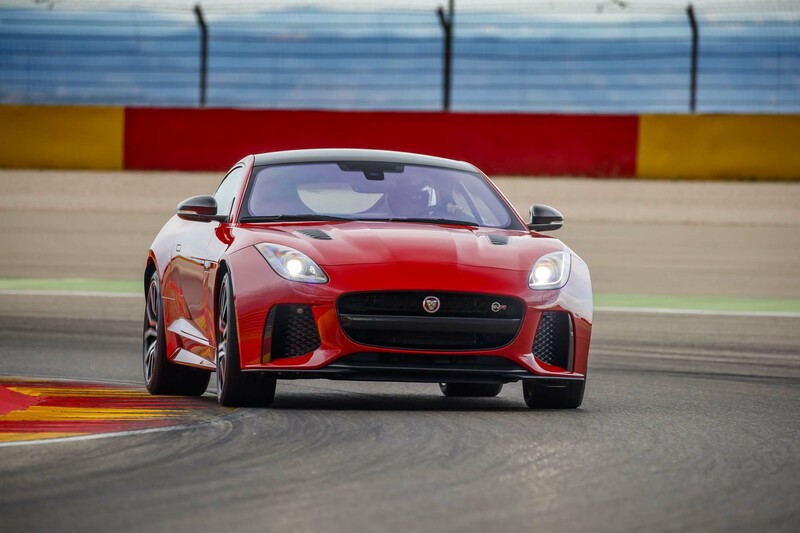 But in order to go quicker, I have to bypass the front-end push because it’s never faster to drive through understeer. 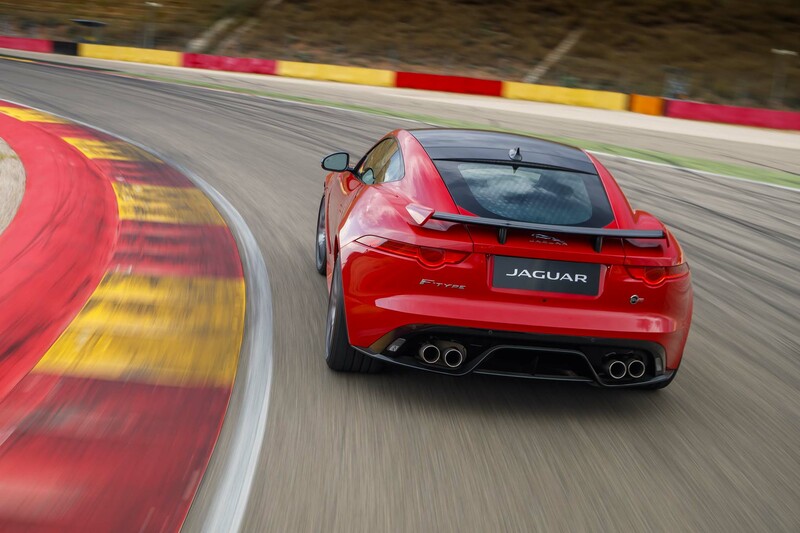 I have to rotate the car and induce oversteer at turn-in and then carry this mild drift/slide all the way through the corner. 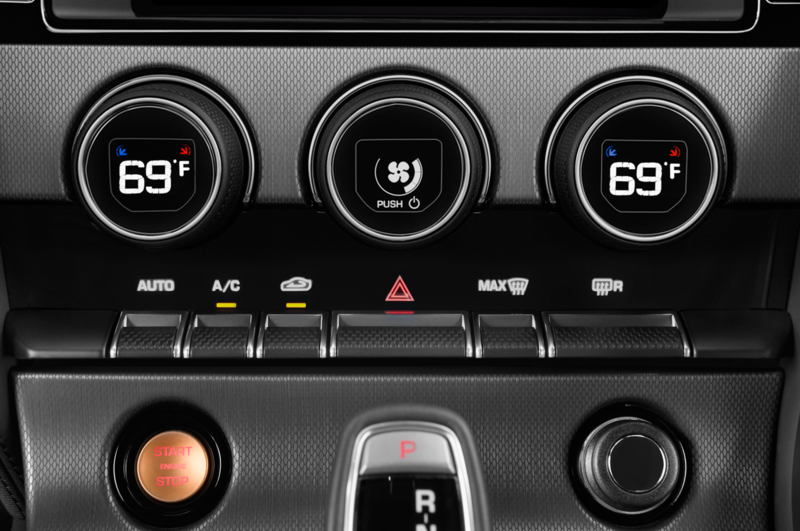 Accomplishing this can take aggressive driving techniques; with many cars today, it’s just not possible. 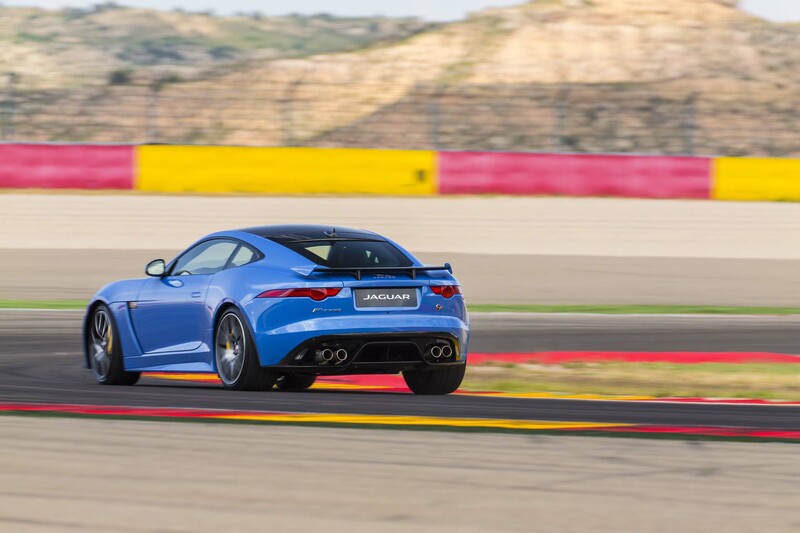 The good news is, I am able to manipulate the SVR and lap faster. 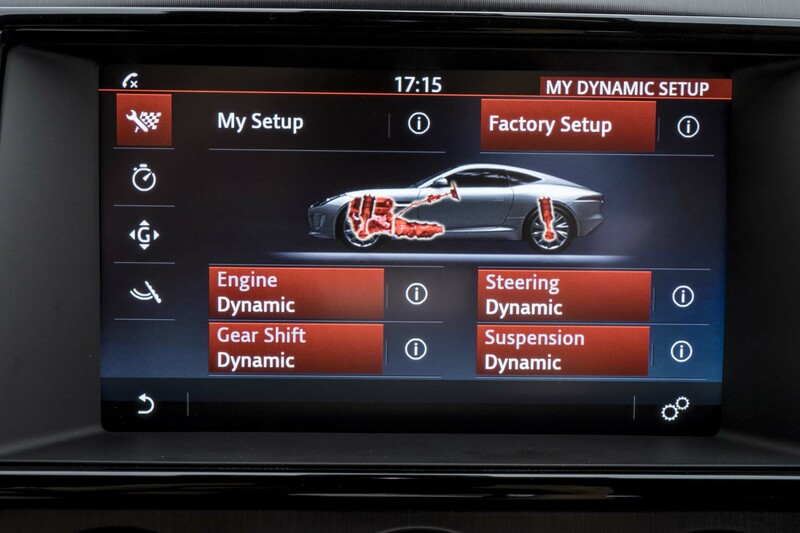 This tells me all the parts—differentials, shocks, springs, anti-roll bars, traction and stability control, etc.—are working in harmony. 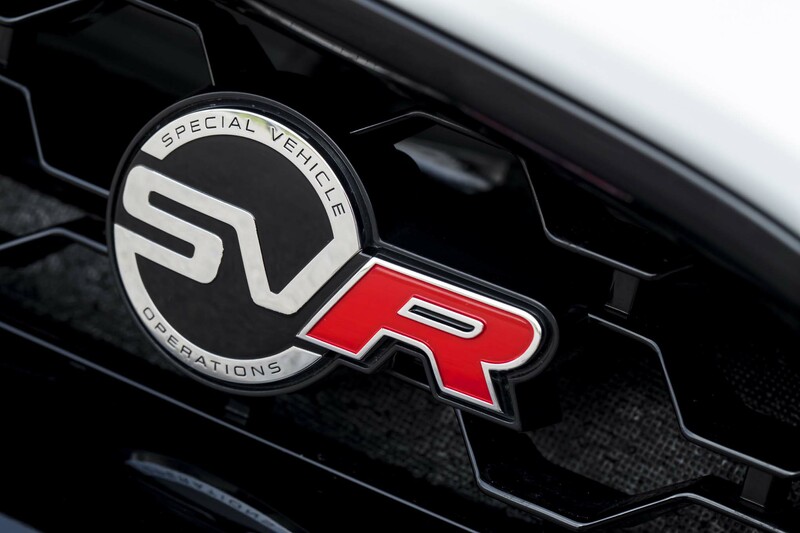 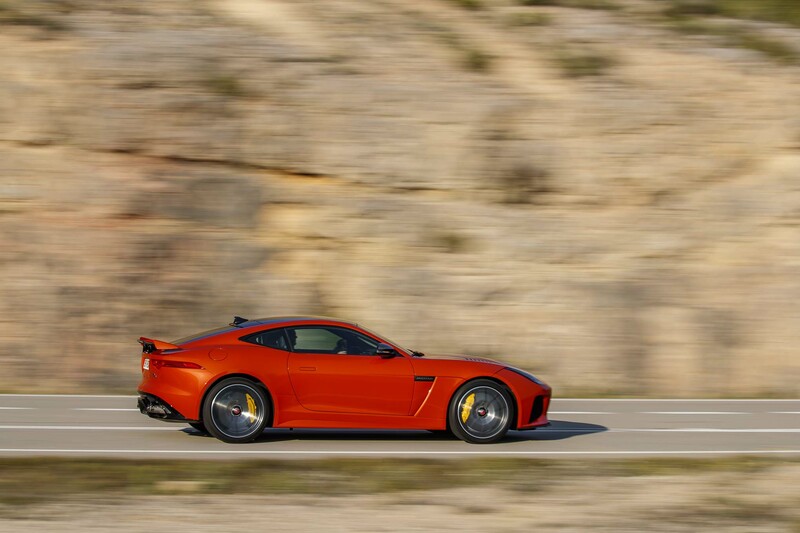 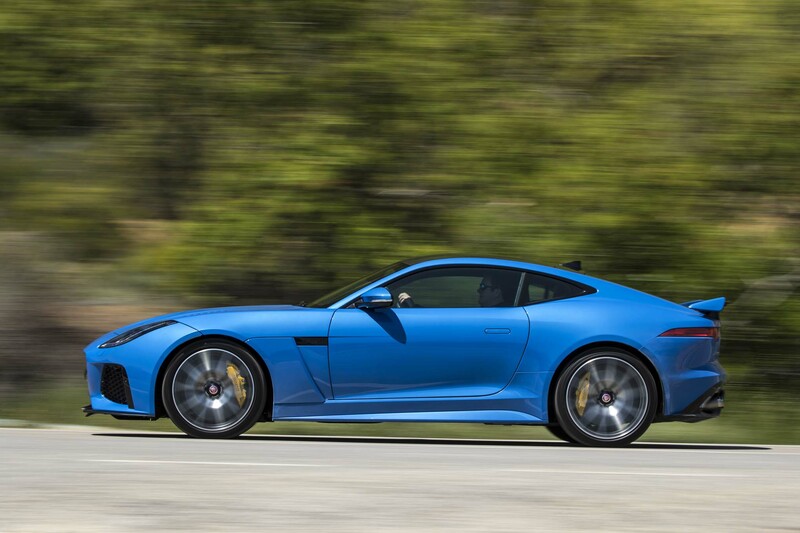 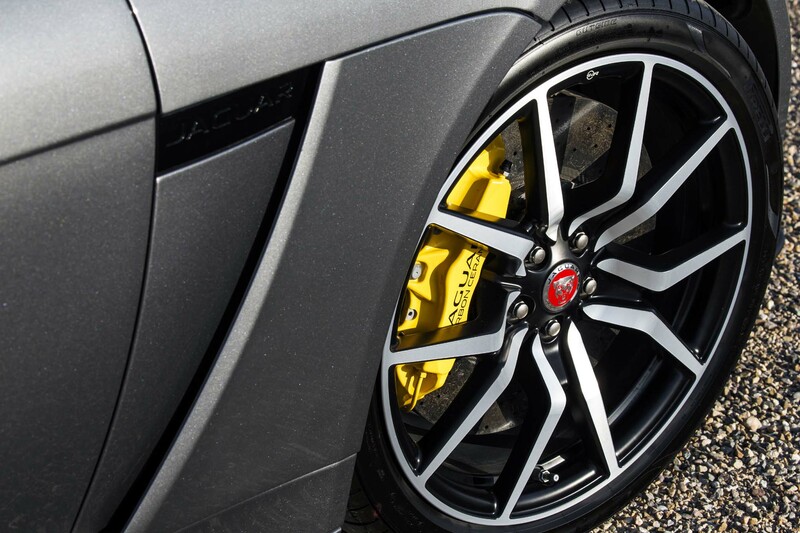 The SVR is sliding under control, fast, and is loads of fun. 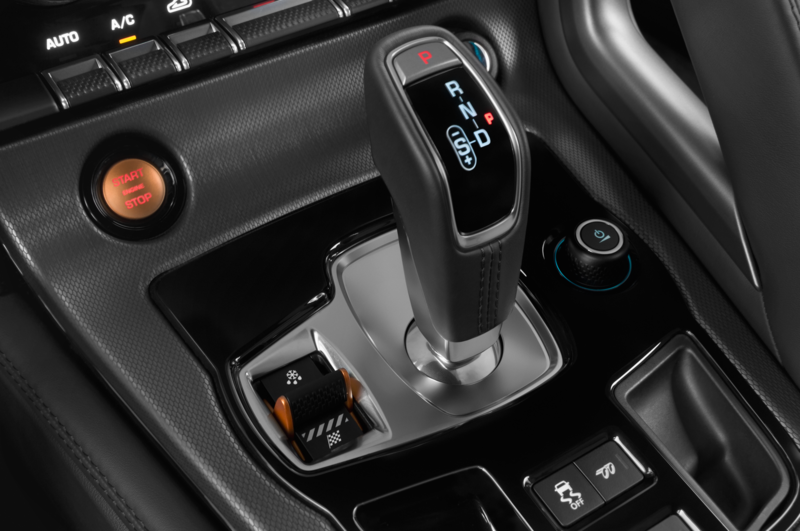 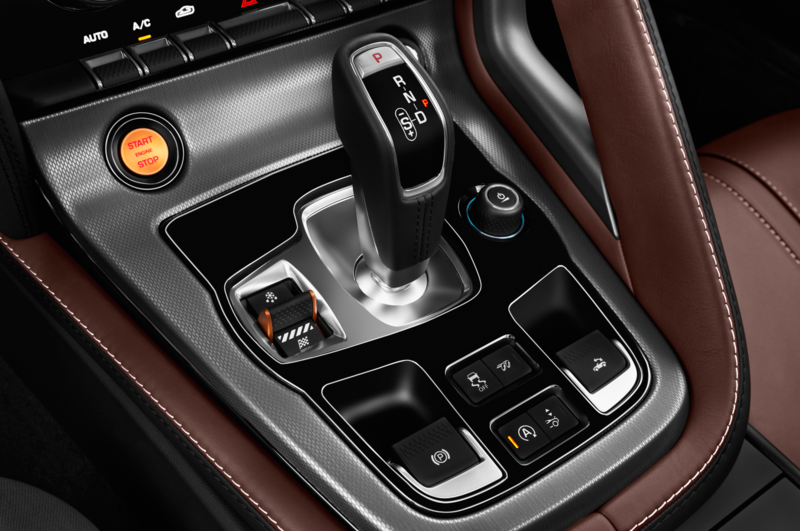 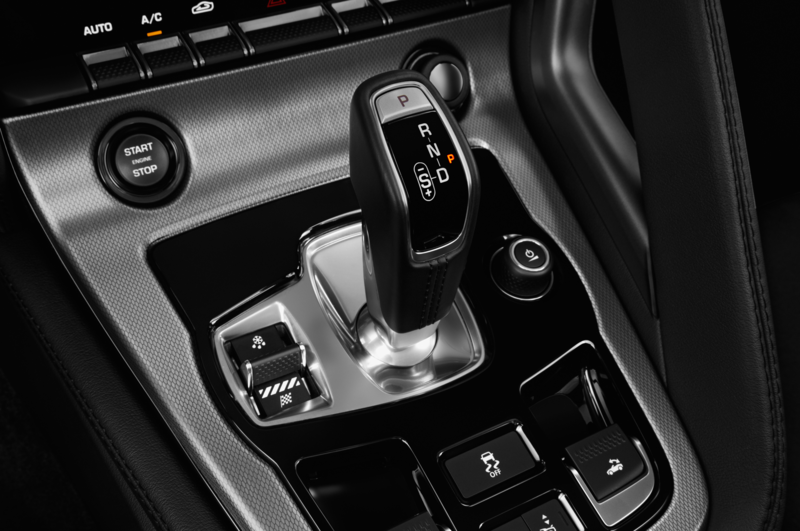 I find the regular steering mode is fine for normal driving, allowing a slower vehicle reaction to steering input. 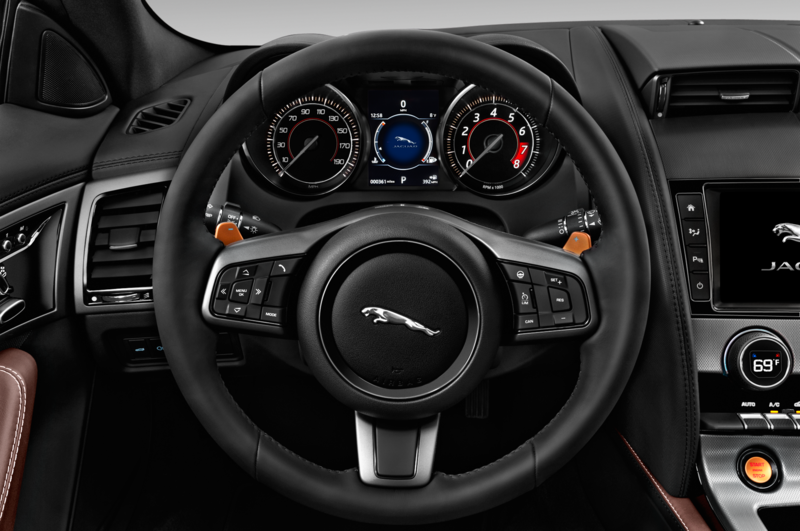 Dynamic mode has quicker steering, which I prefer for spirited/track driving. 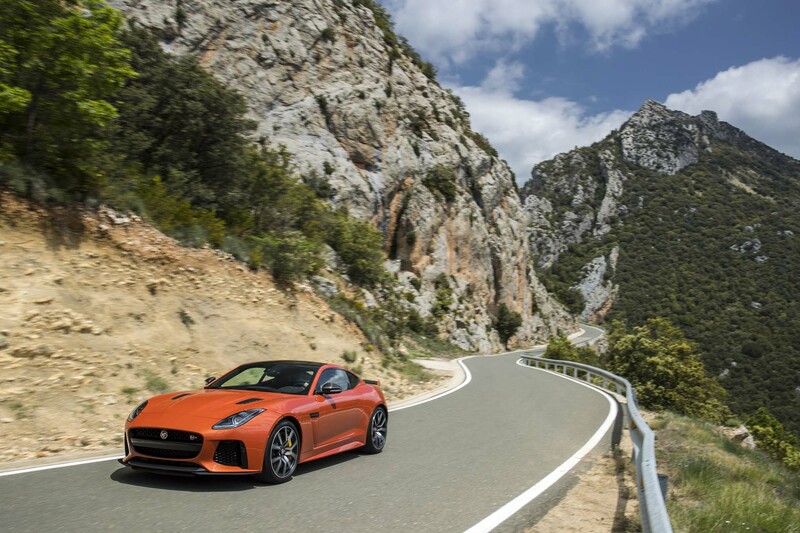 The afternoon drive home provides us with virtually deserted, twisty mountain roads. 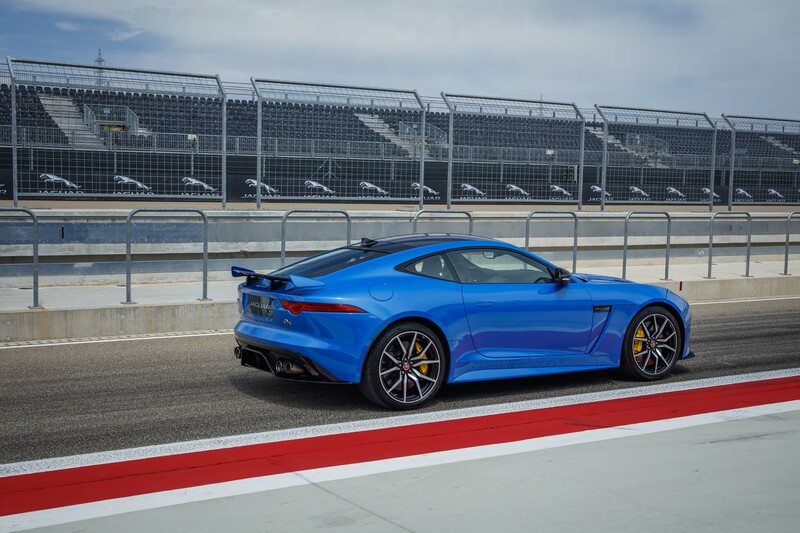 I take advantage of this to see how the SVR handles some spirited performance driving in a real-world situation away from the racetrack. 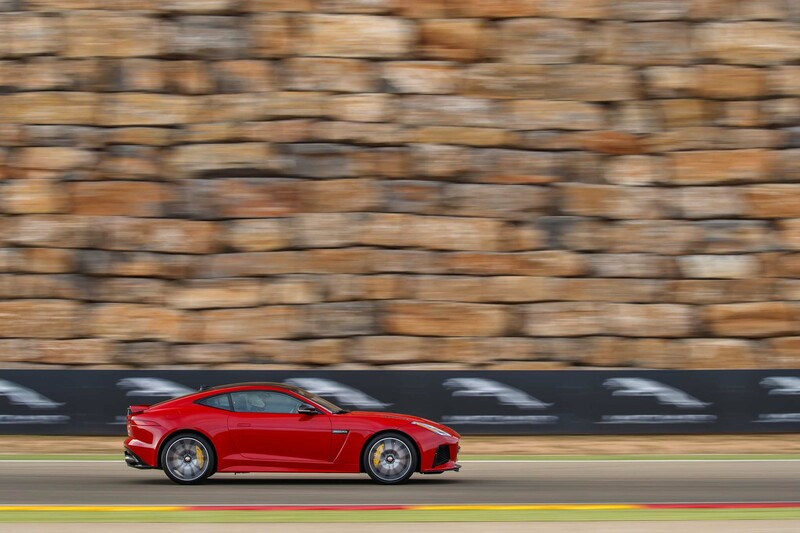 In these conditions there is no brake fade, despite purposely my using left foot to brake, which always creates more heat. 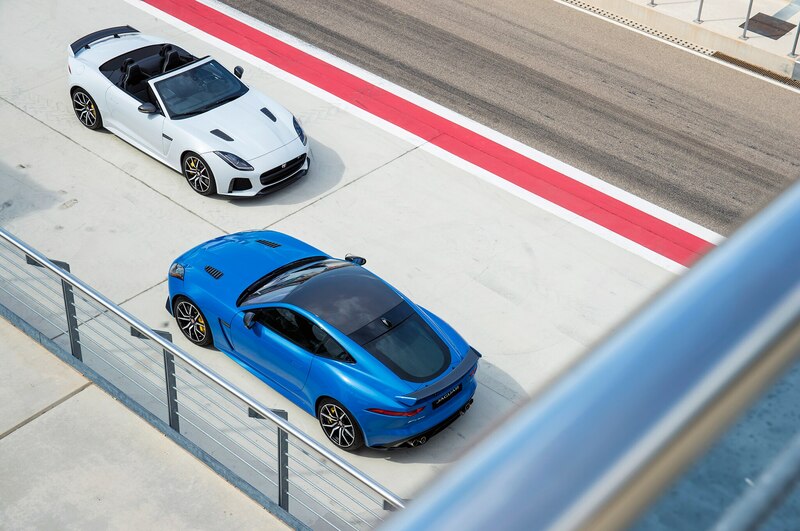 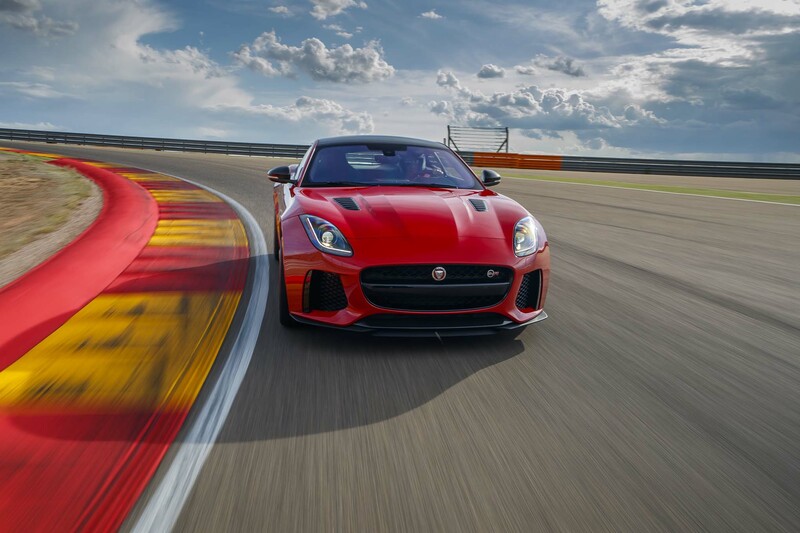 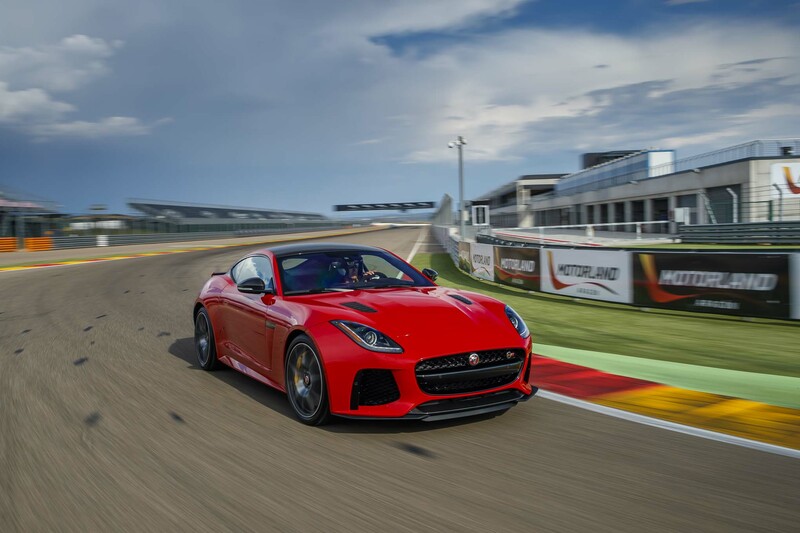 Jaguar requested we not disable all the handling nannies while on the track, which I respected, and I kept them on for the street, knowing most actual F-Type drivers will as well. 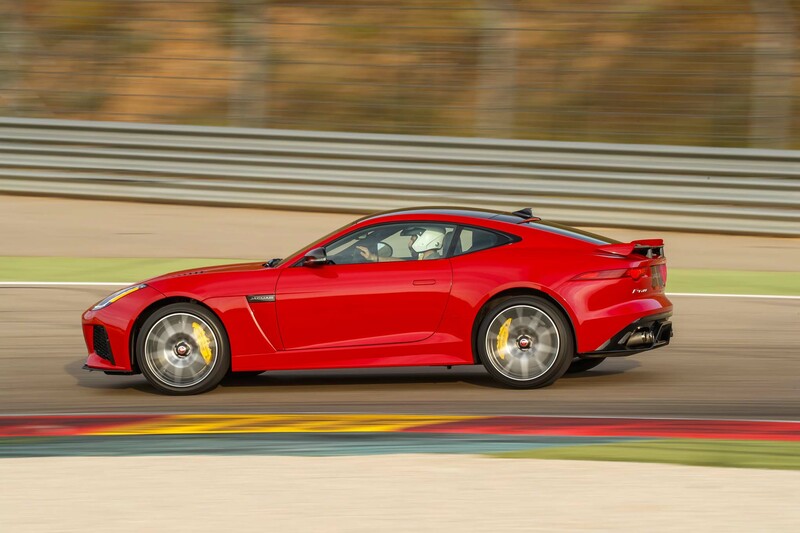 The Track mode for the DSC was the most fun and had little intrusion, even when the car was quite sideways. 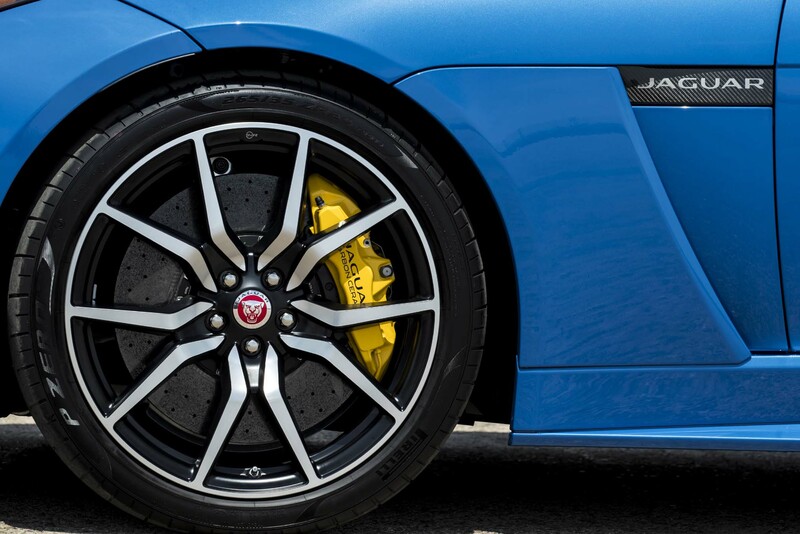 Knowing the limits from the brief track drive gave me the confidence to safely work the SVR very hard. 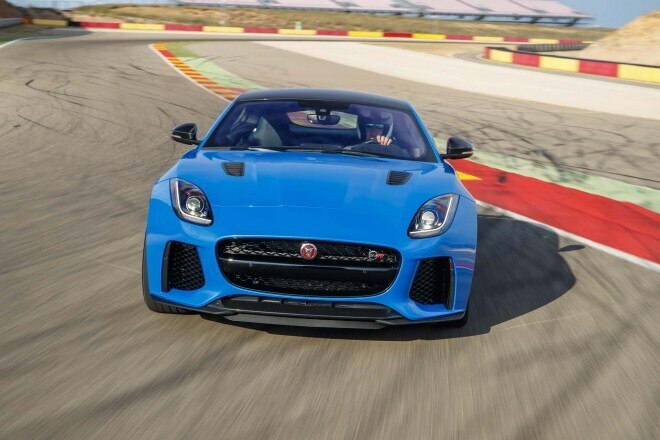 And if a car has the ability to go this quick, it had better be able to stop like it opened a parachute and give its driver the ability/insurance to change his mind late in a turn. 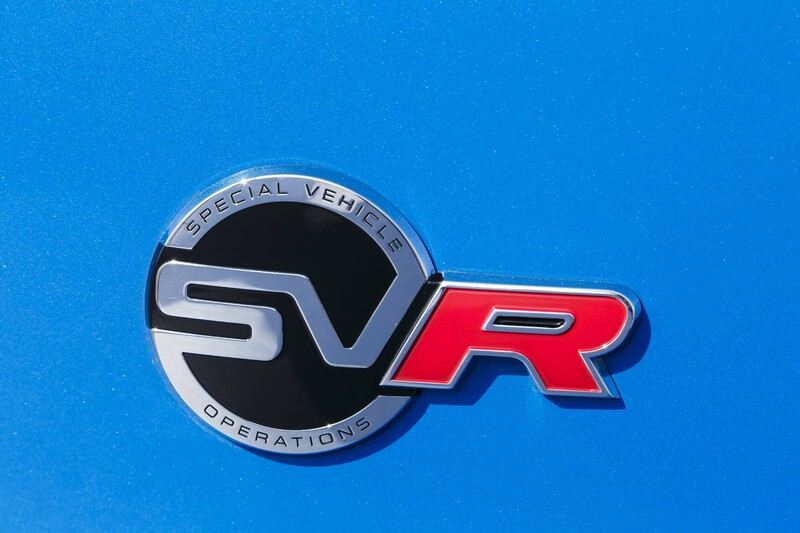 The SVR has this covered. 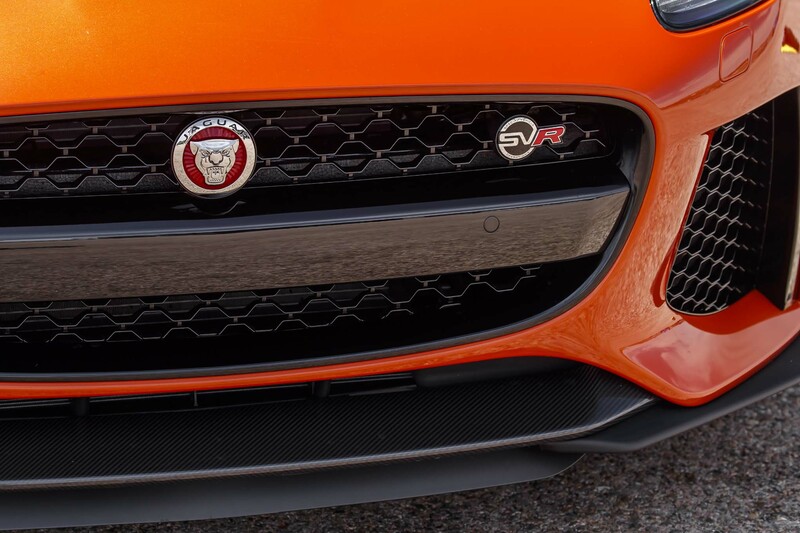 As a first impression, this was a good one. 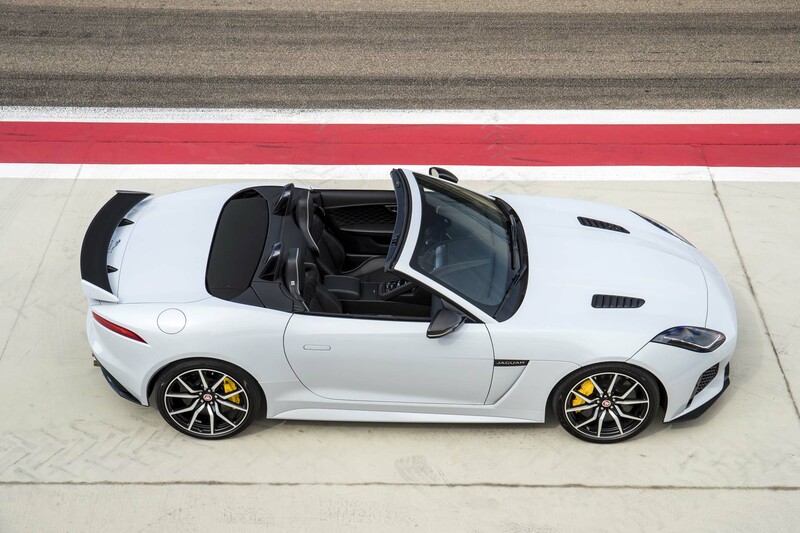 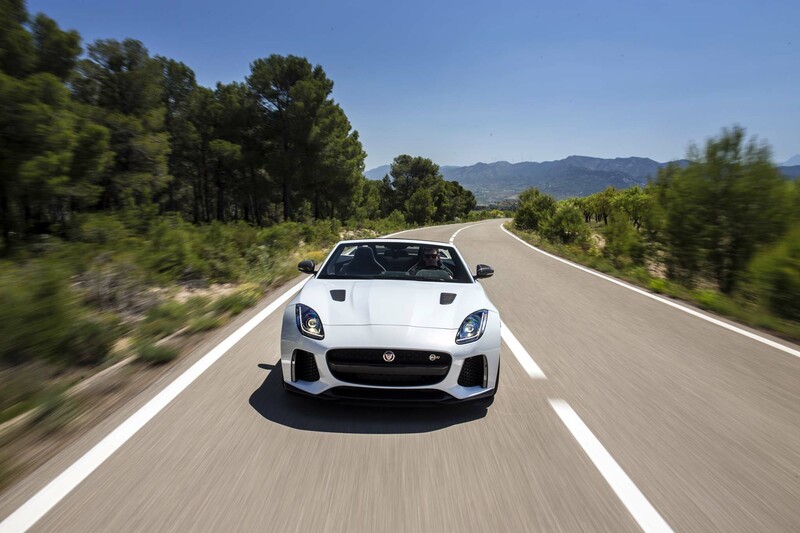 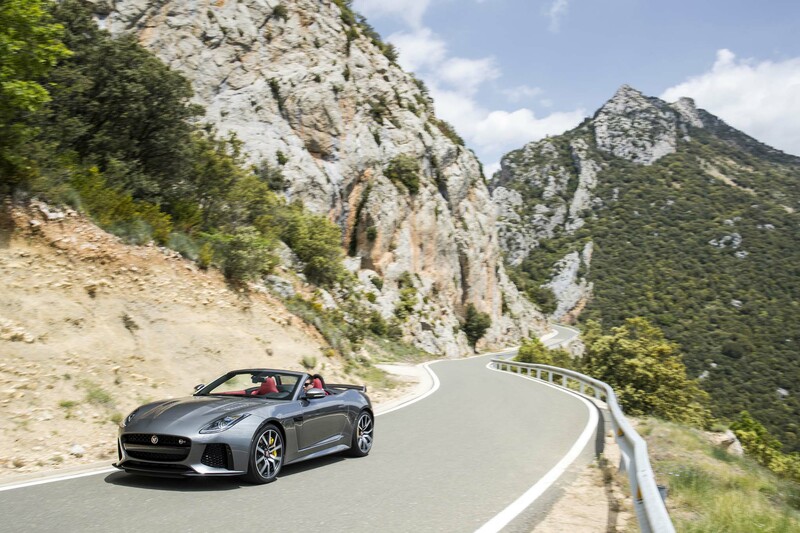 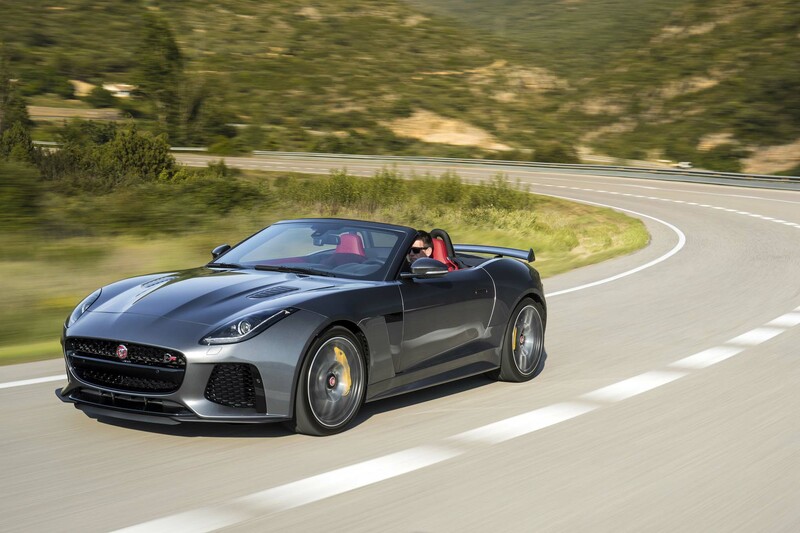 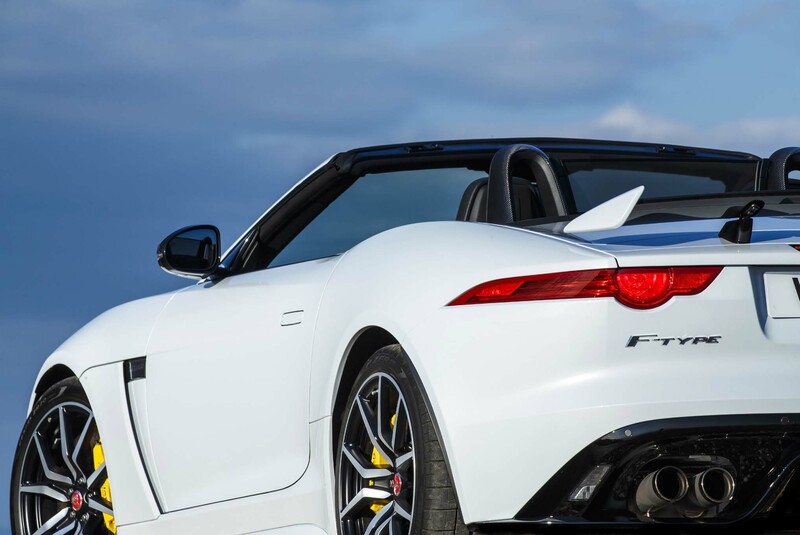 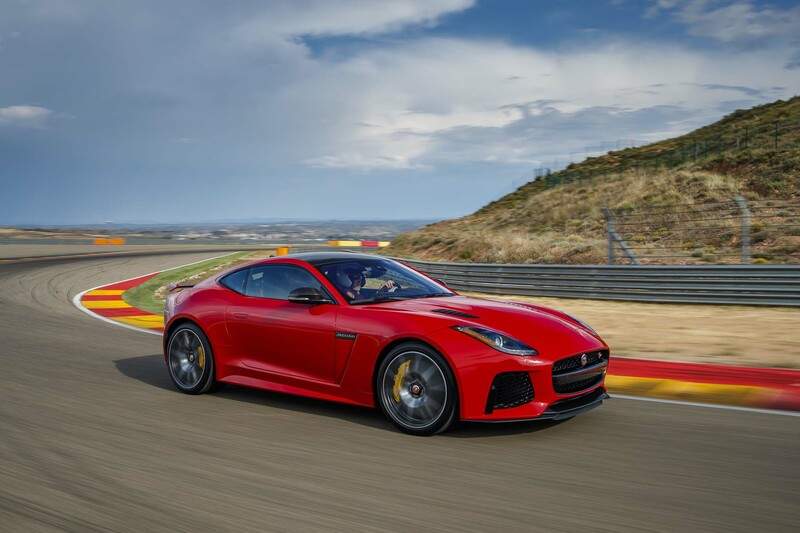 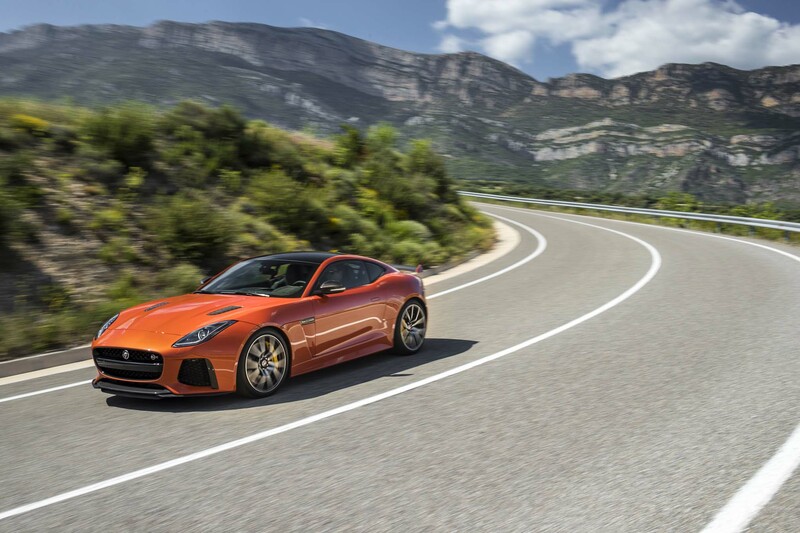 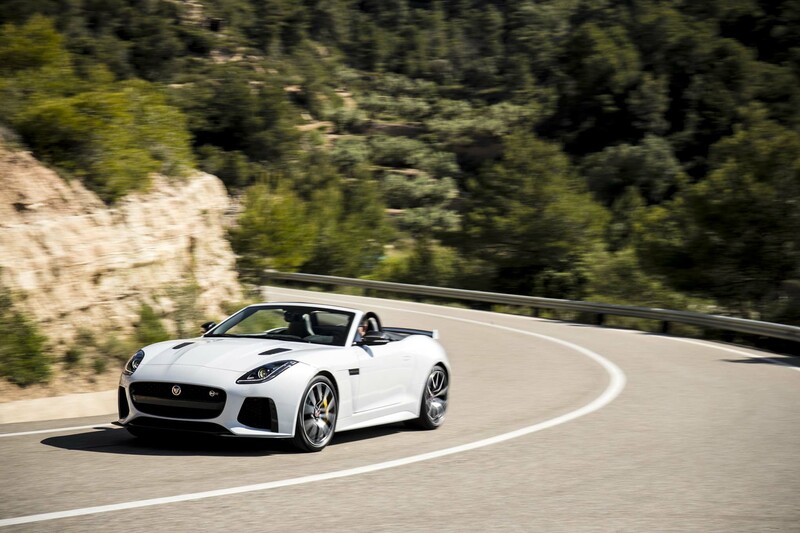 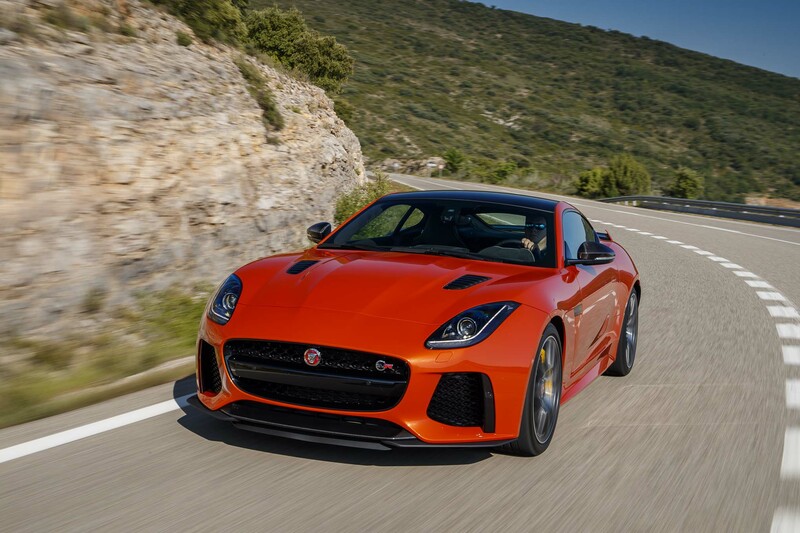 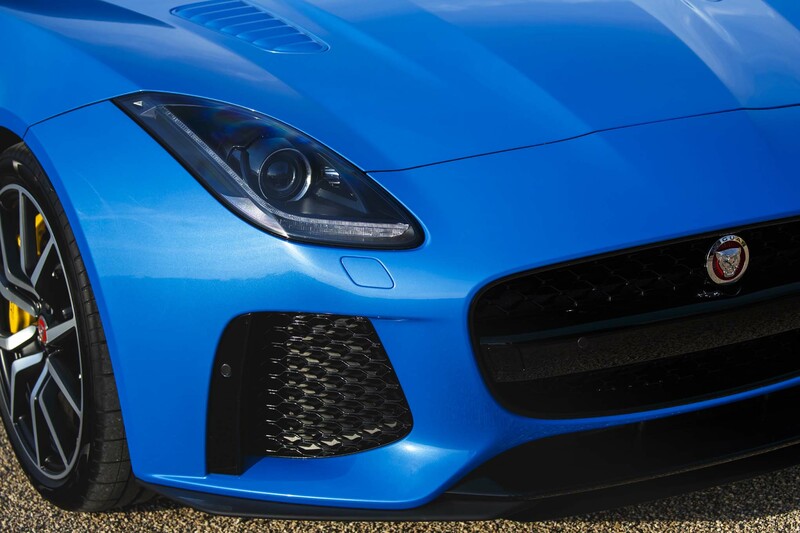 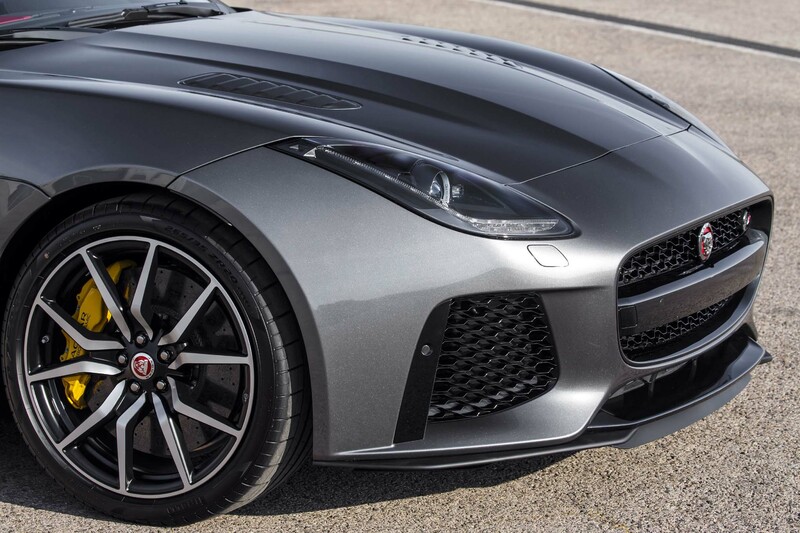 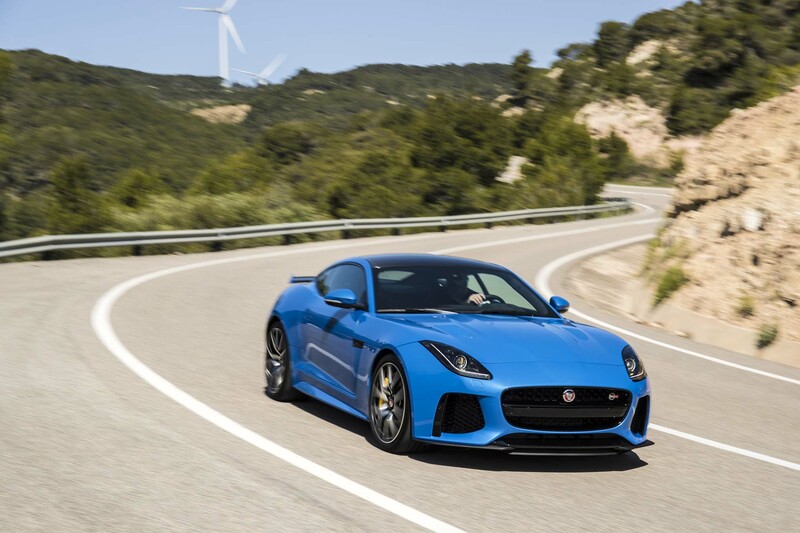 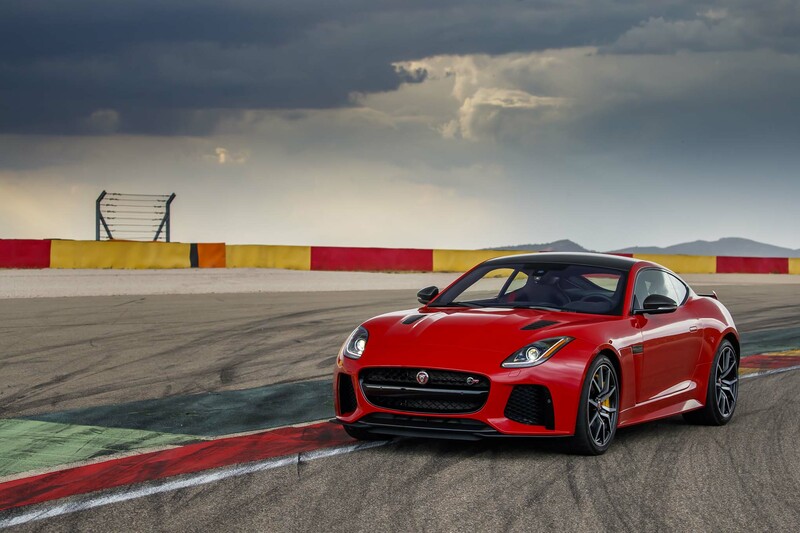 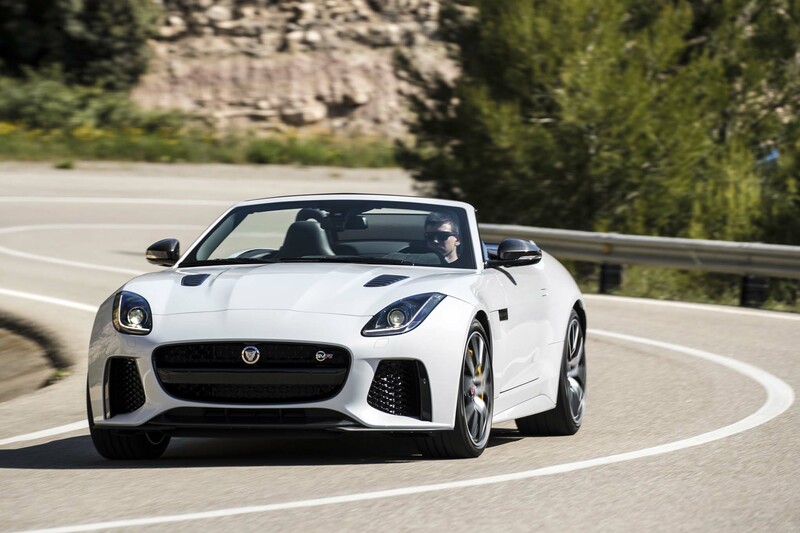 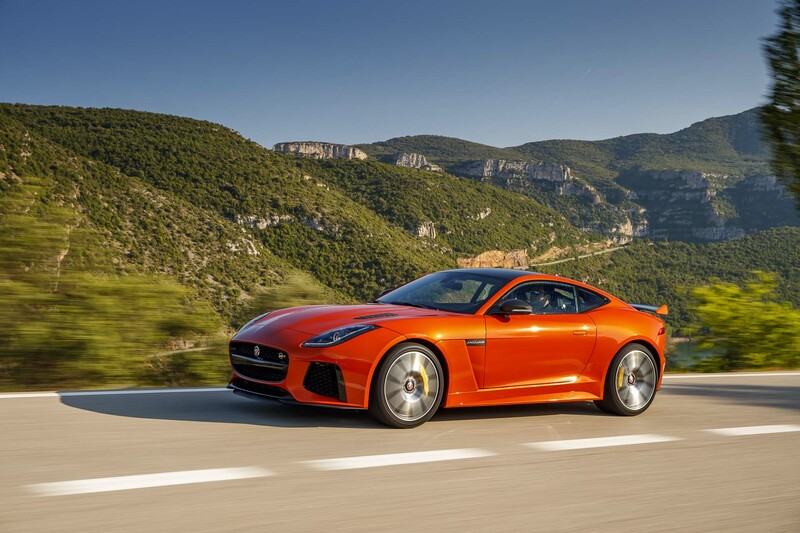 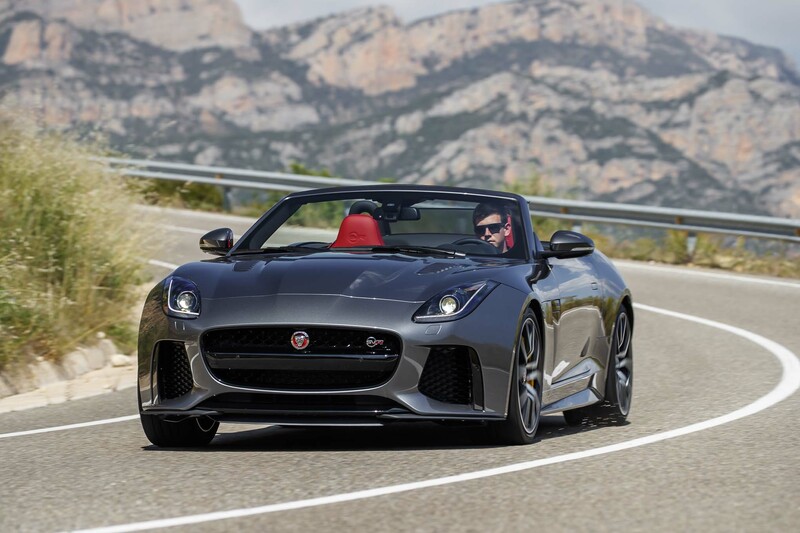 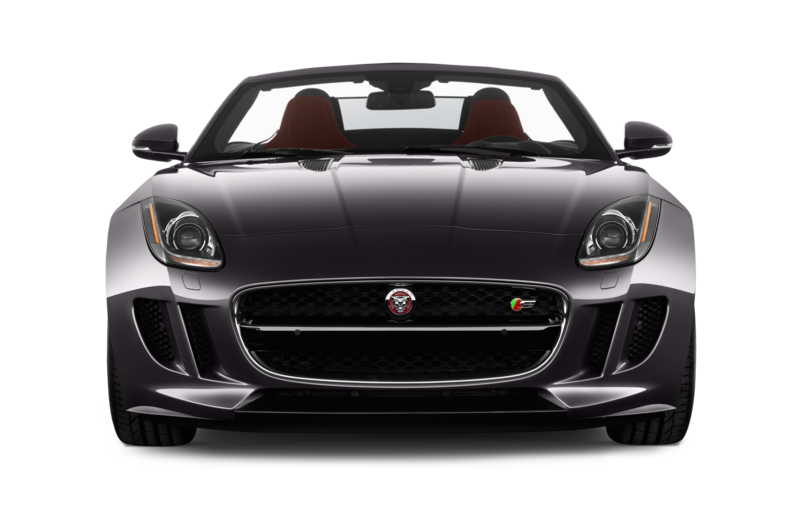 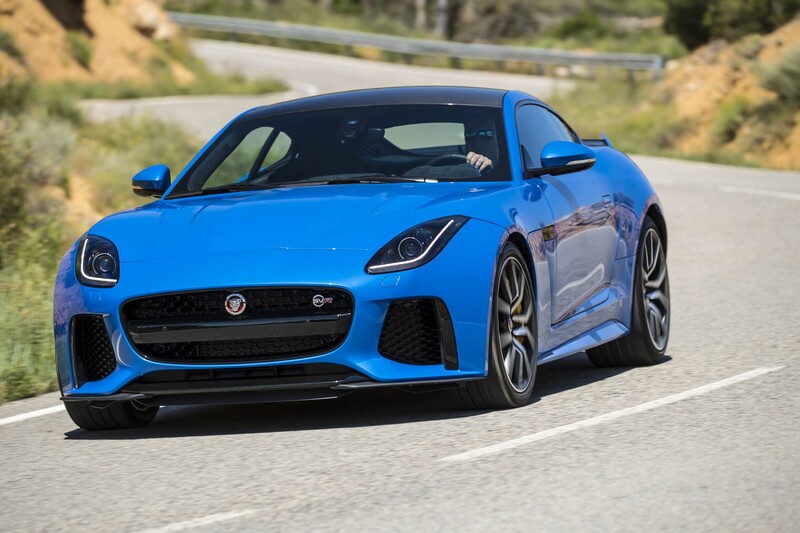 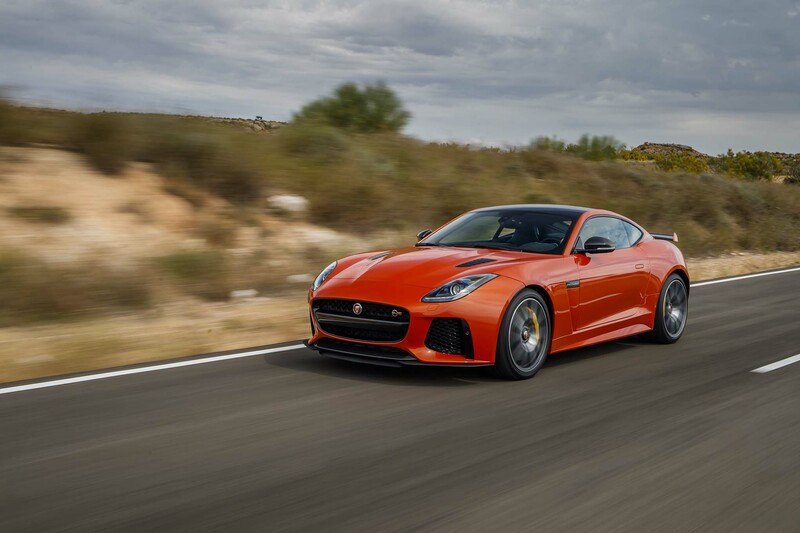 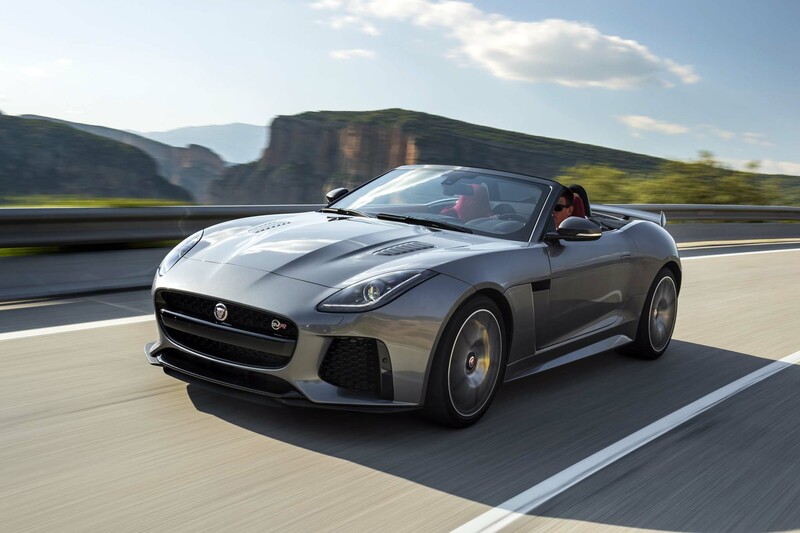 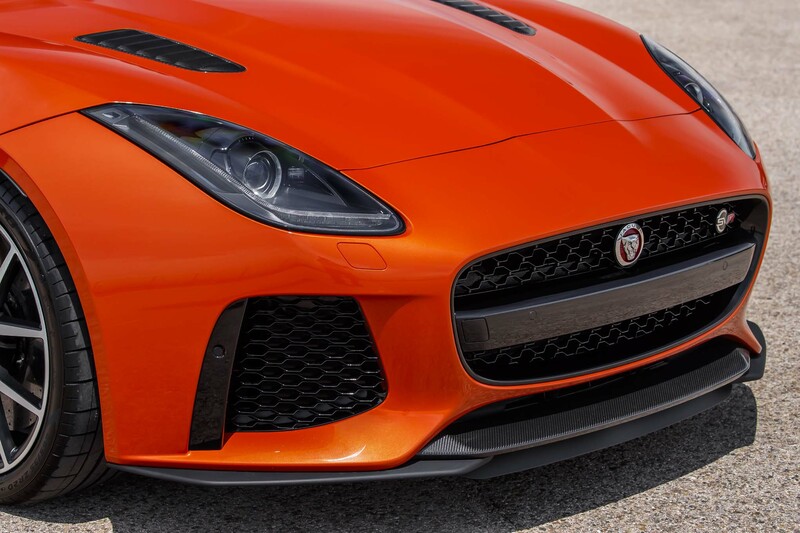 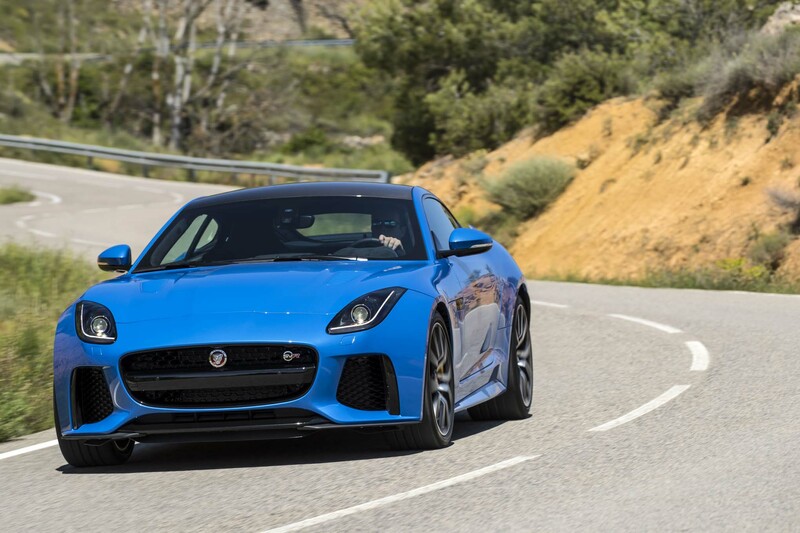 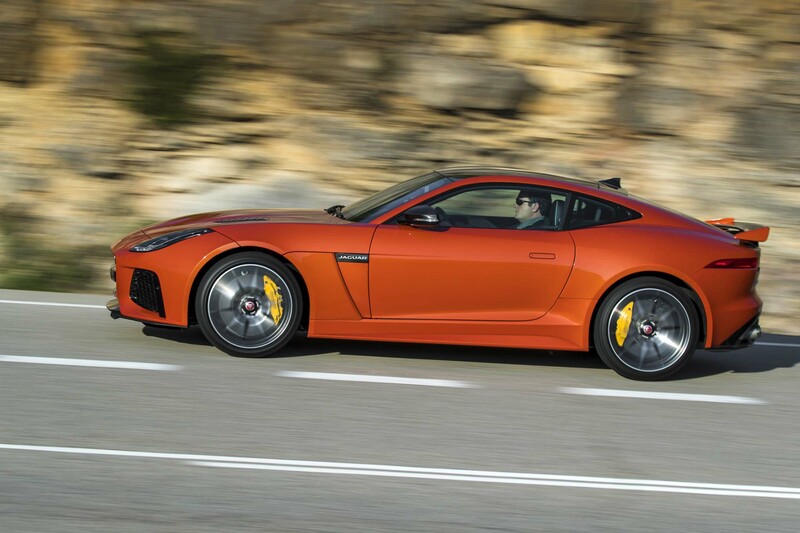 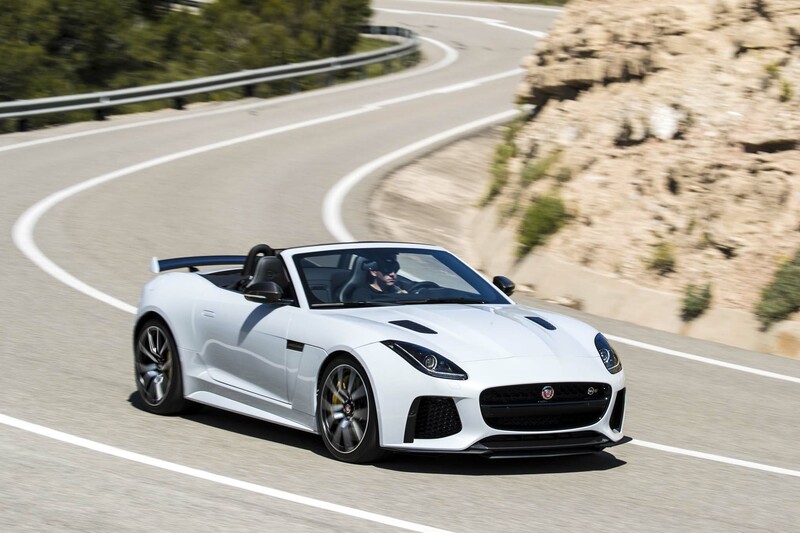 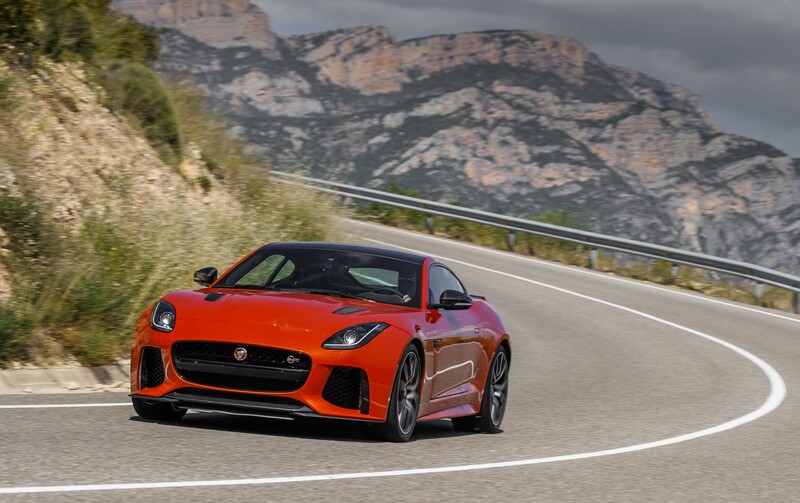 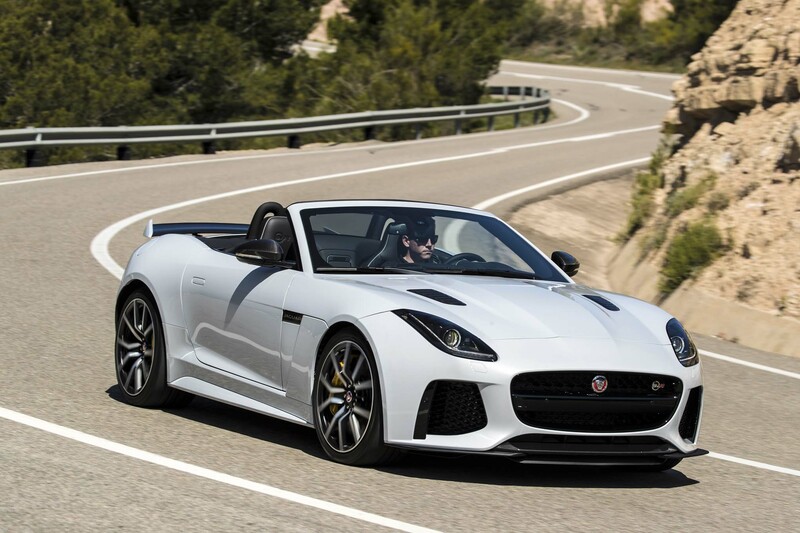 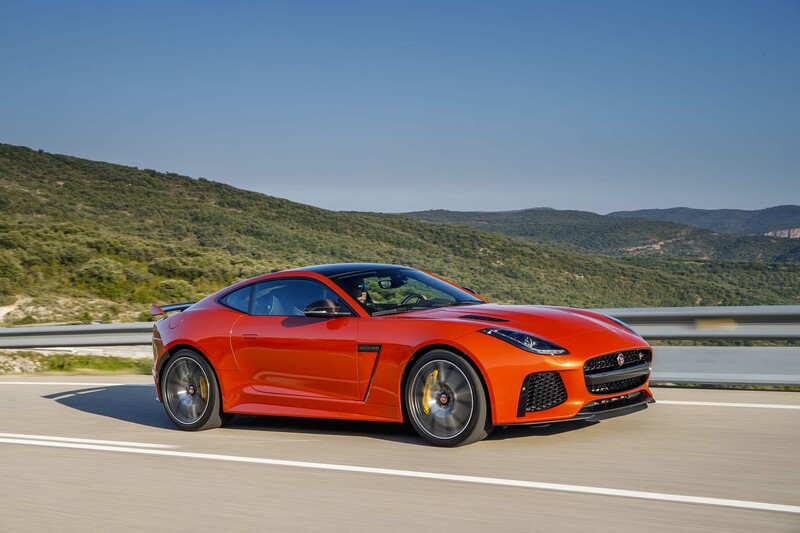 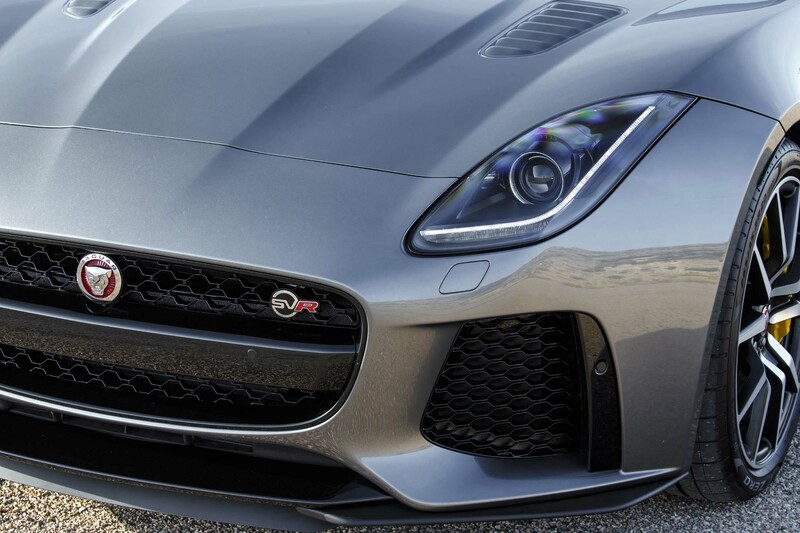 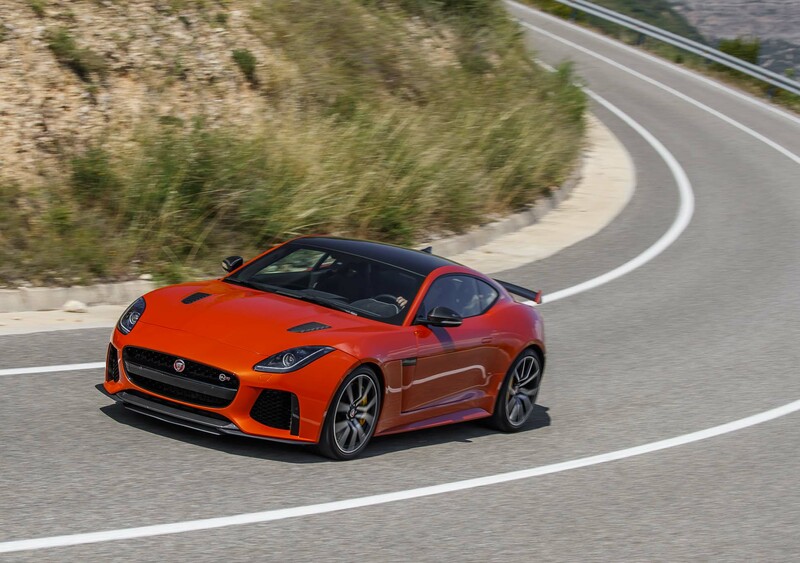 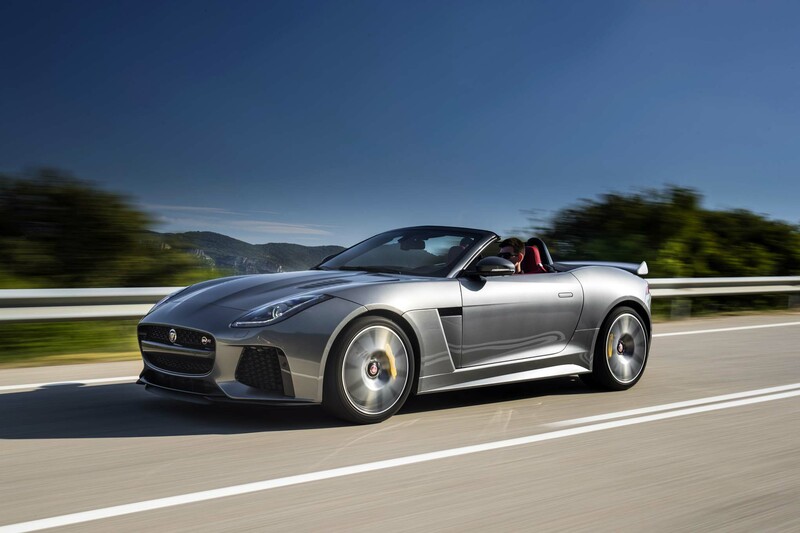 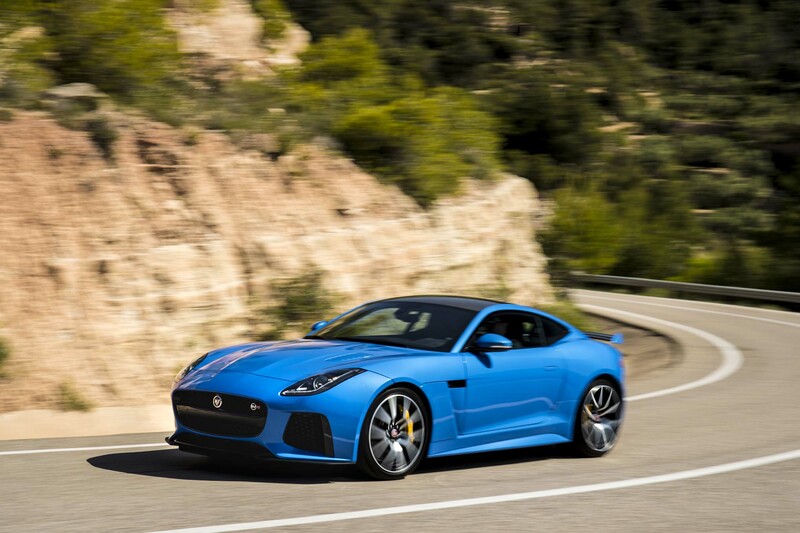 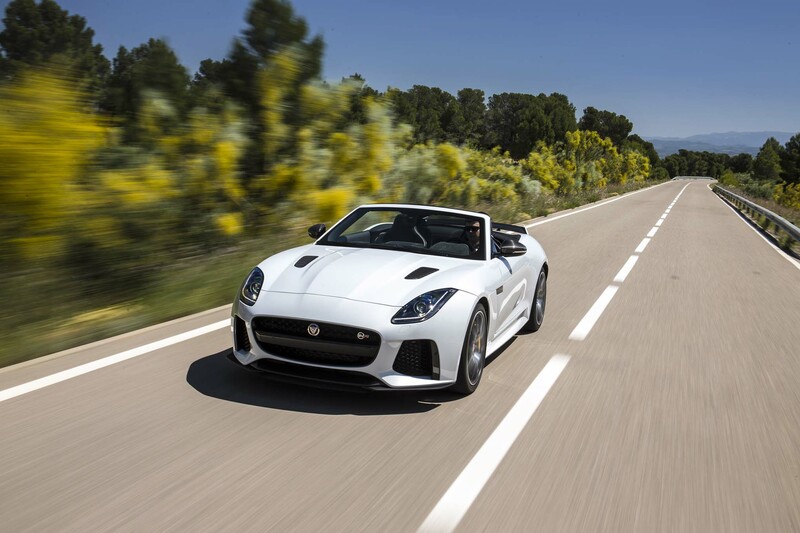 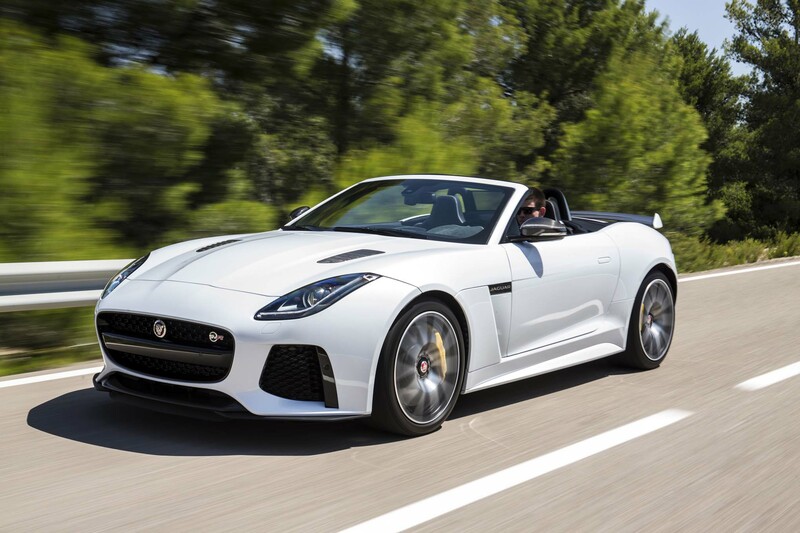 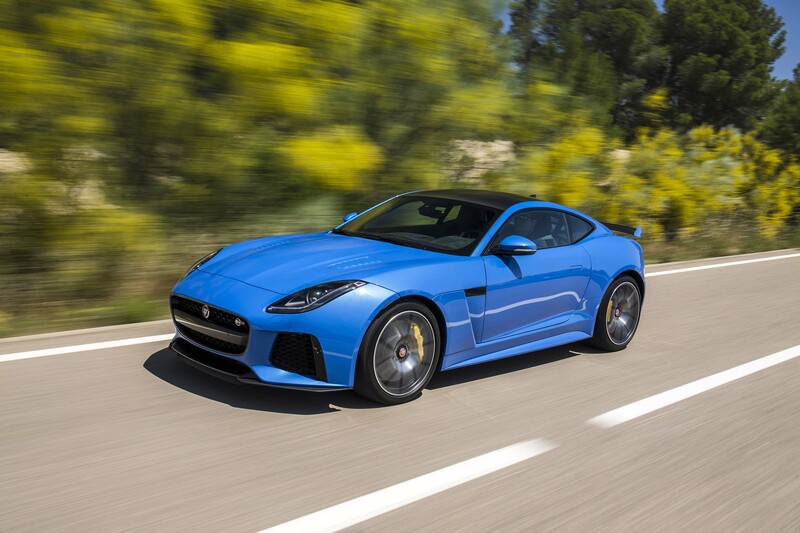 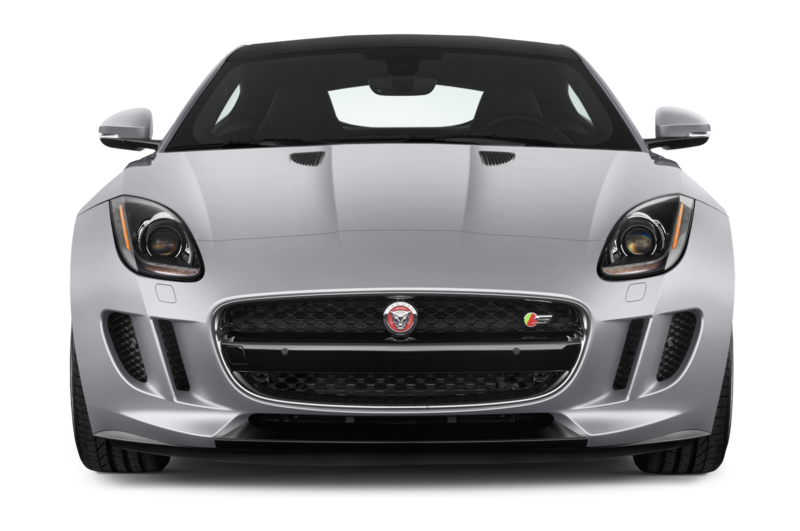 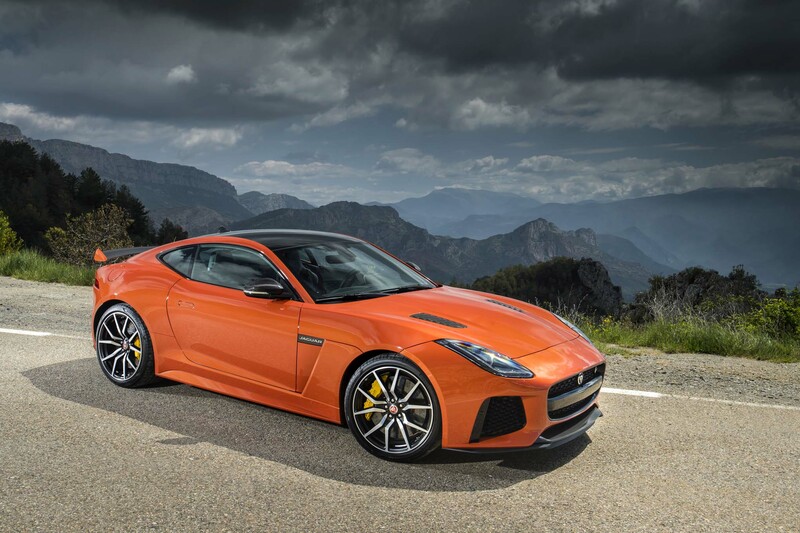 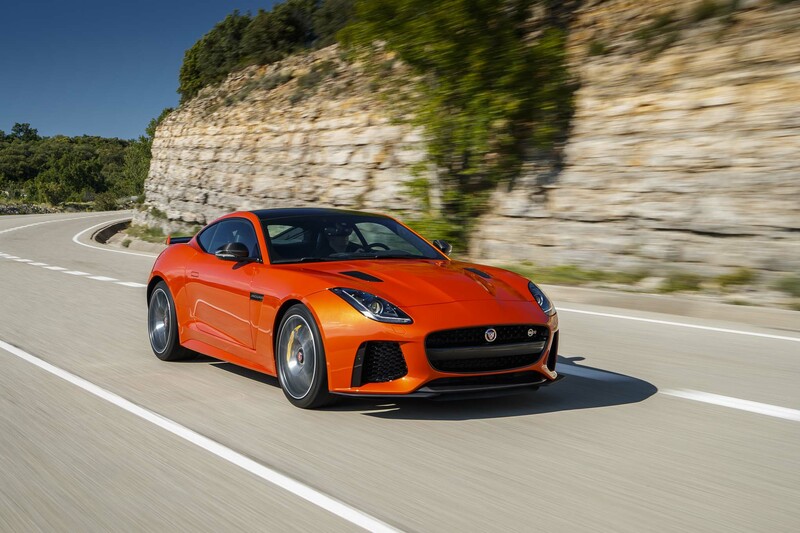 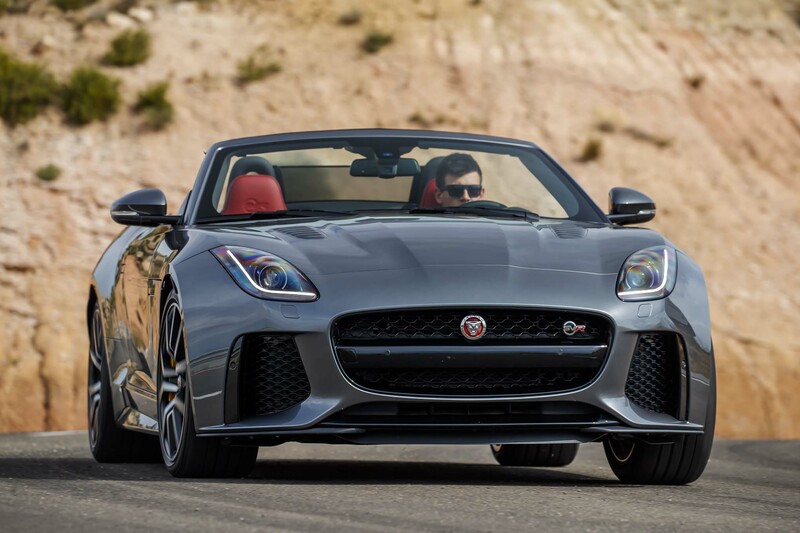 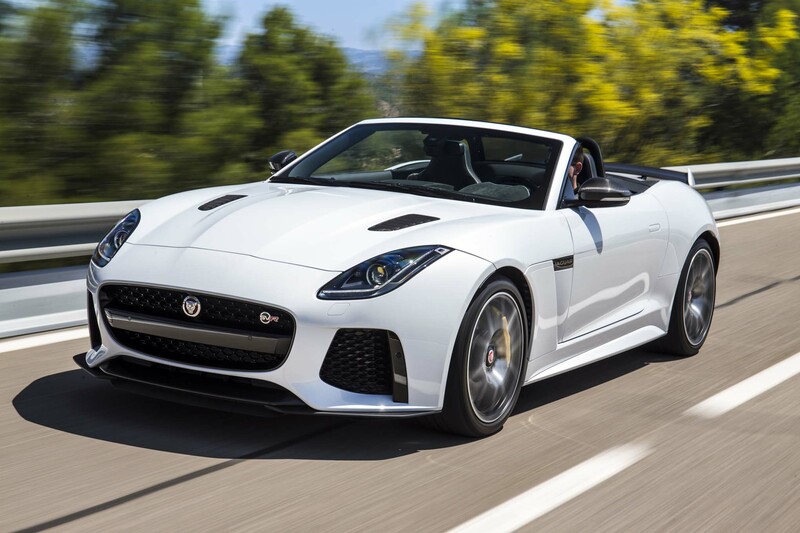 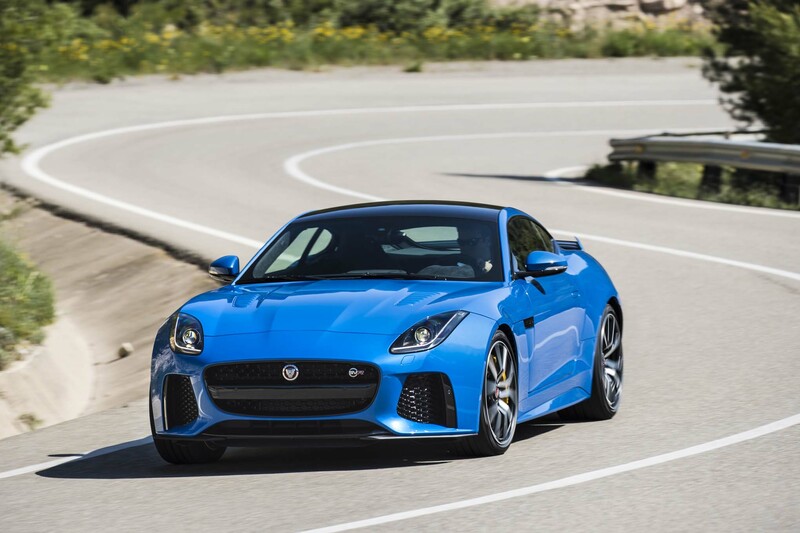 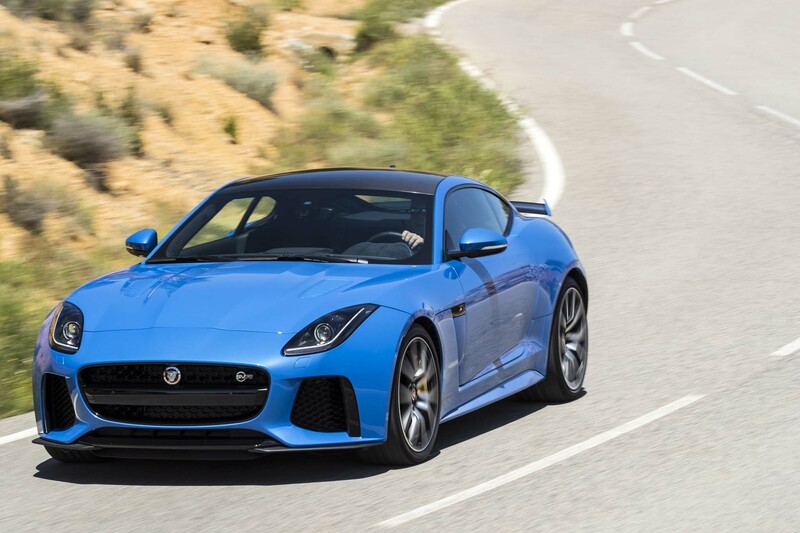 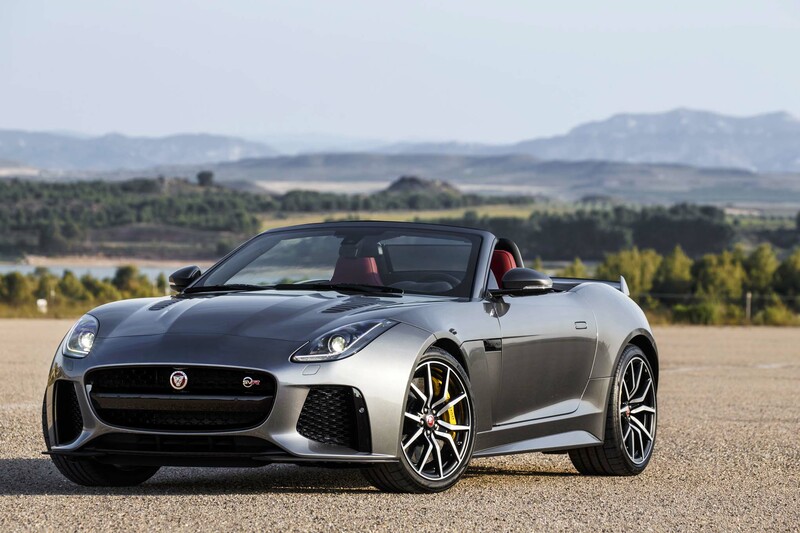 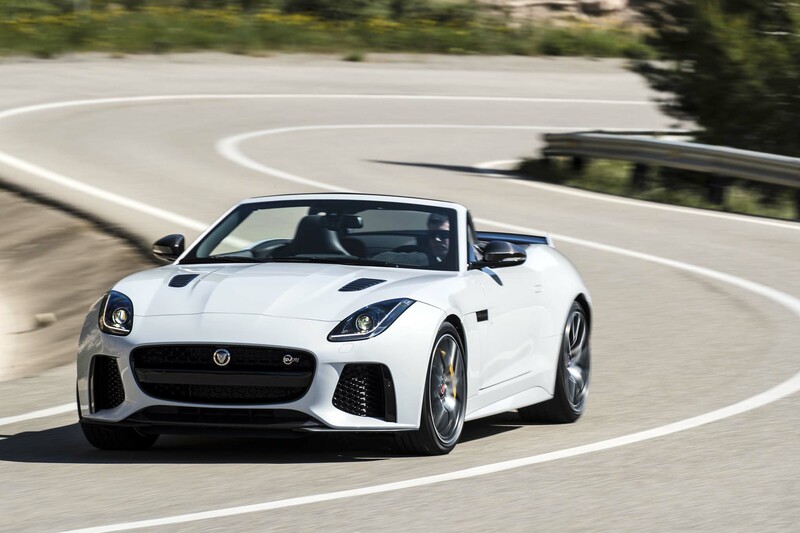 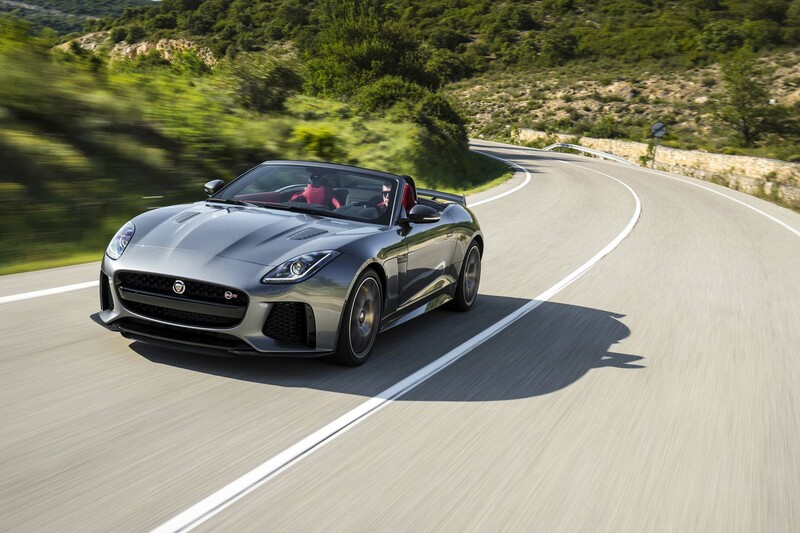 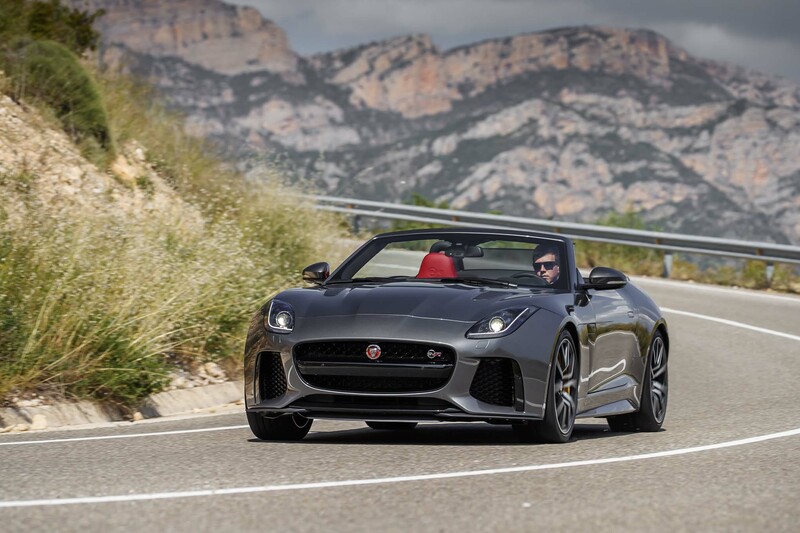 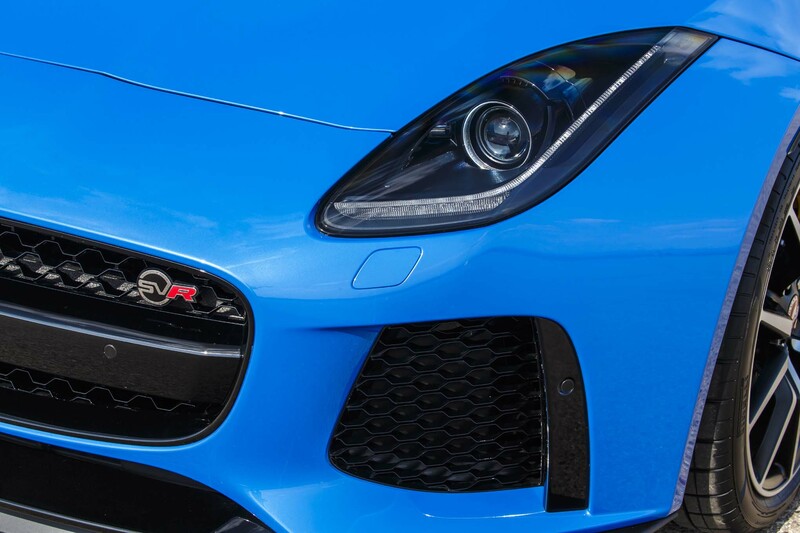 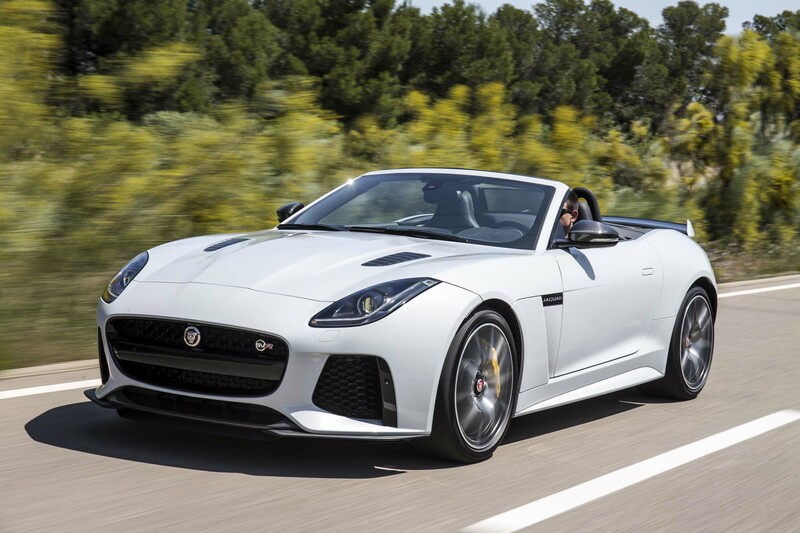 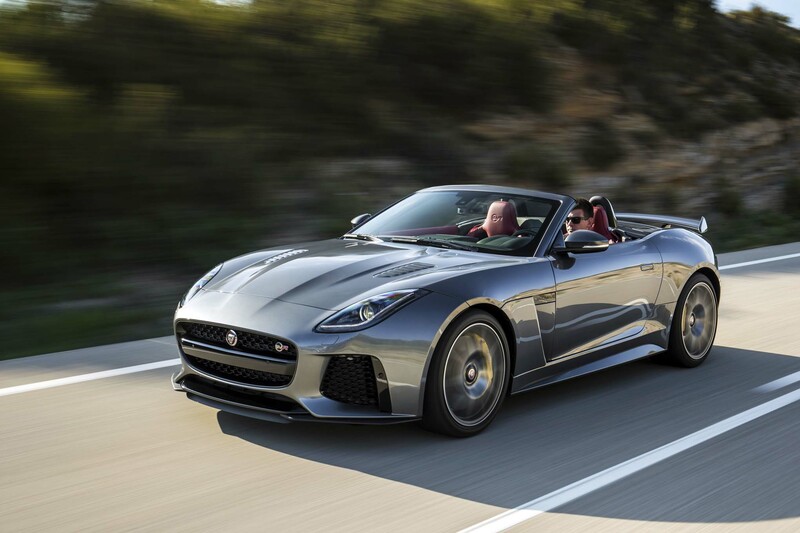 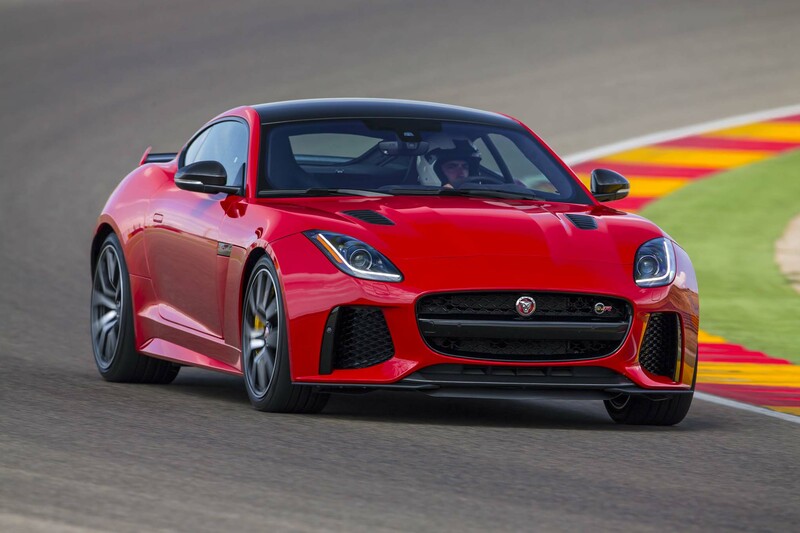 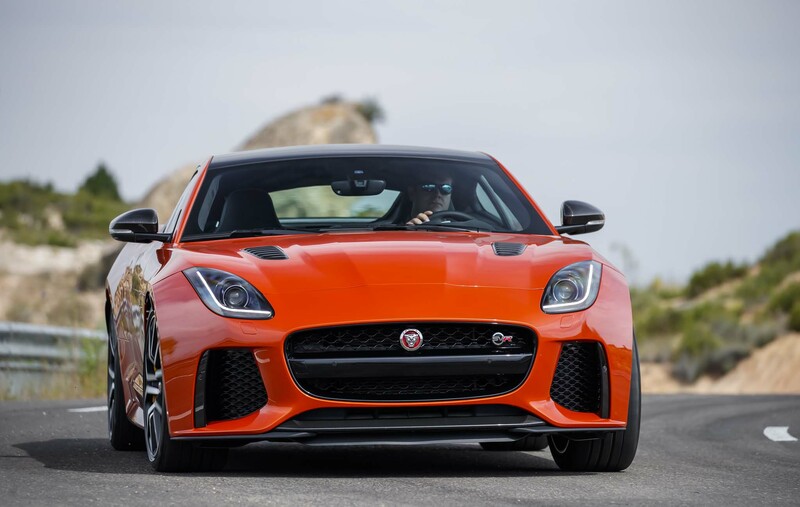 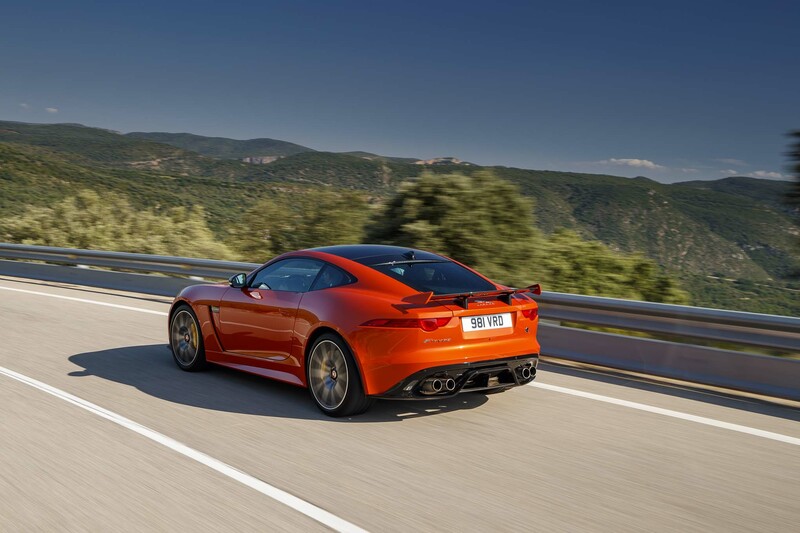 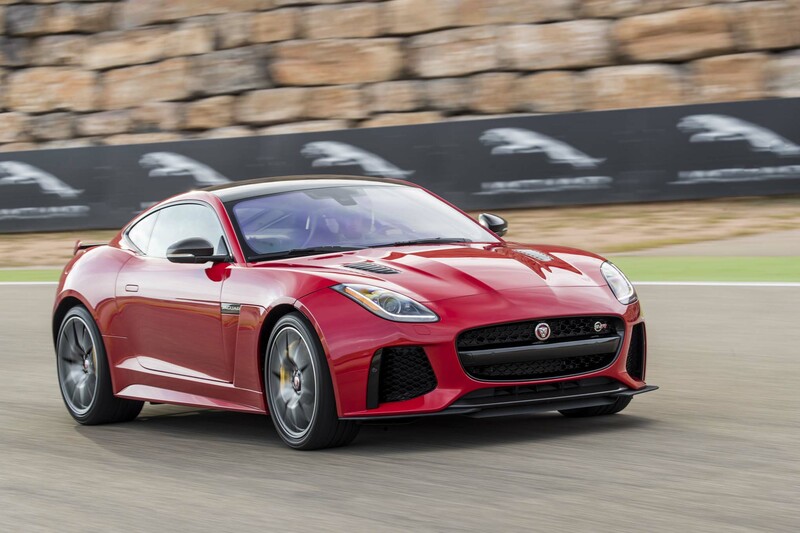 The 2017 Jaguar F-Type SVR should appeal to anyone looking at a base Audi R8, Porsche 911 Turbo, and several offerings from Mercedes-AMG. 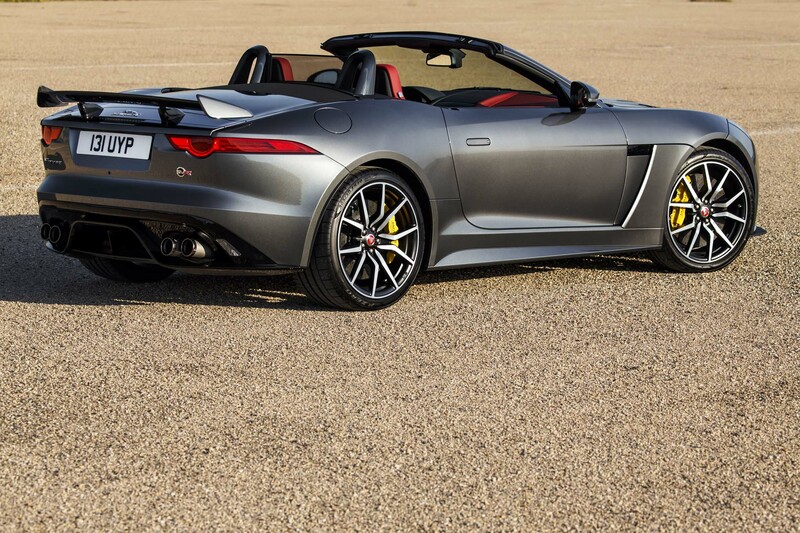 It should hang with, say, a Corvette Z51 on the track and be much quicker on the road. 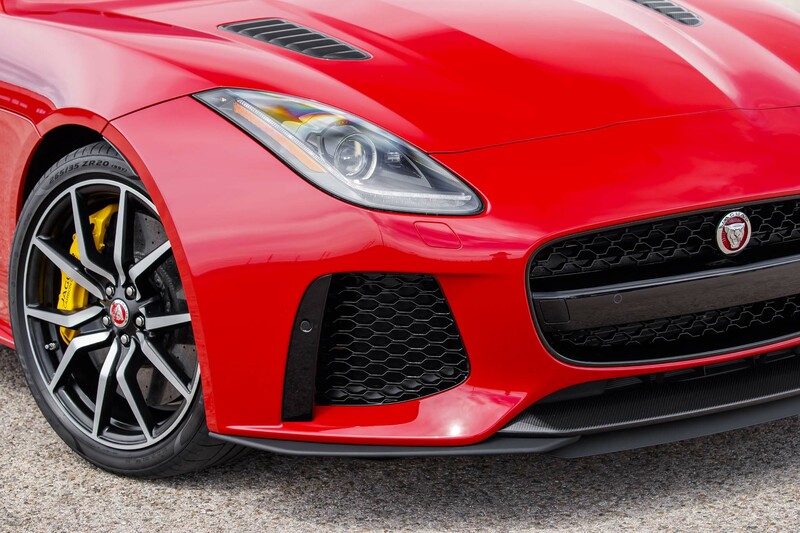 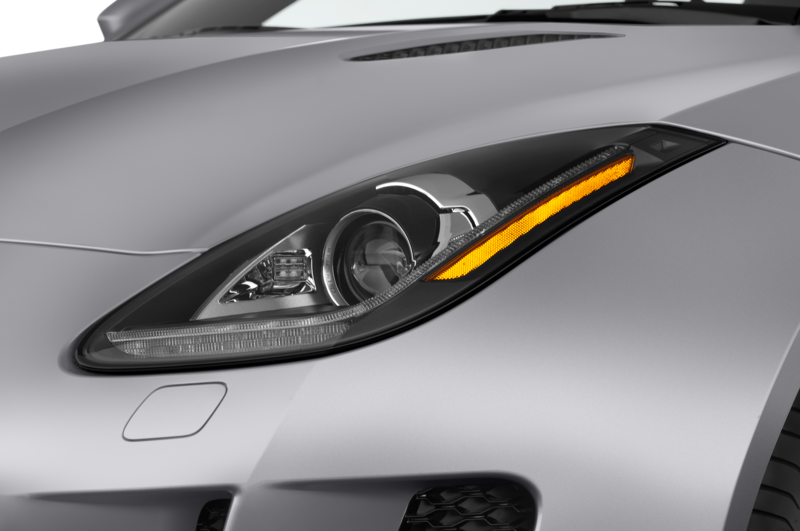 A Corvette Z06, especially with the Z07 package, will be quicker on the track, but the F-Type is a more refined piece, reflected in its significantly higher price-point than the Chevys. 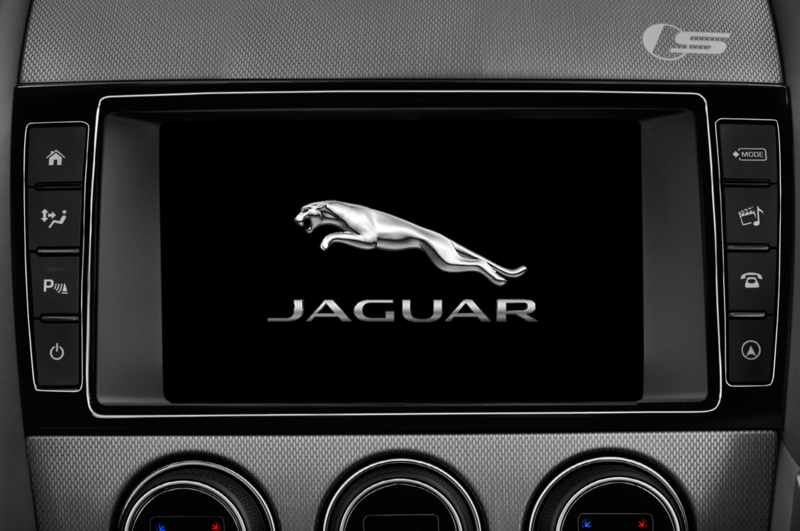 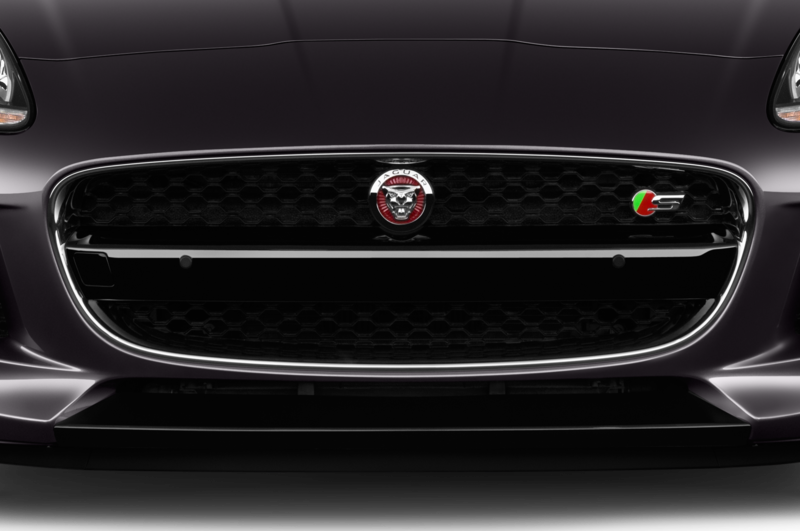 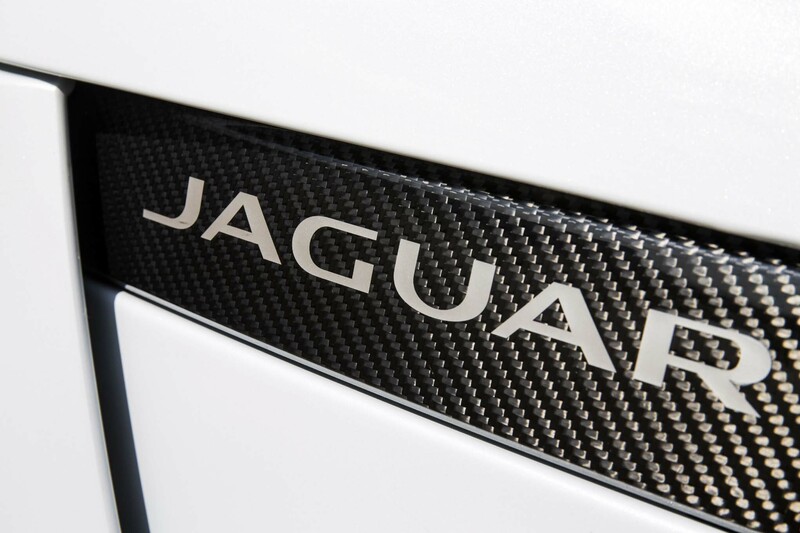 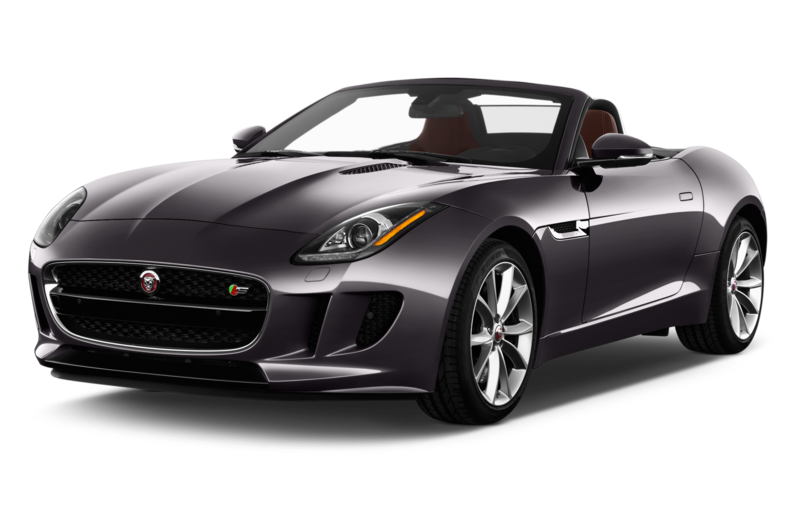 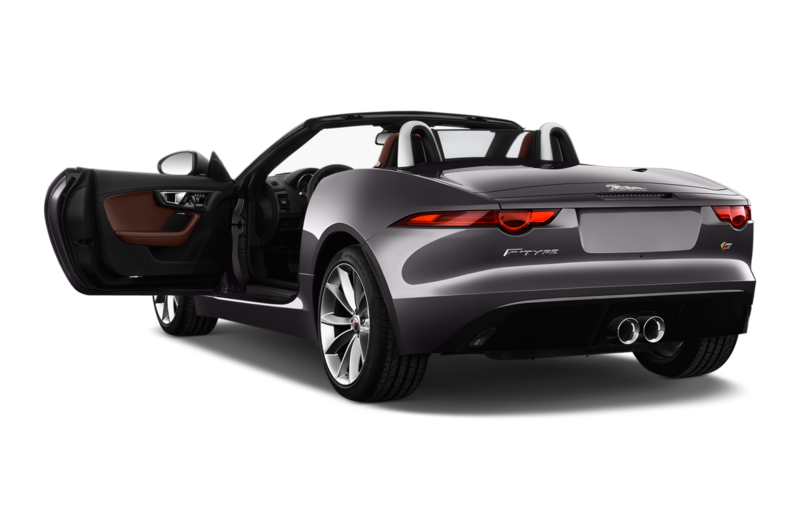 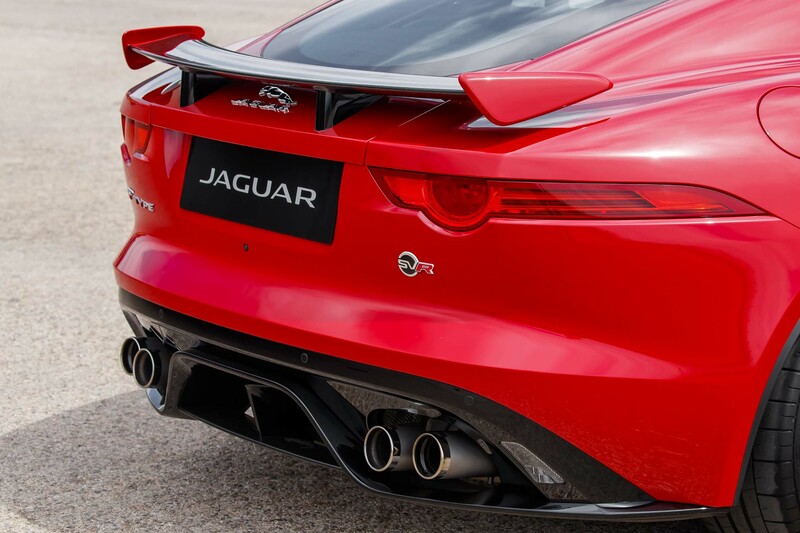 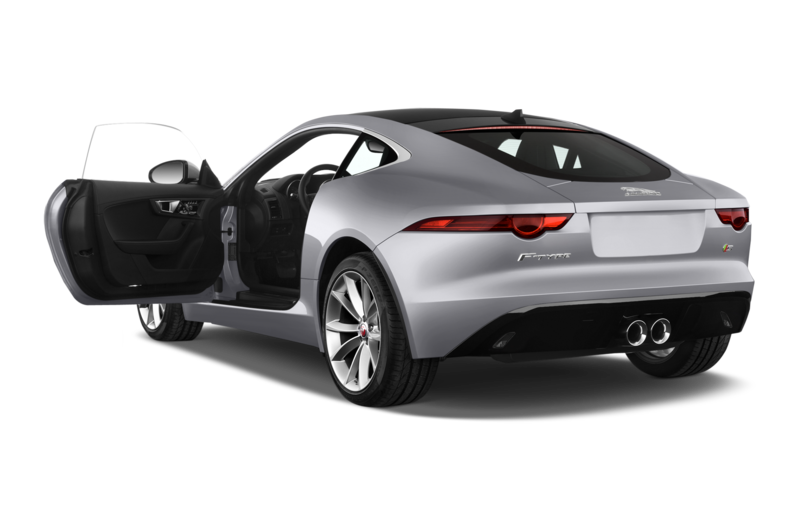 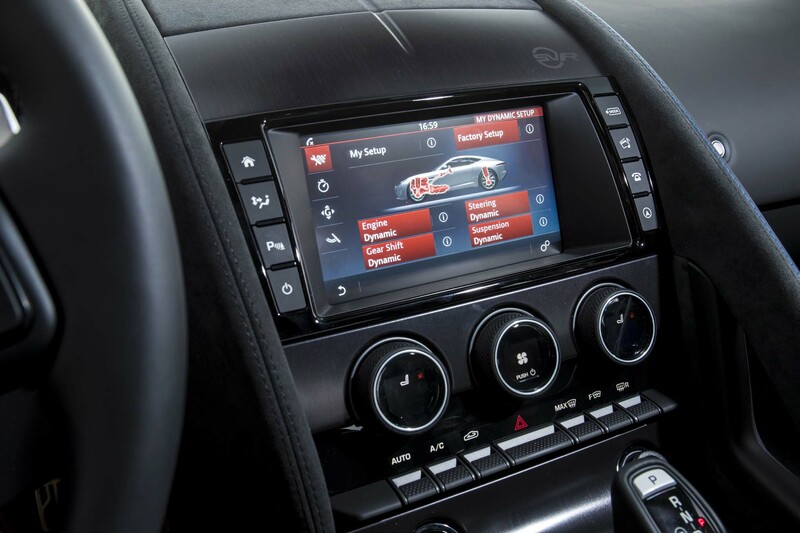 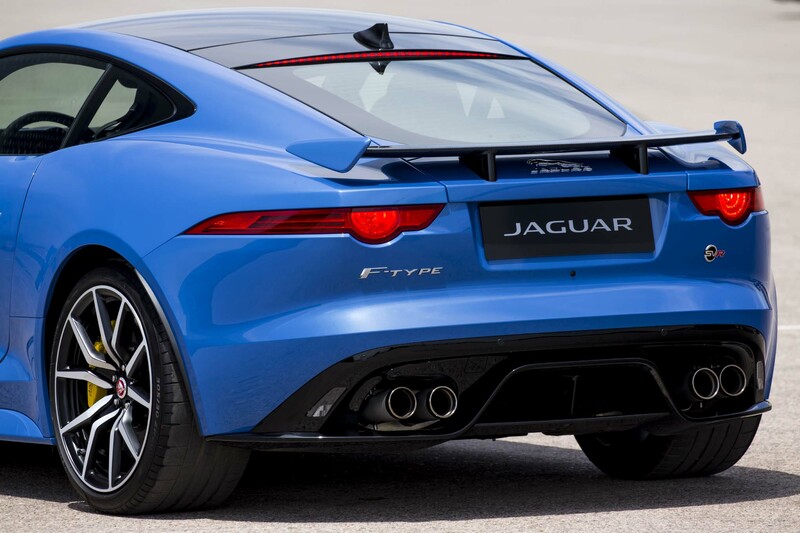 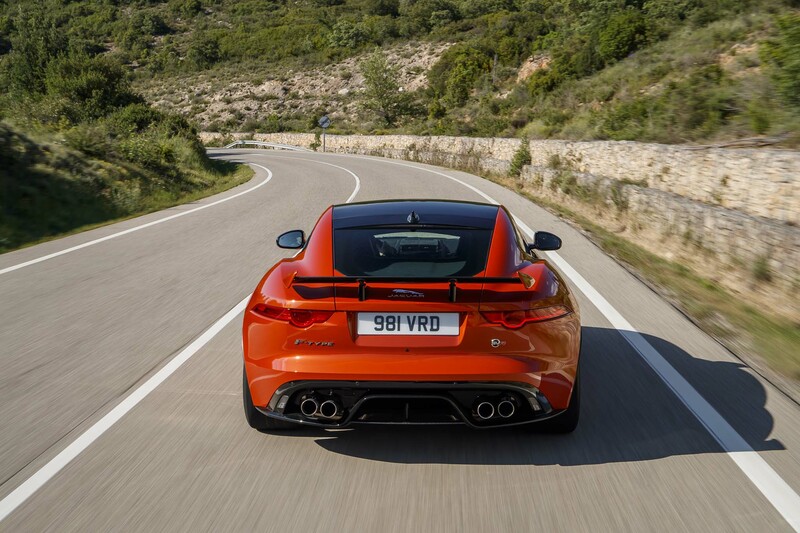 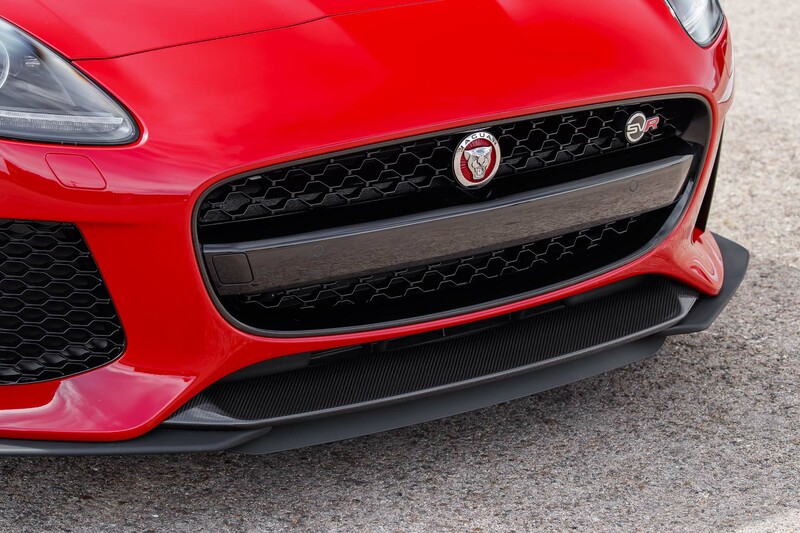 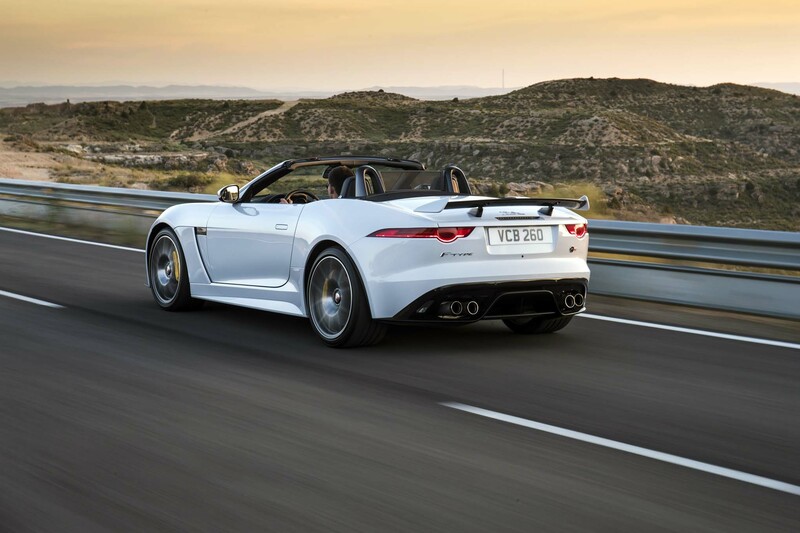 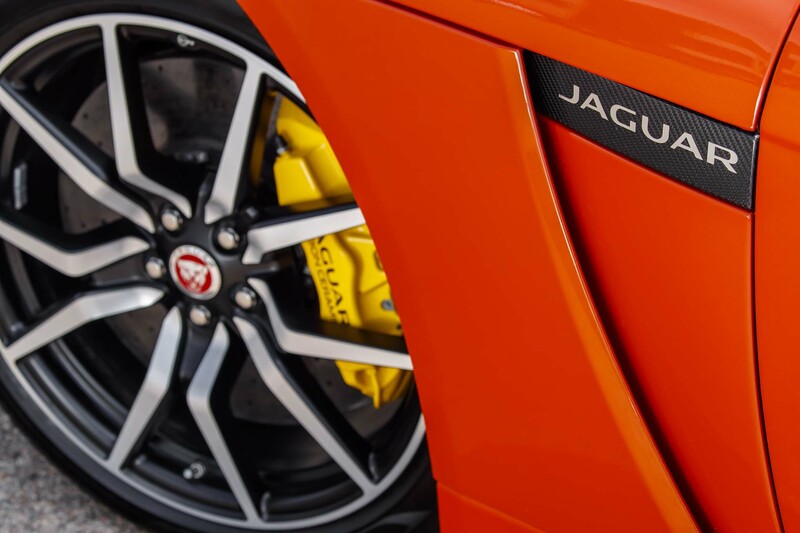 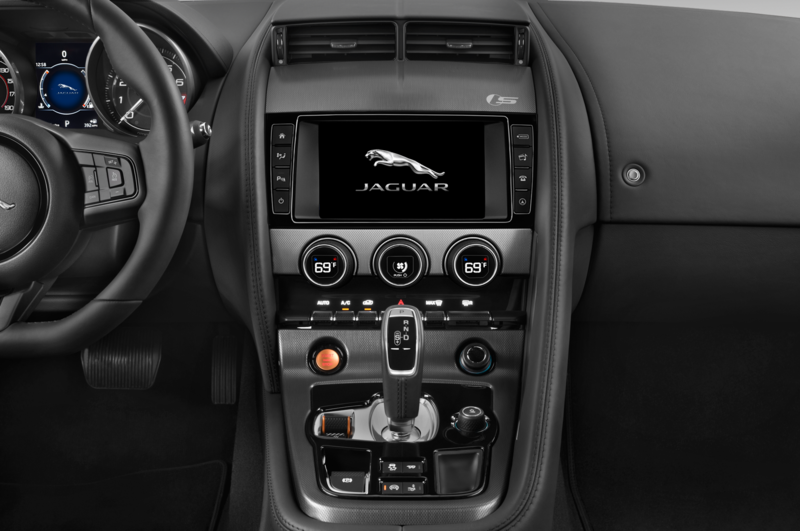 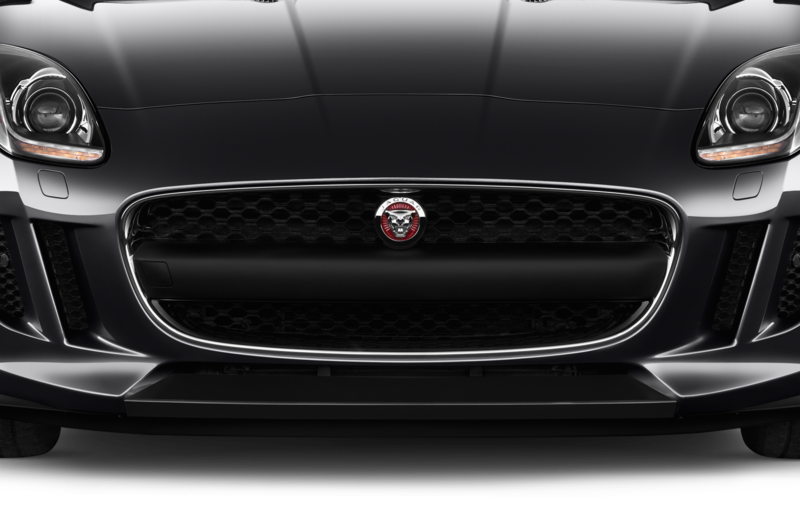 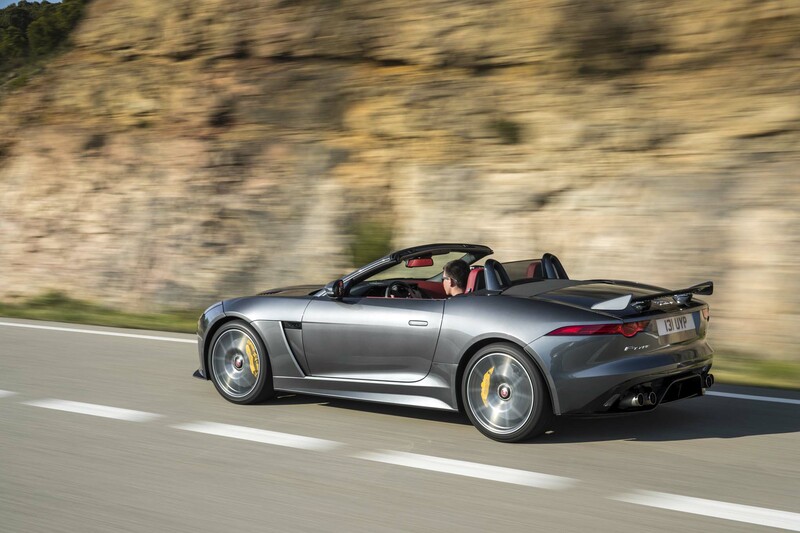 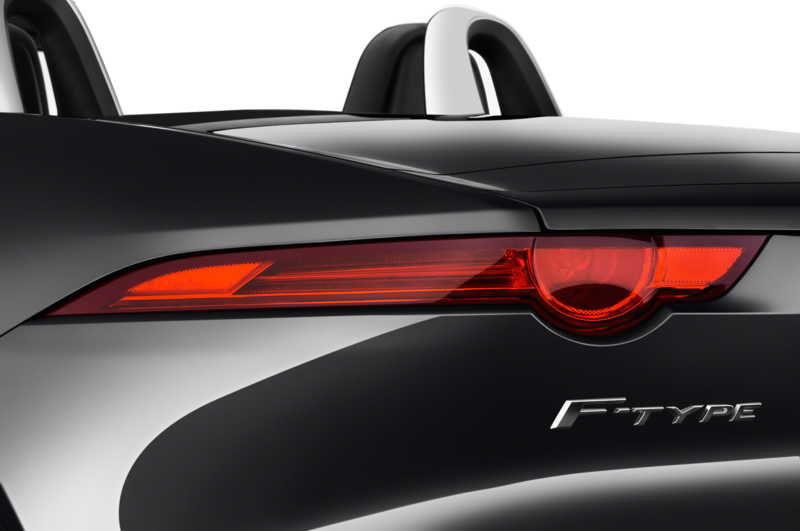 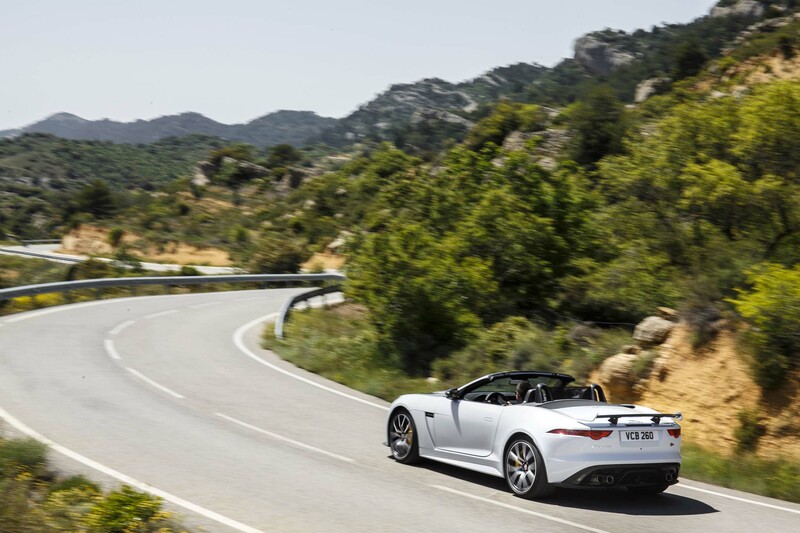 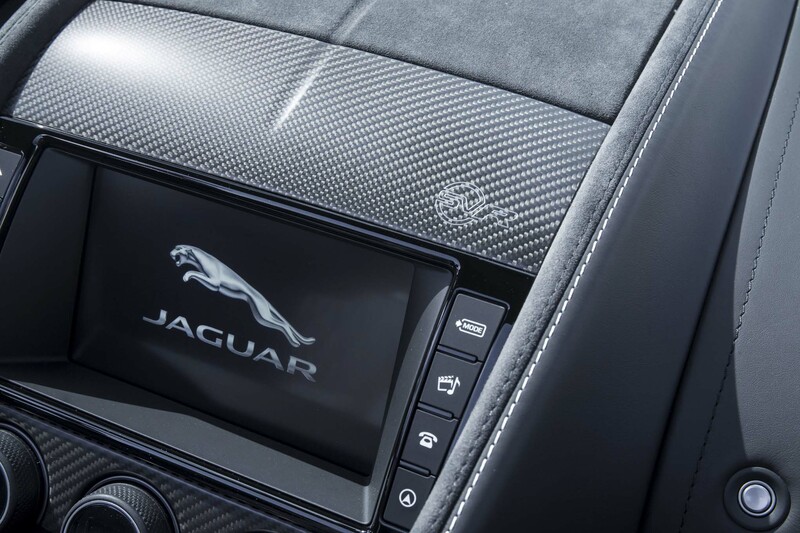 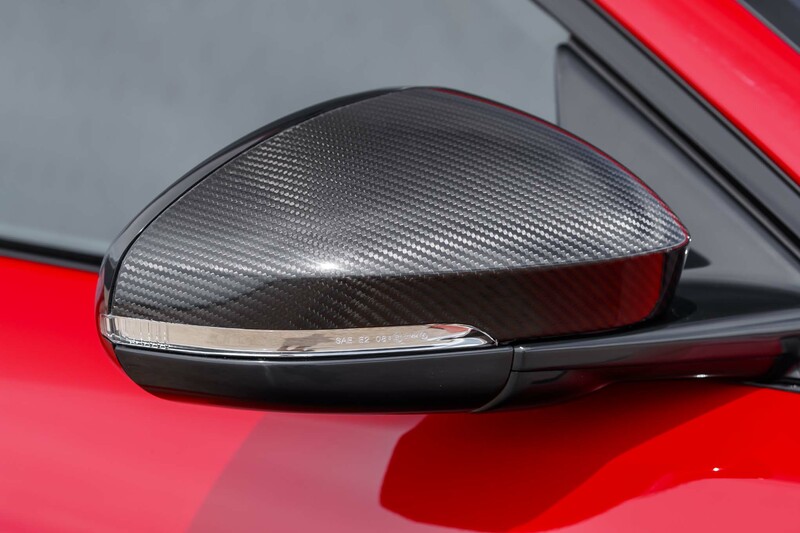 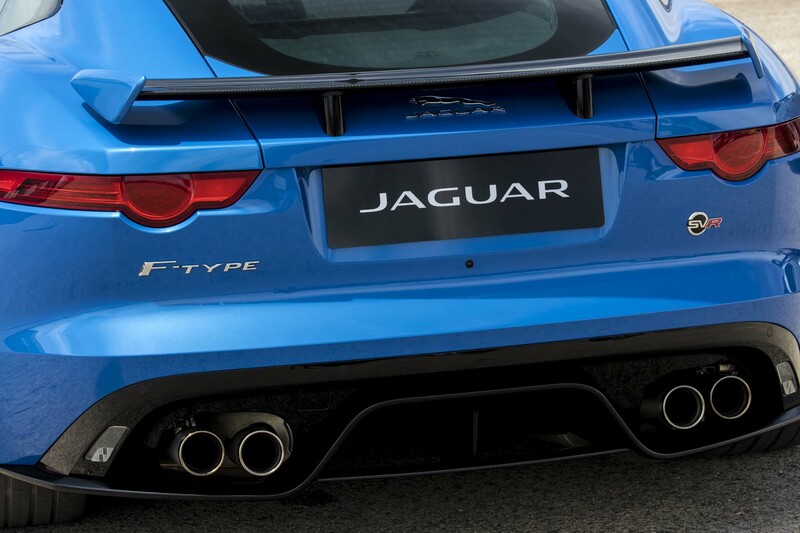 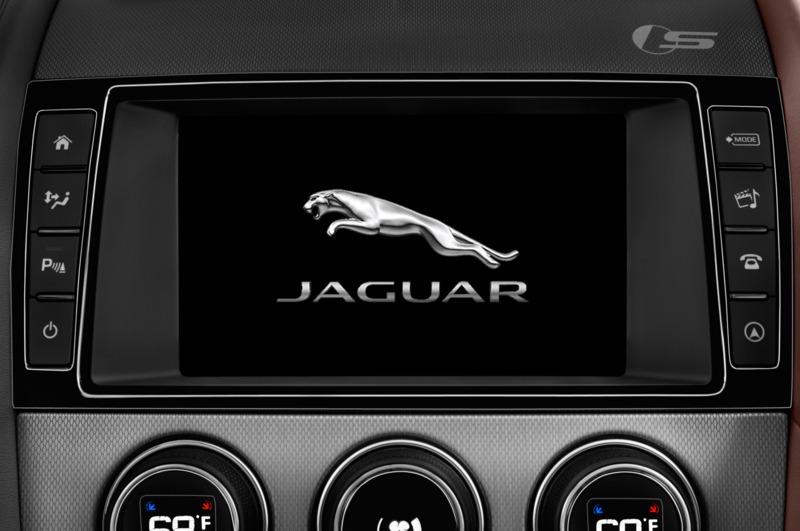 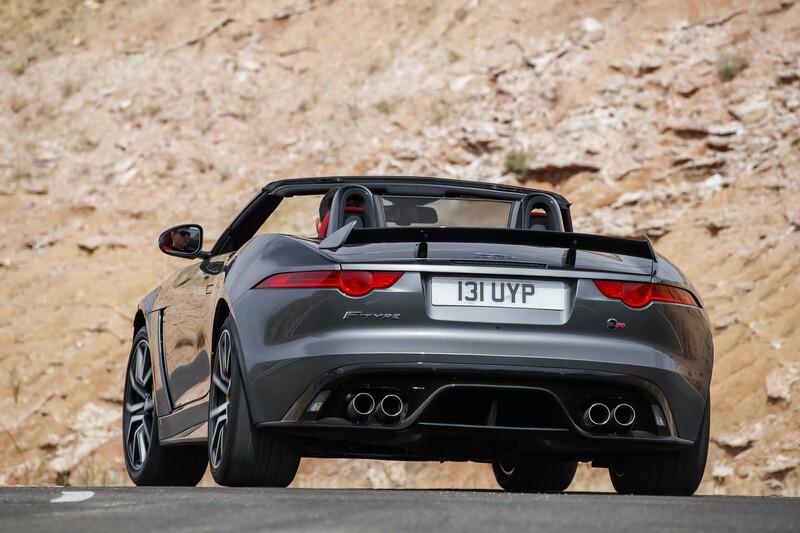 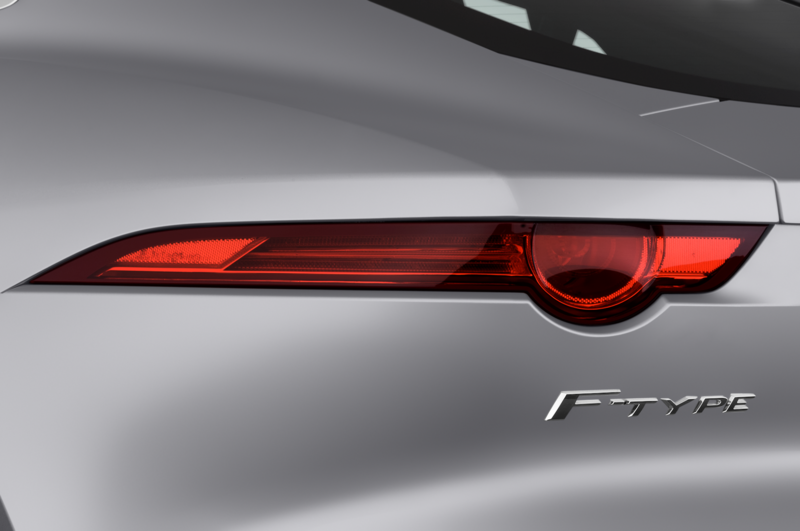 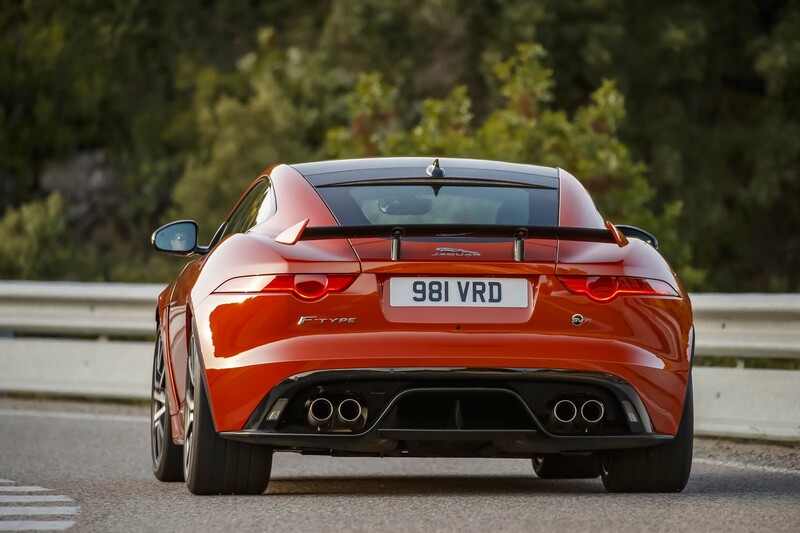 Jaguar owners aspiring to this car will not be disappointed. 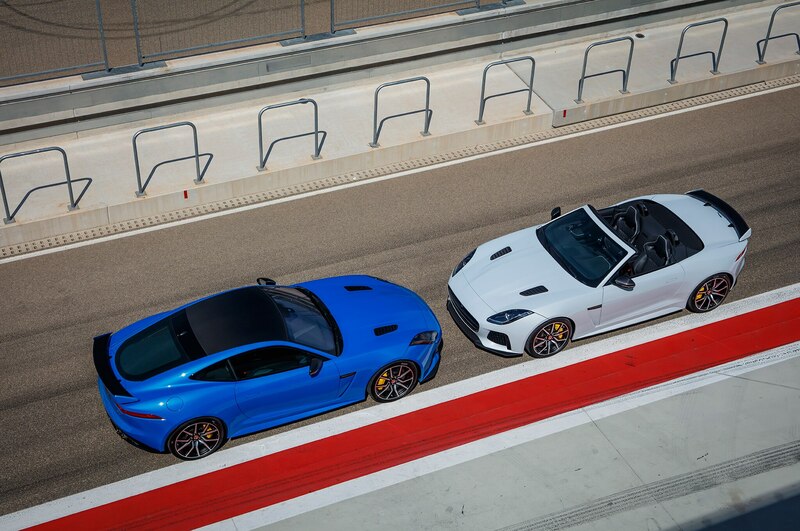 And the SVR’s performance and starting price of $126,945 for the coupe and $129,795 for the convertible may well attract more than a few new performance-car buyers to the marque—the type of folks looking for an experience that is a bit different than a chauffeured ride to a Spanish hotel retreat.